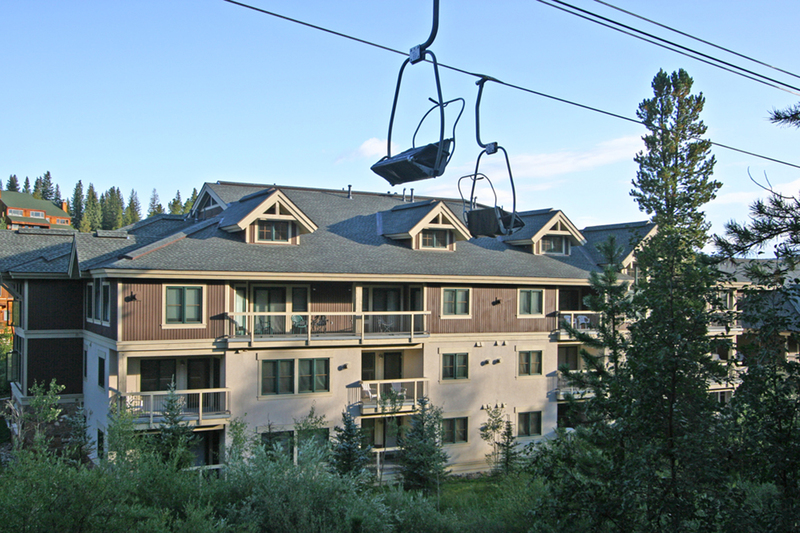 The Quicksilver chairlift and Ski School at Peak 9 are right out your door! 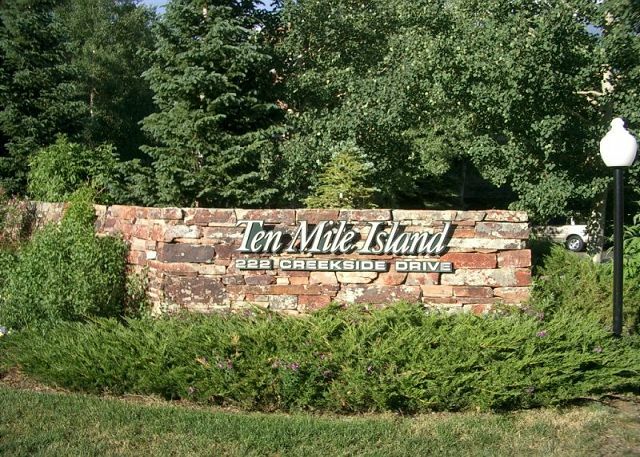 It’s also an easy walk to town, only about 2 blocks. 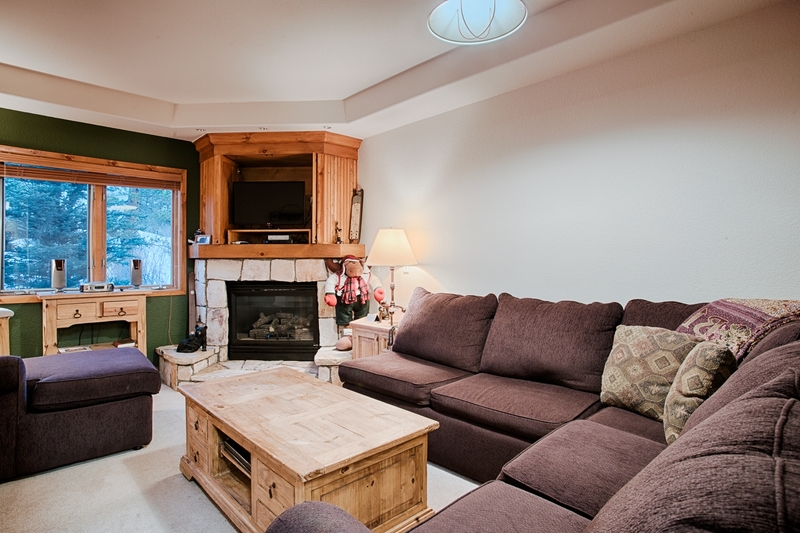 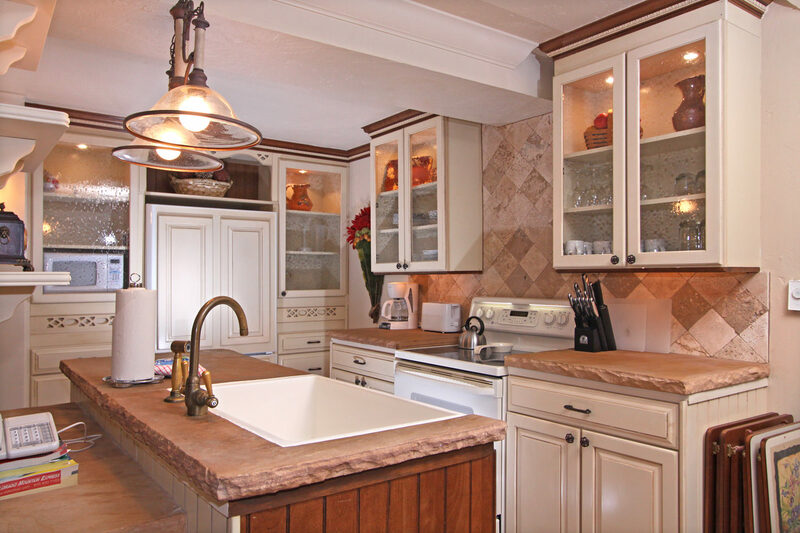 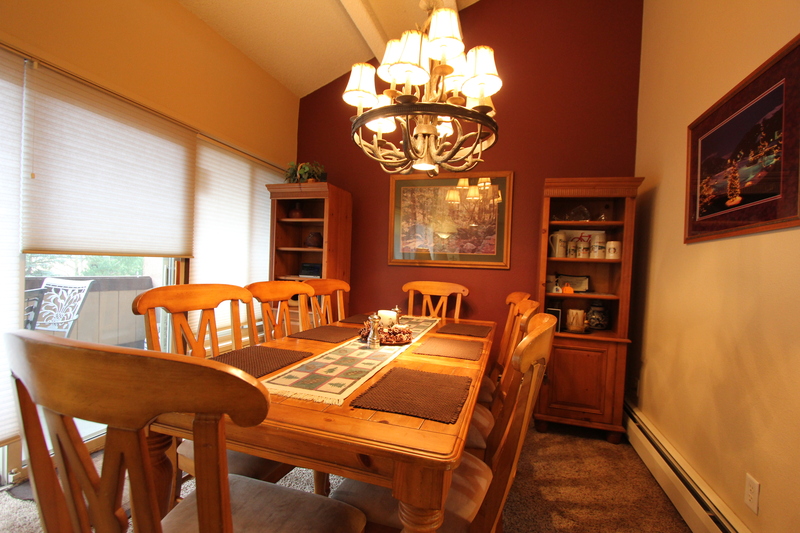 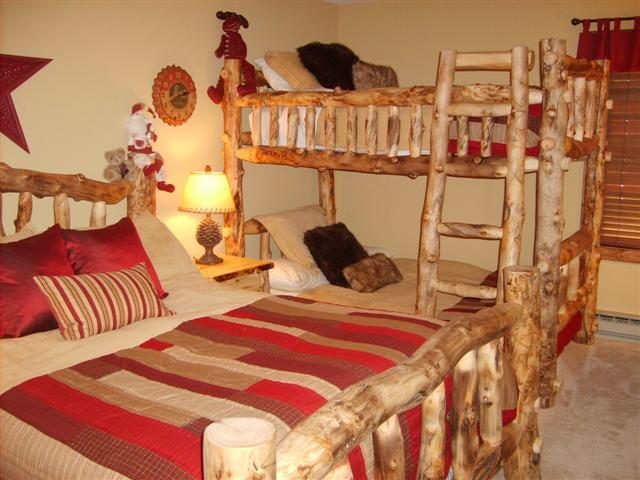 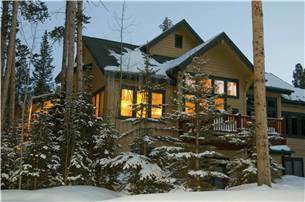 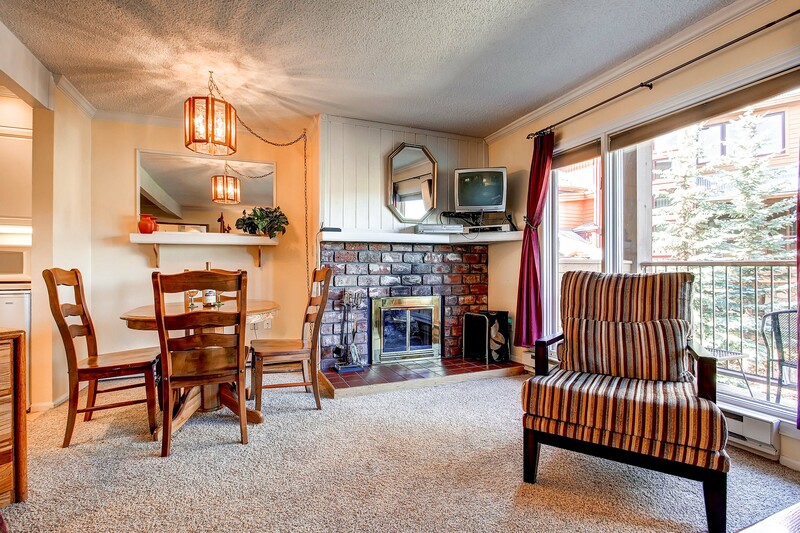 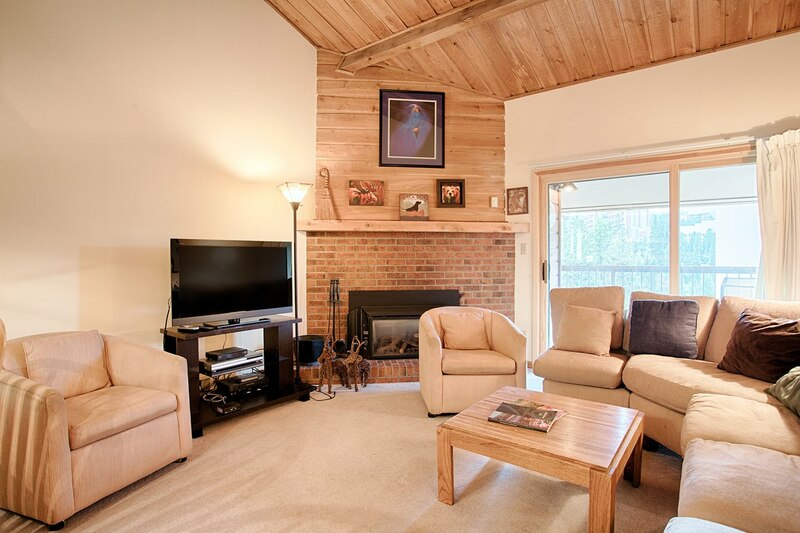 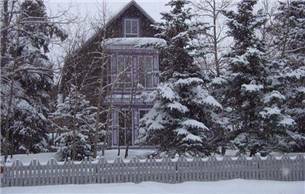 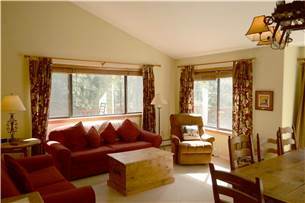 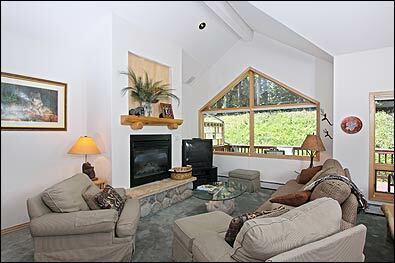 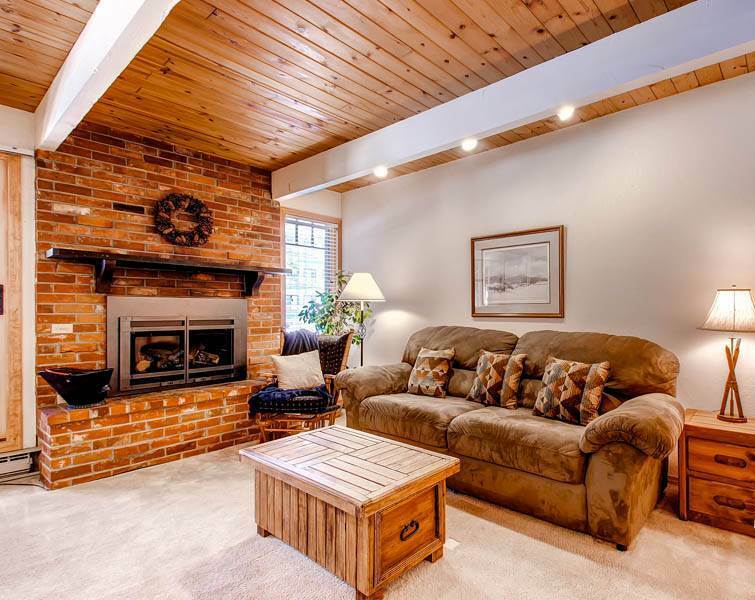 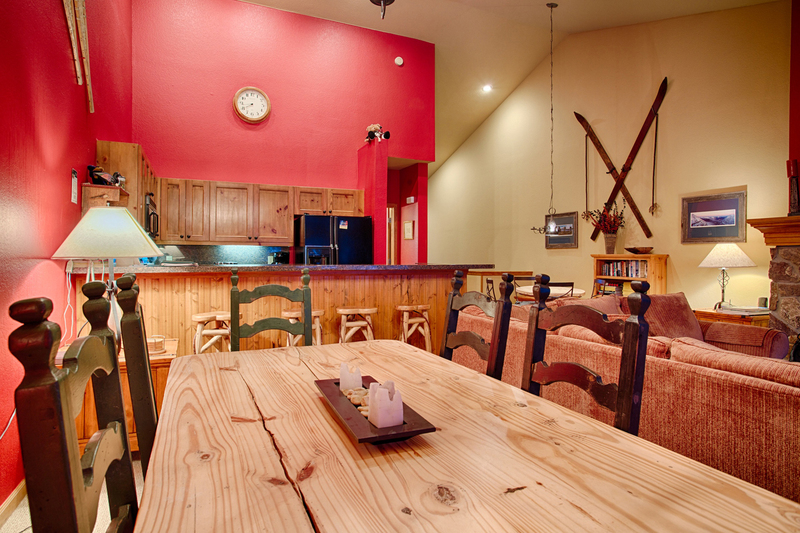 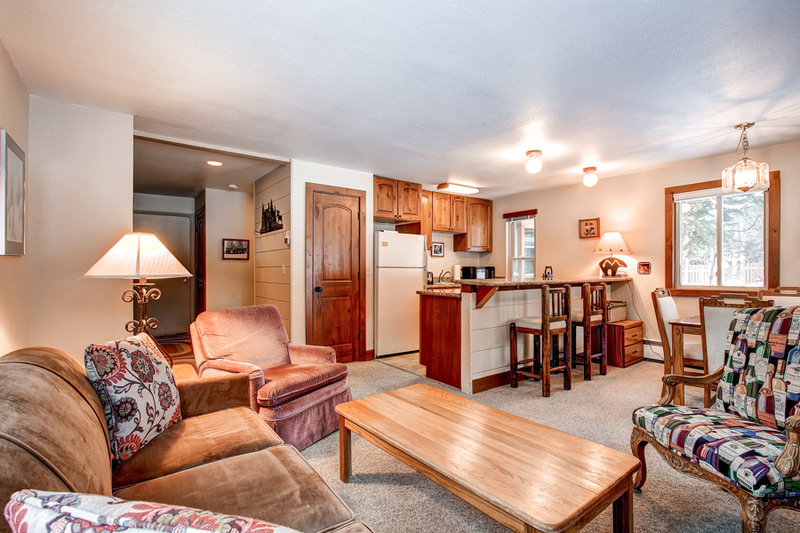 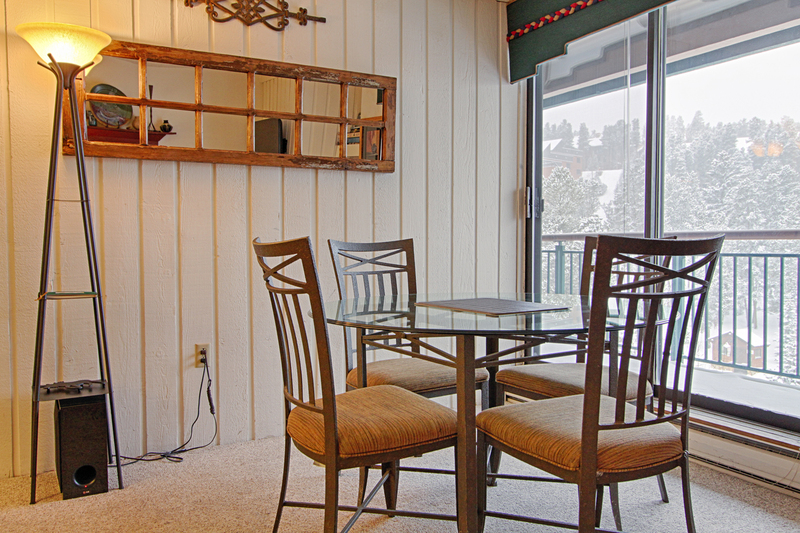 Great location for families with children who may need frequent hot-cocoa breaks. 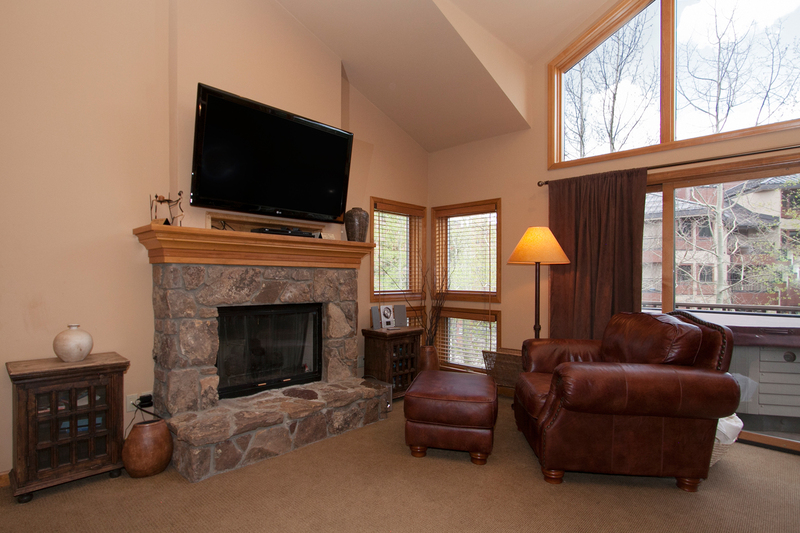 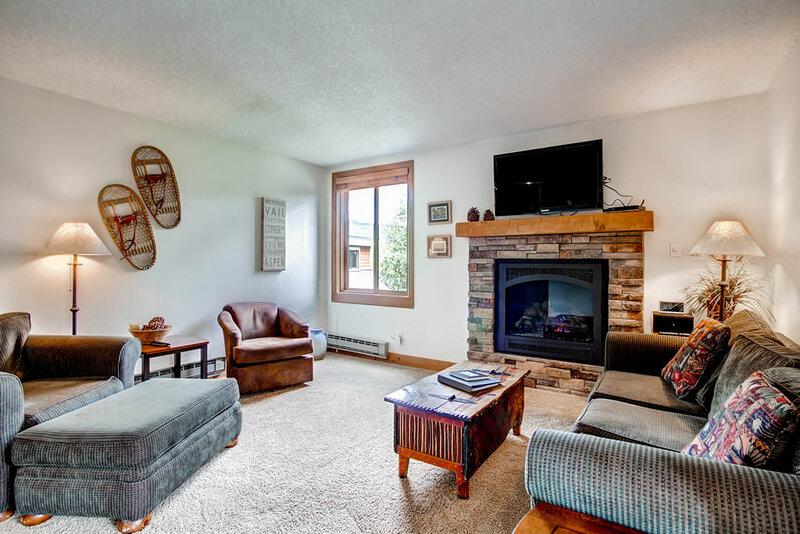 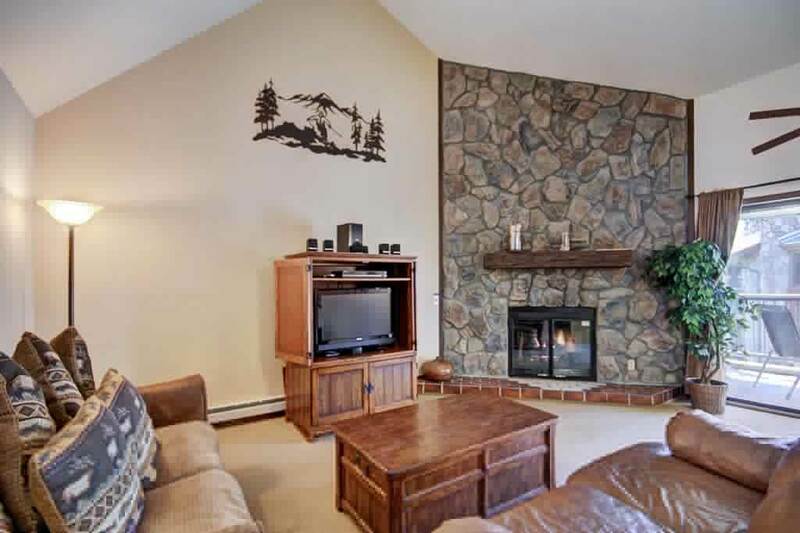 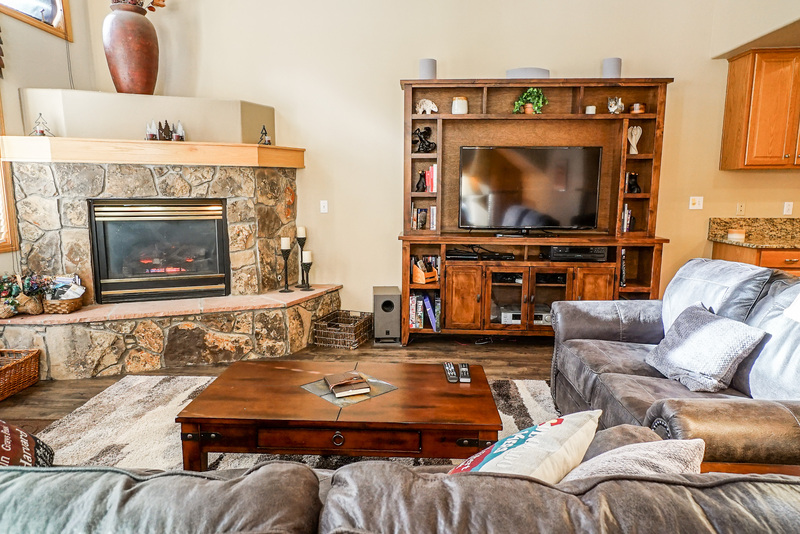 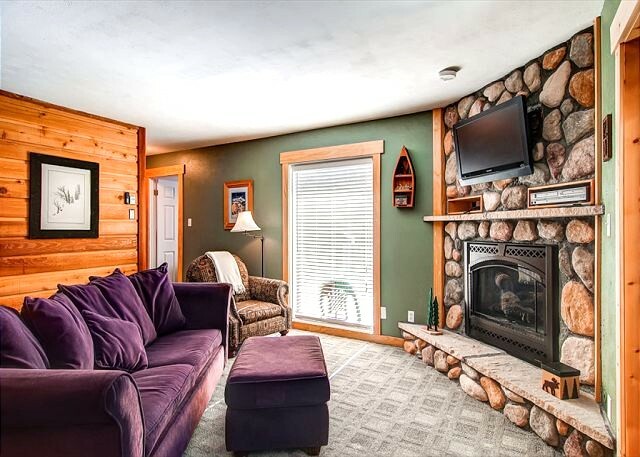 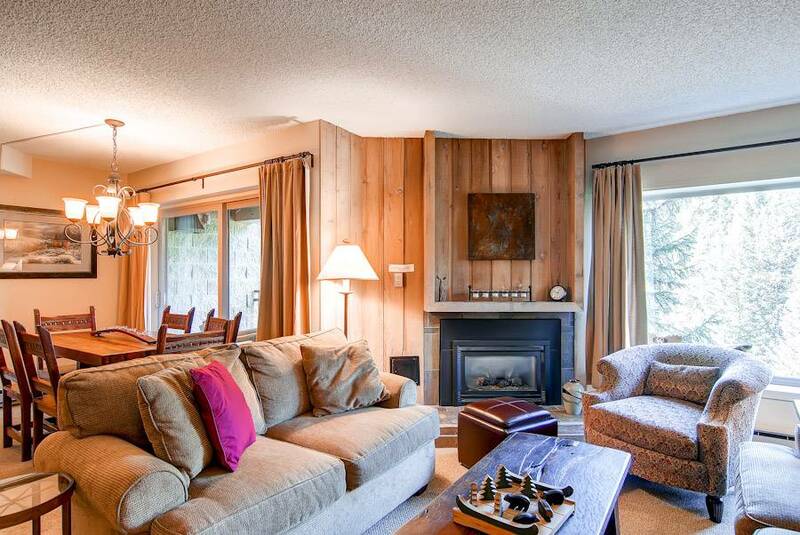 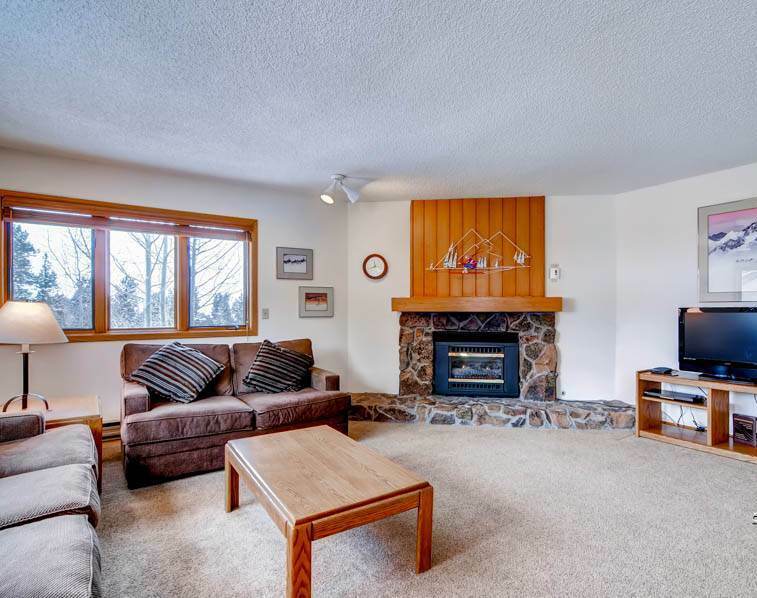 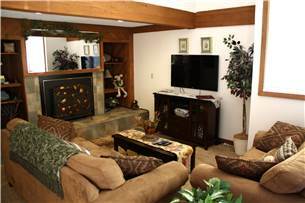 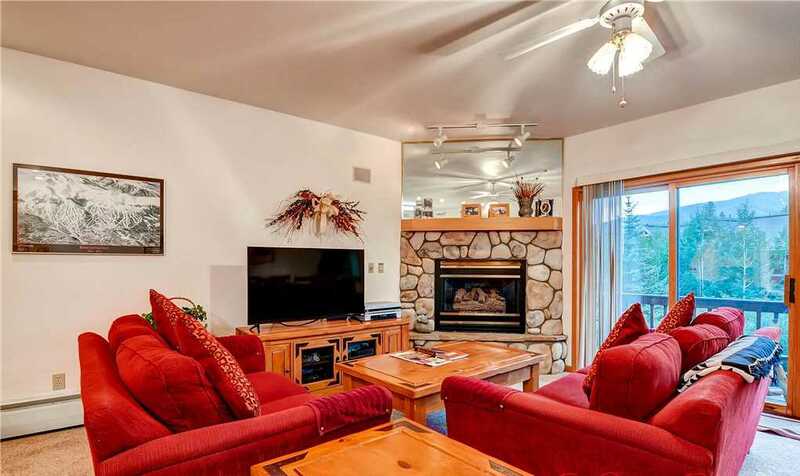 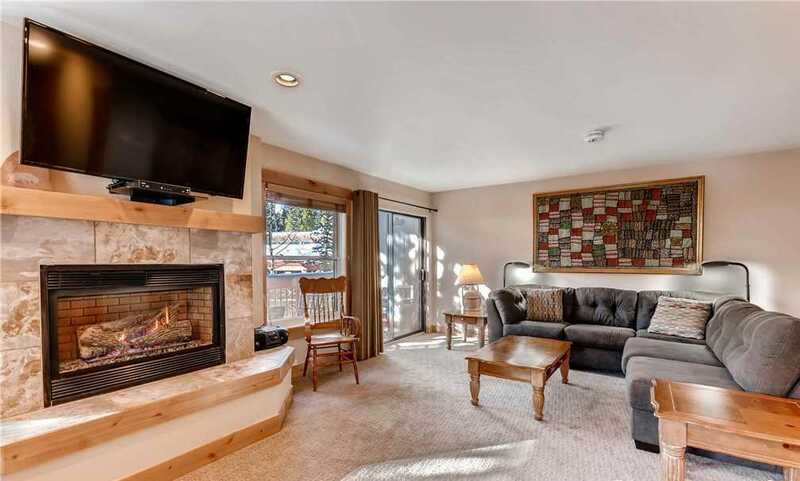 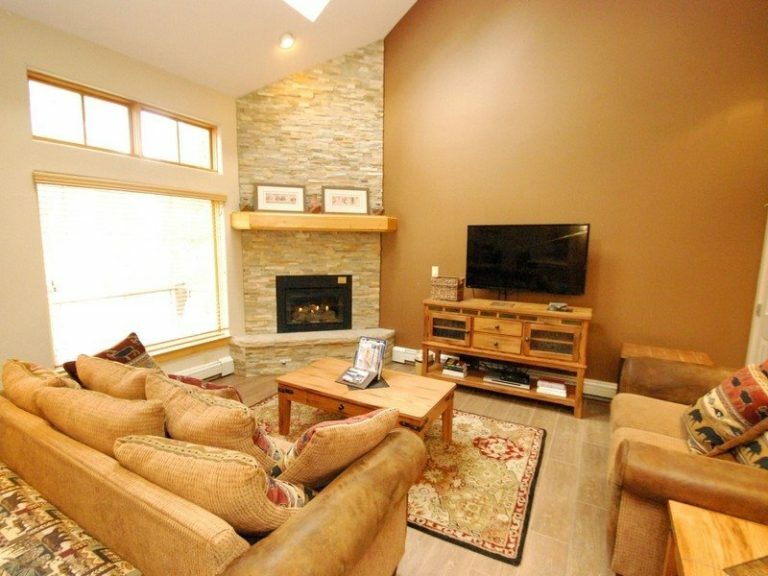 The property features a gas fireplace, vaulted ceilings, granite counters, stainless appliances, modern TV, WiFi, private balcony, private washer/dryer, Jacuzzi tub, private garage and access to the Upper Village clubhouse across the street with an indoor/outdoor heated pool and hot tubs. 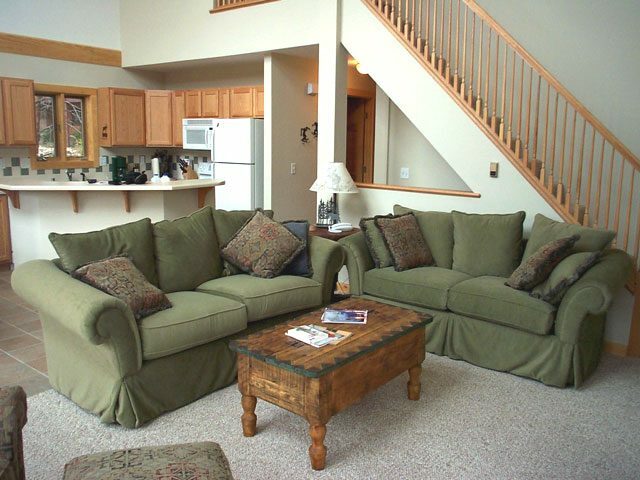 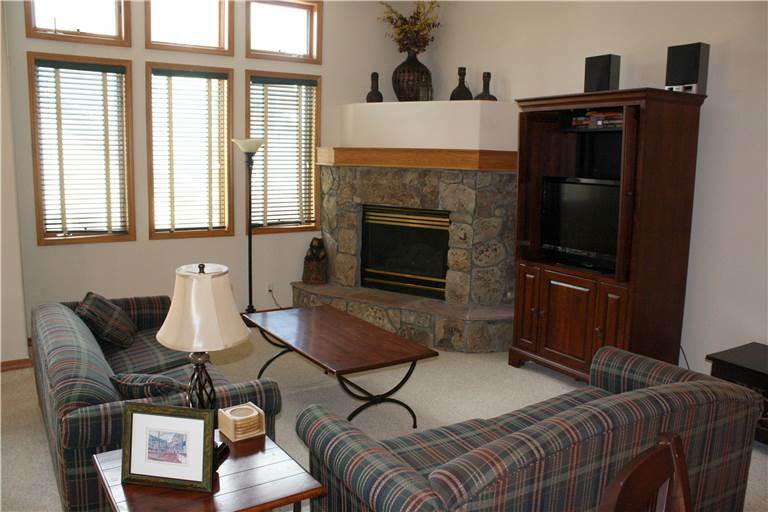 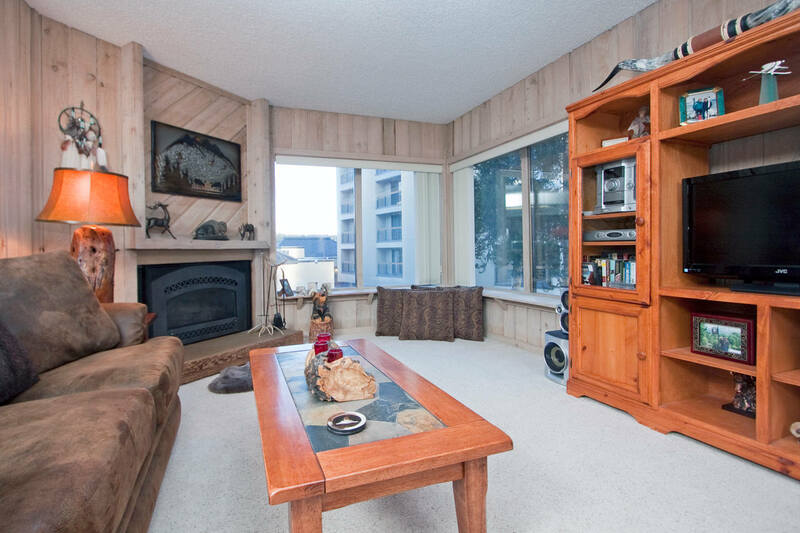 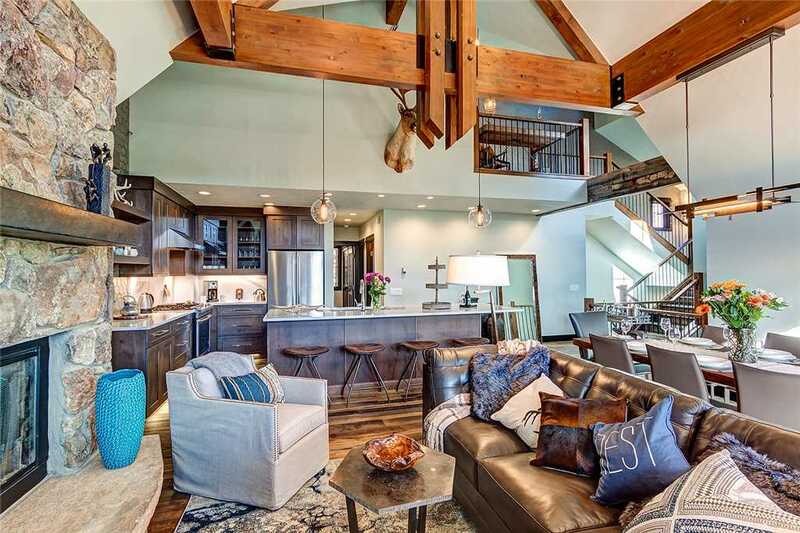 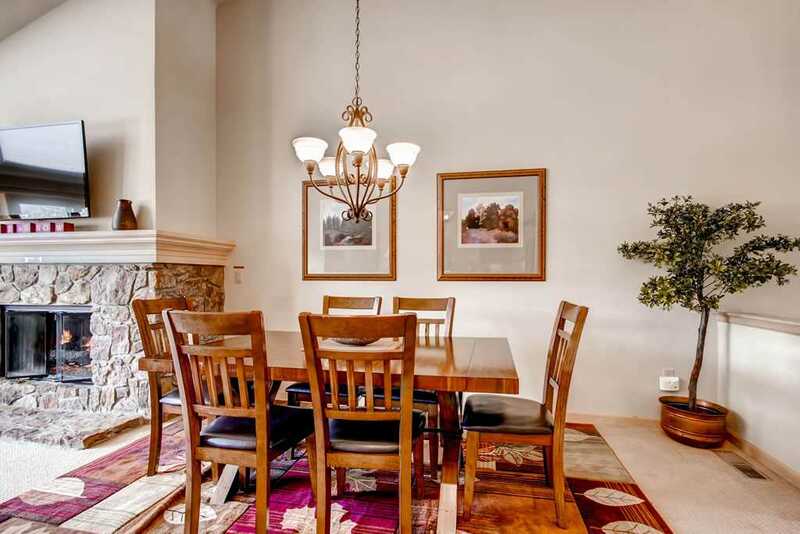 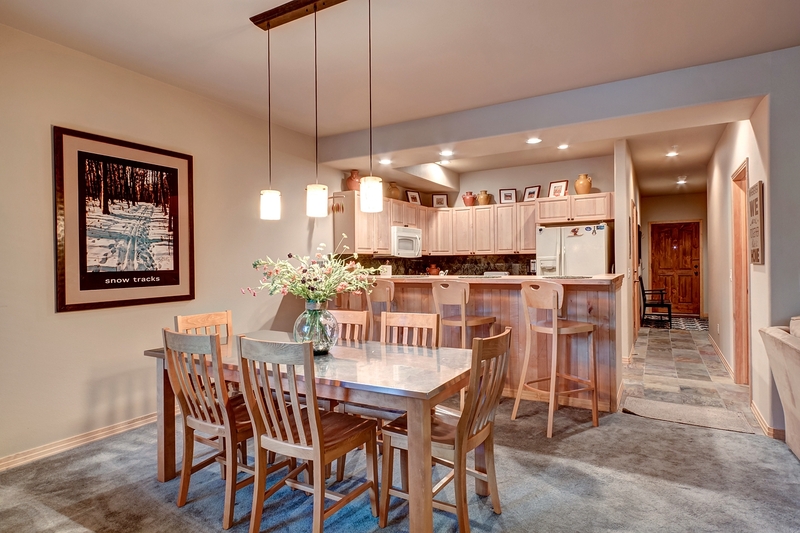 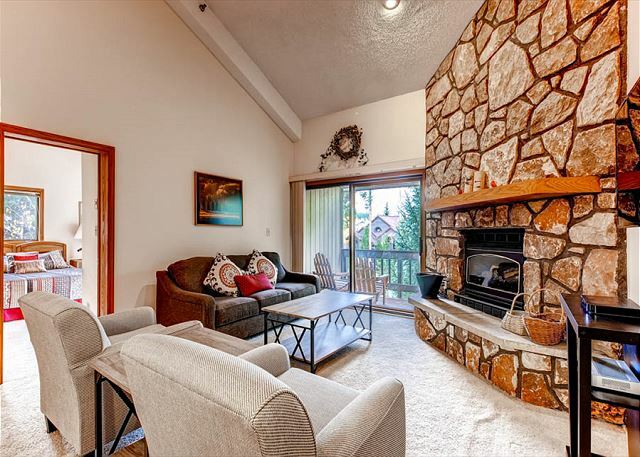 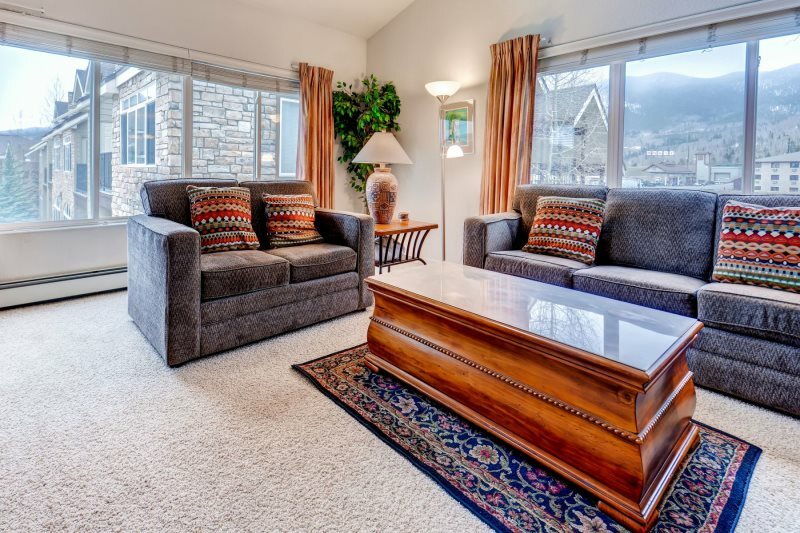 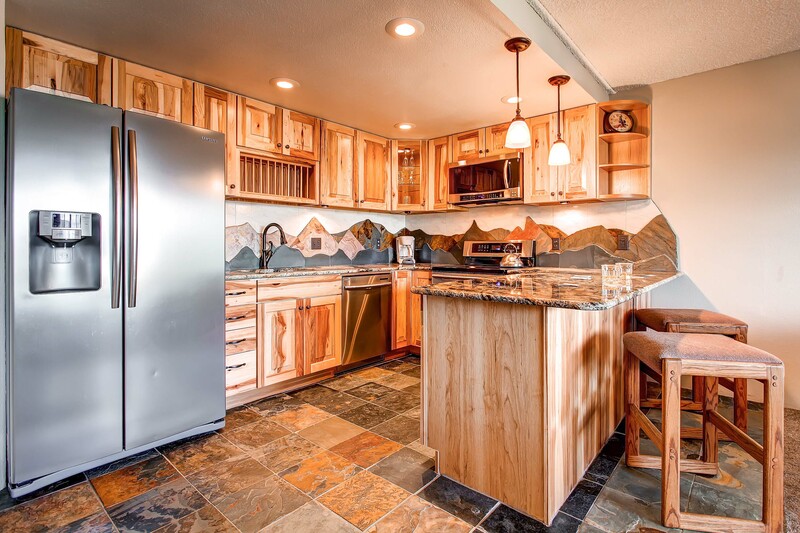 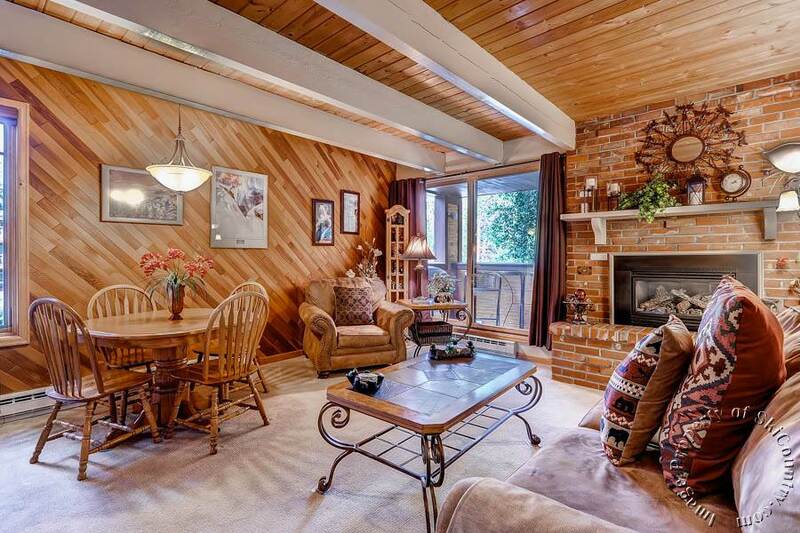 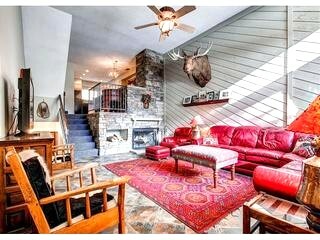 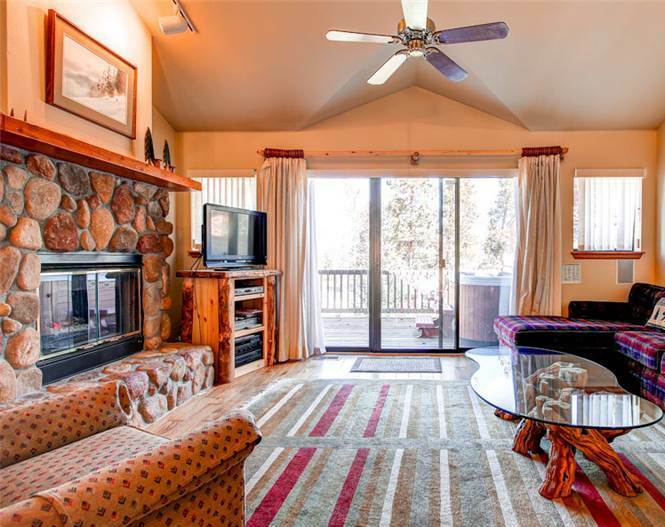 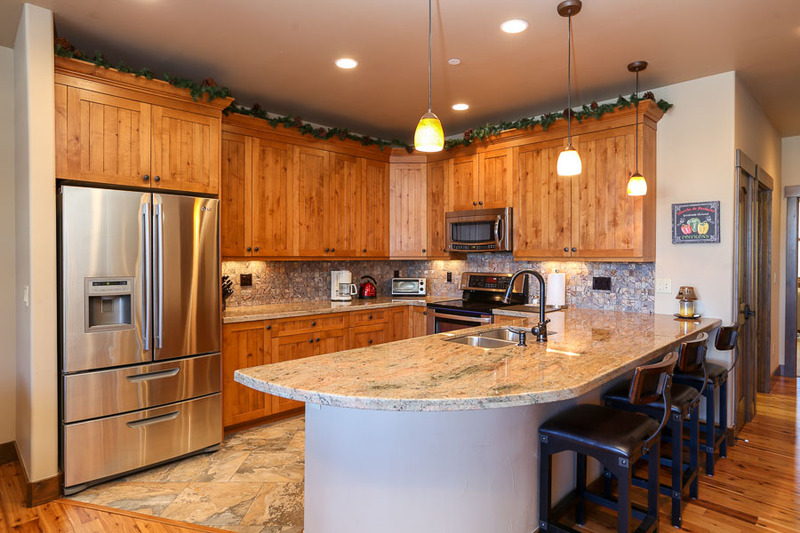 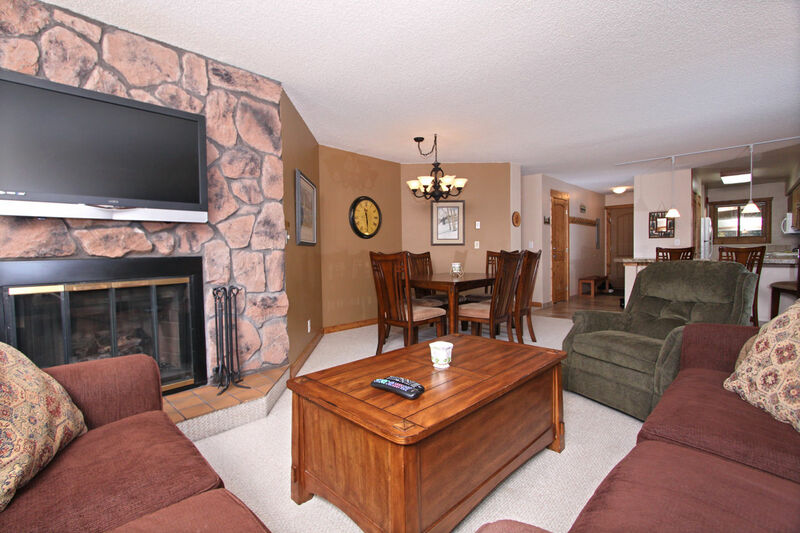 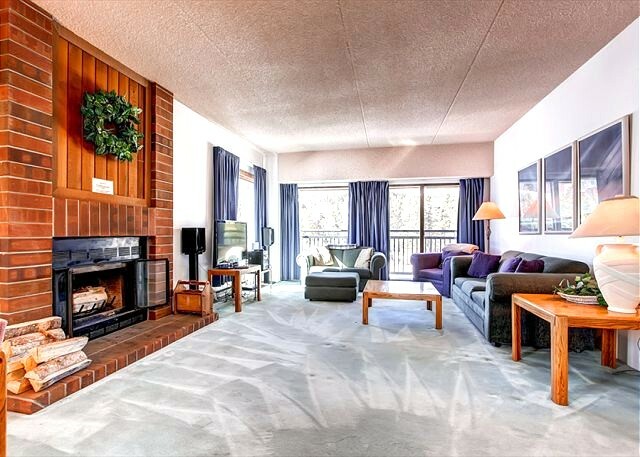 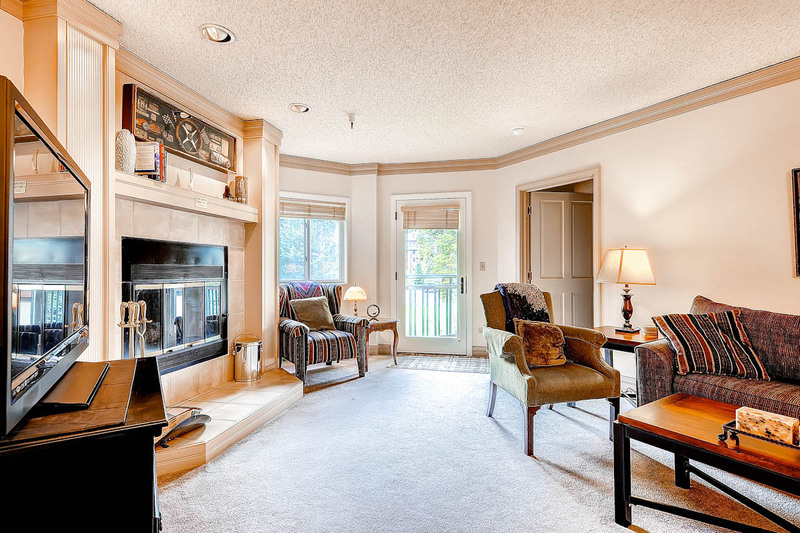 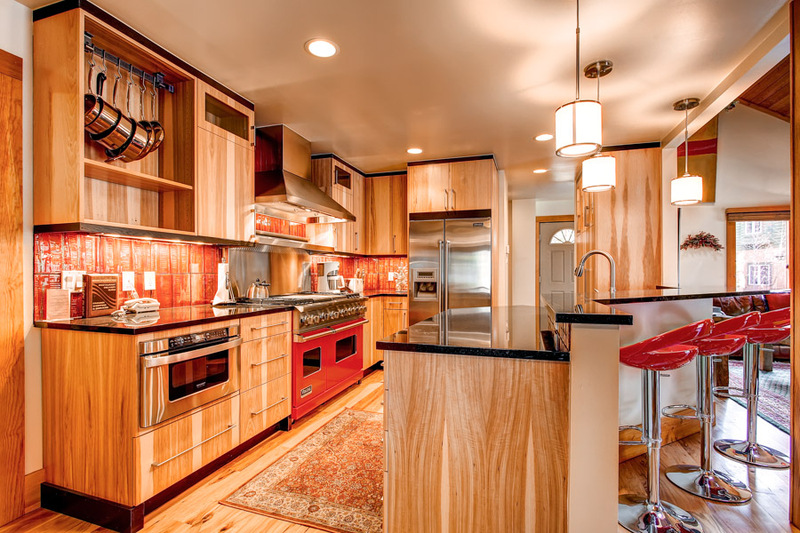 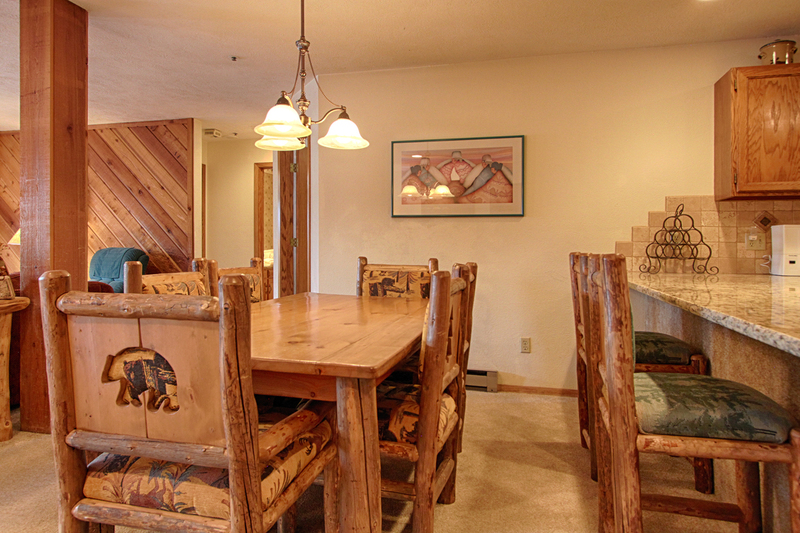 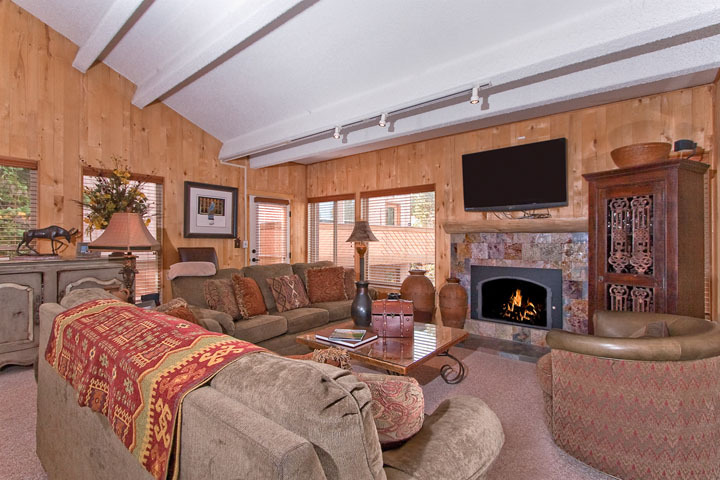 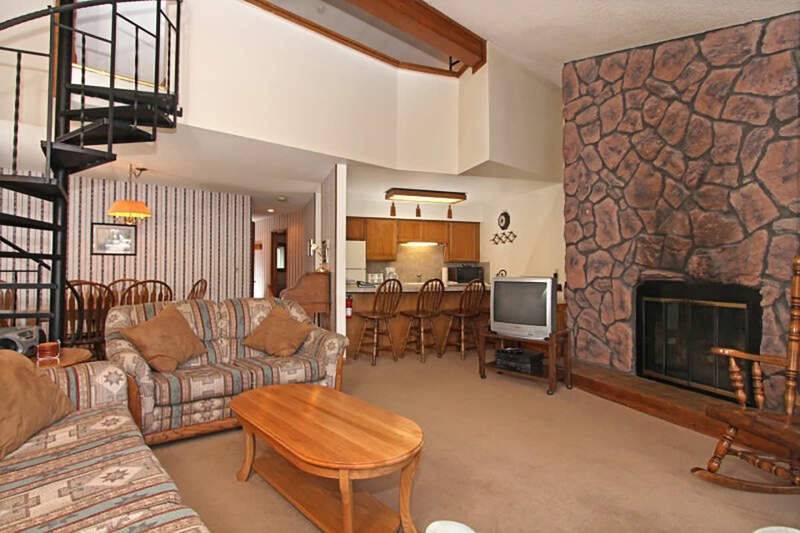 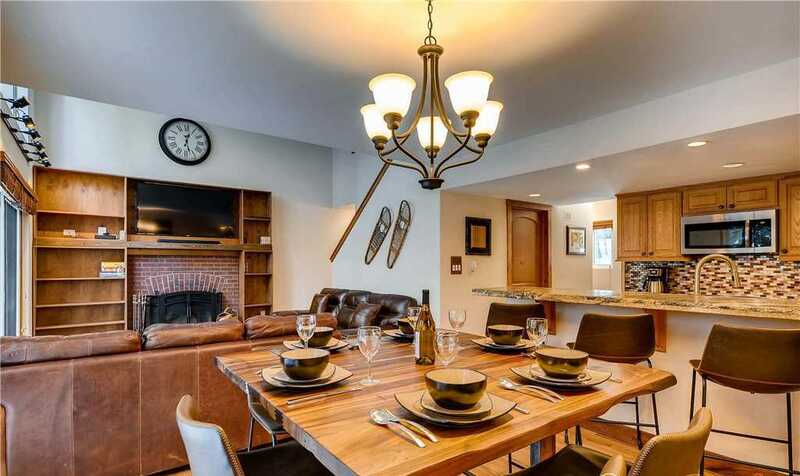 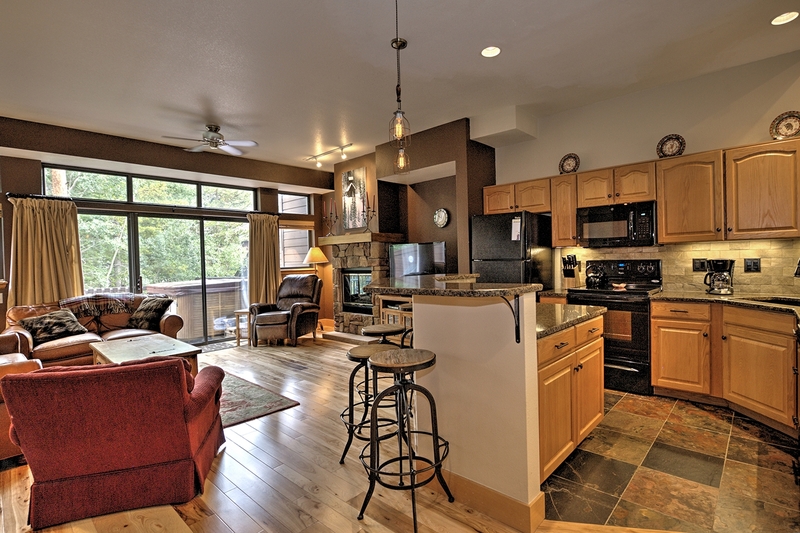 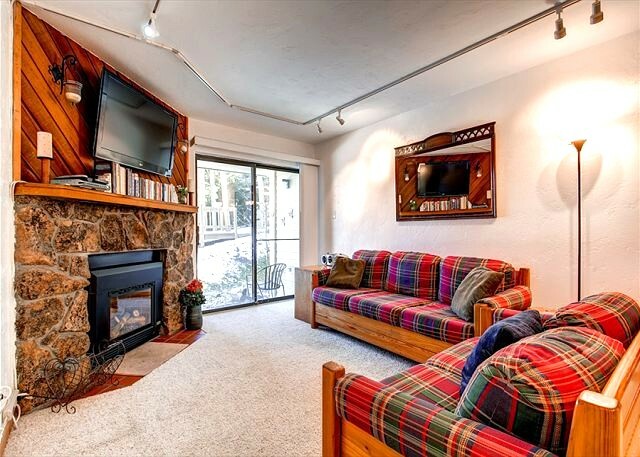 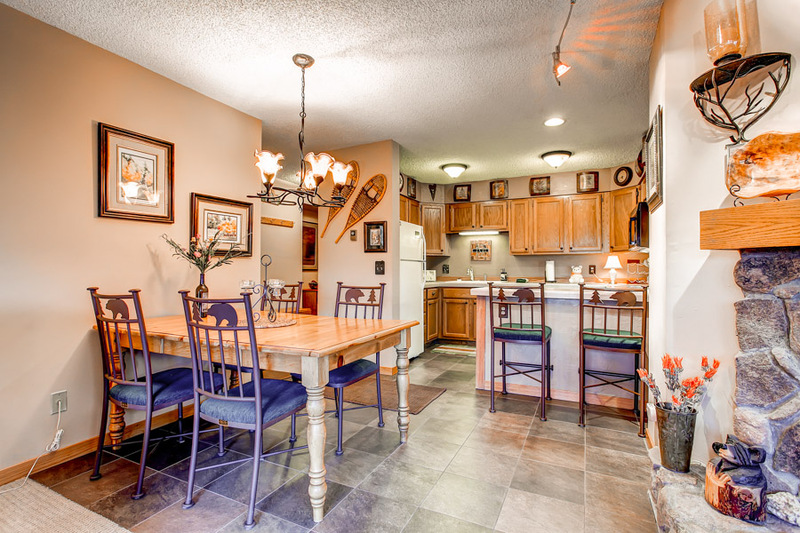 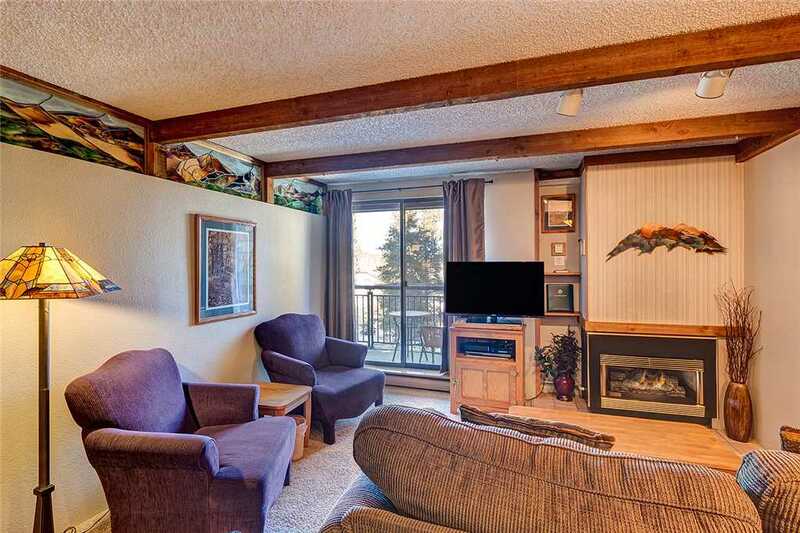 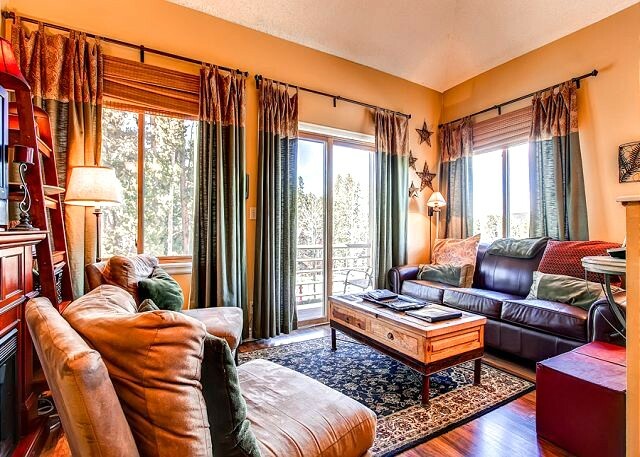 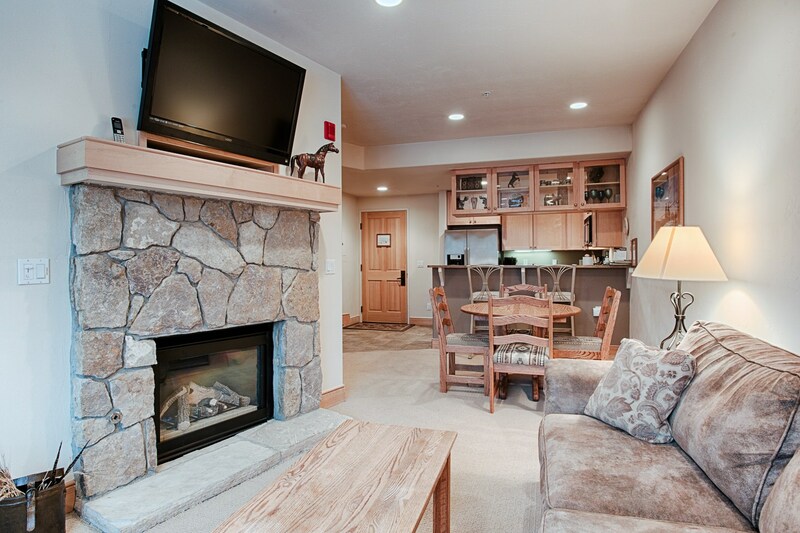 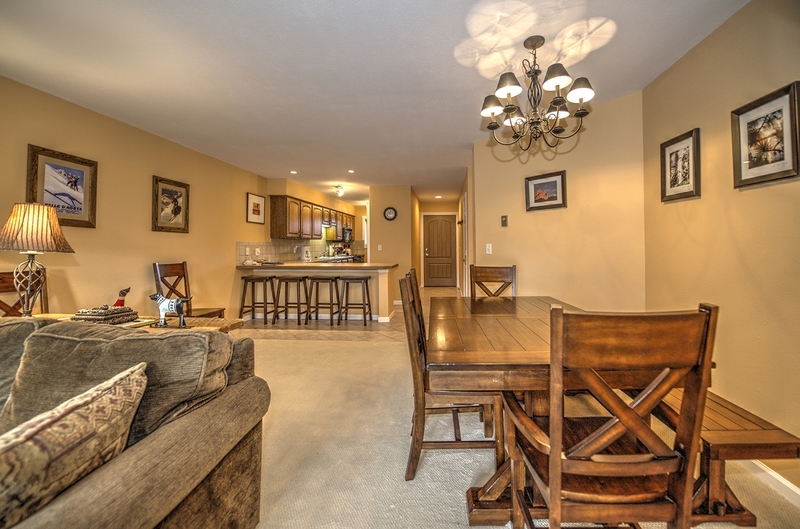 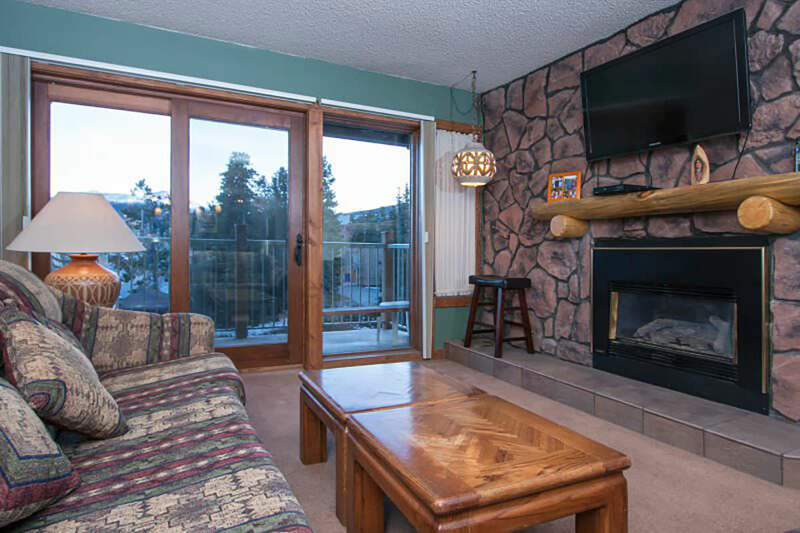 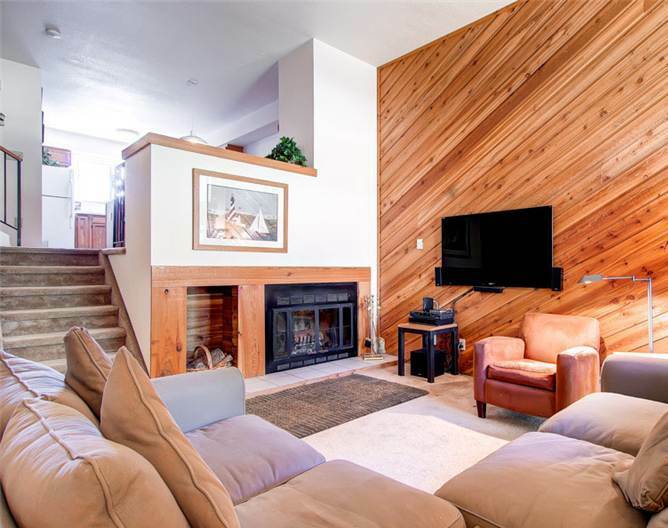 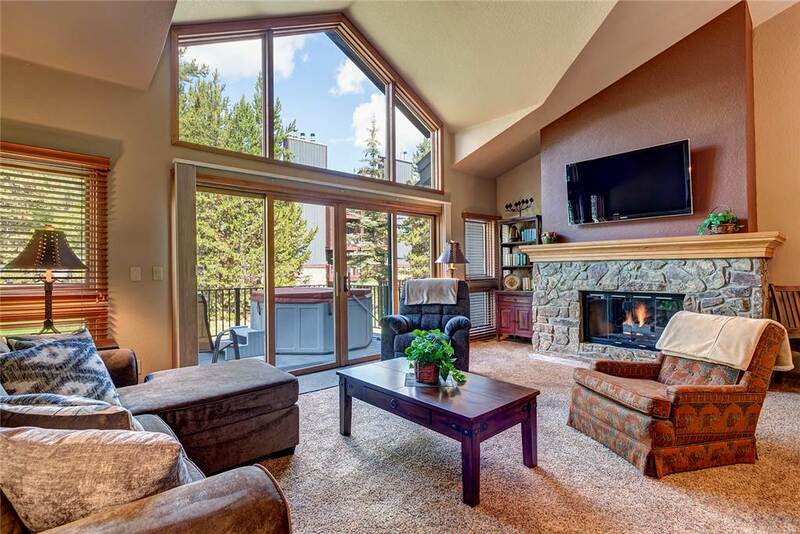 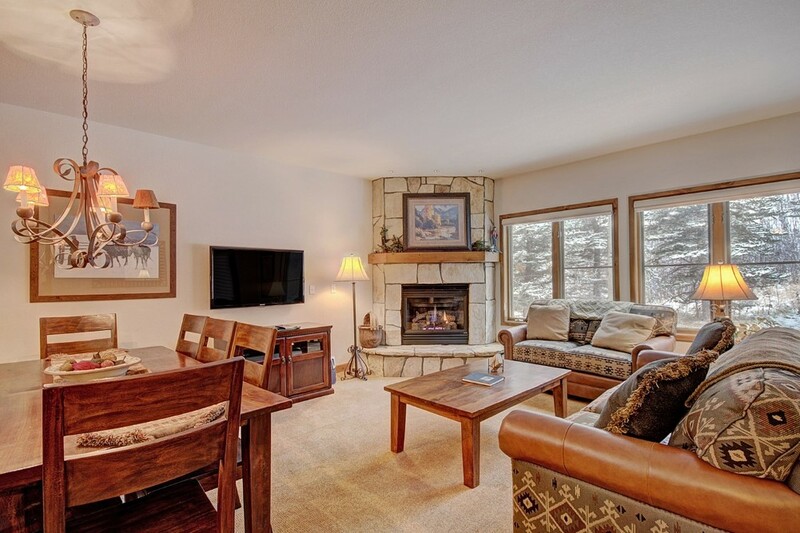 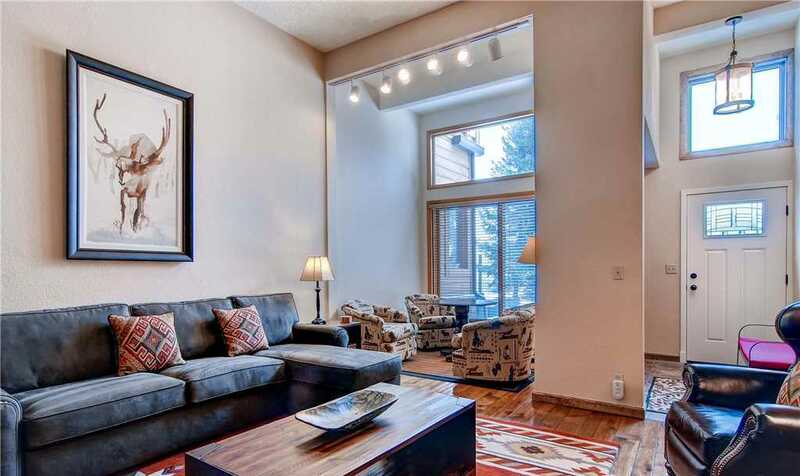 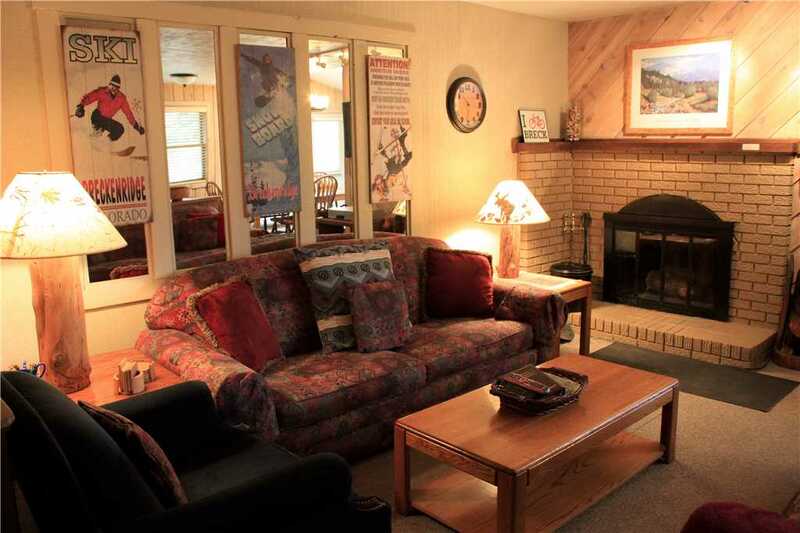 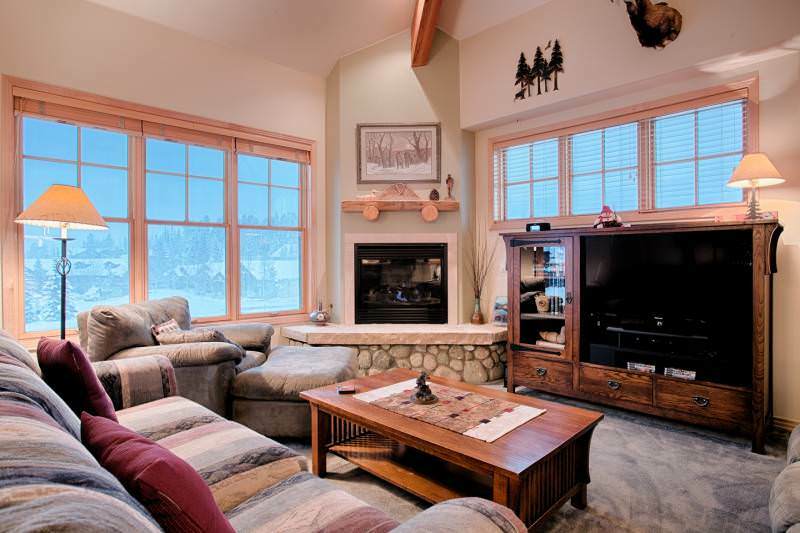 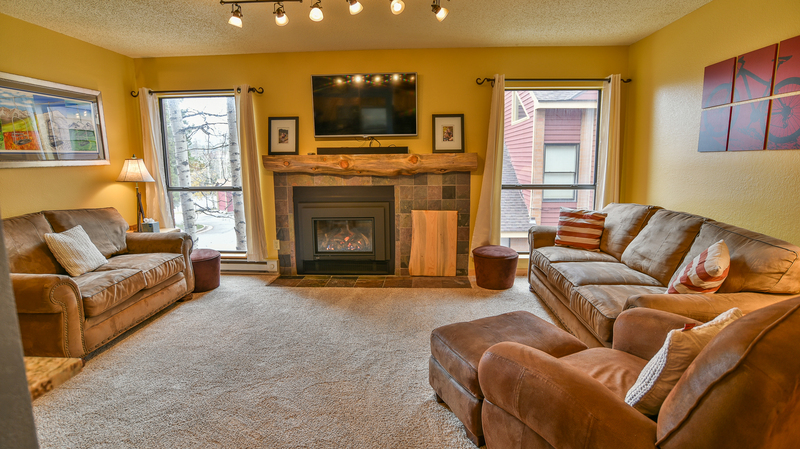 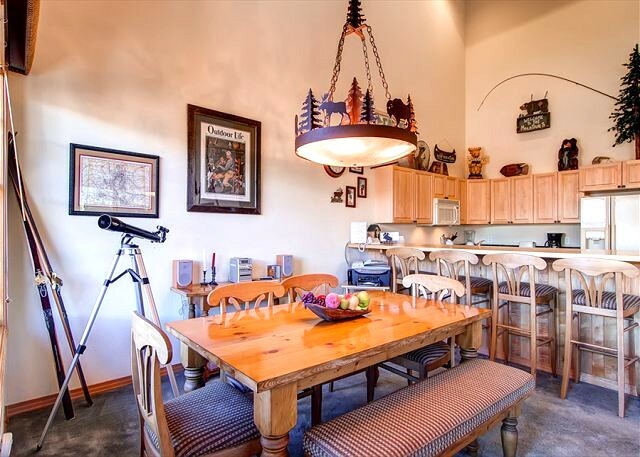 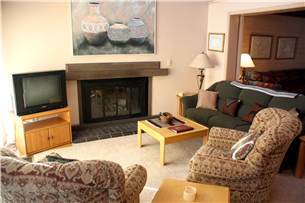 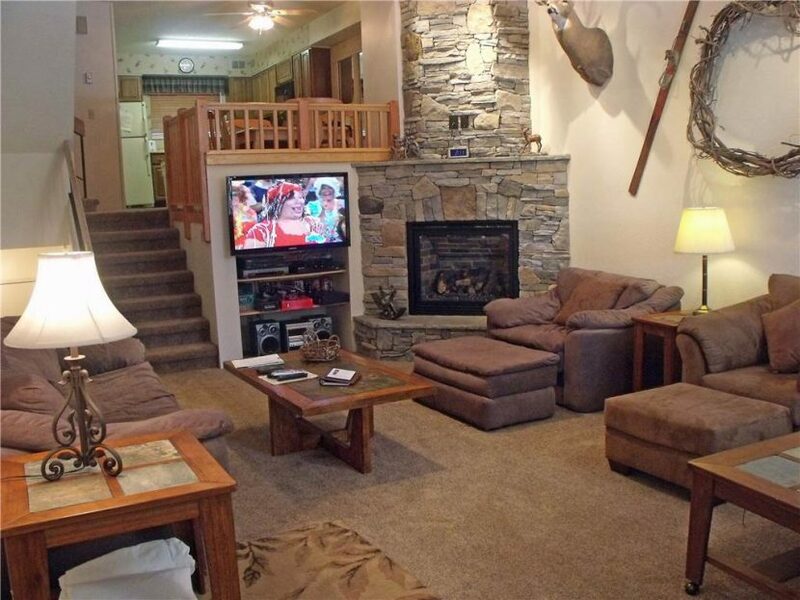 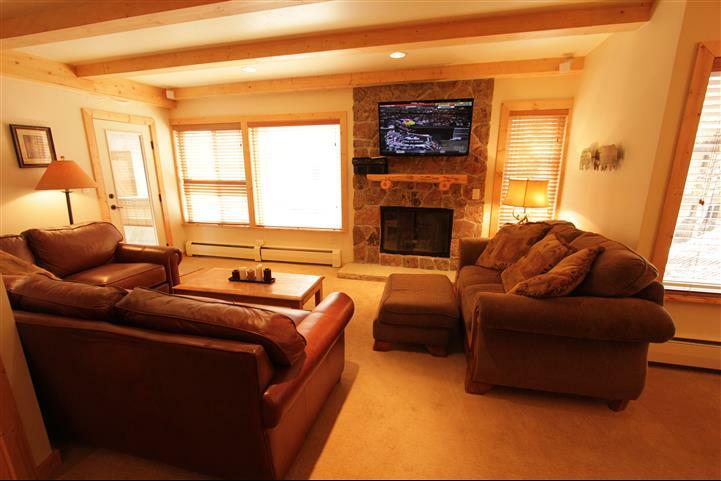 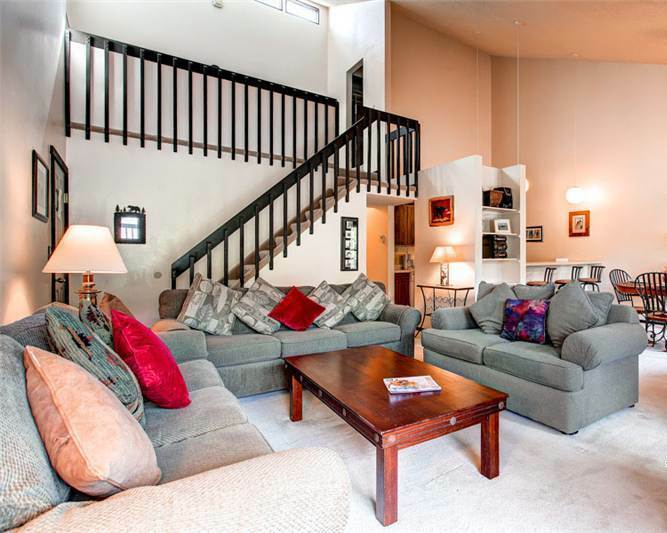 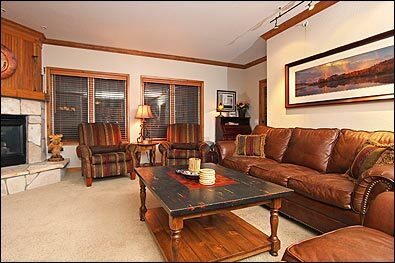 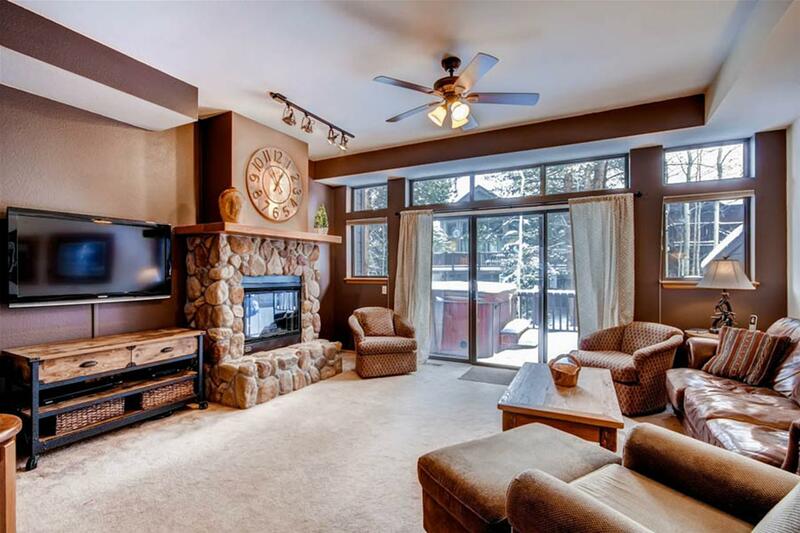 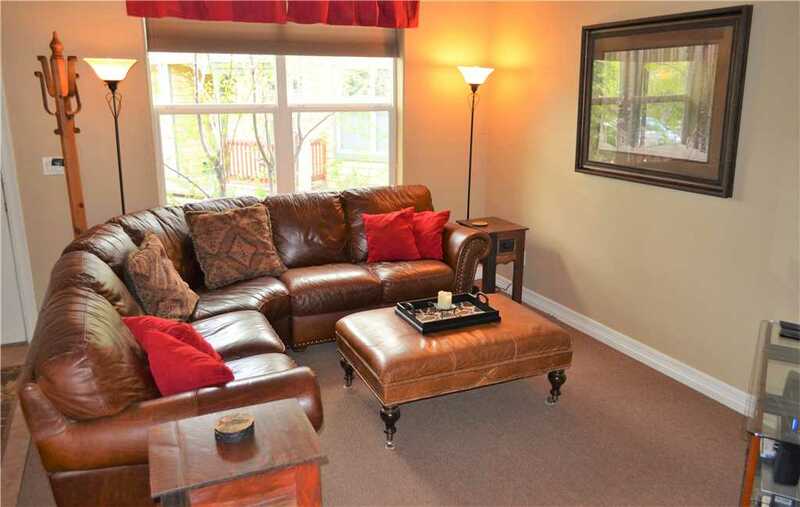 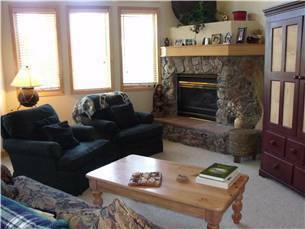 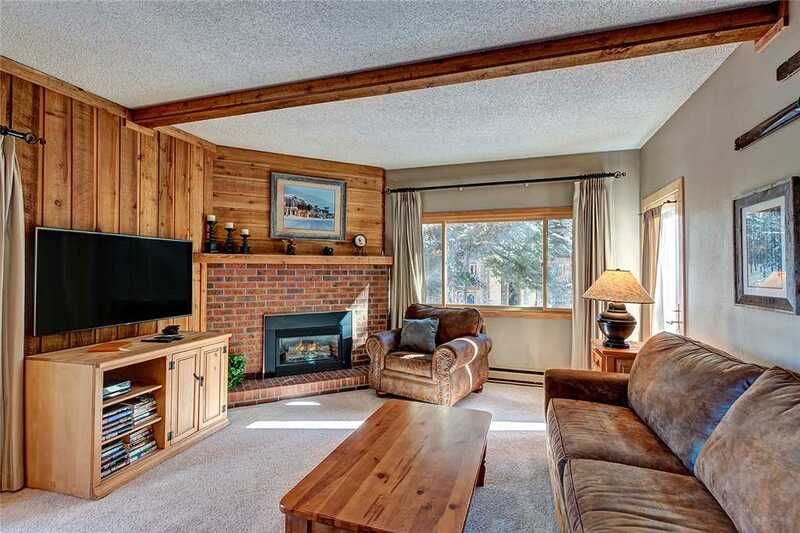 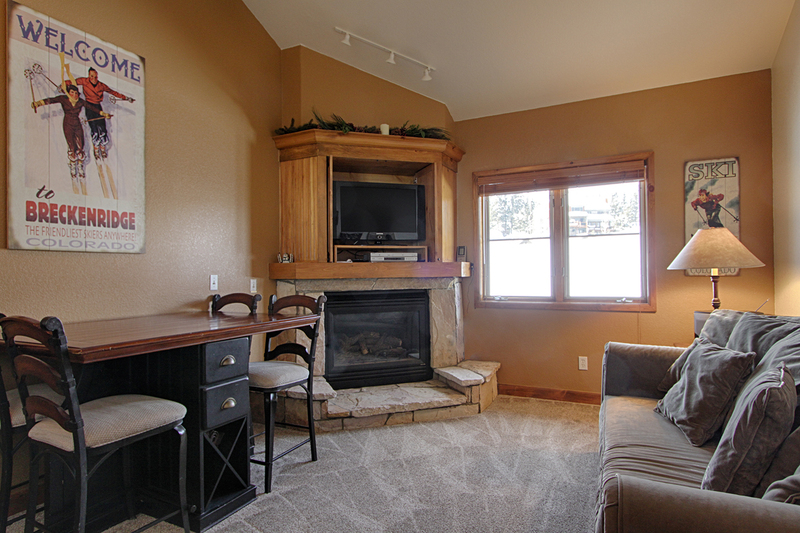 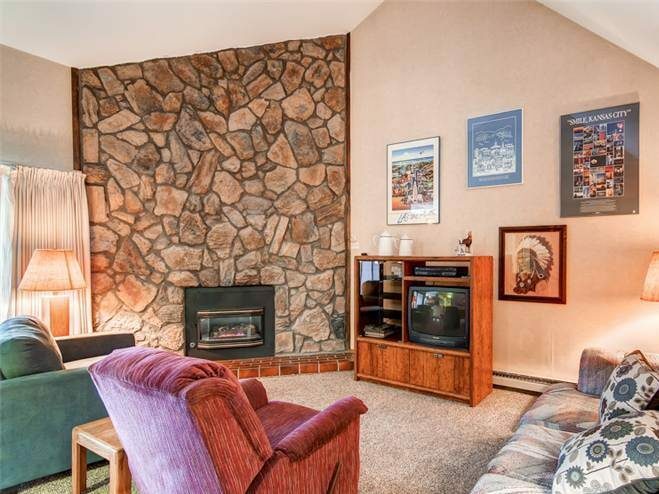 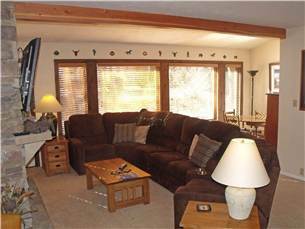 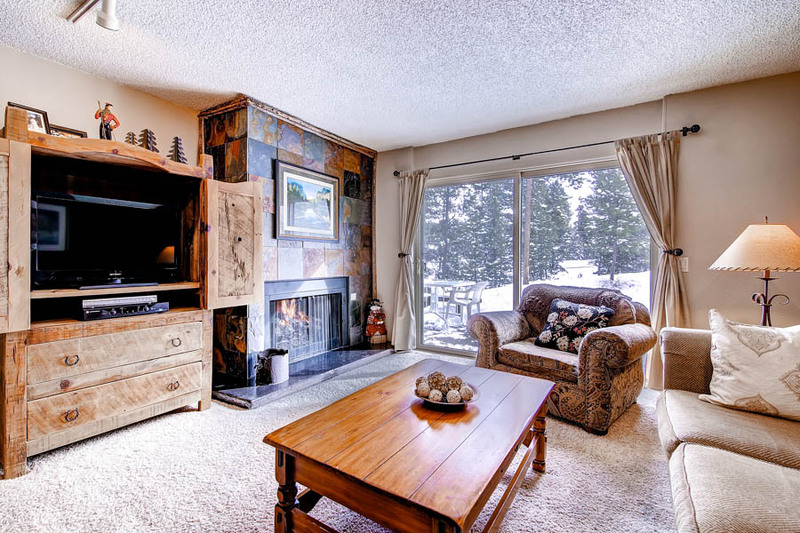 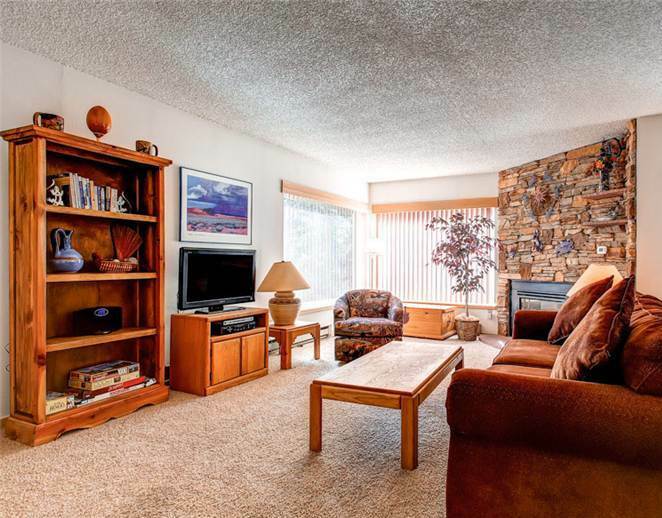 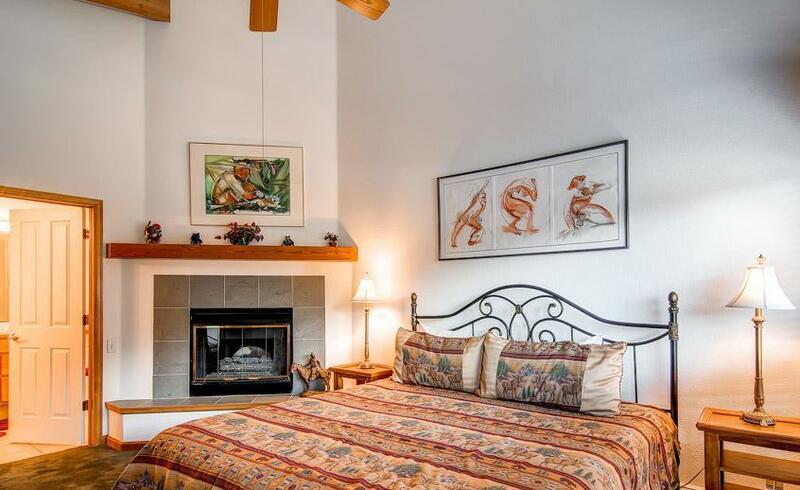 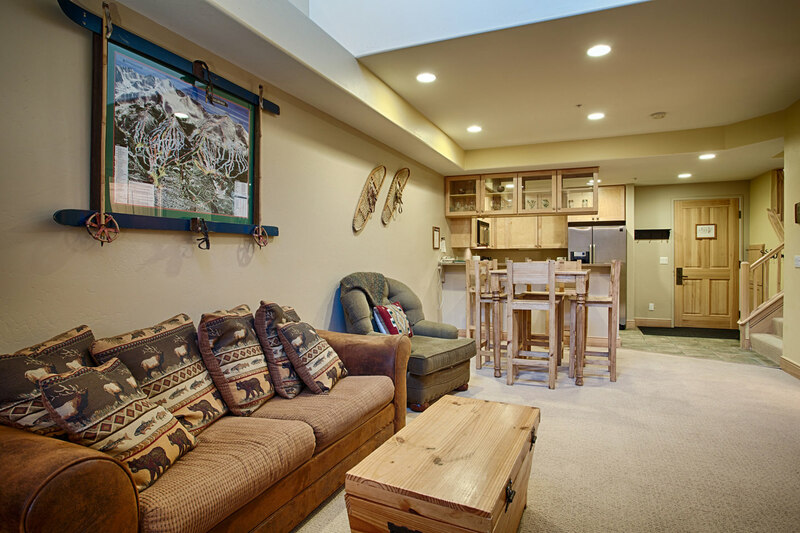 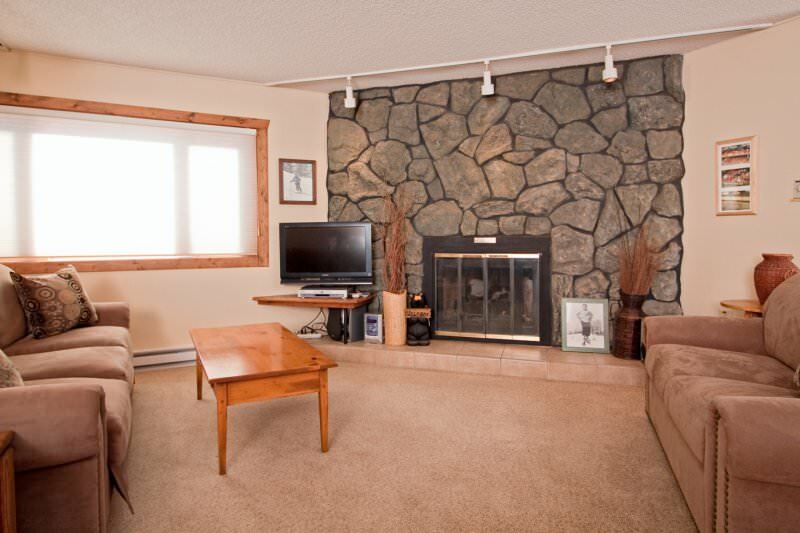 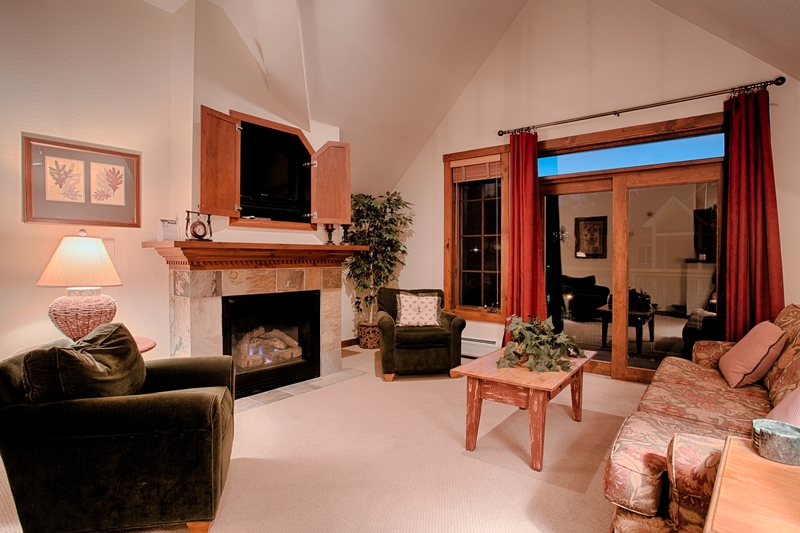 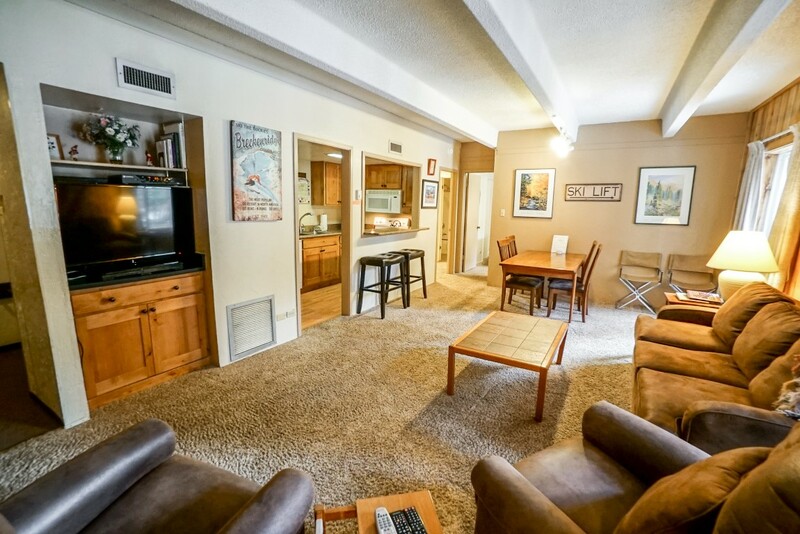 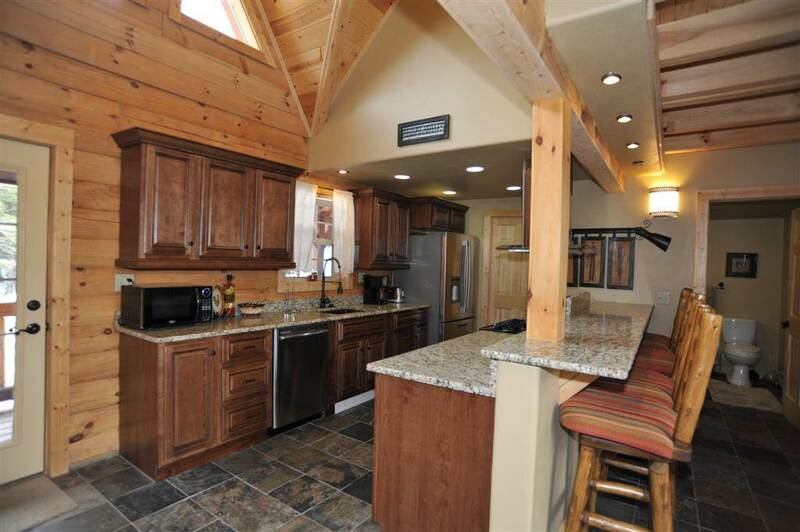 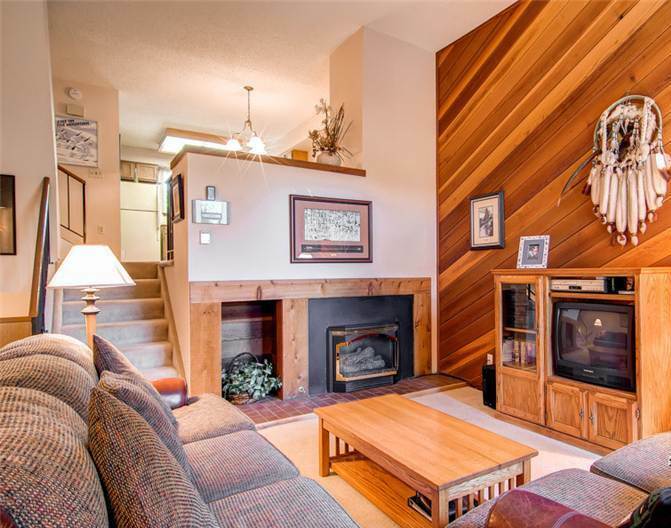 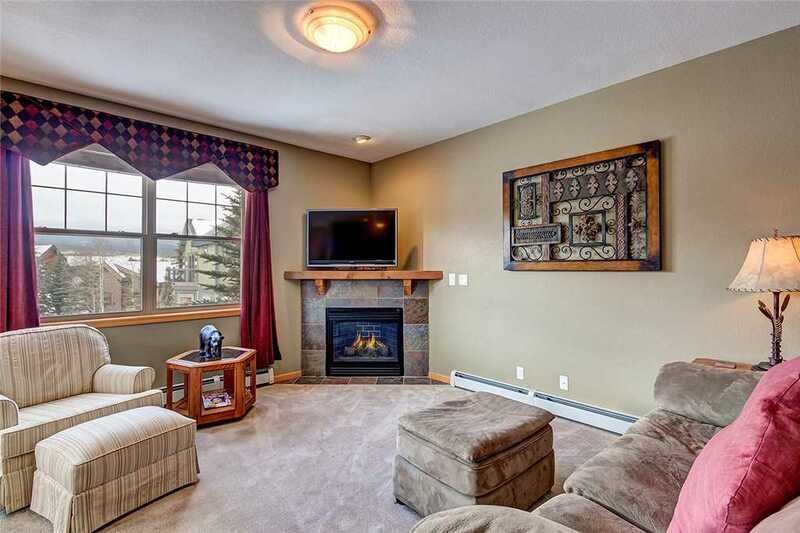 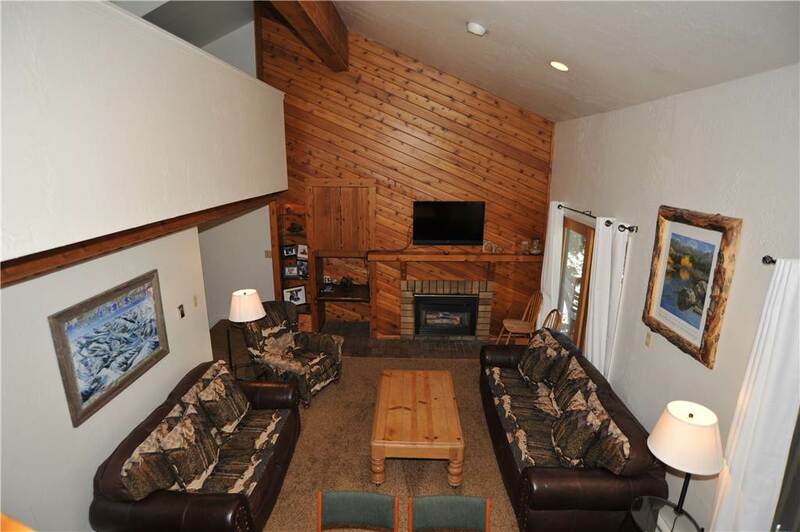 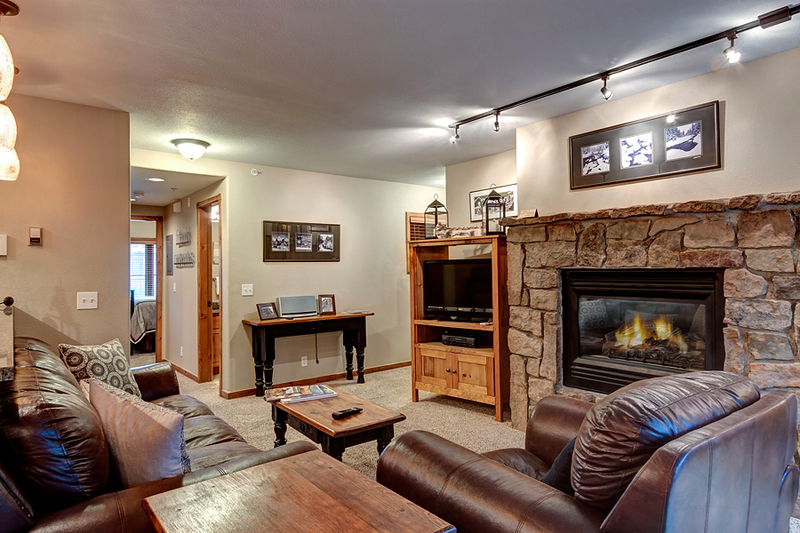 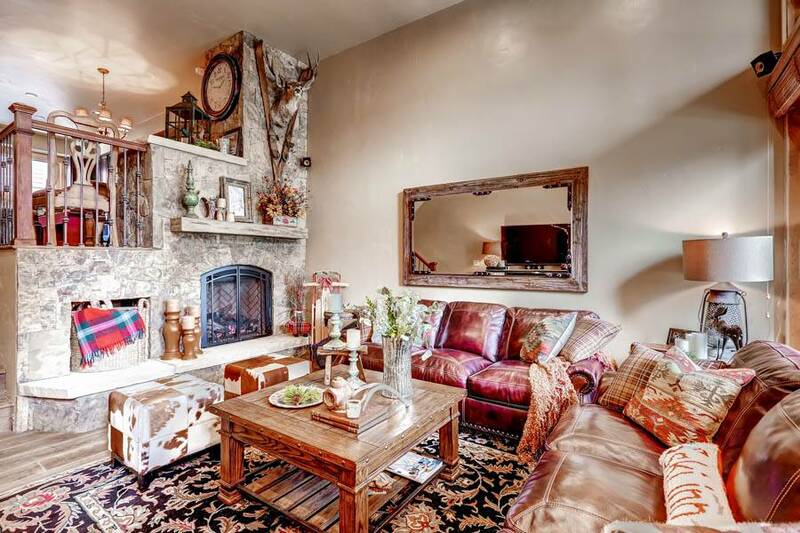 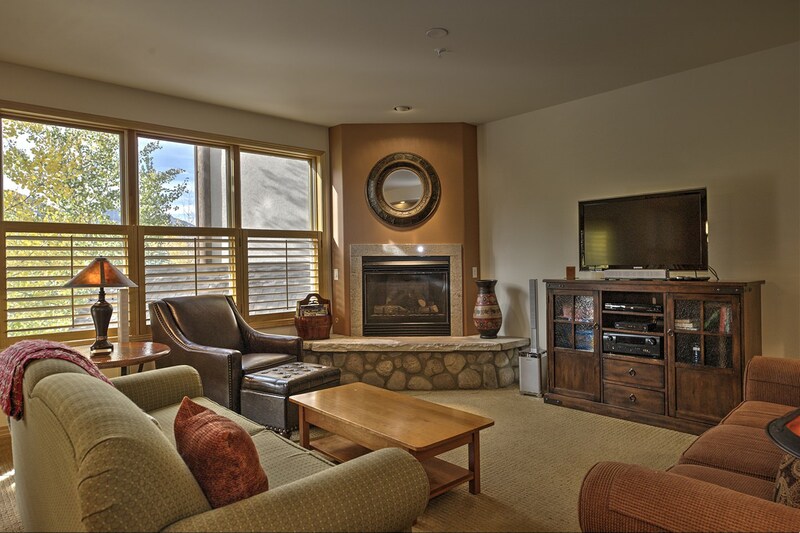 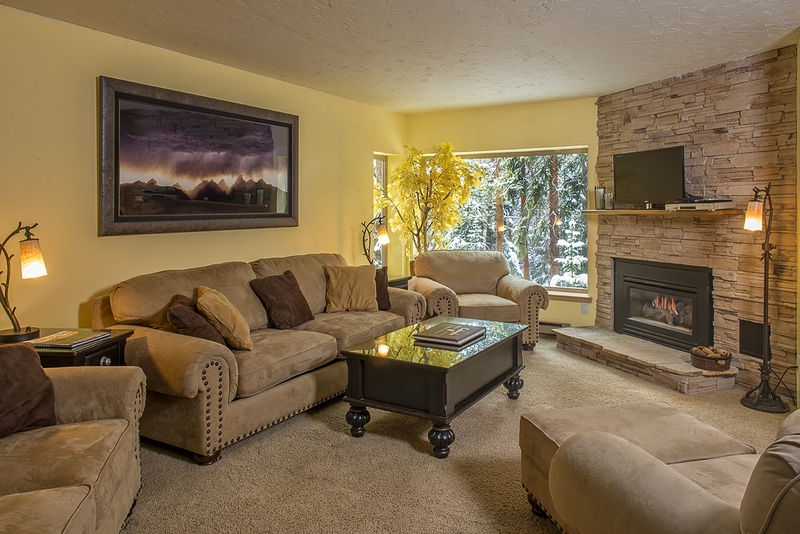 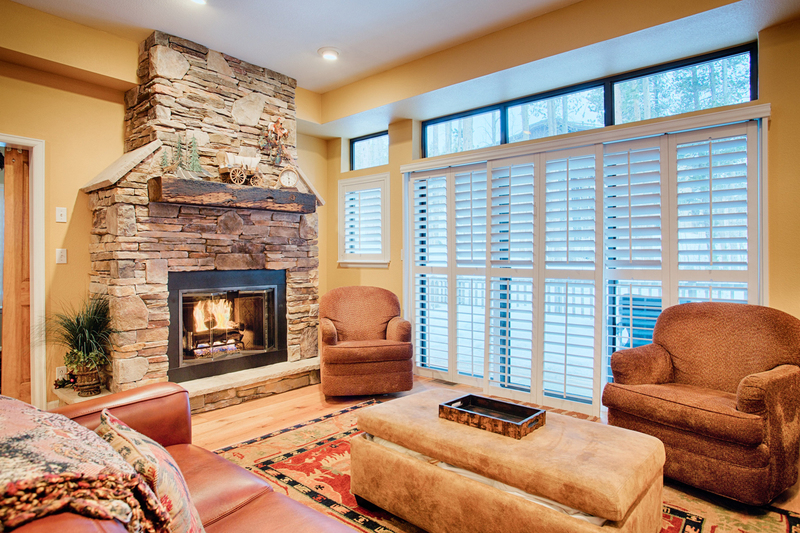 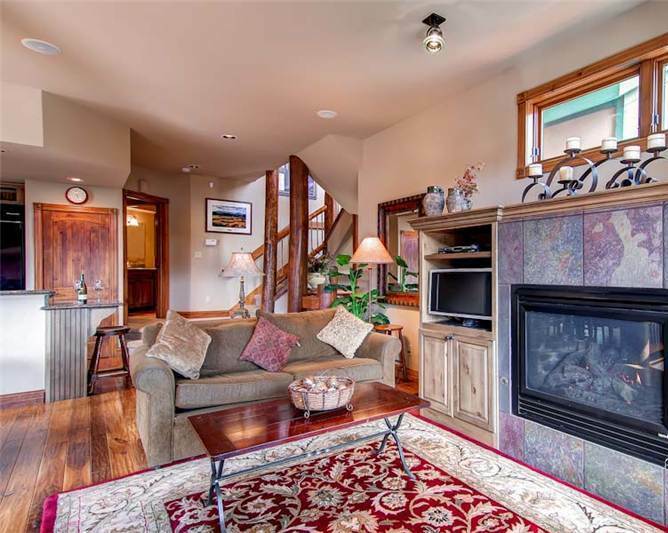 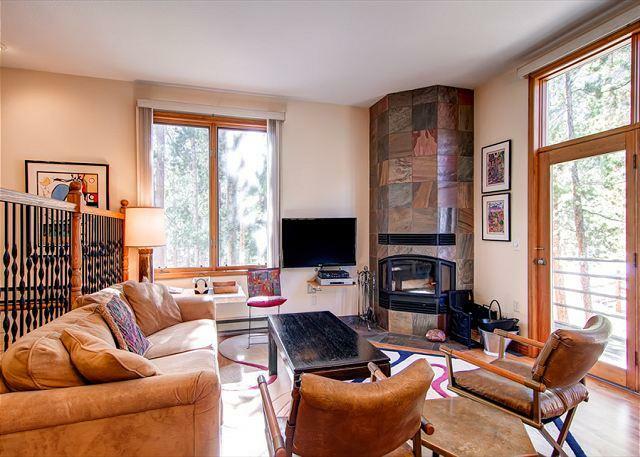 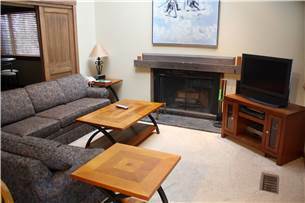 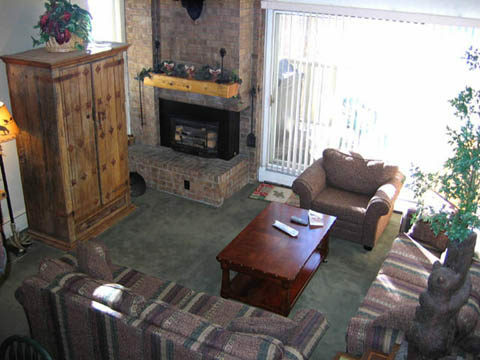 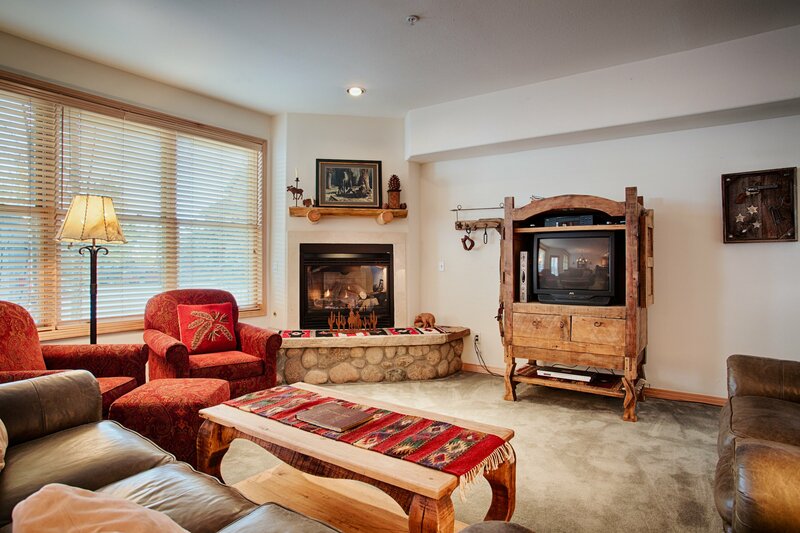 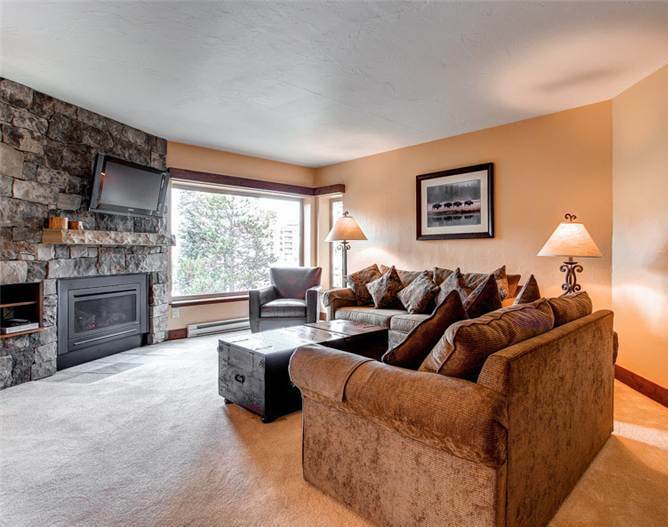 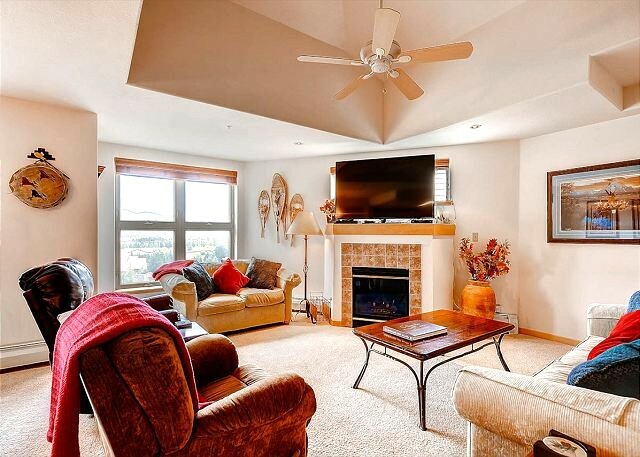 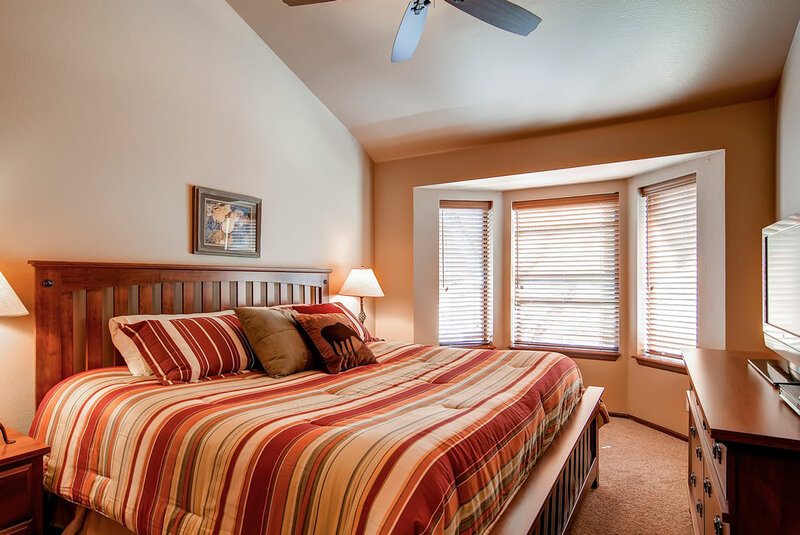 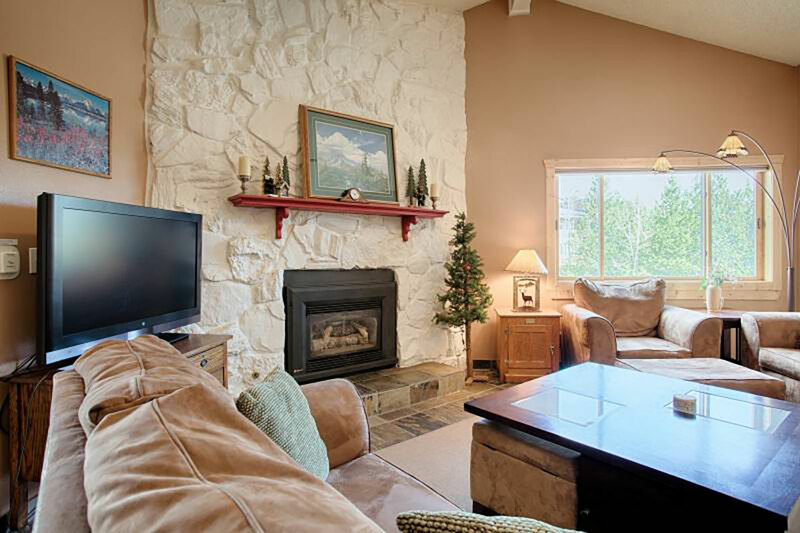 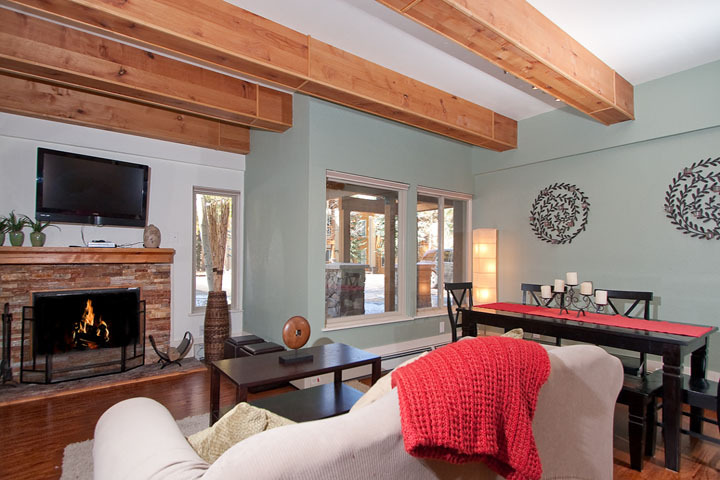 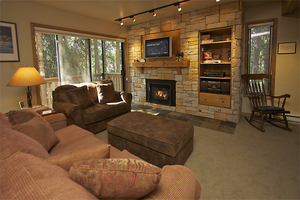 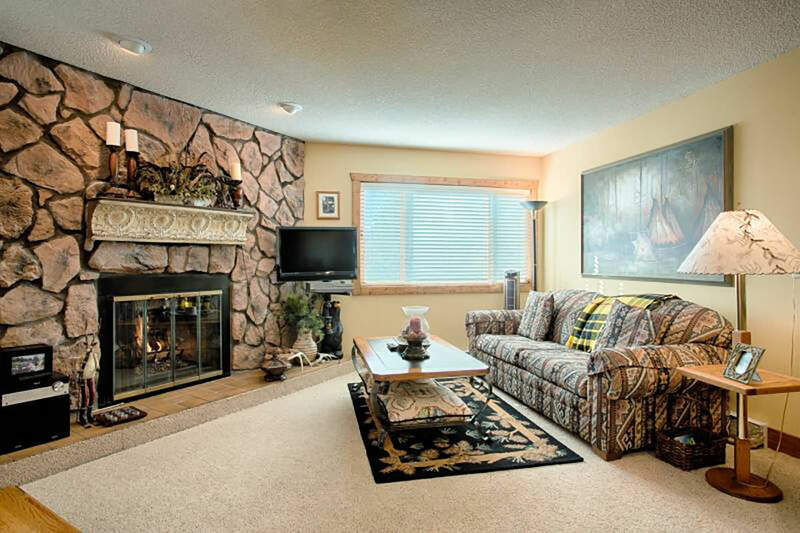 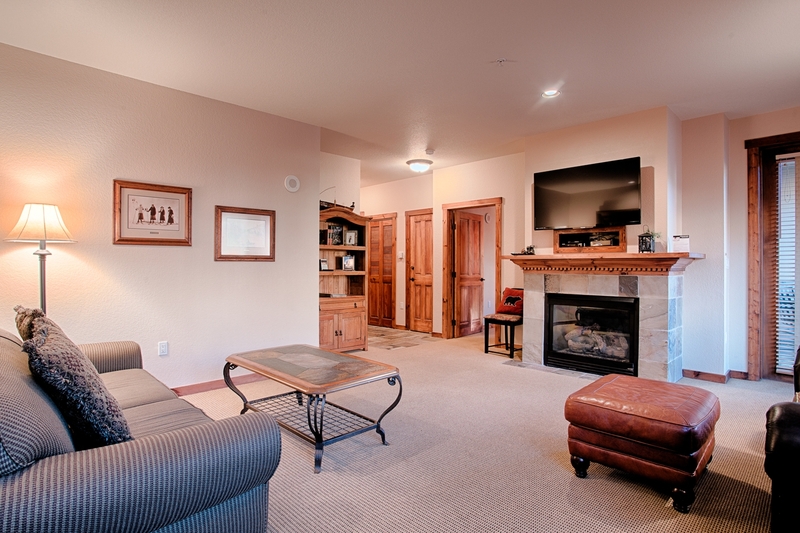 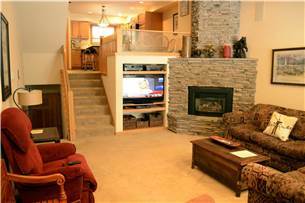 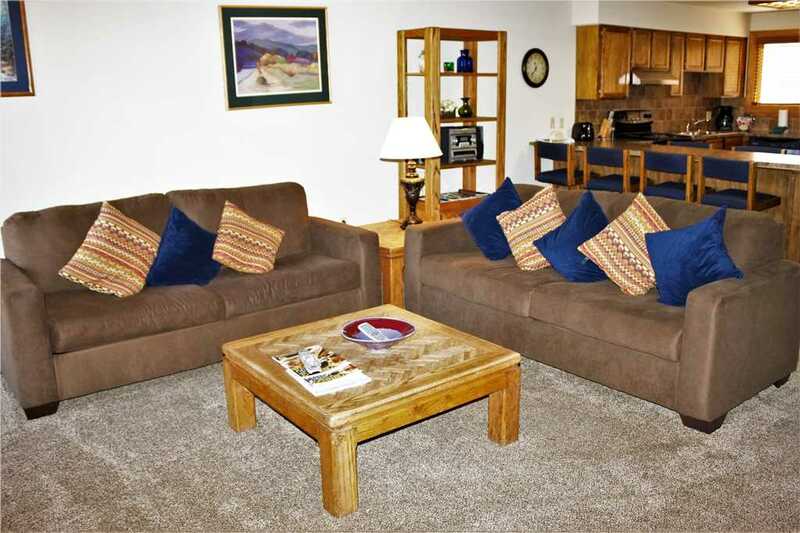 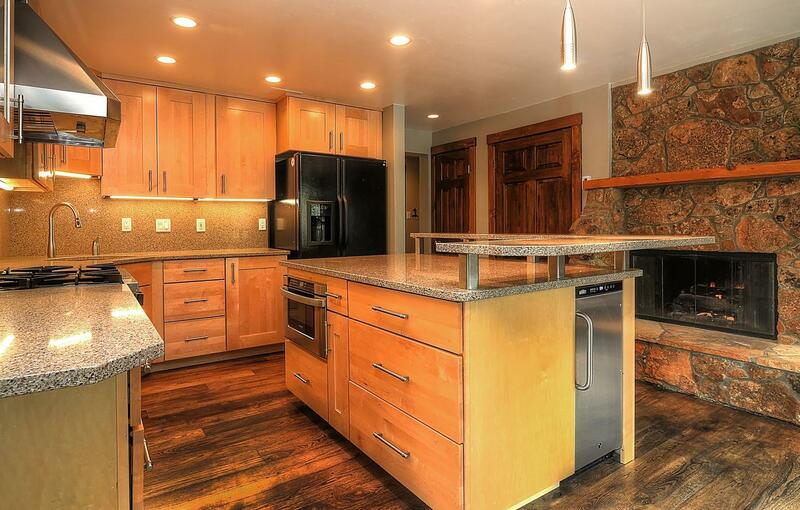 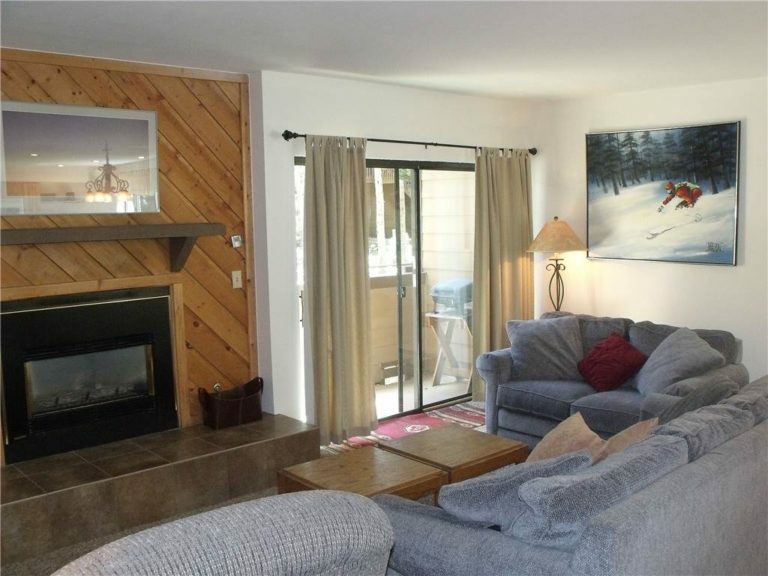 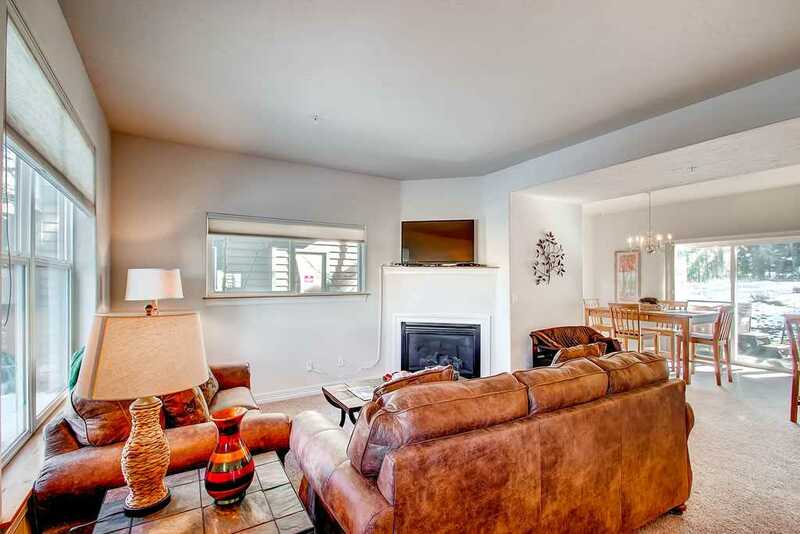 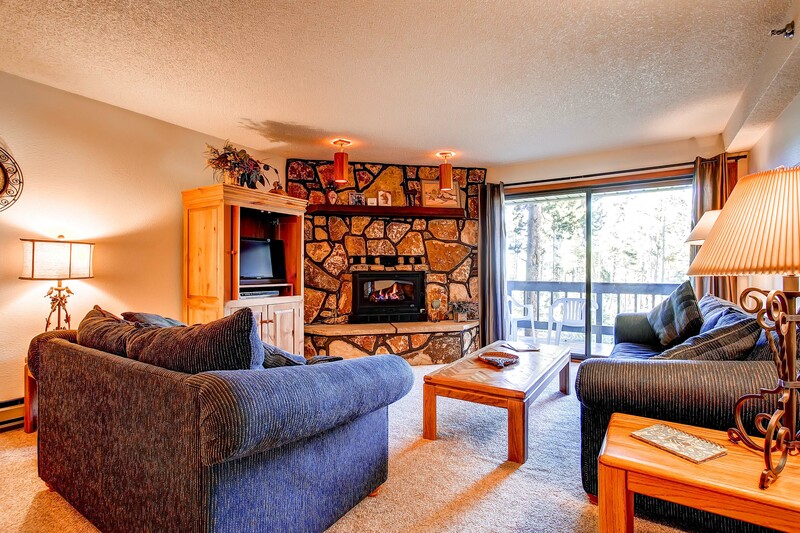 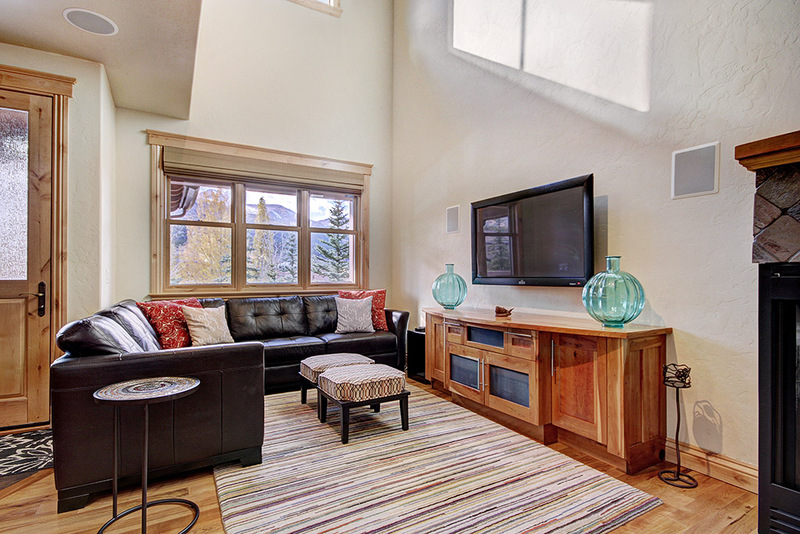 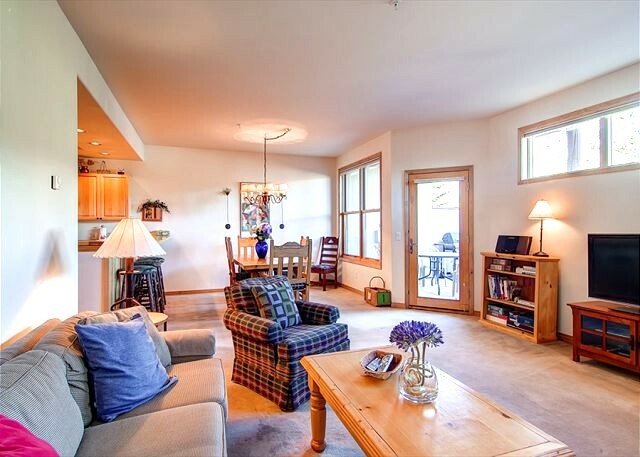 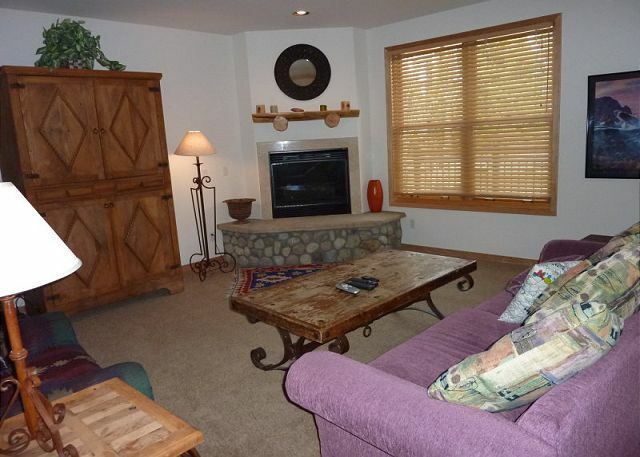 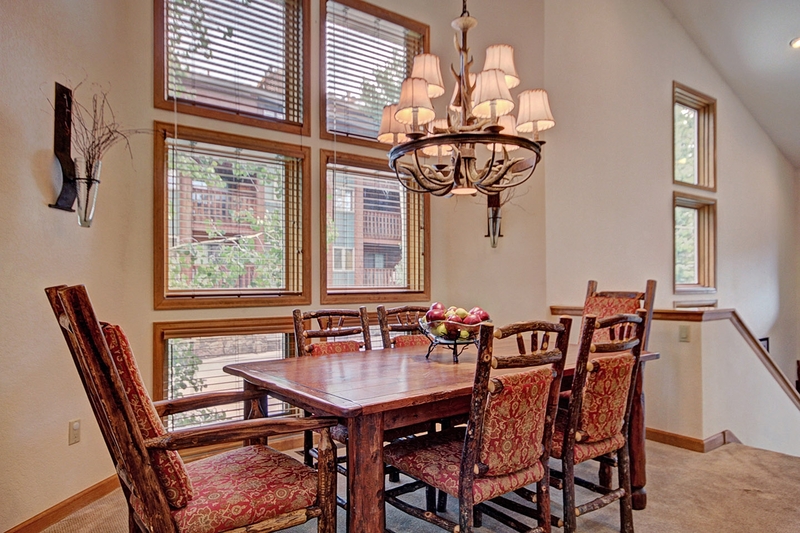 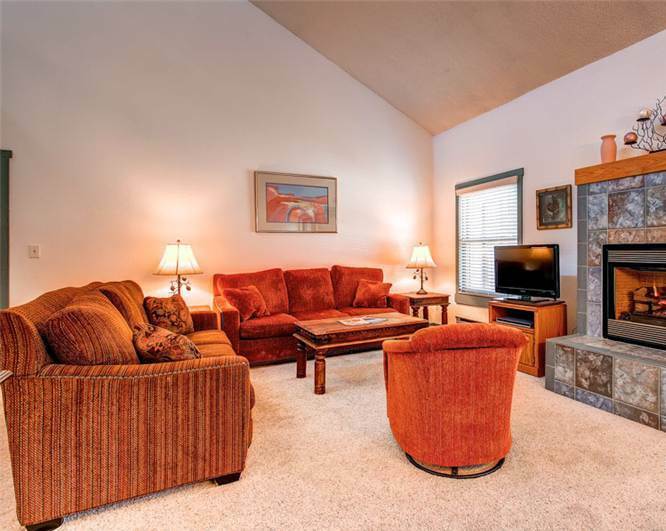 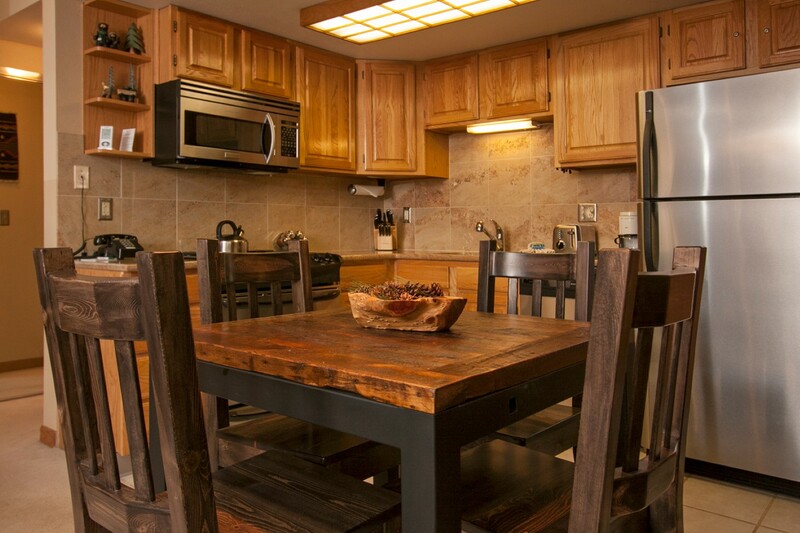 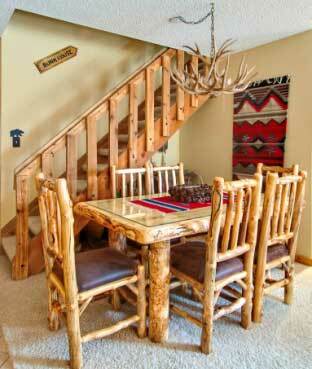 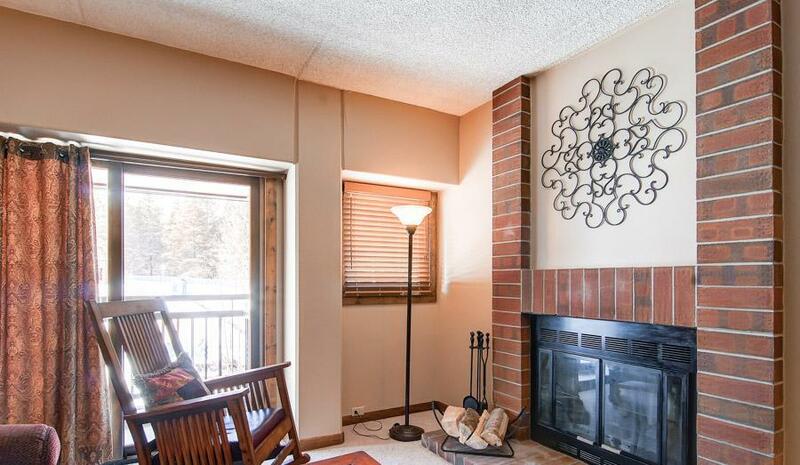 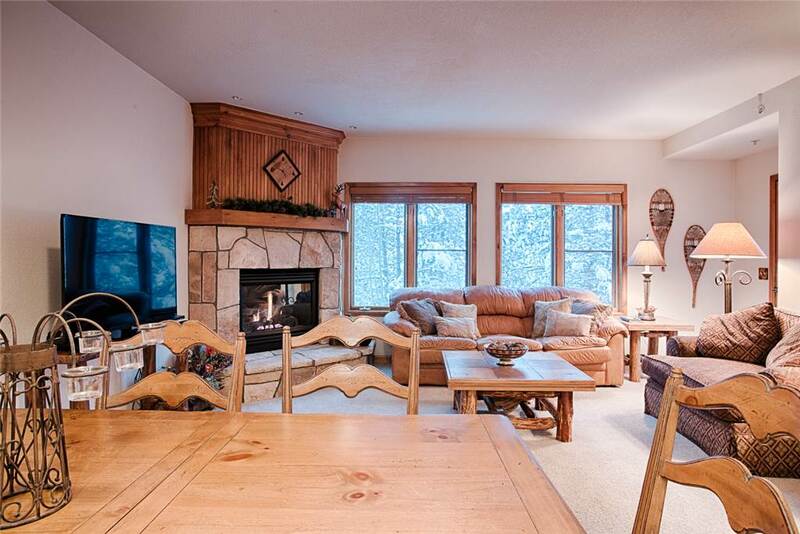 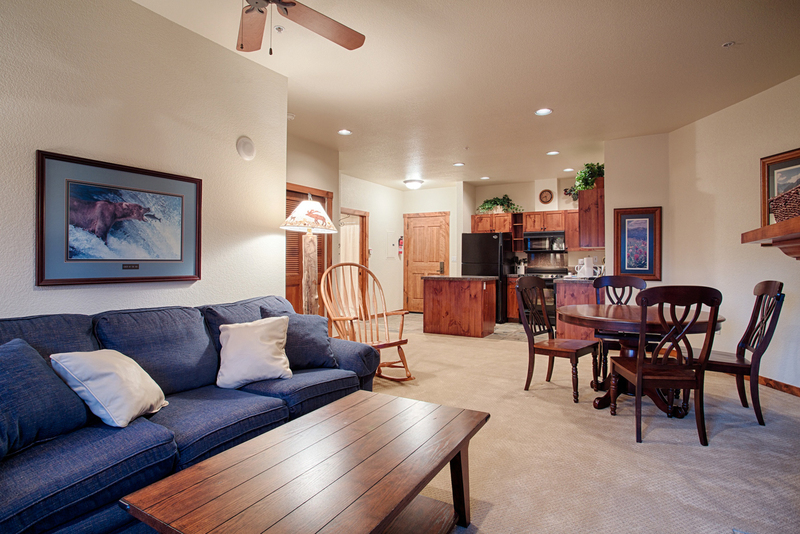 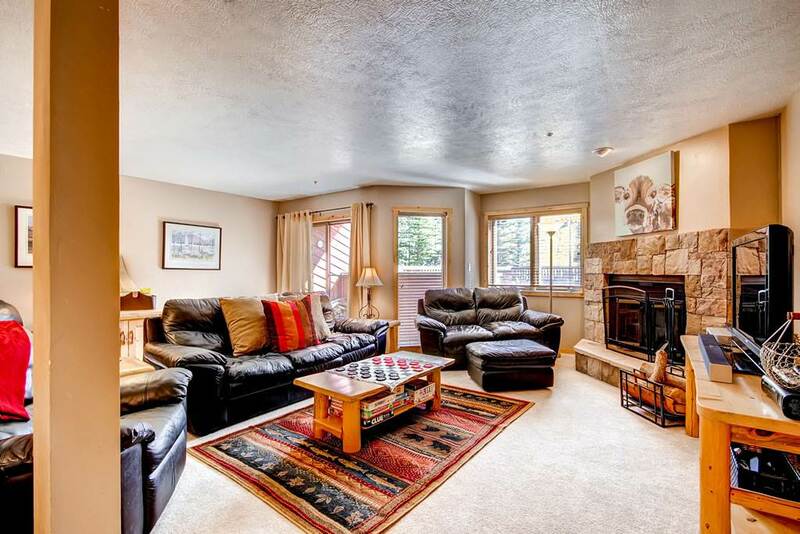 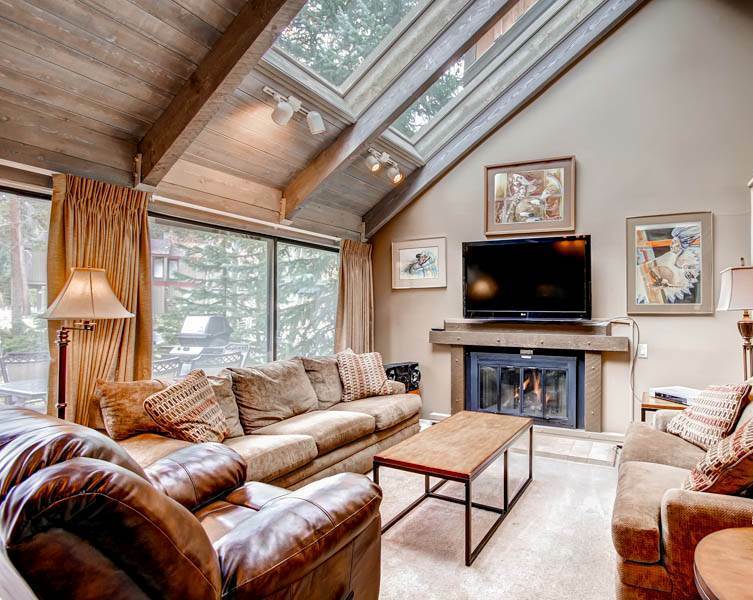 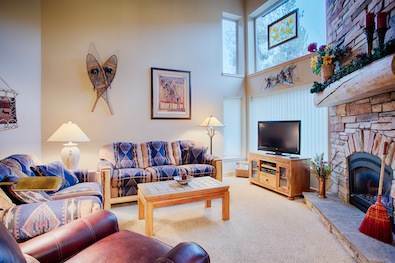 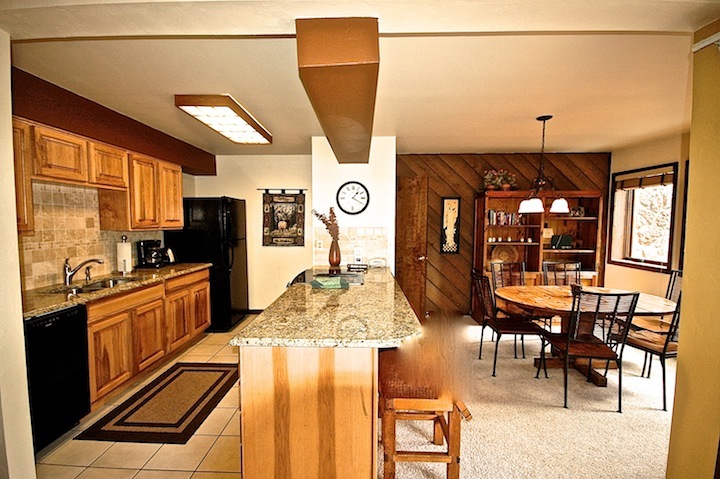 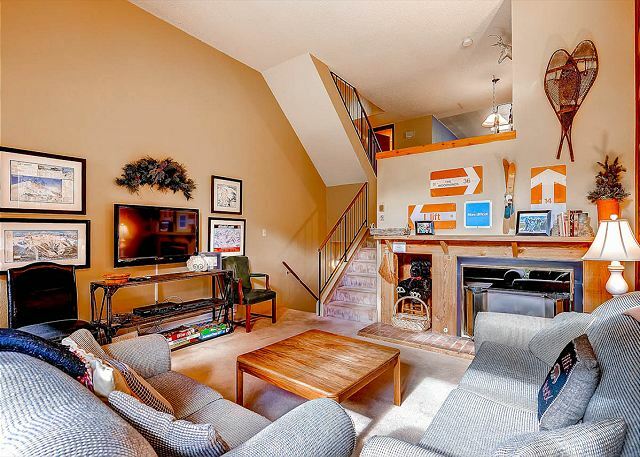 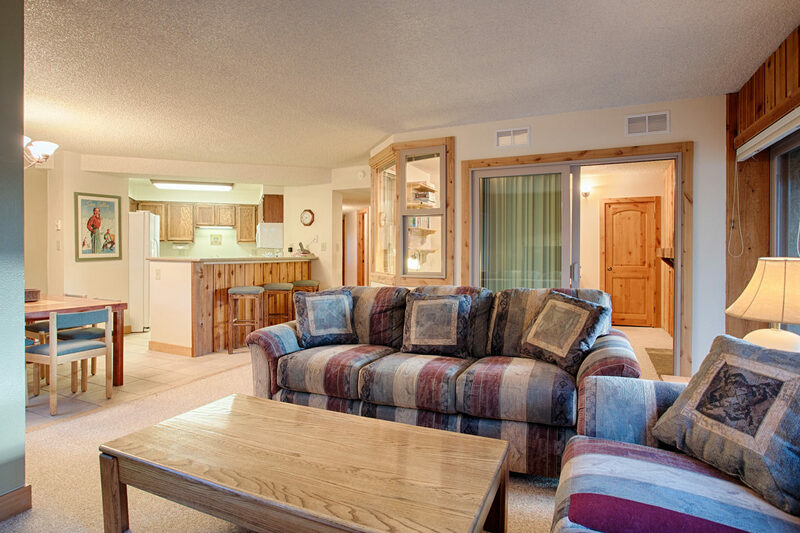 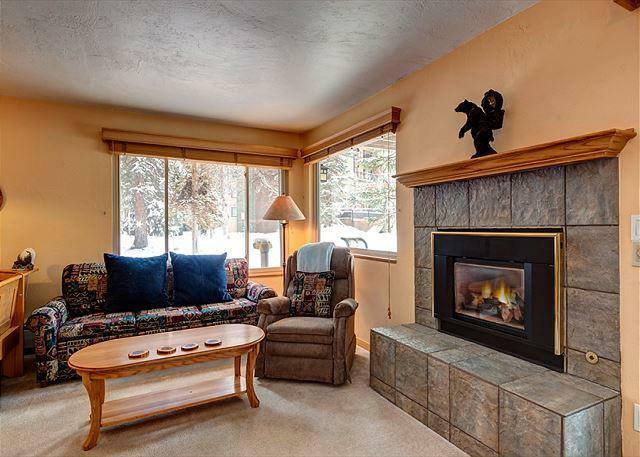 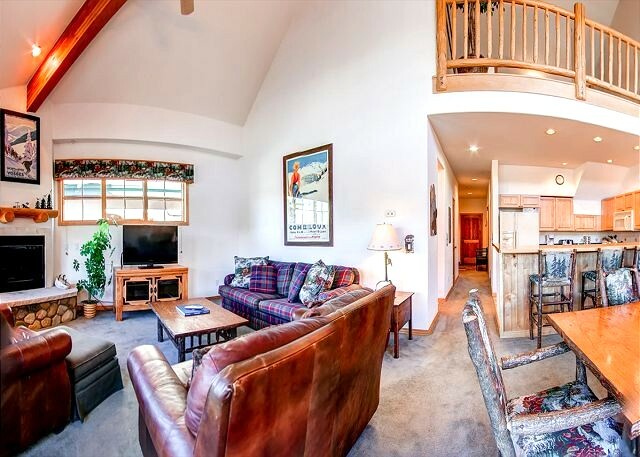 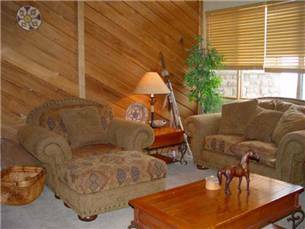 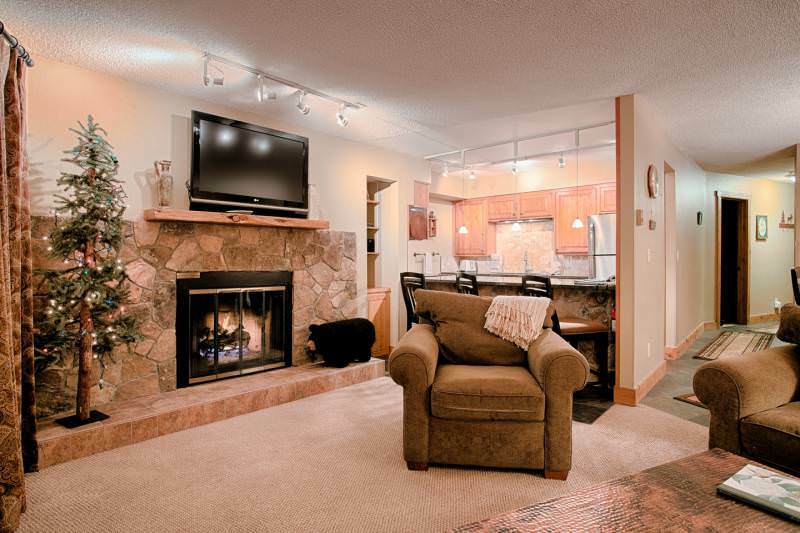 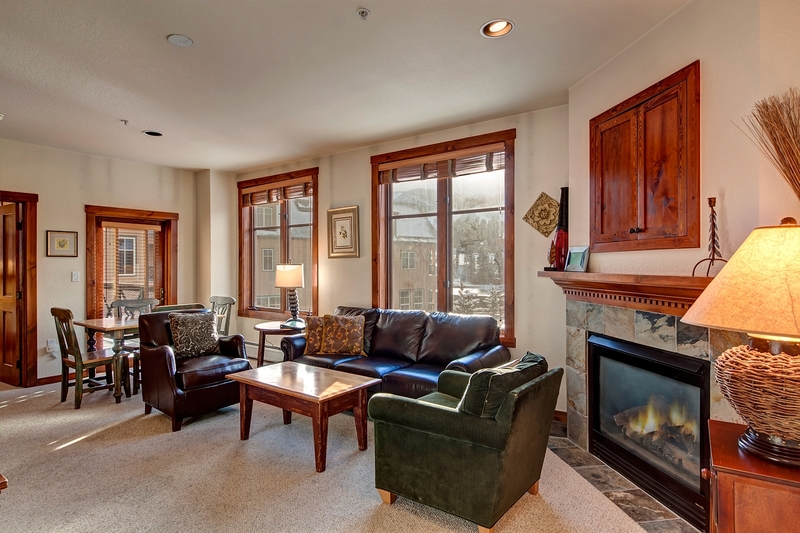 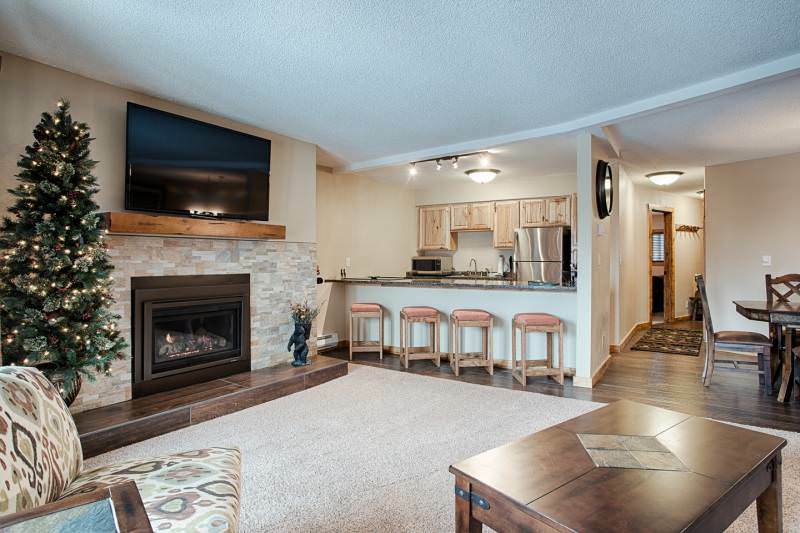 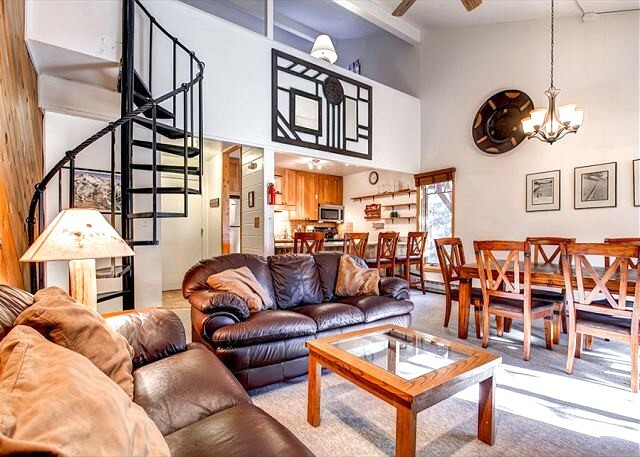 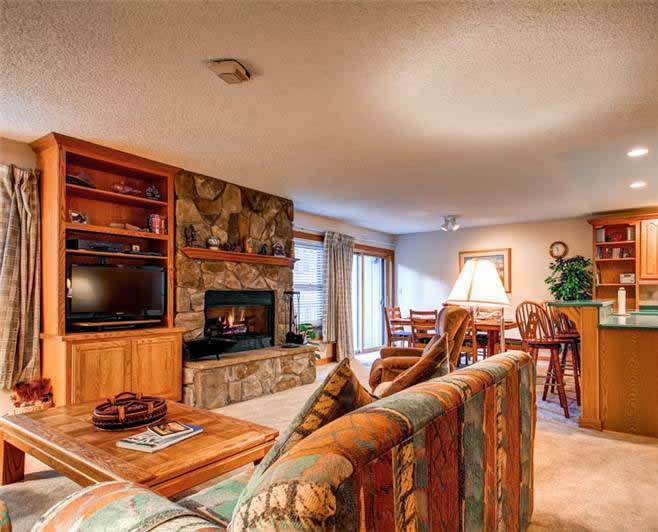 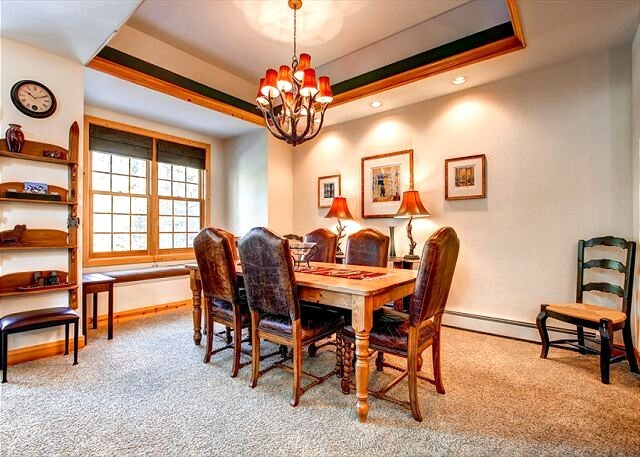 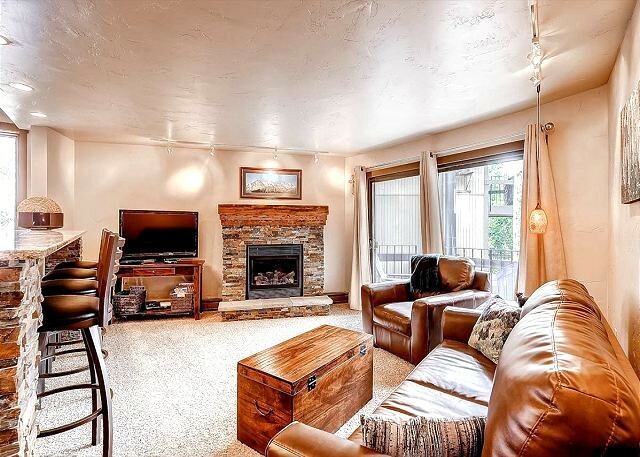 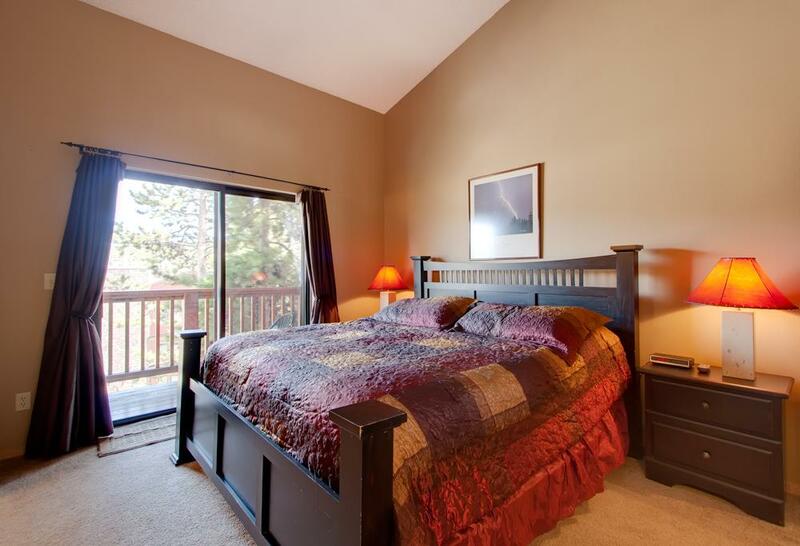 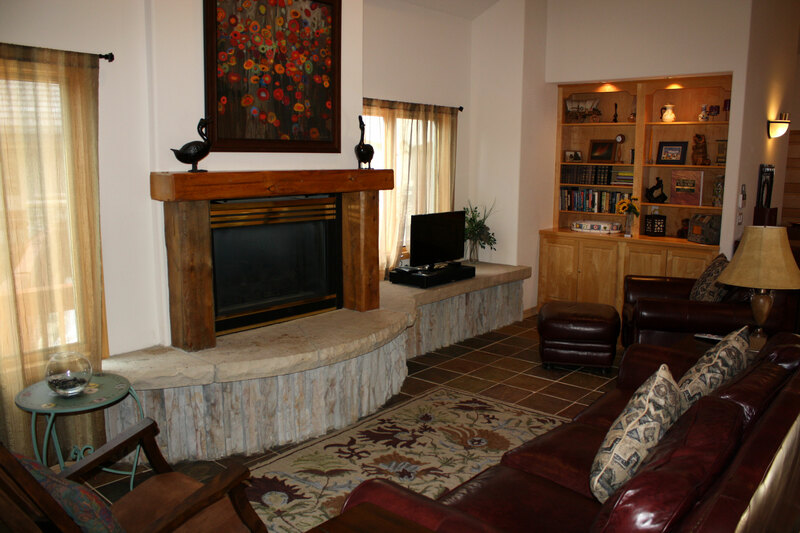 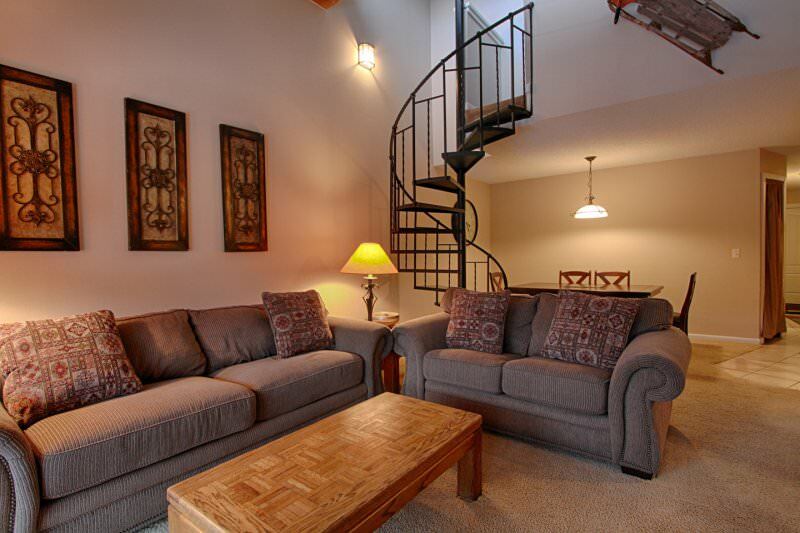 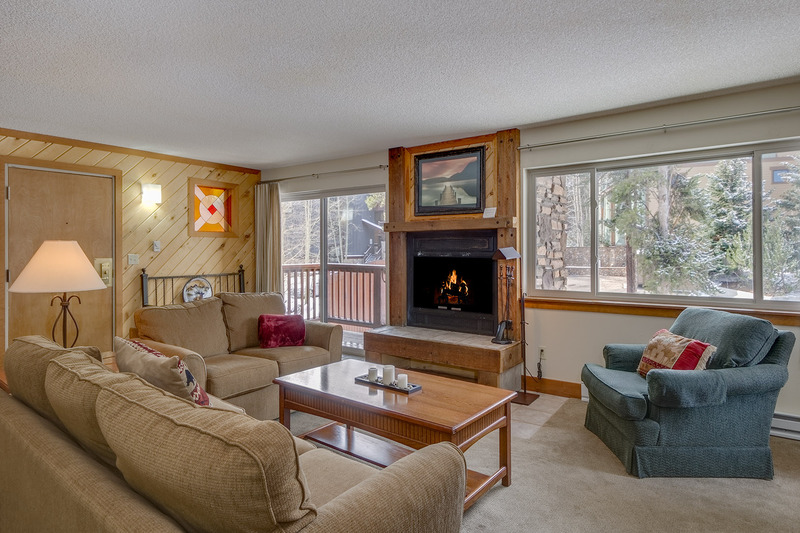 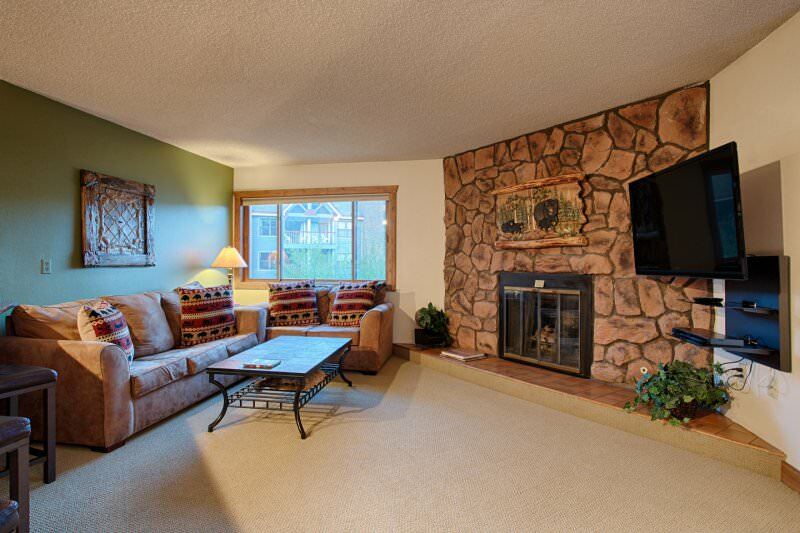 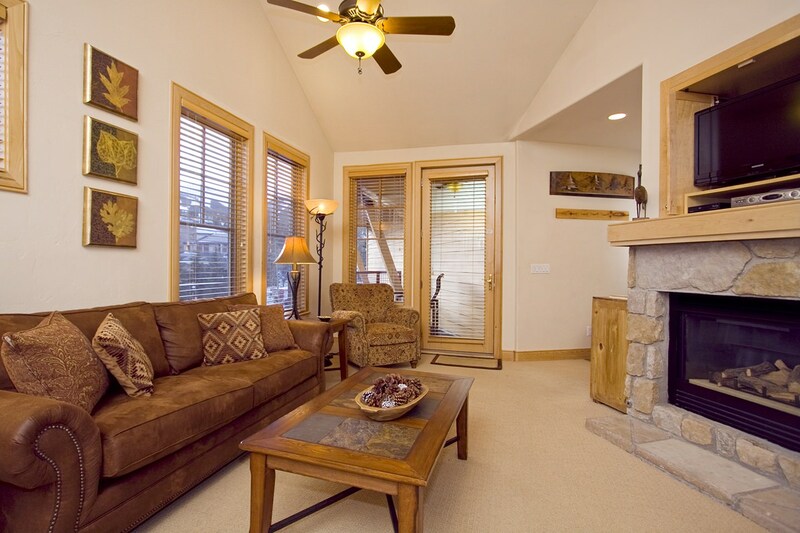 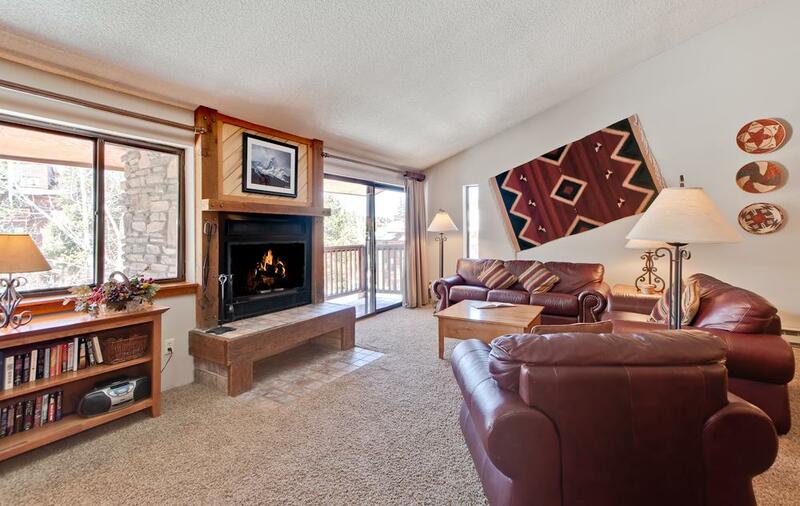 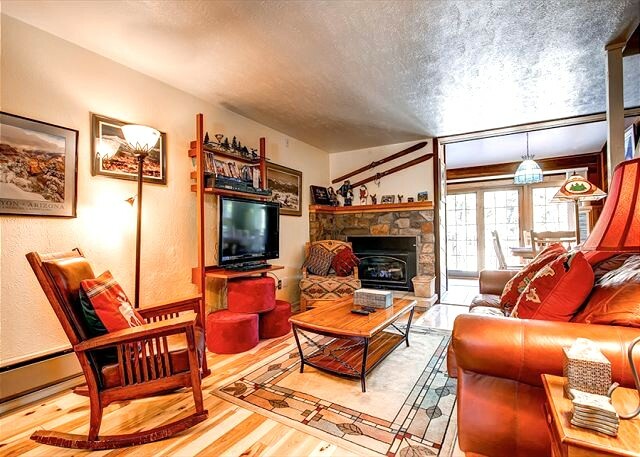 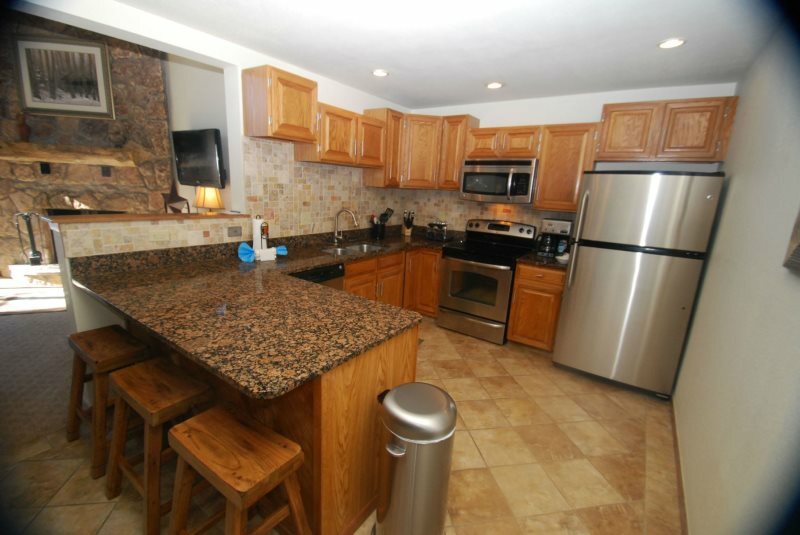 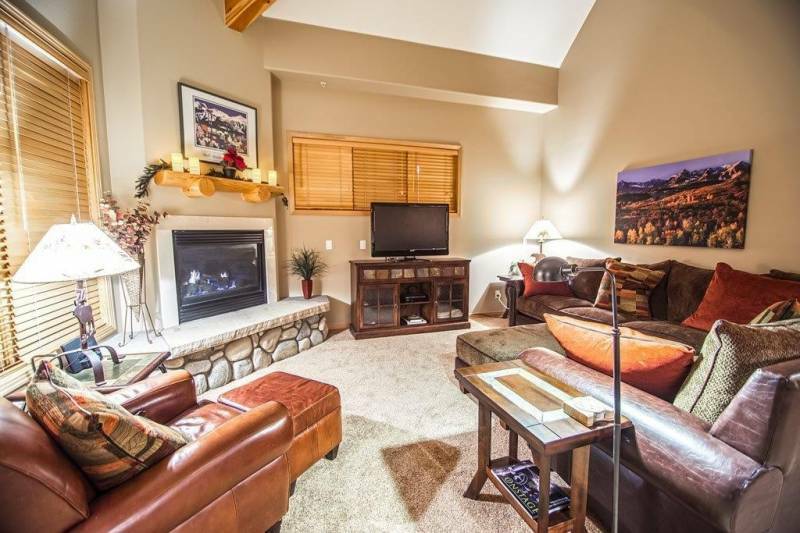 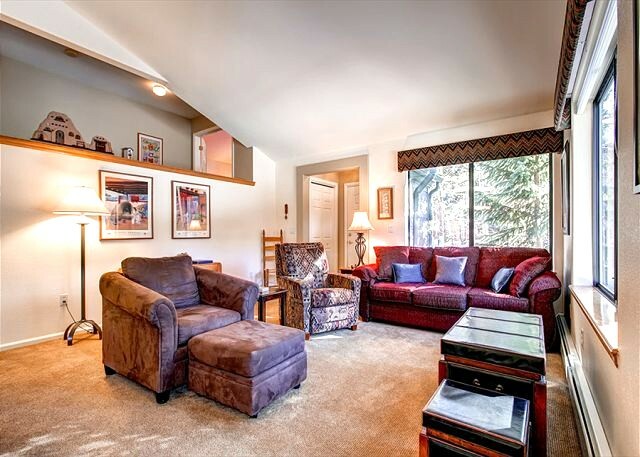 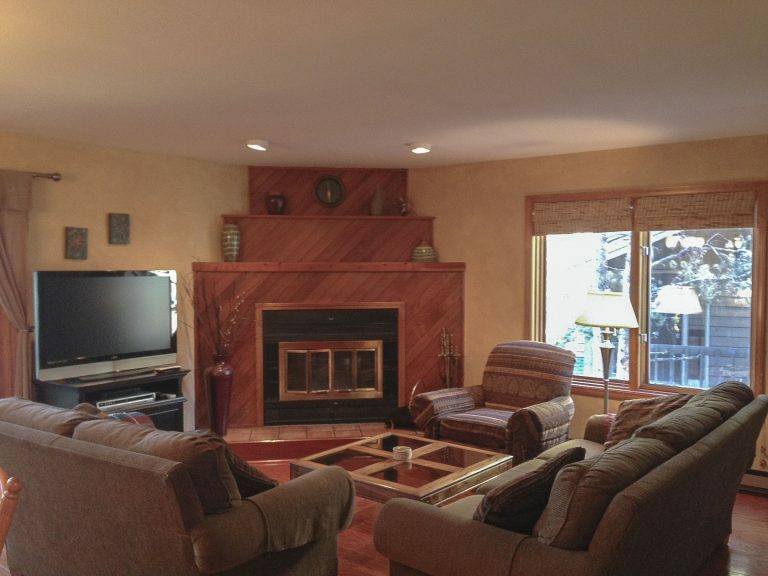 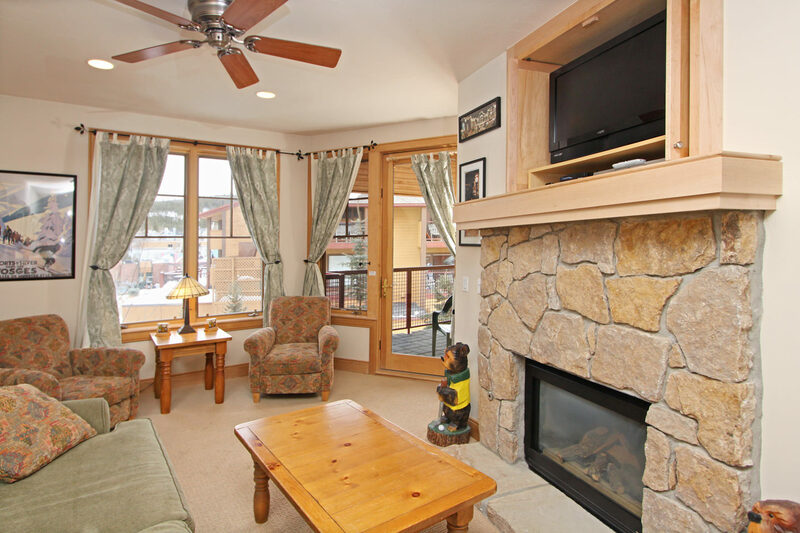 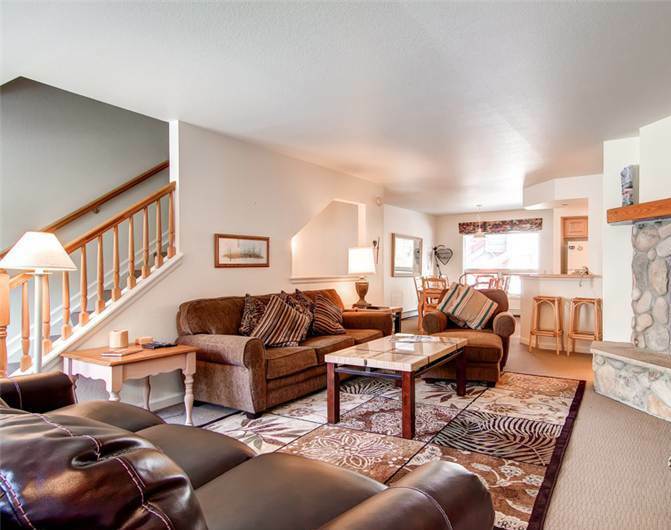 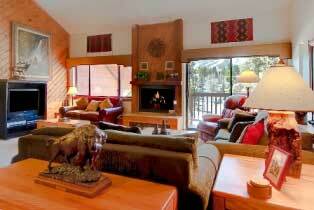 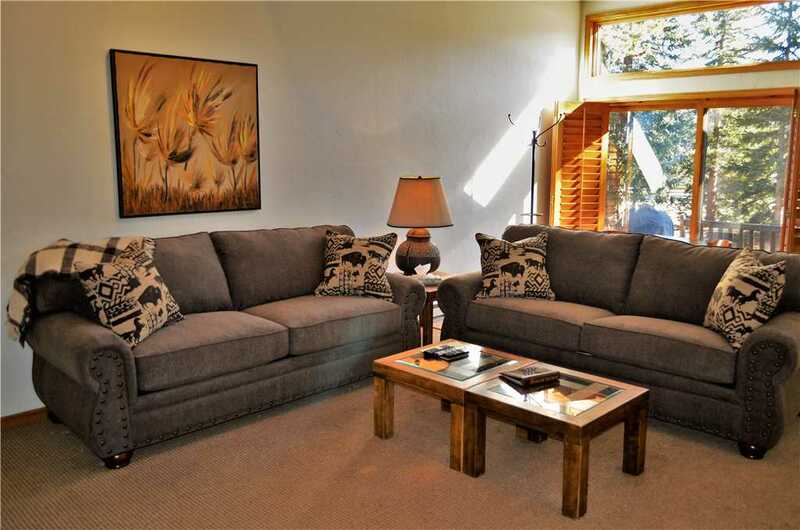 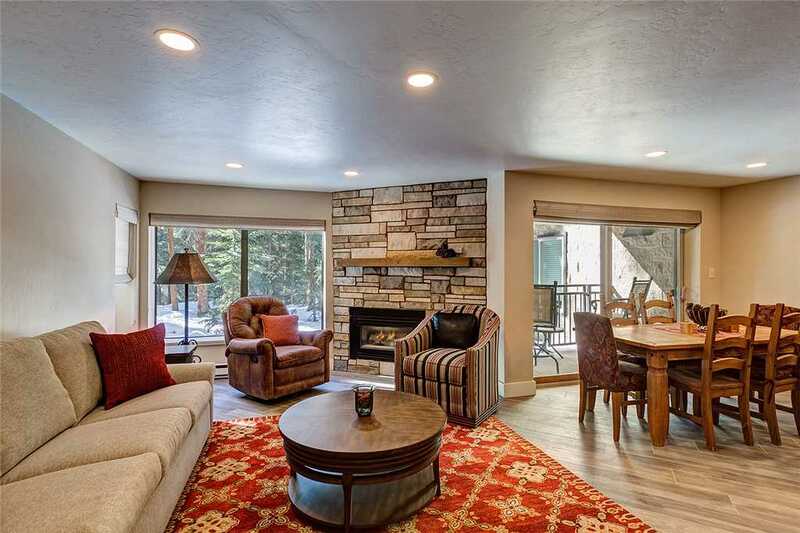 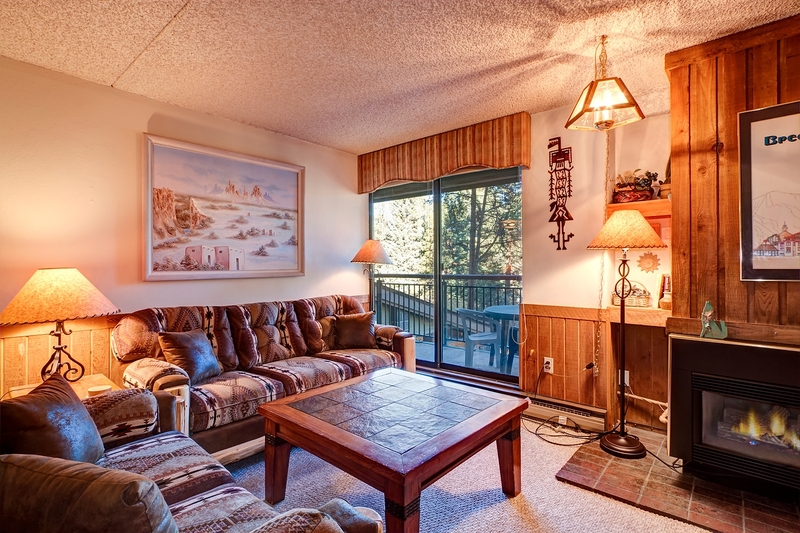 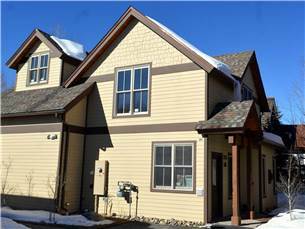 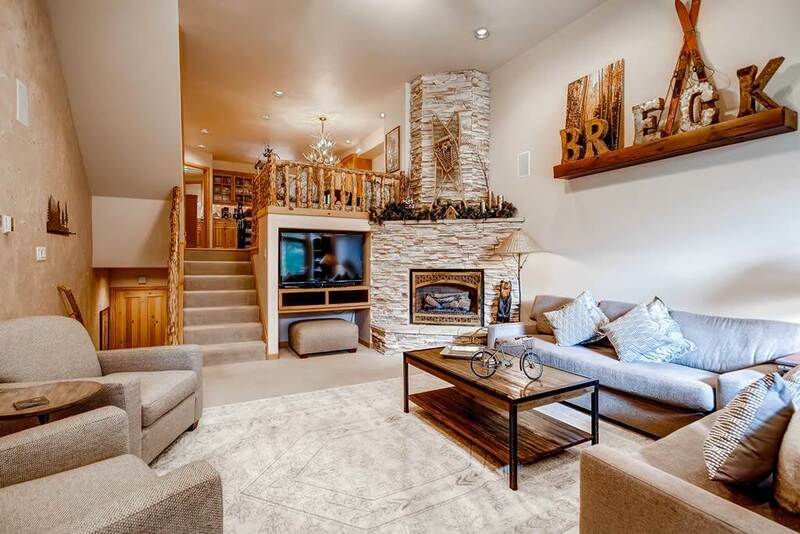 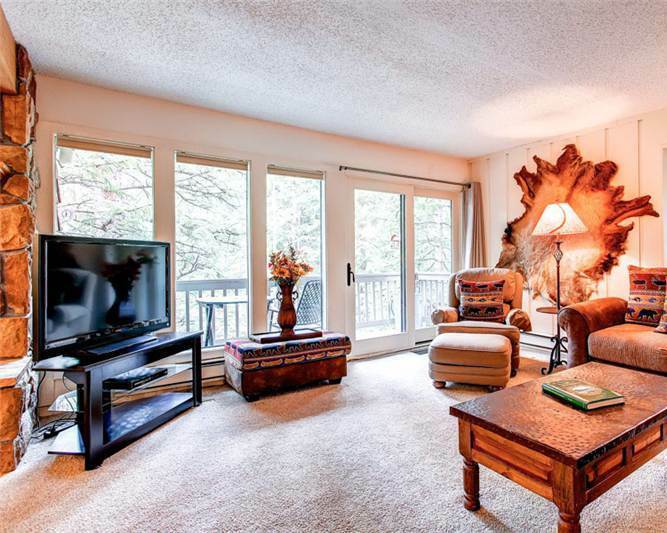 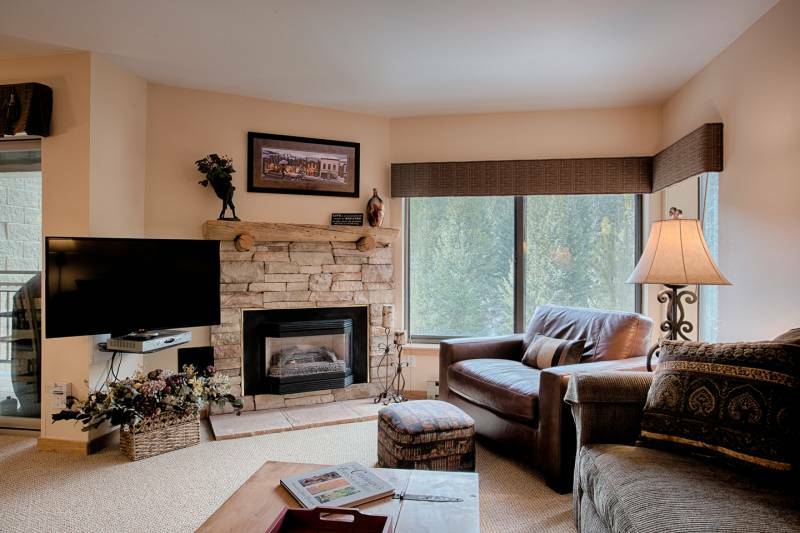 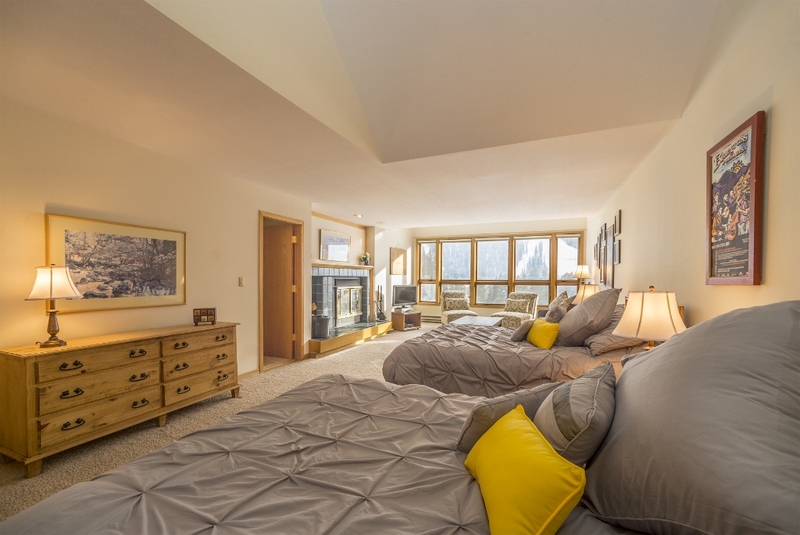 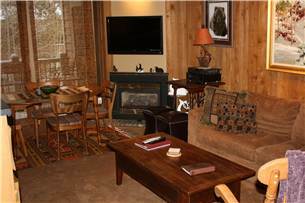 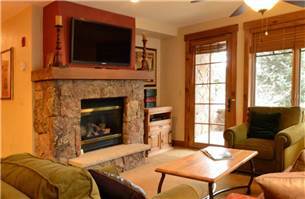 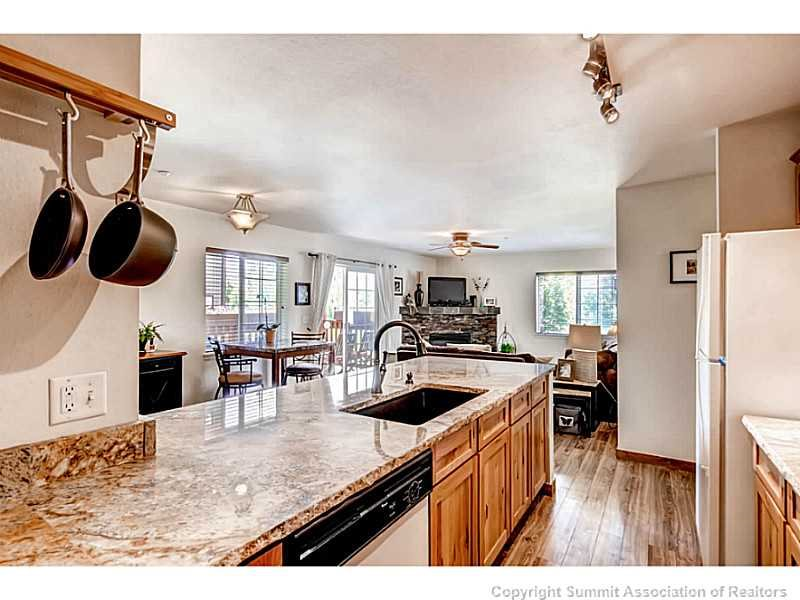 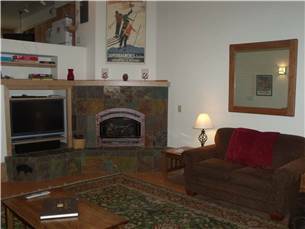 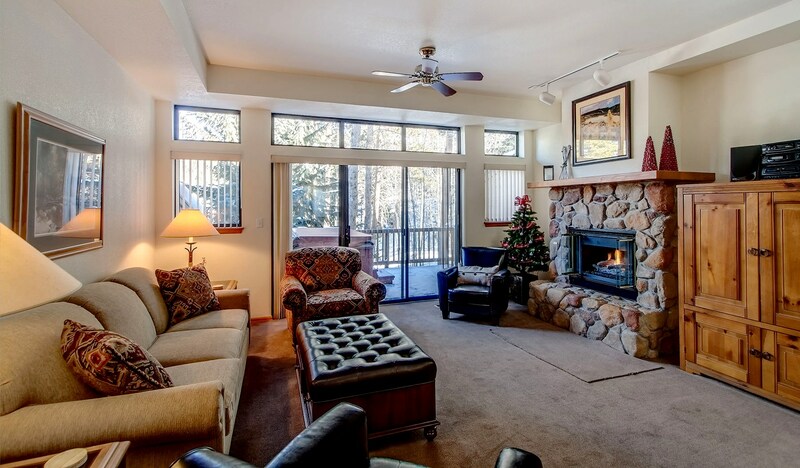 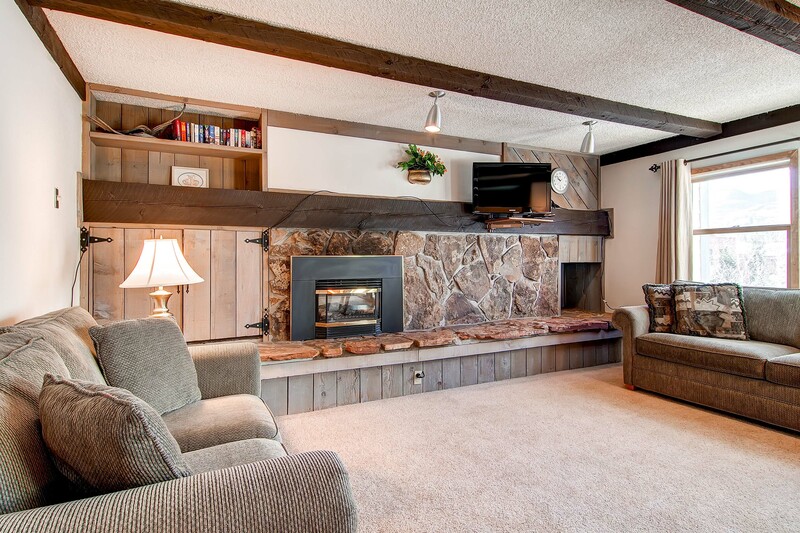 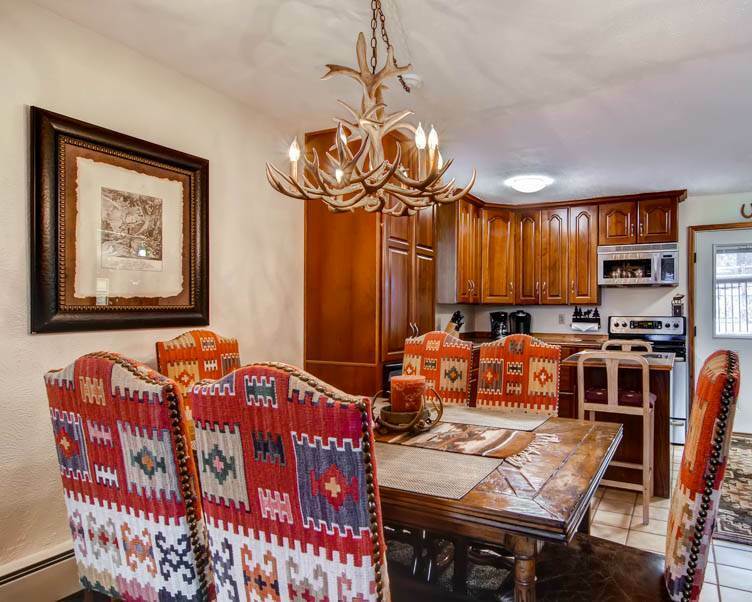 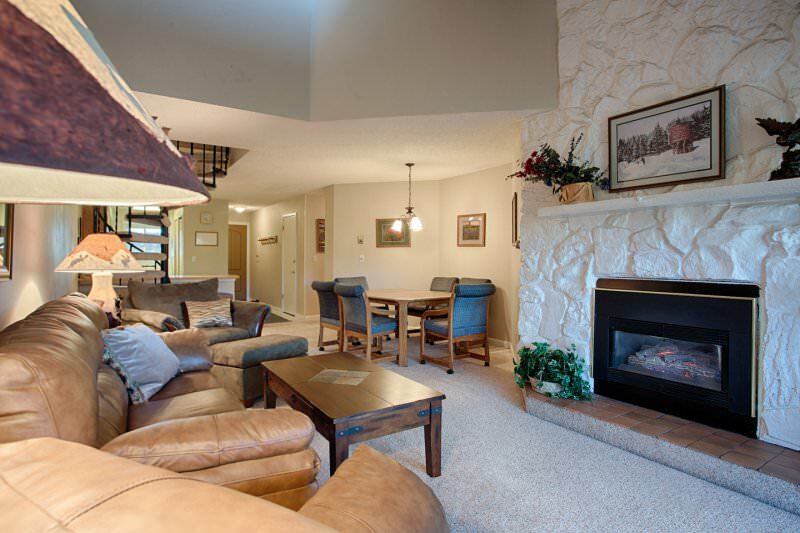 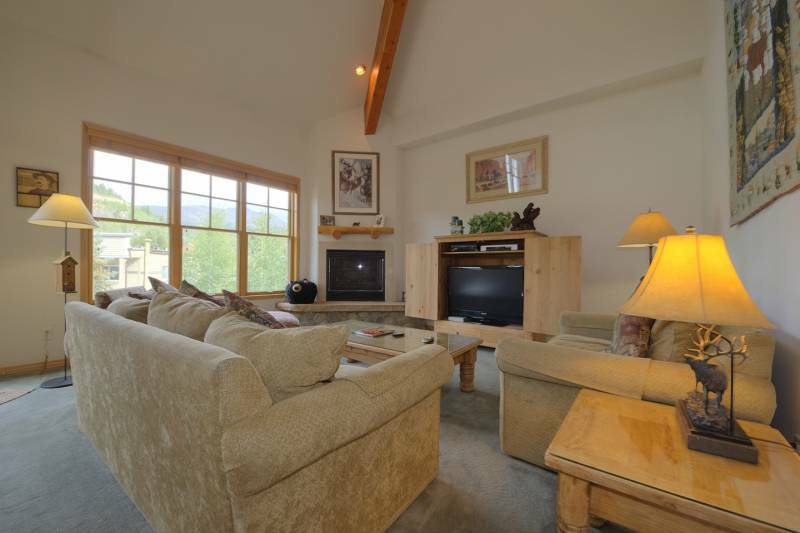 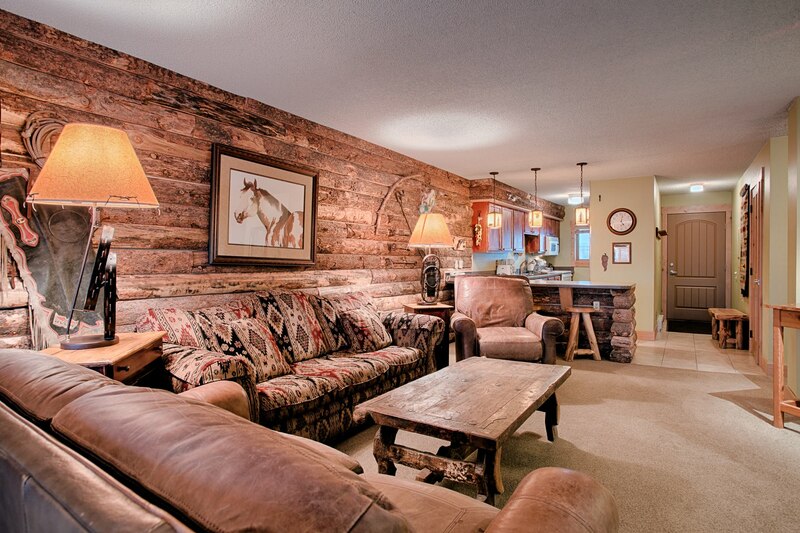 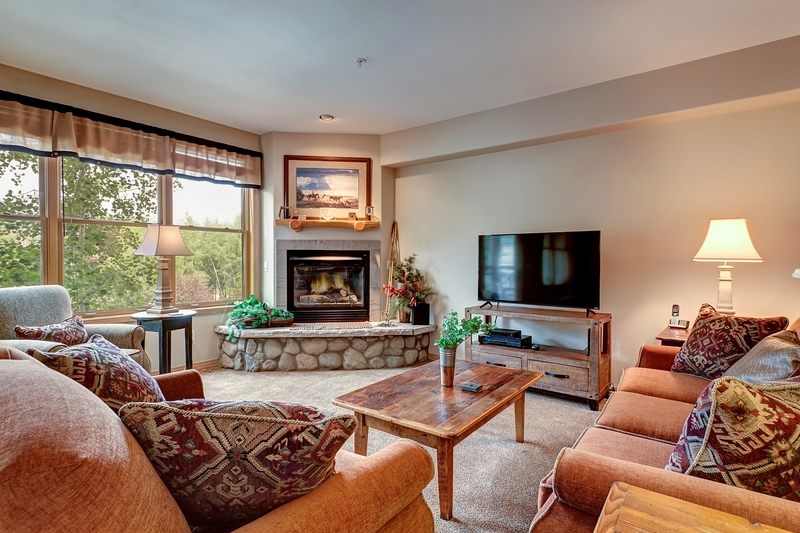 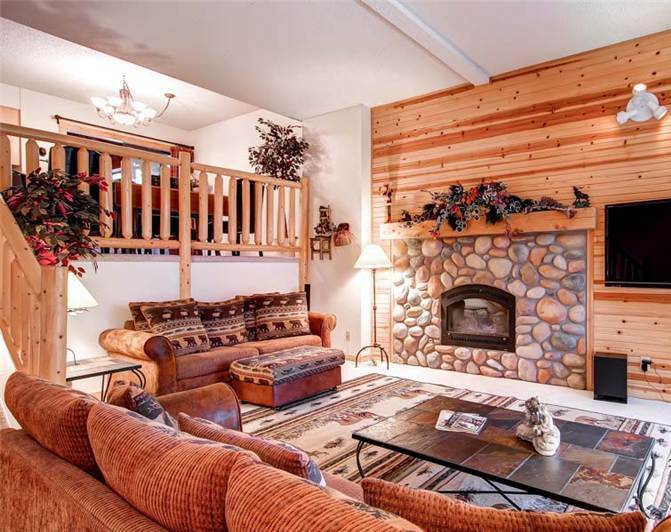 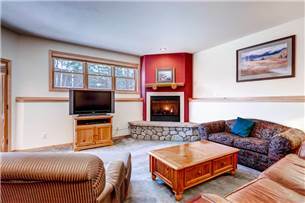 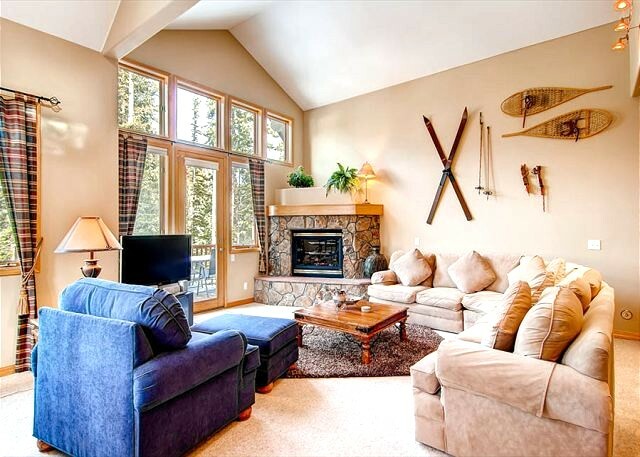 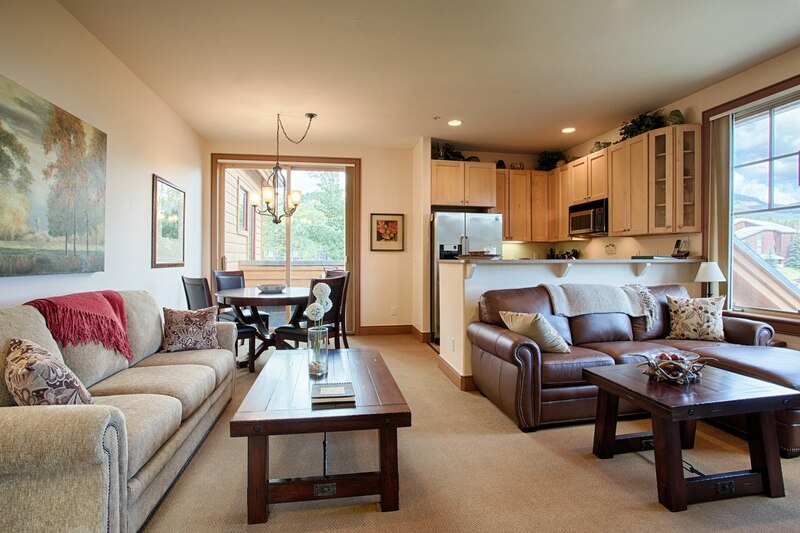 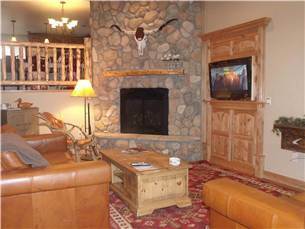 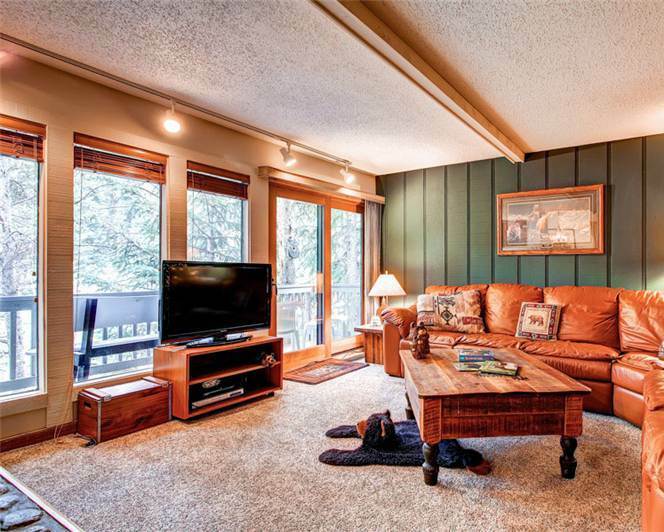 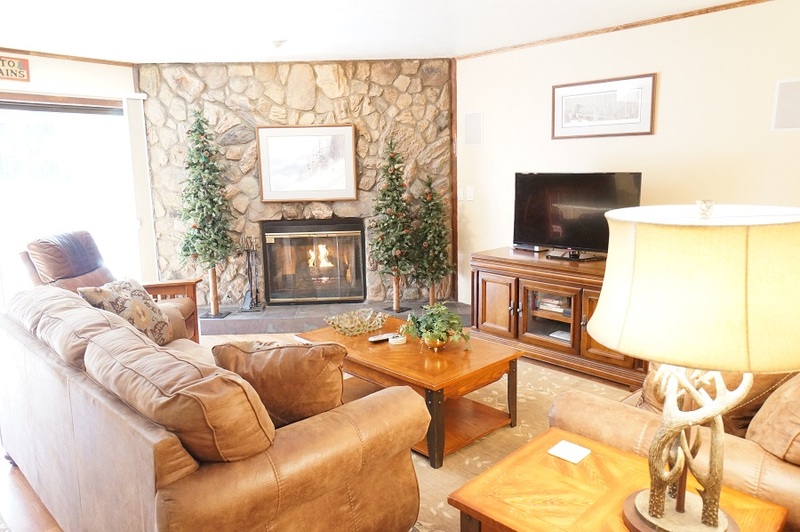 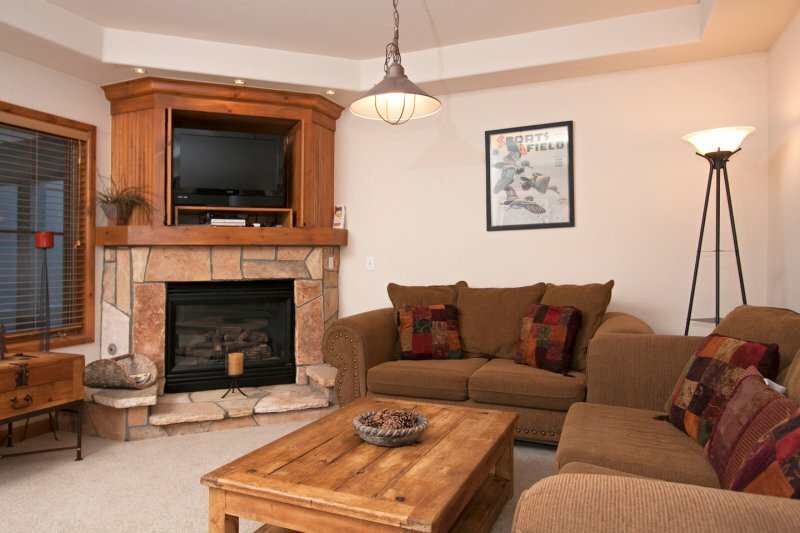 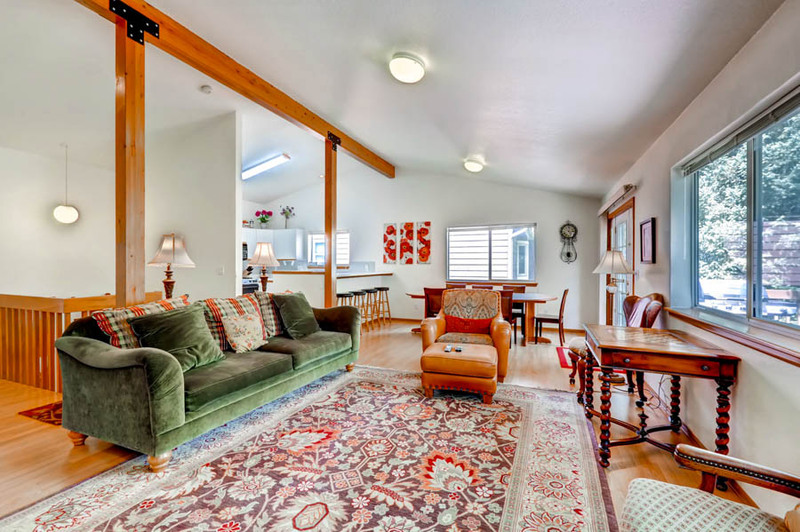 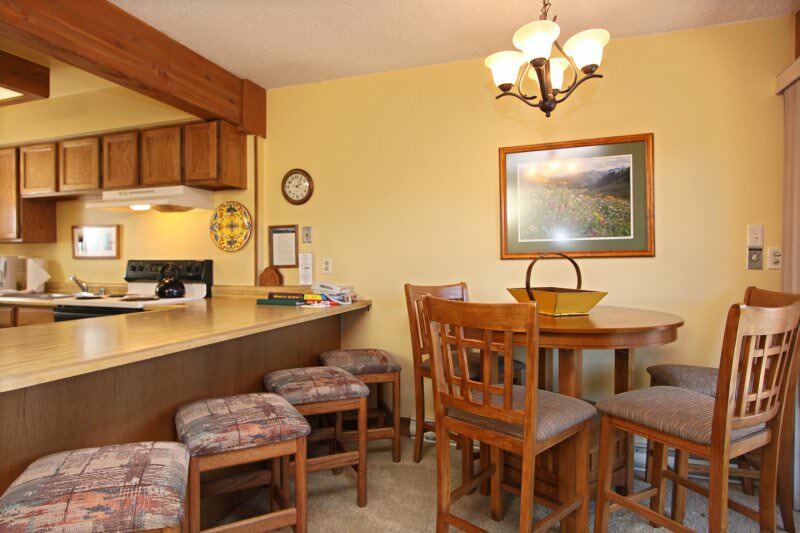 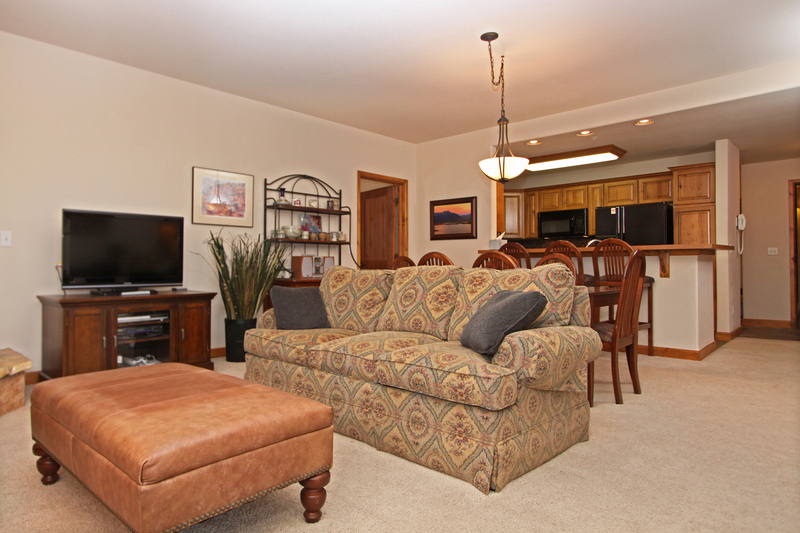 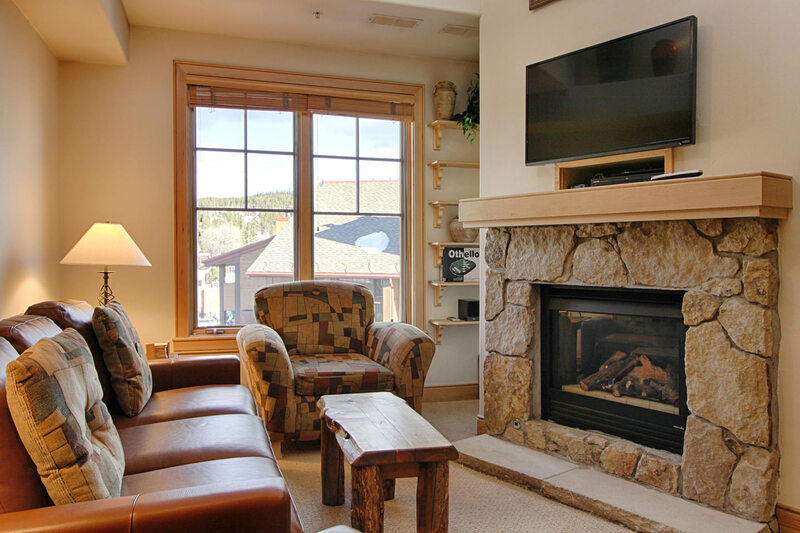 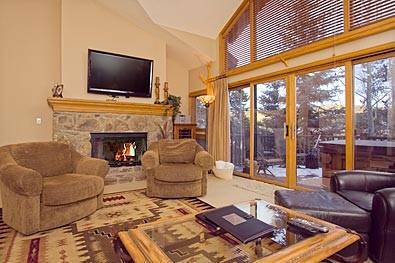 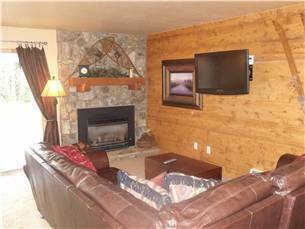 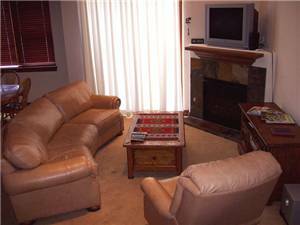 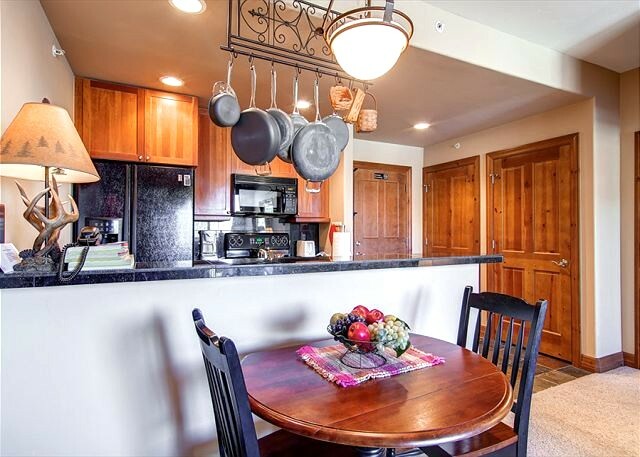 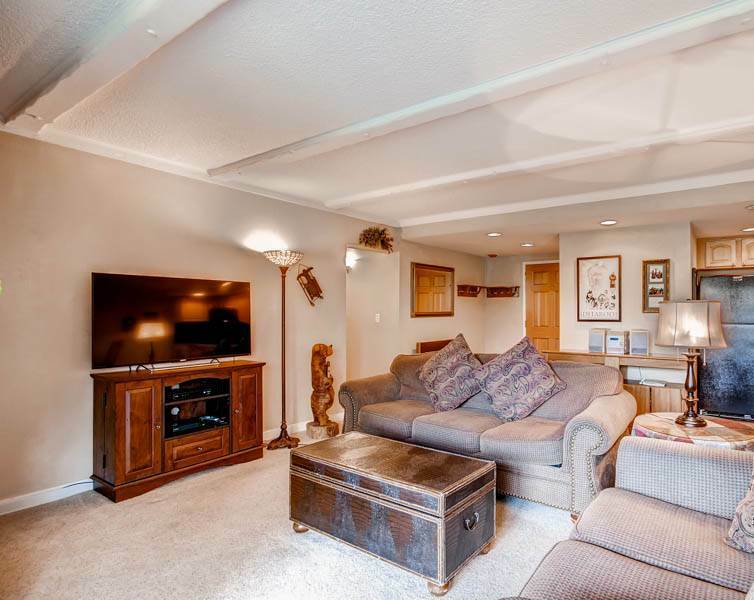 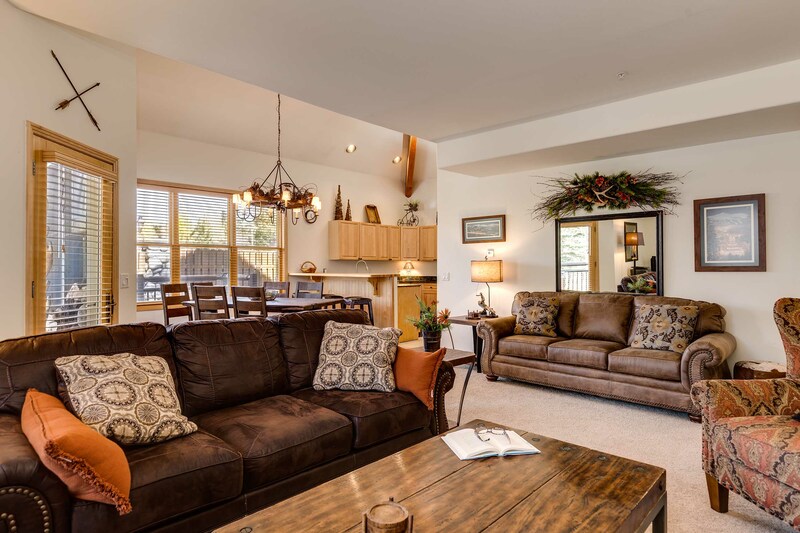 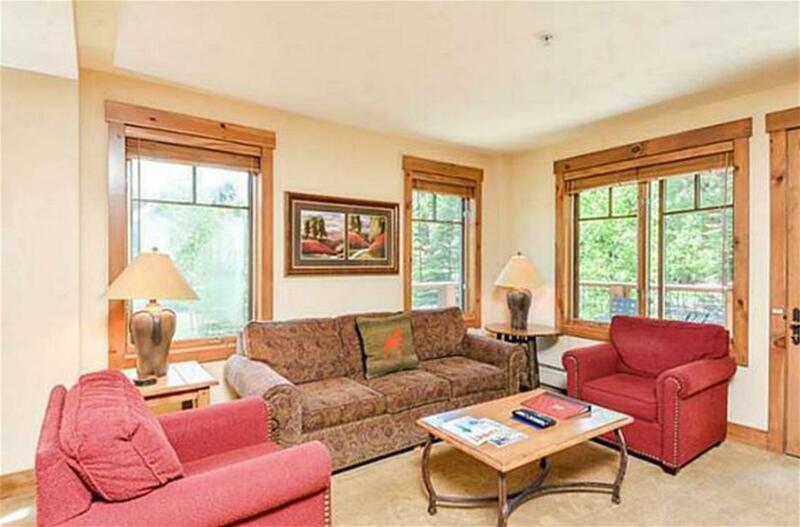 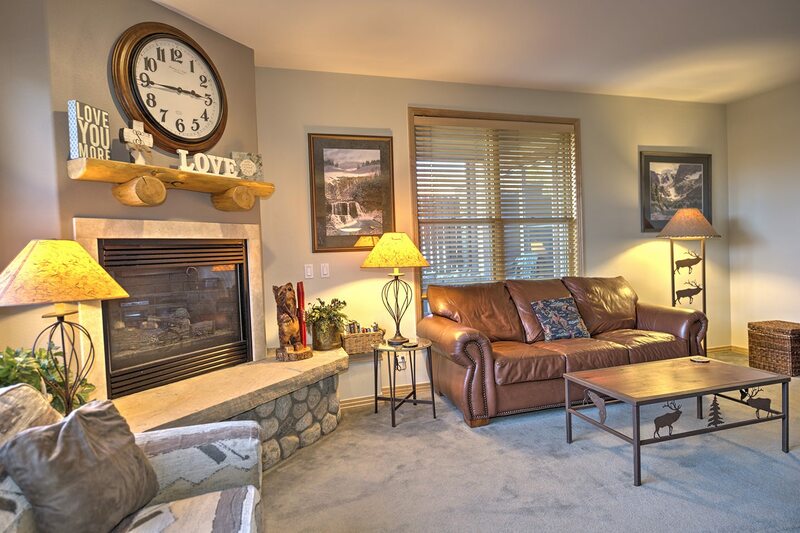 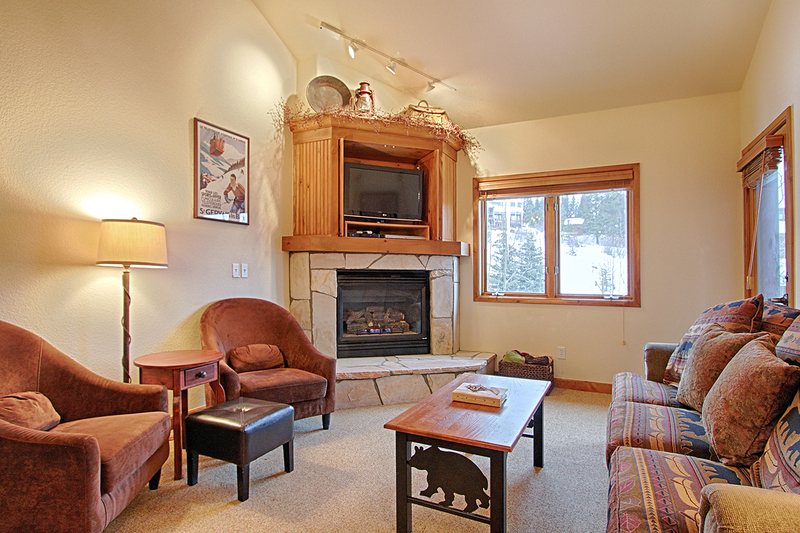 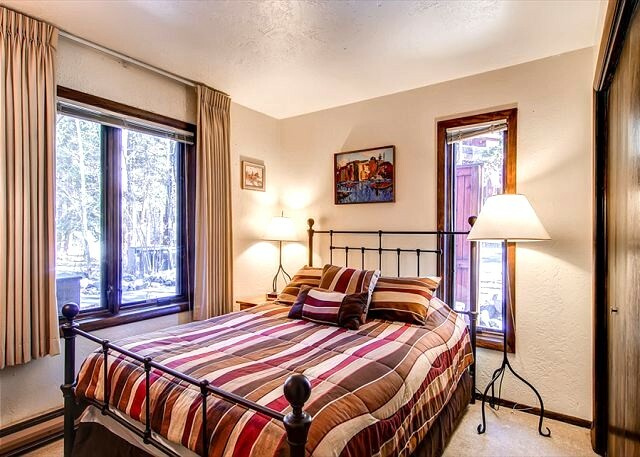 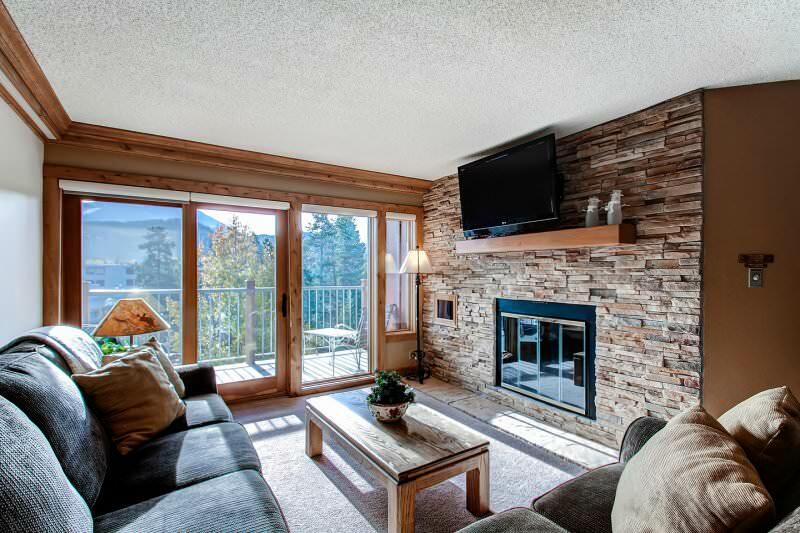 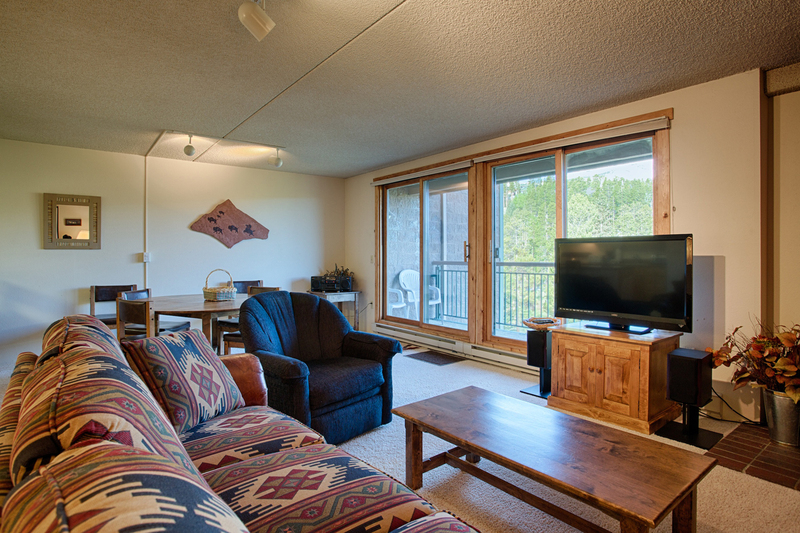 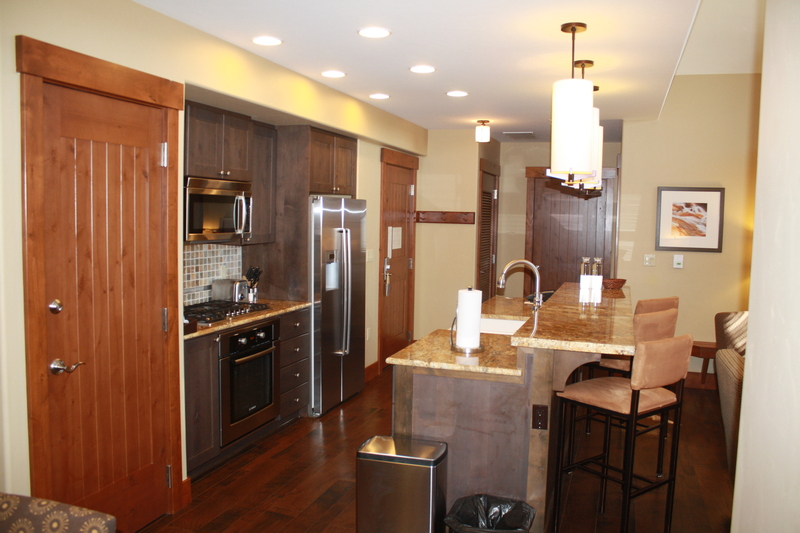 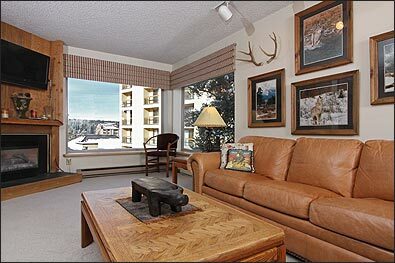 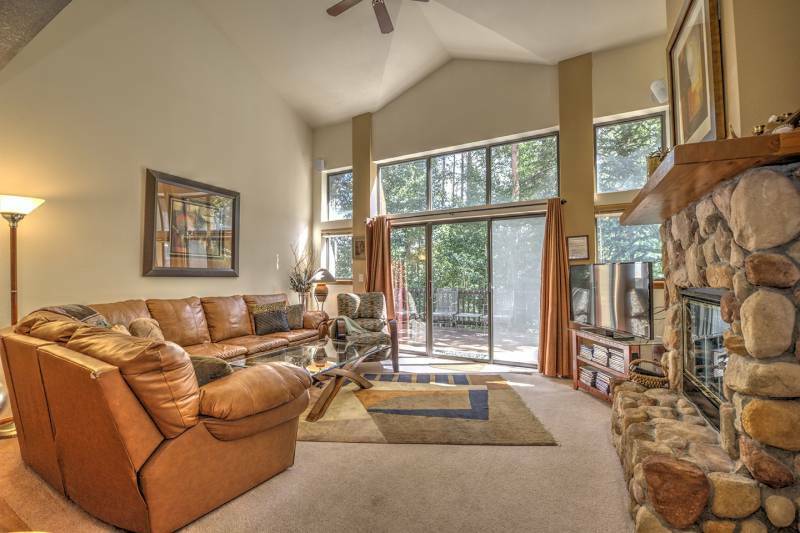 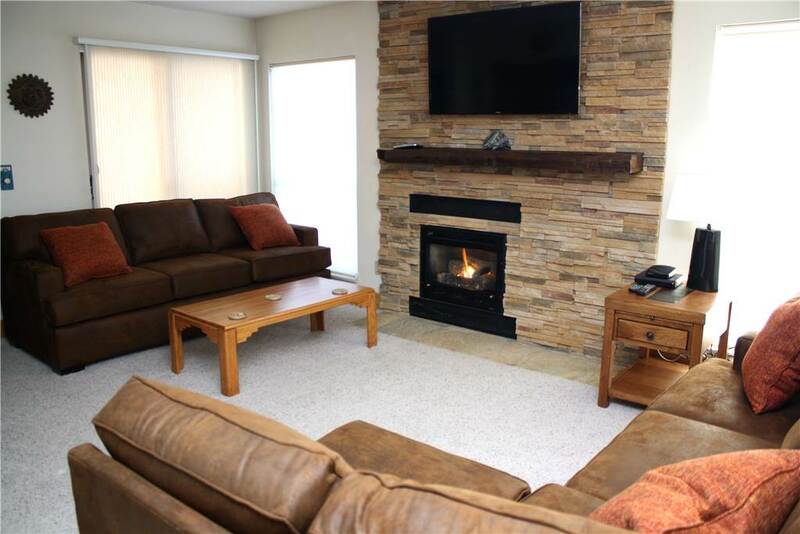 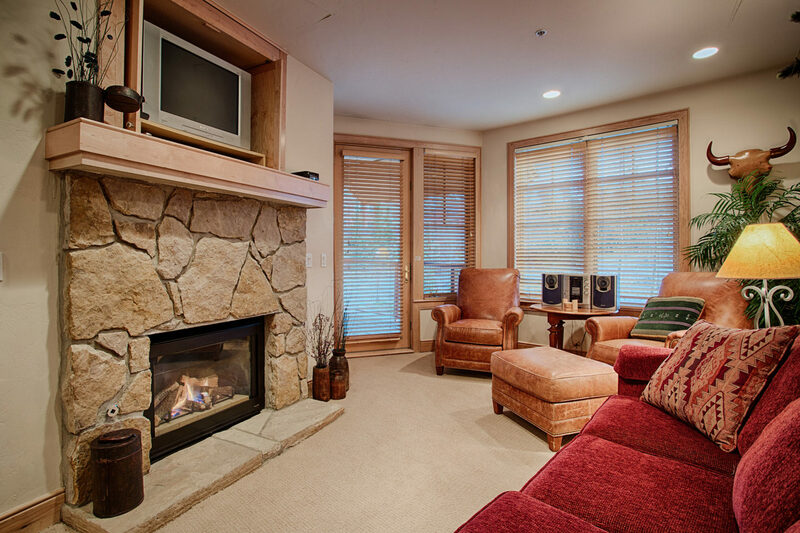 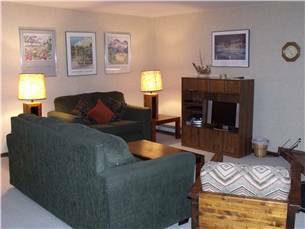 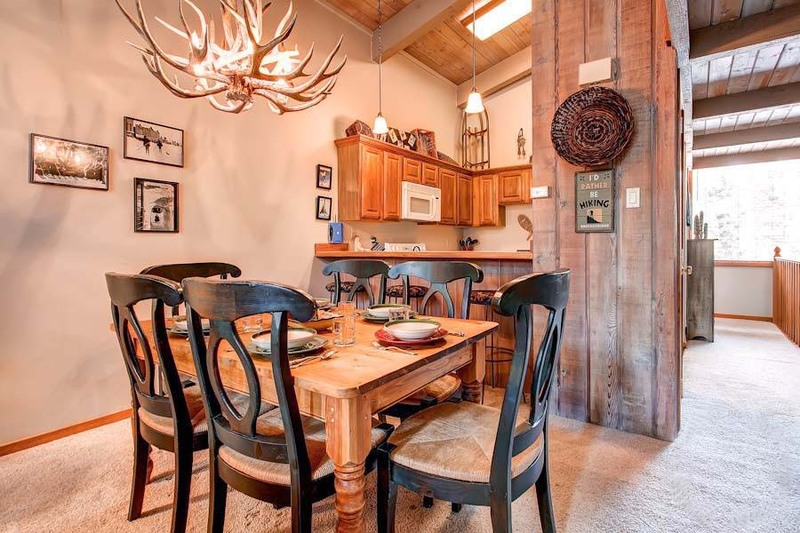 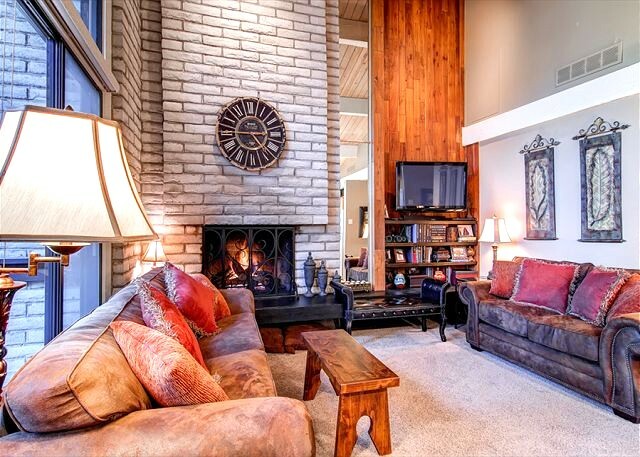 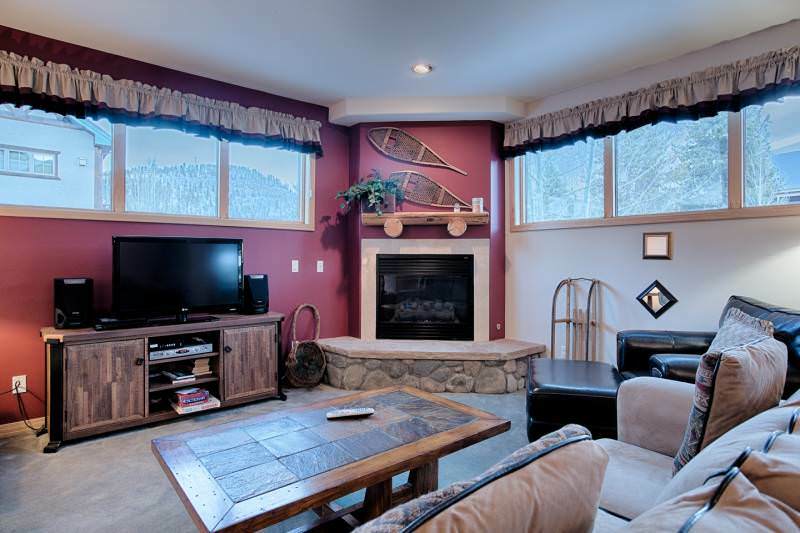 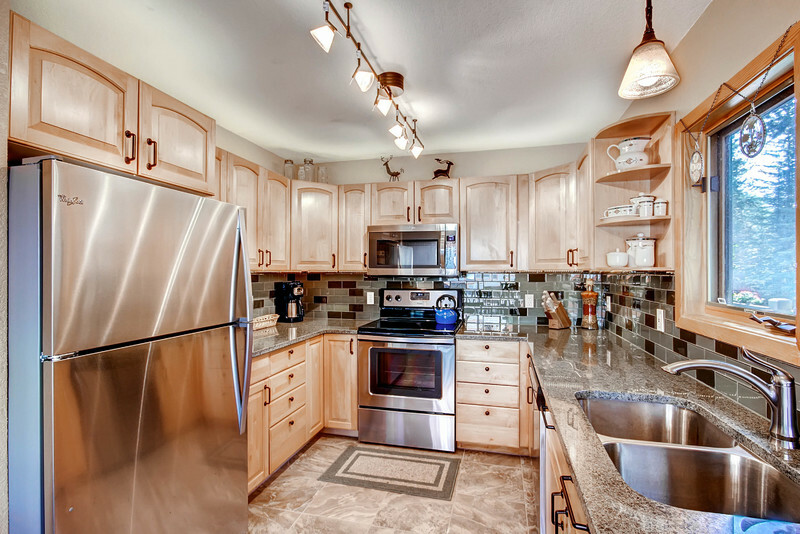 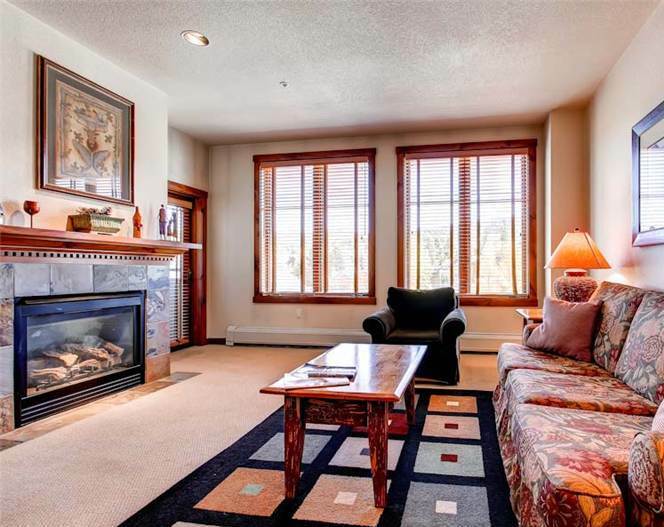 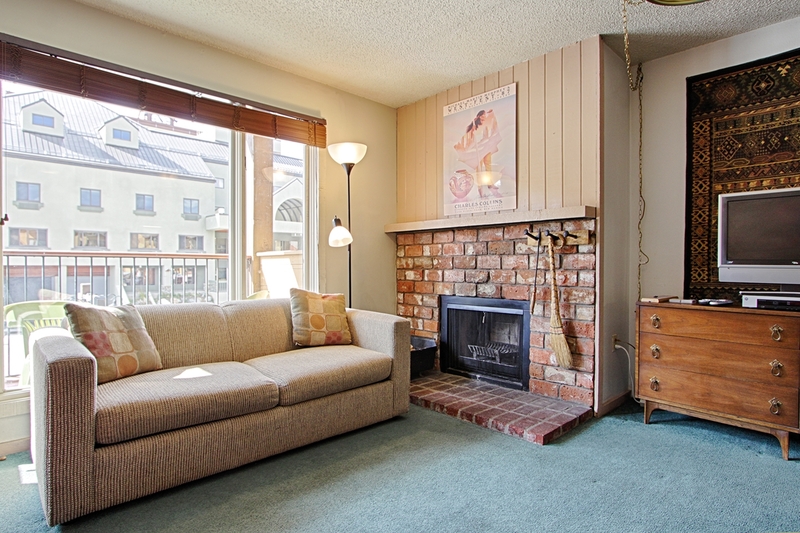 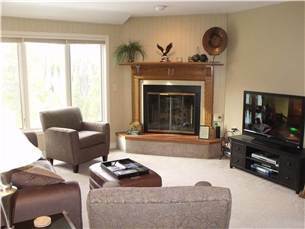 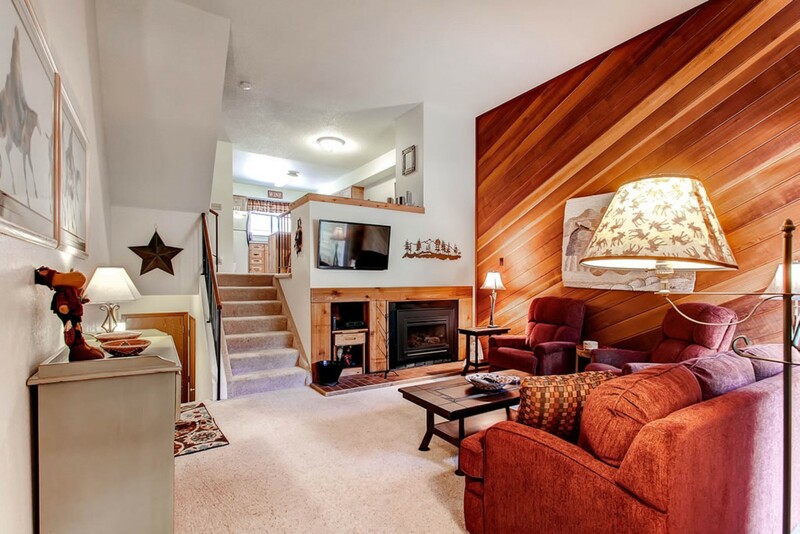 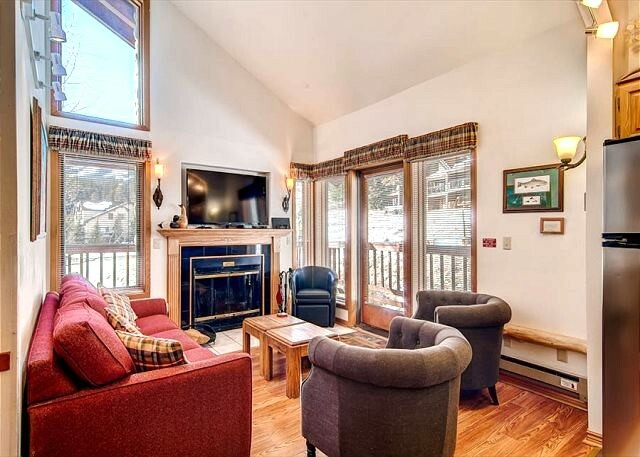 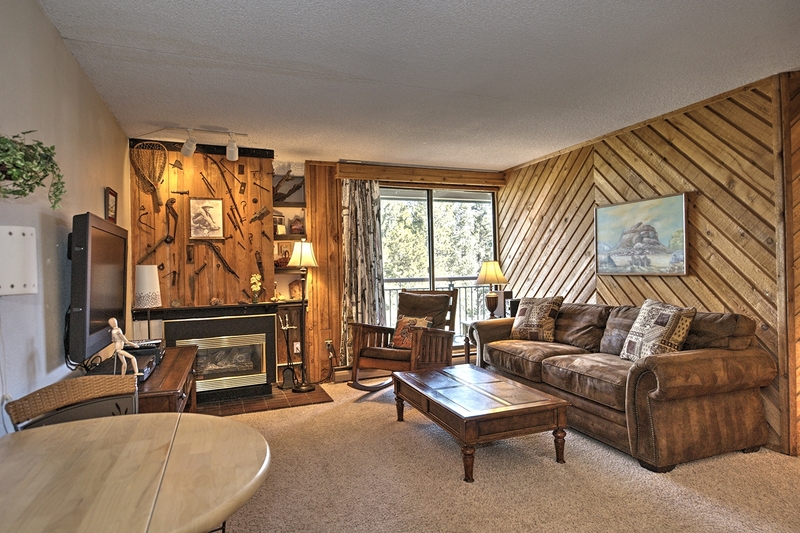 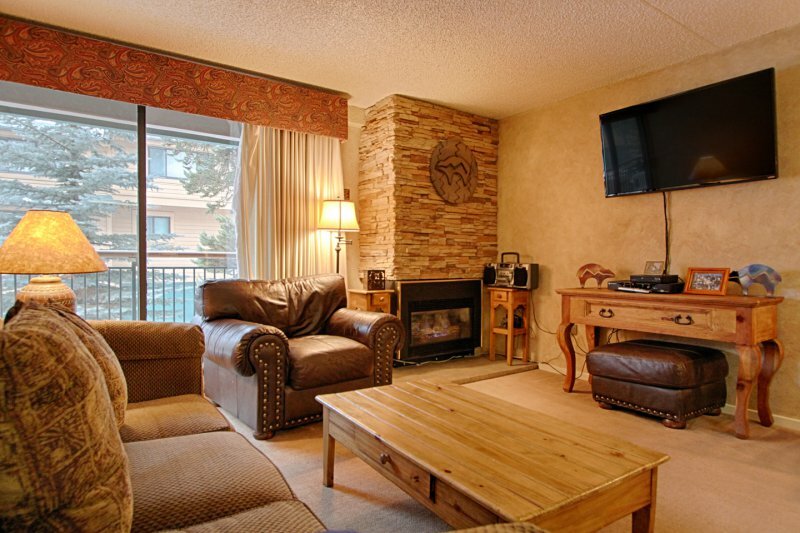 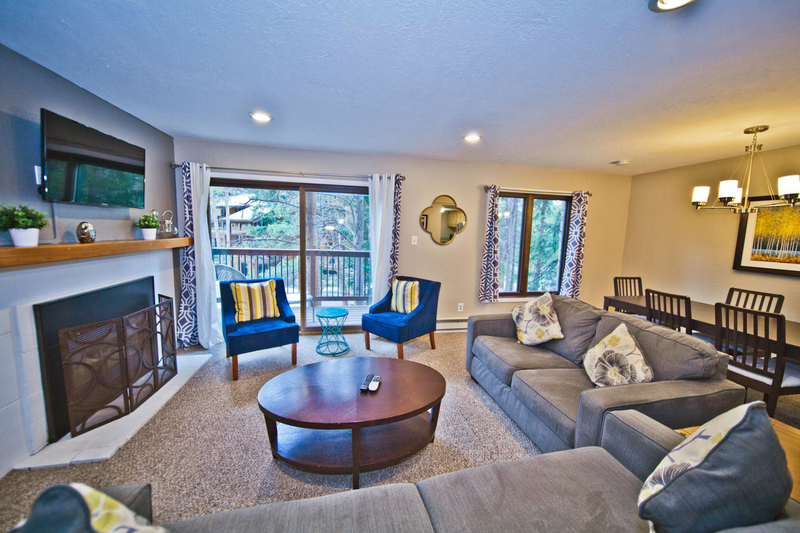 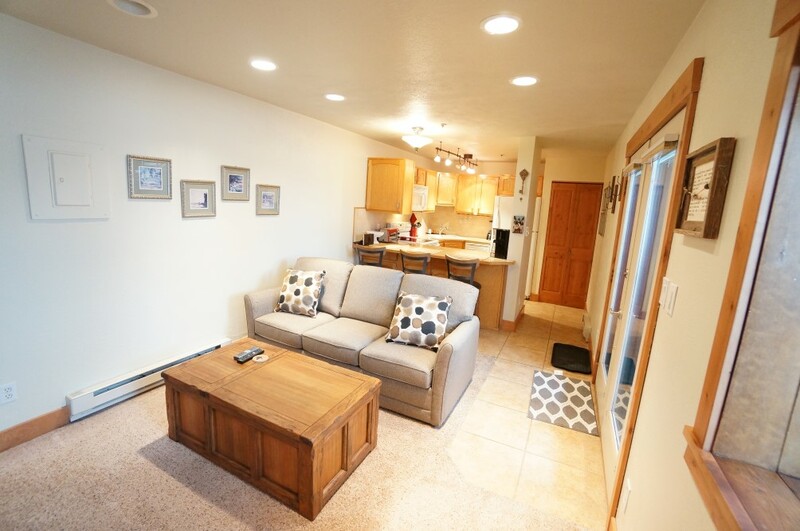 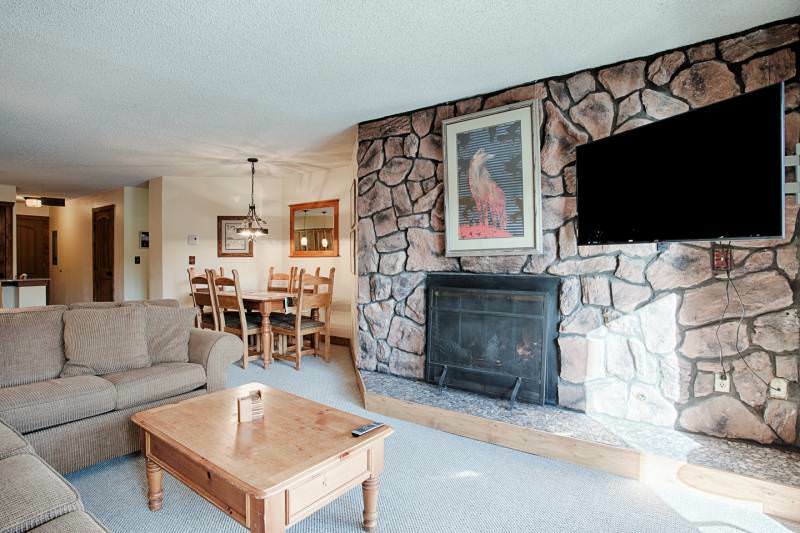 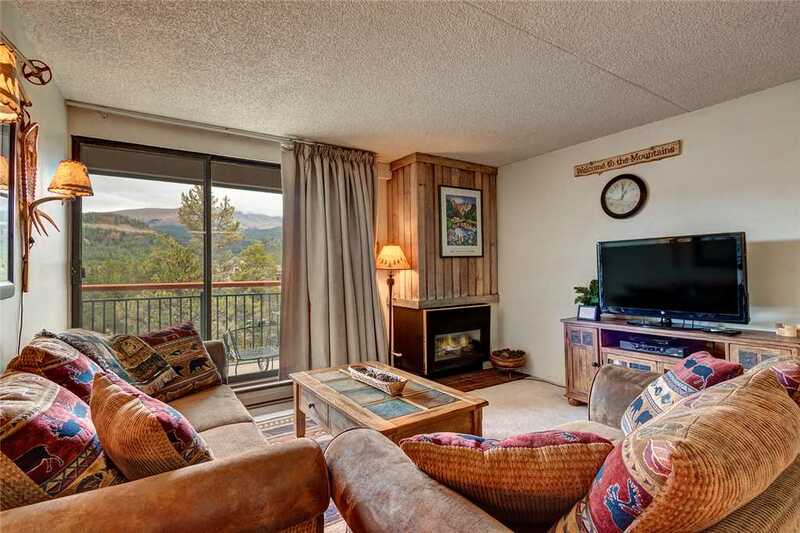 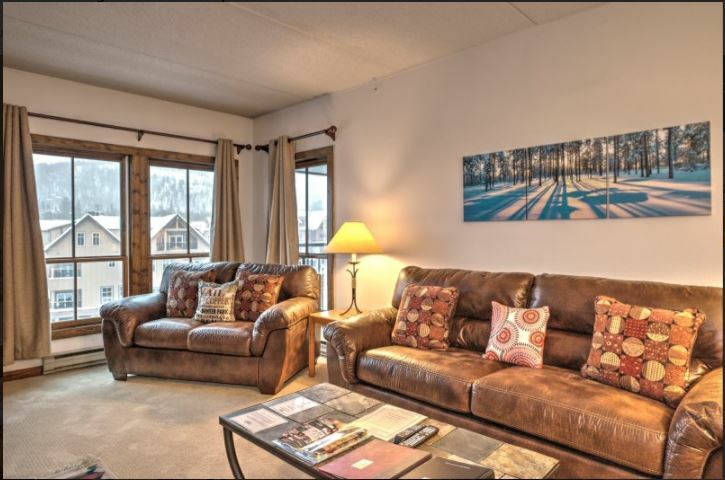 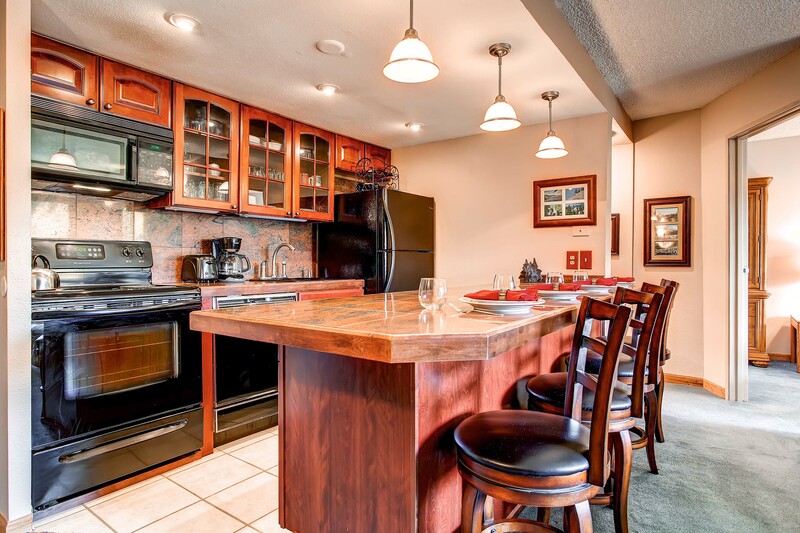 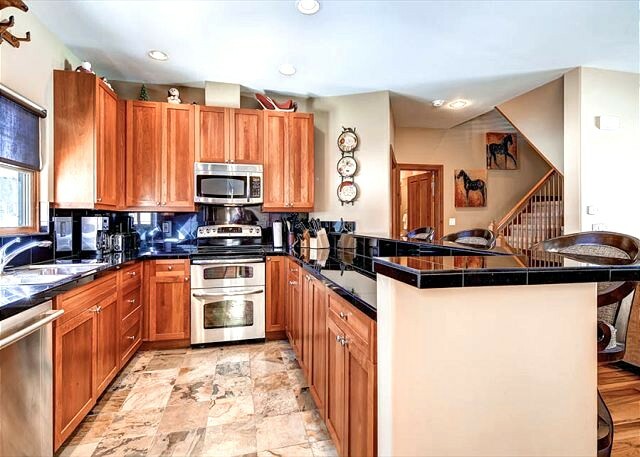 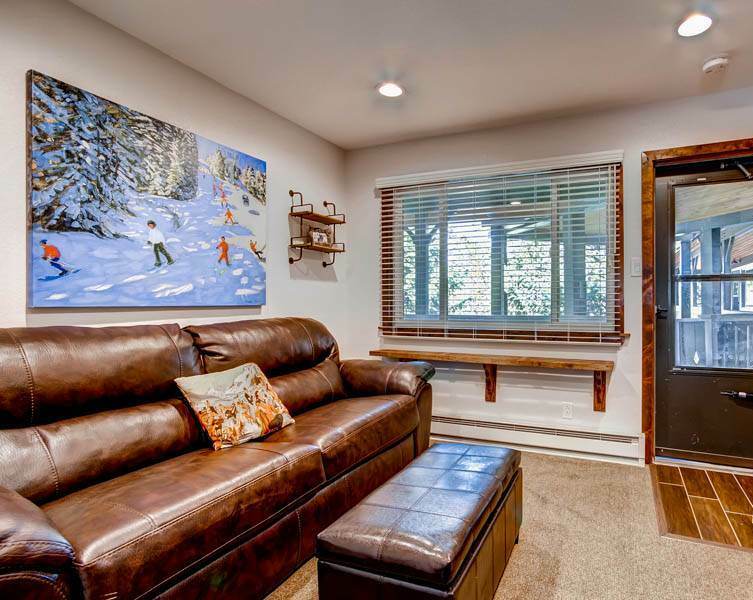 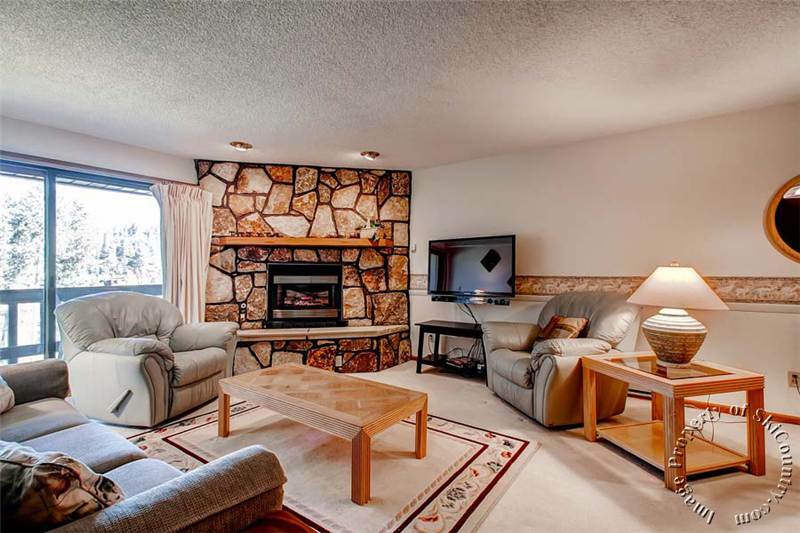 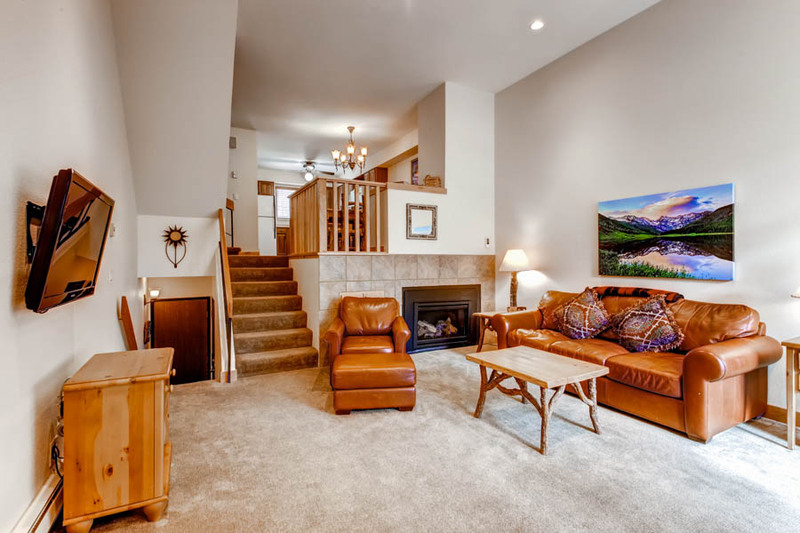 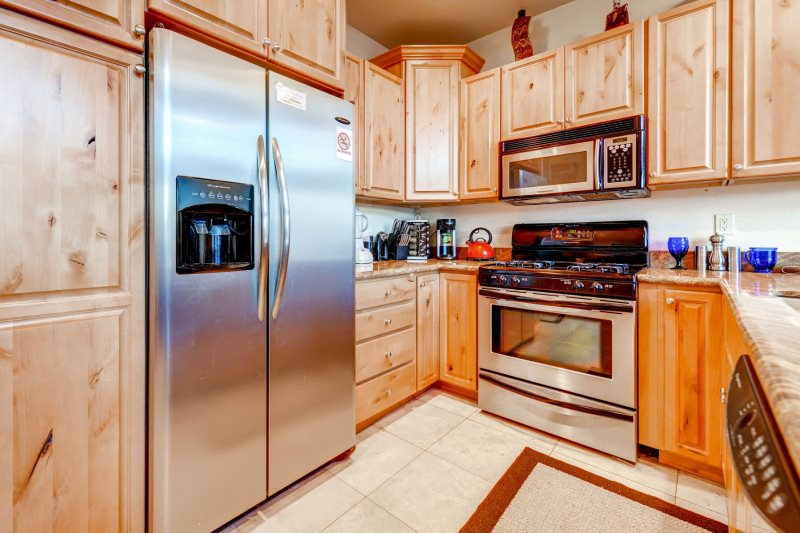 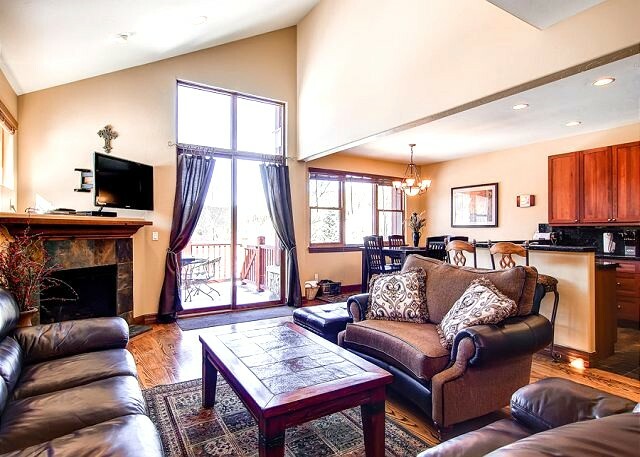 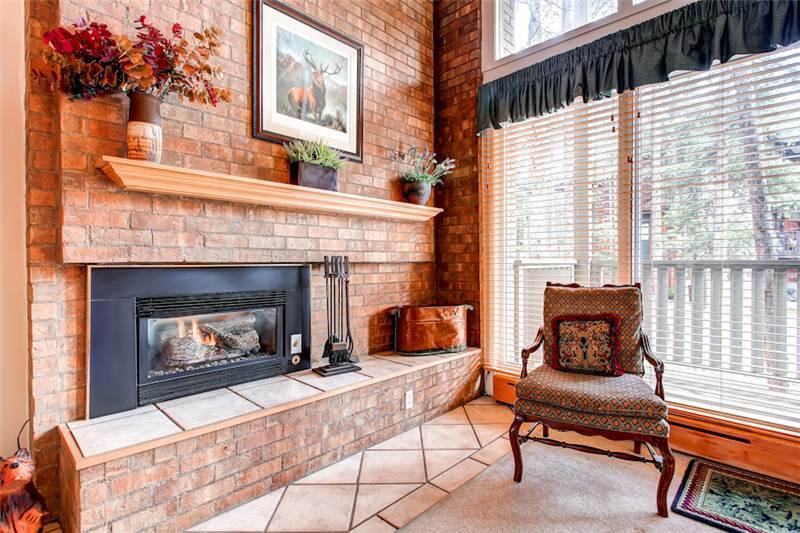 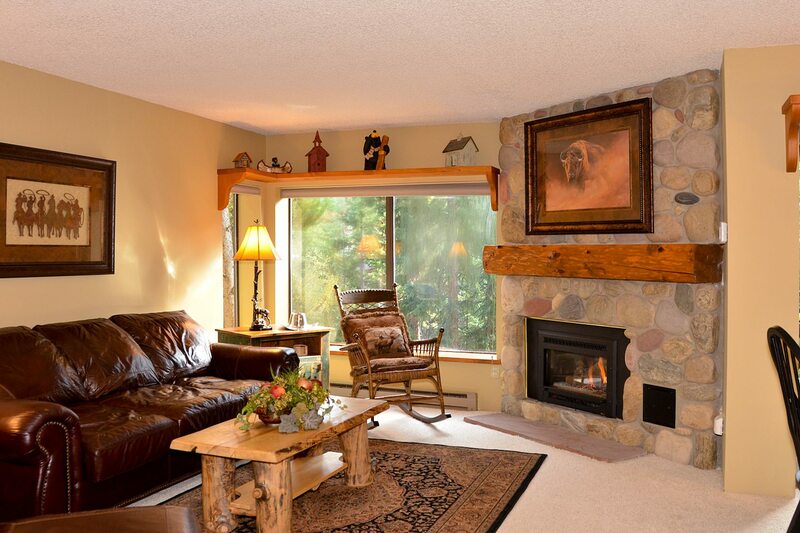 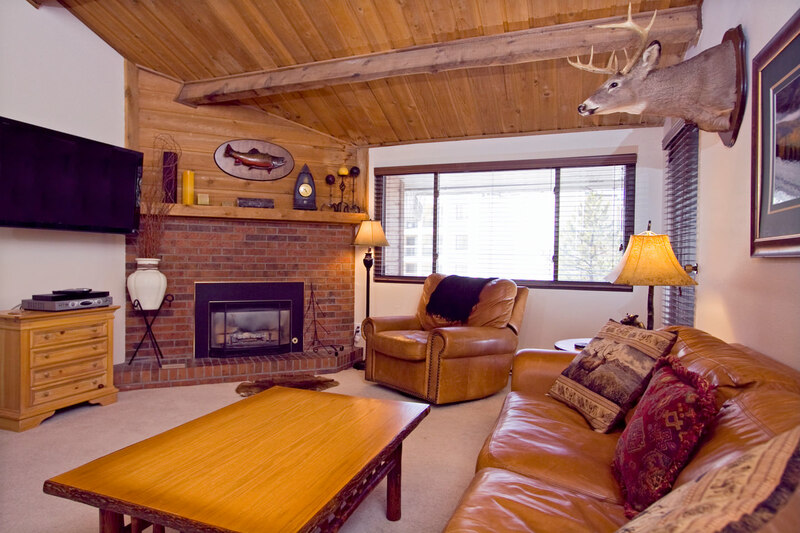 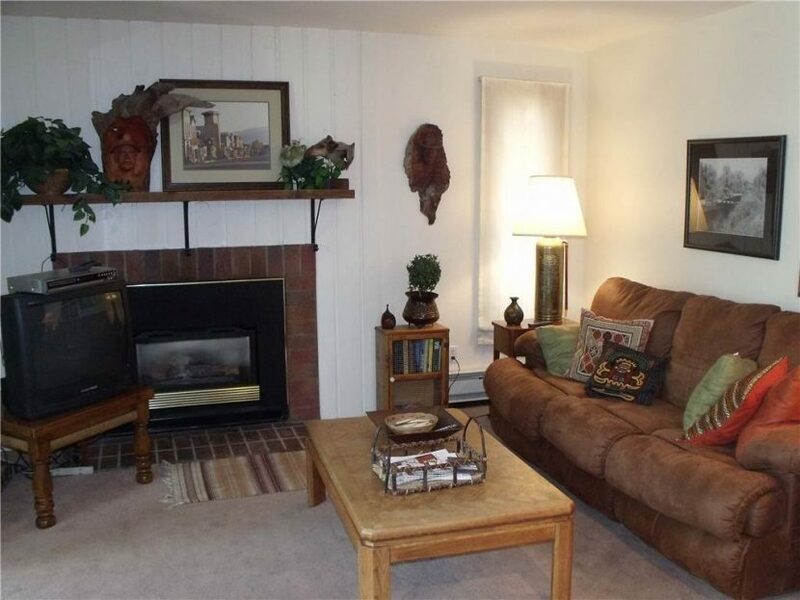 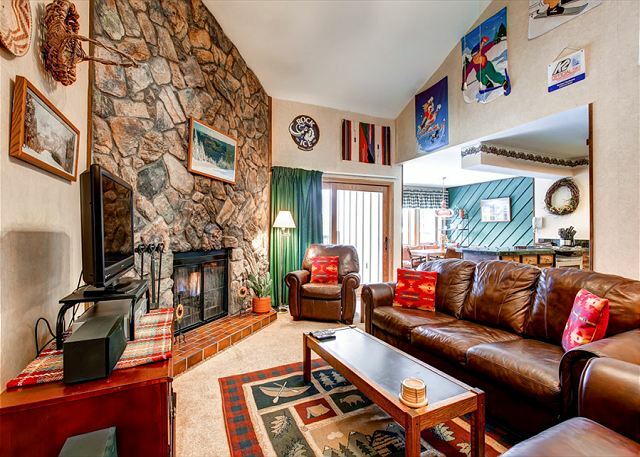 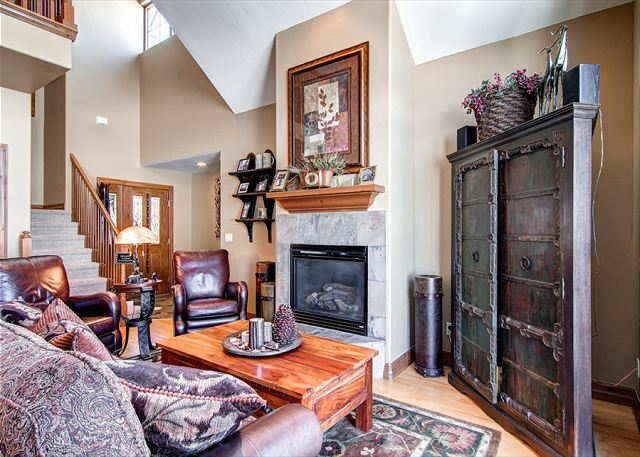 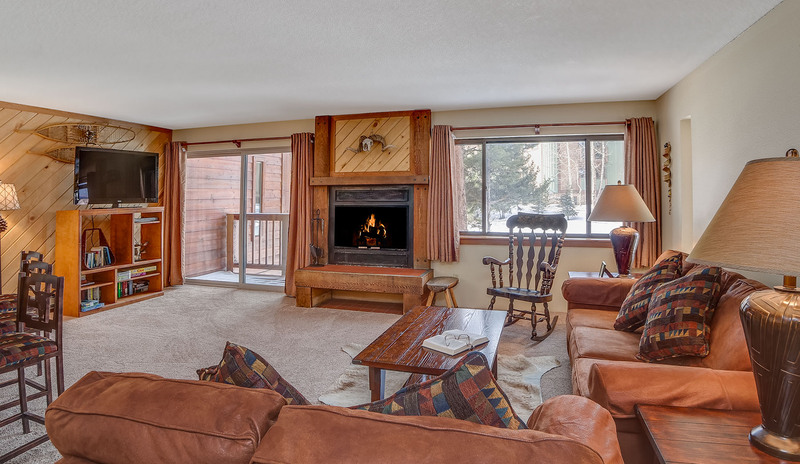 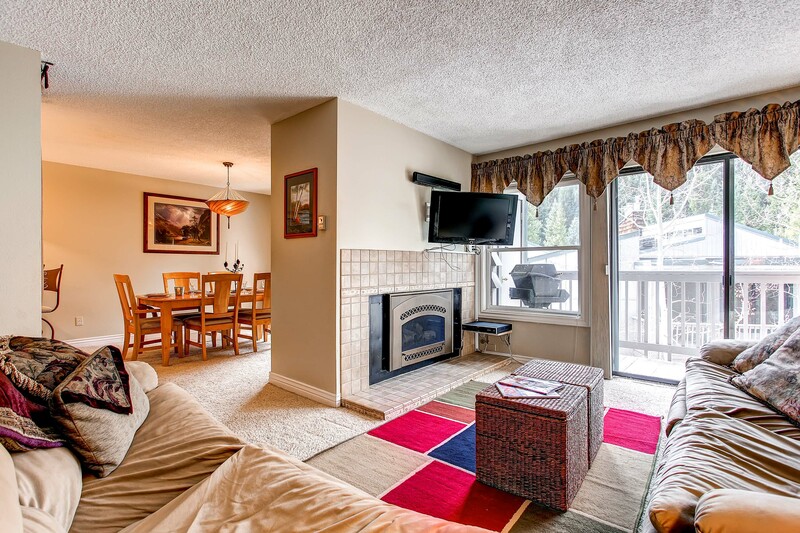 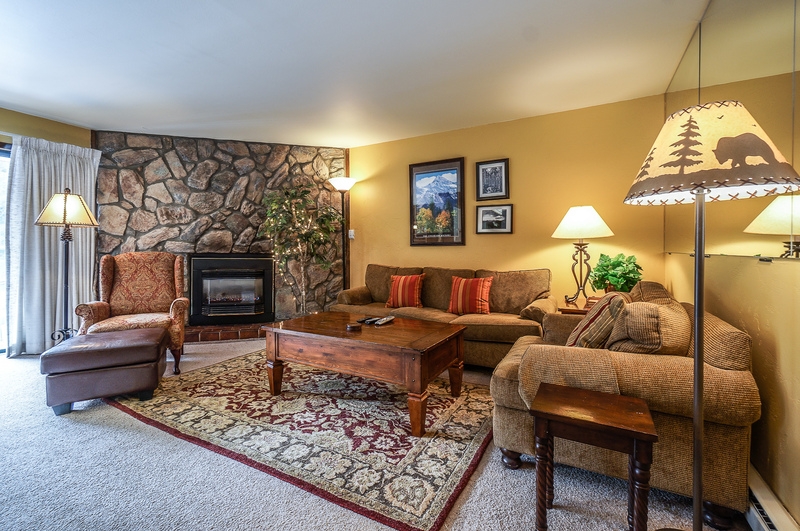 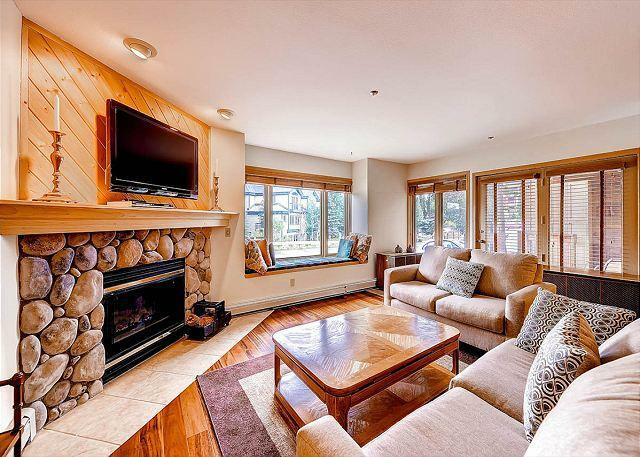 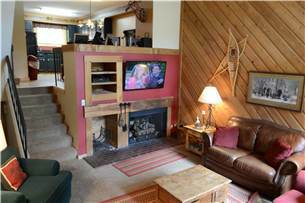 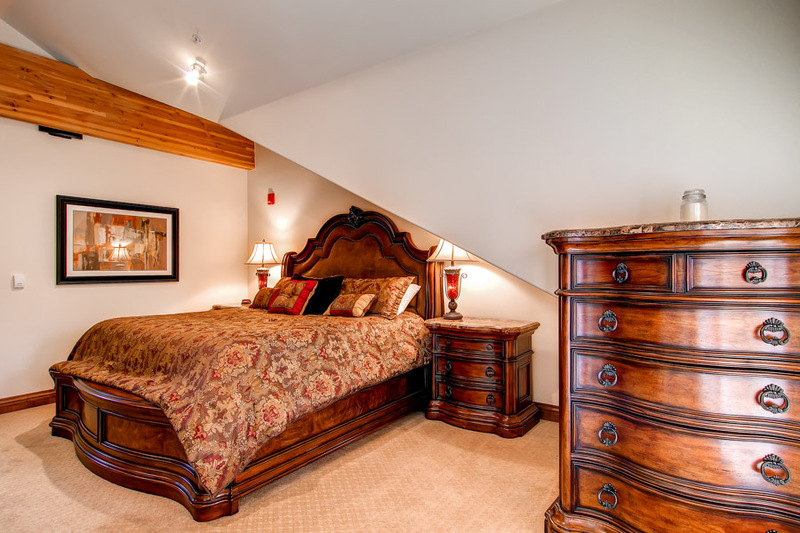 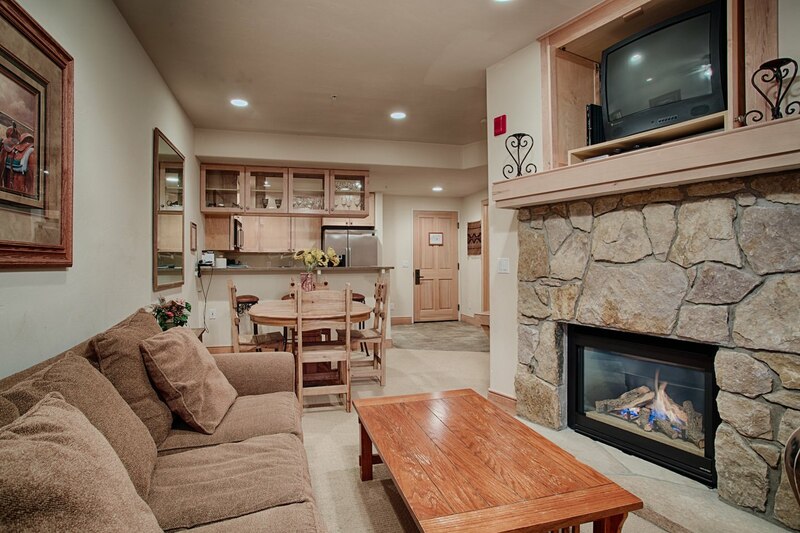 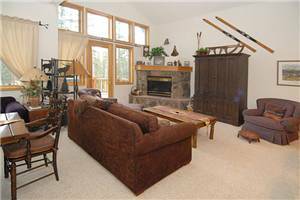 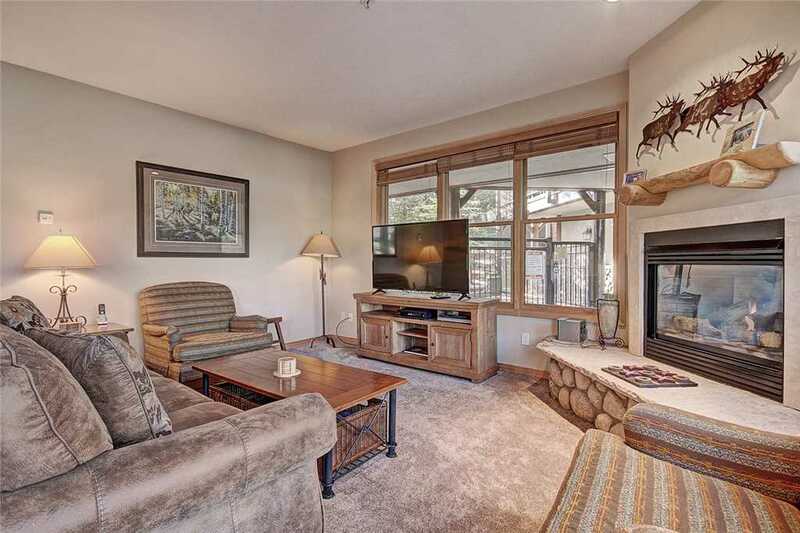 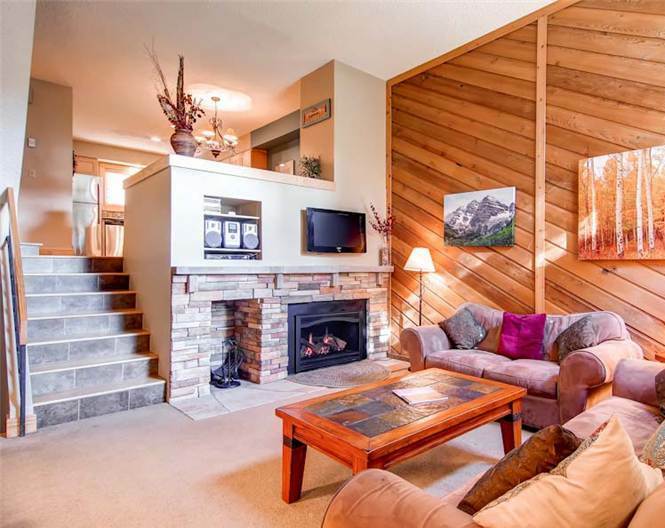 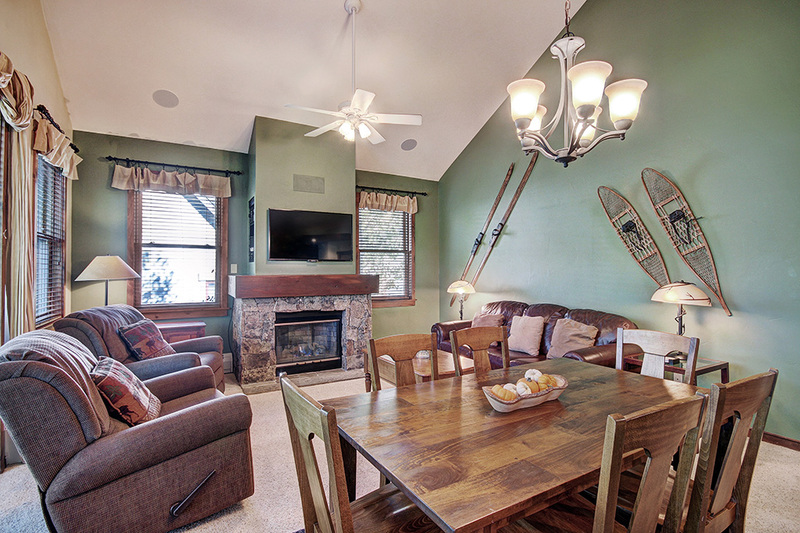 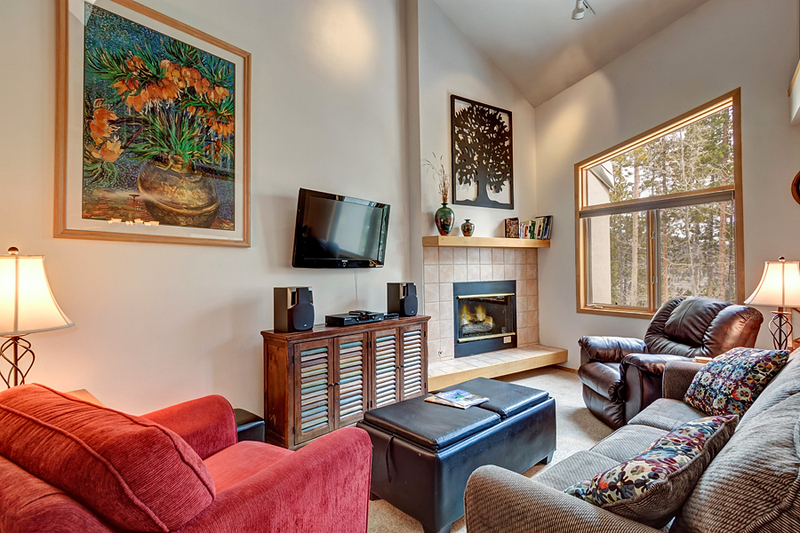 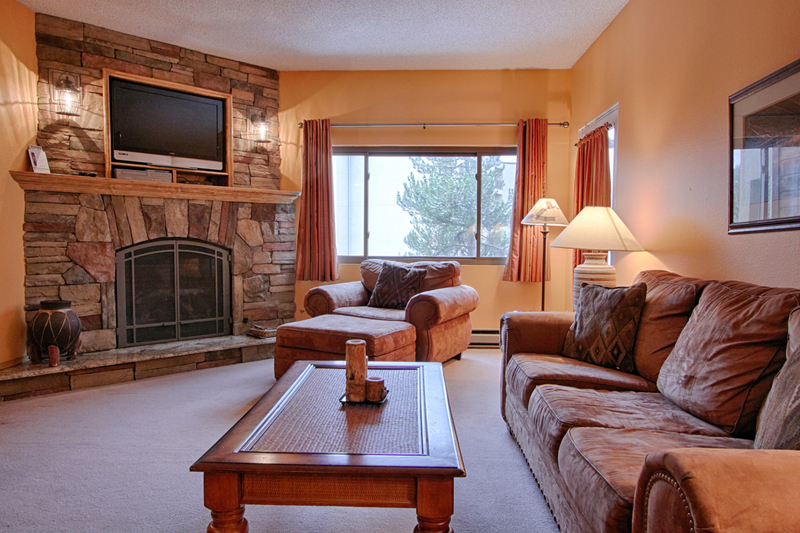 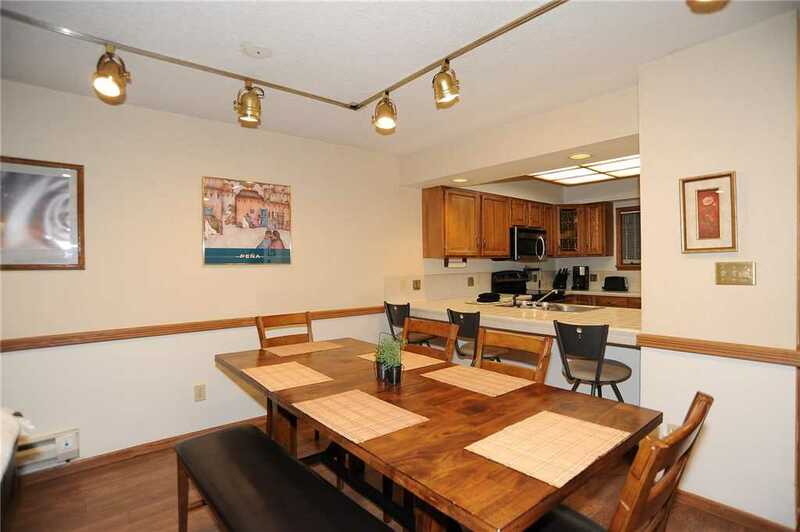 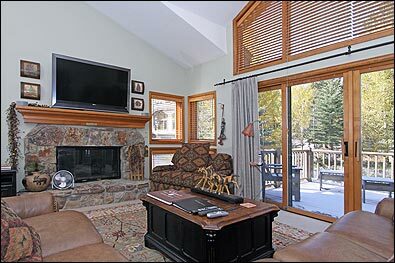 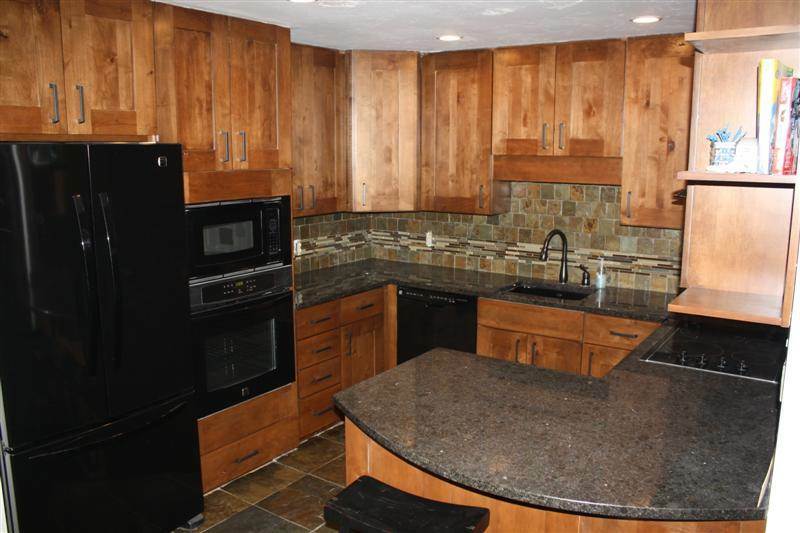 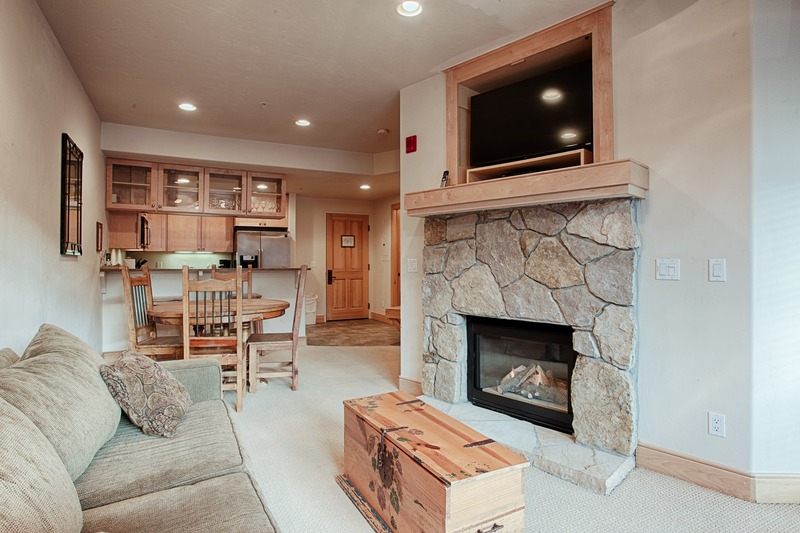 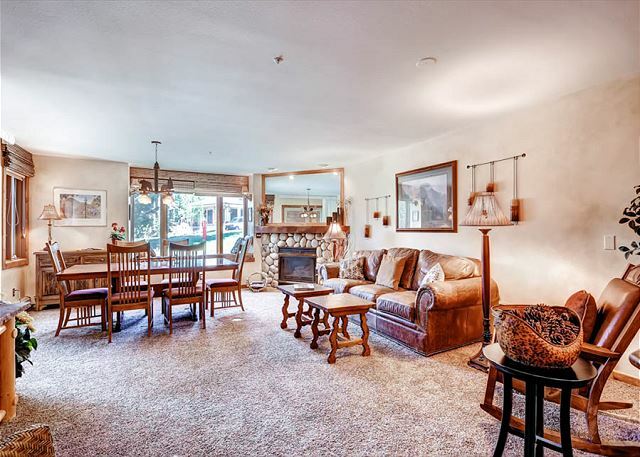 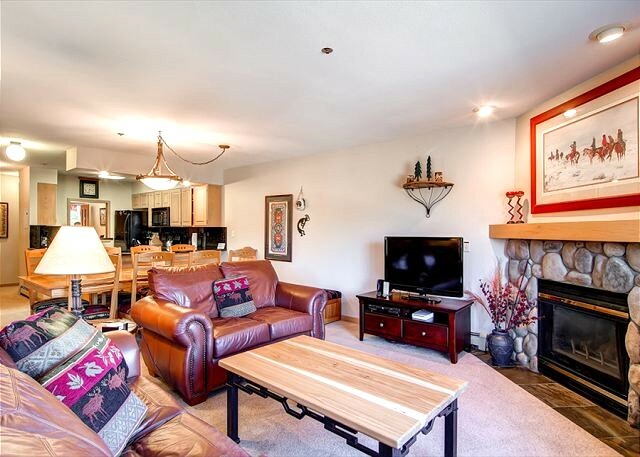 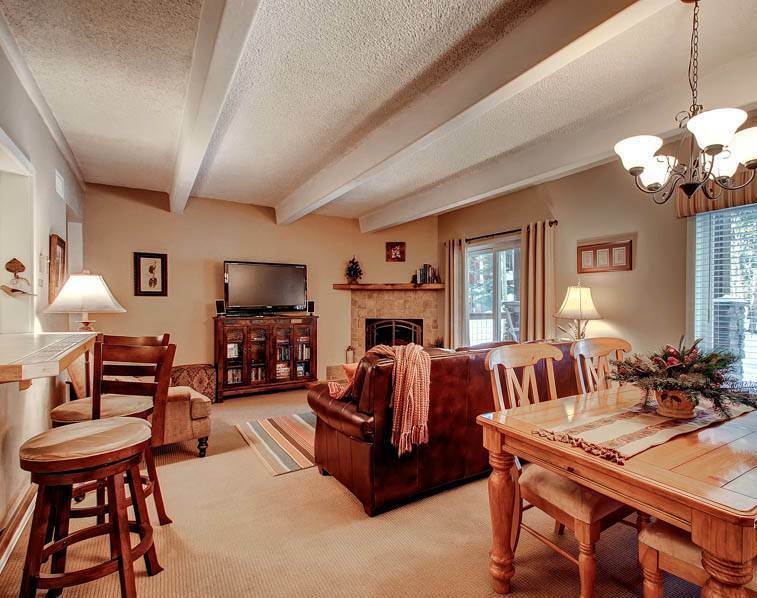 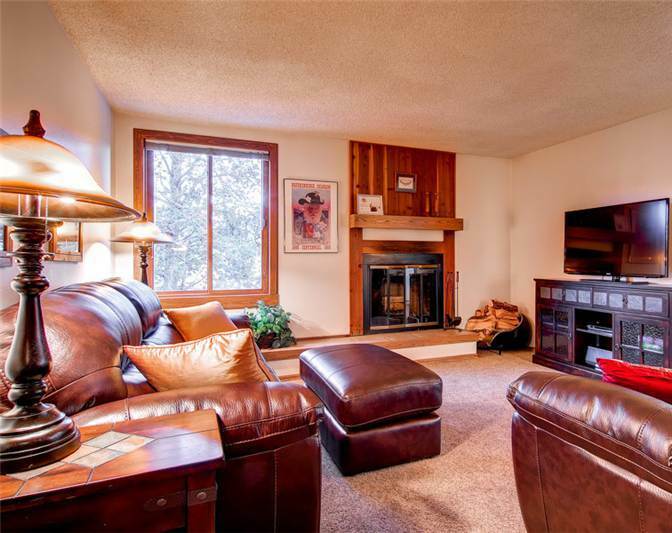 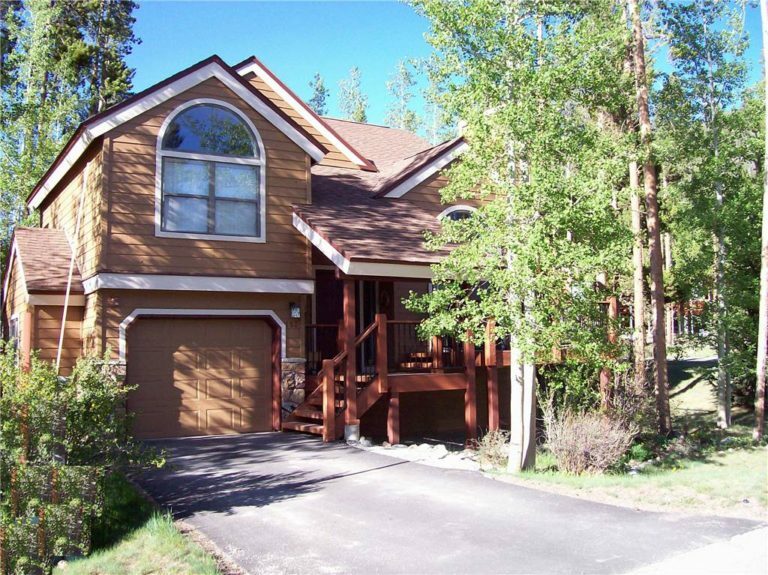 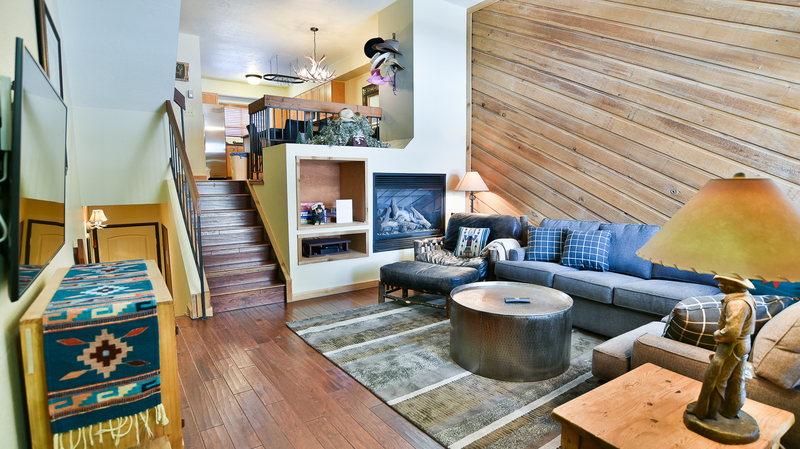 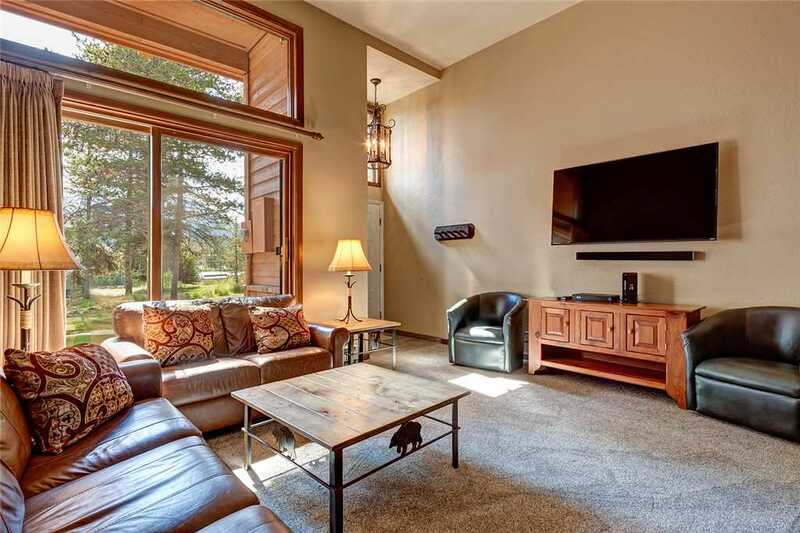 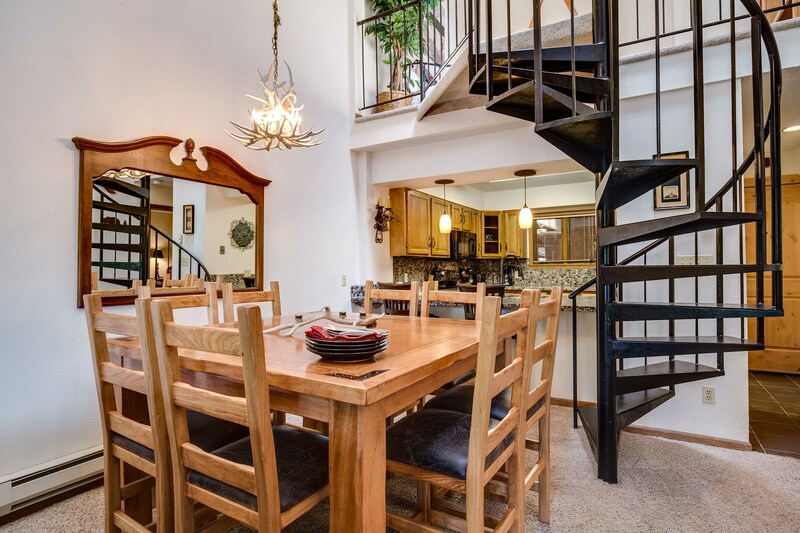 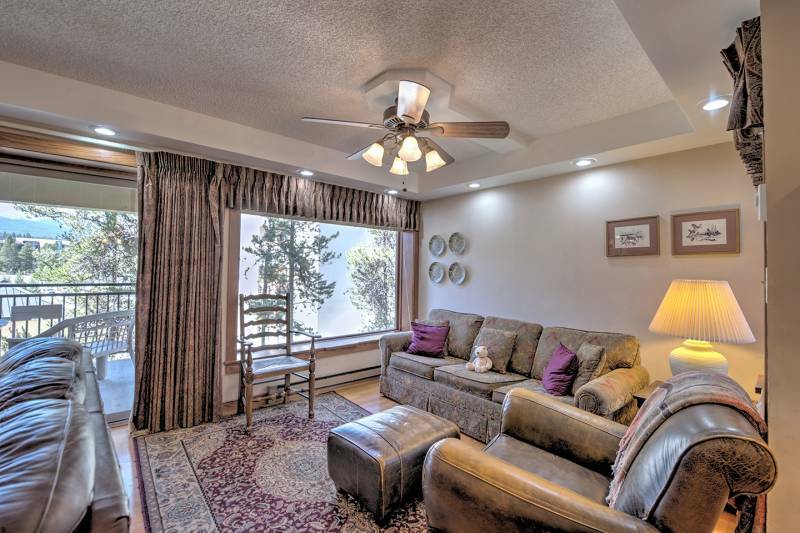 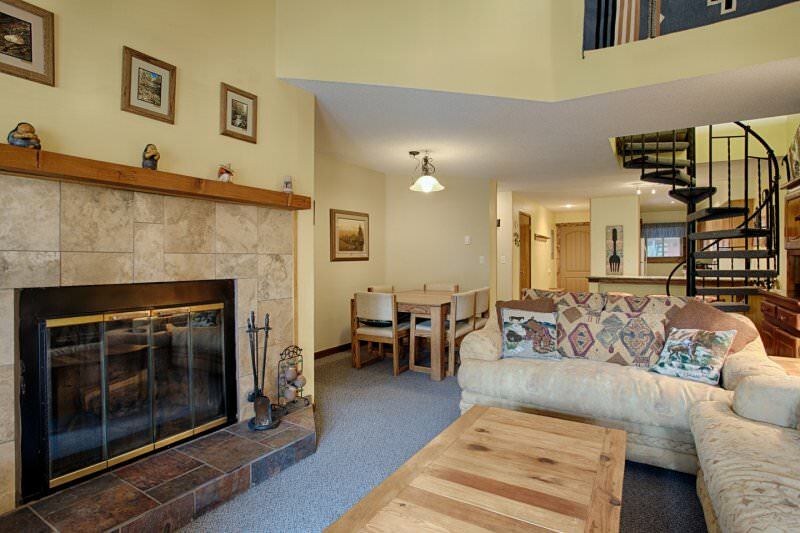 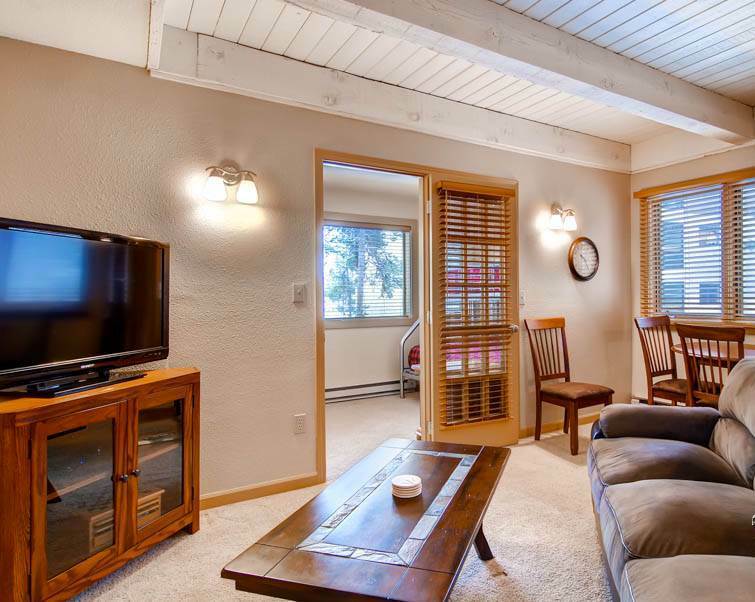 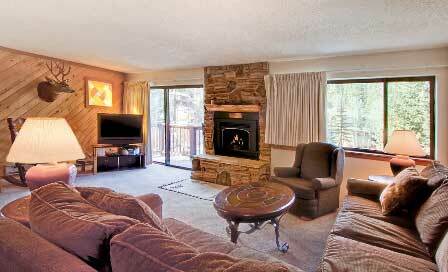 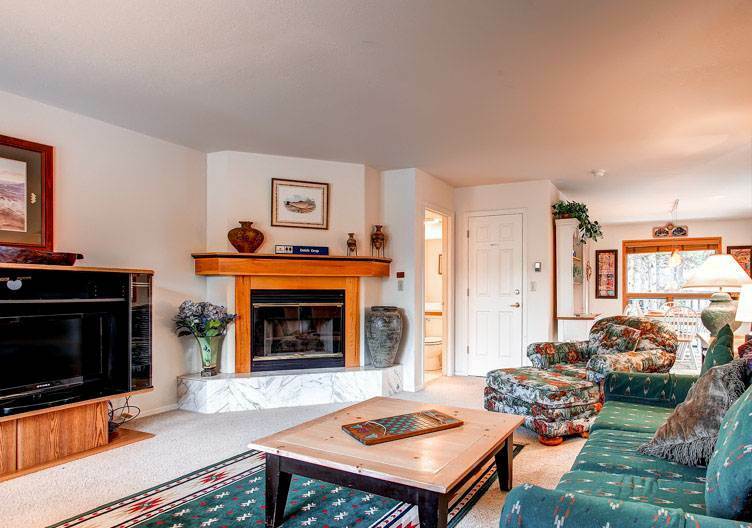 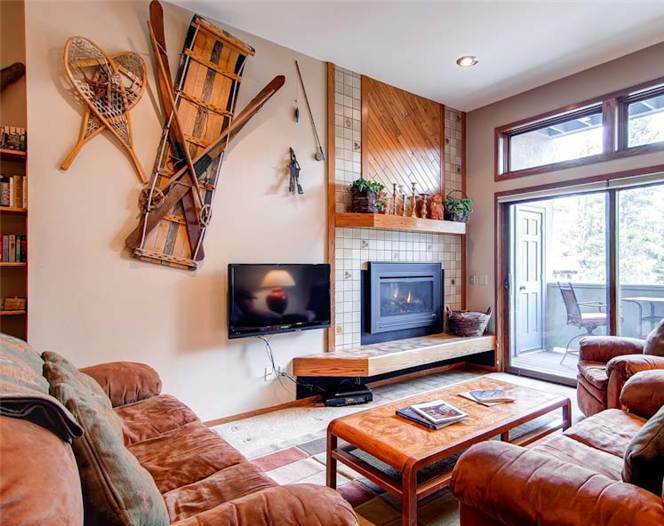 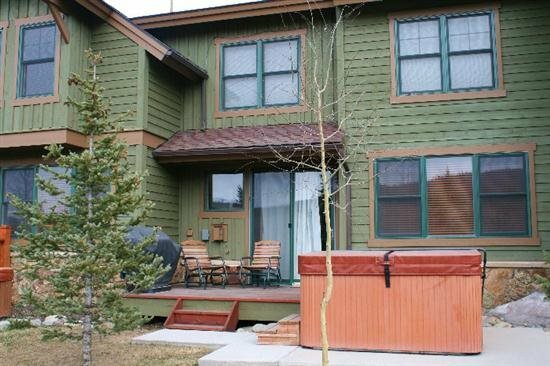 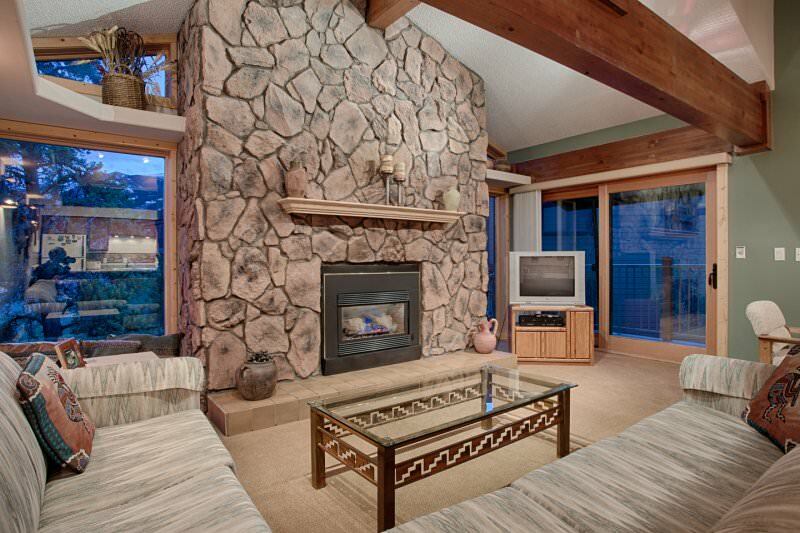 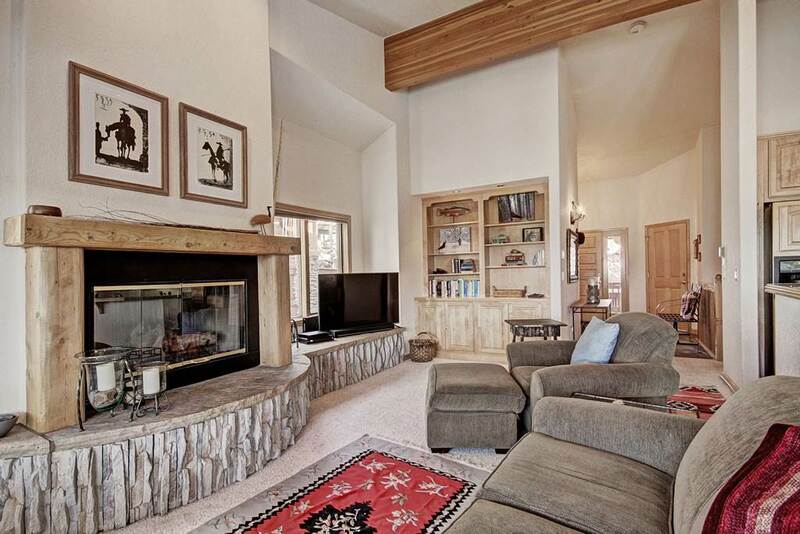 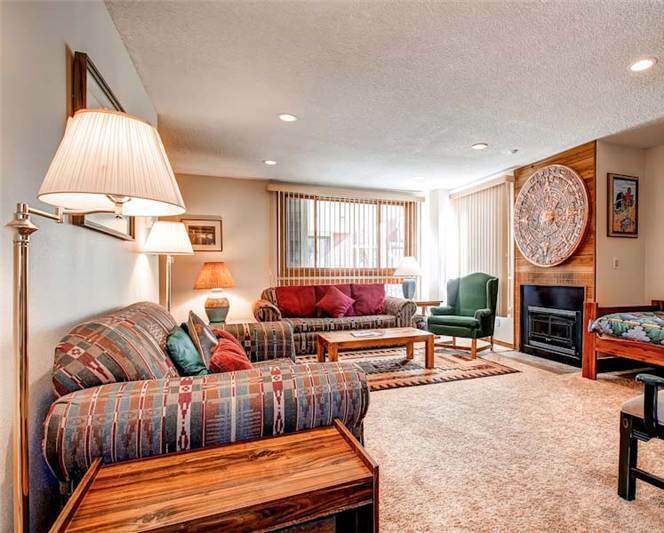 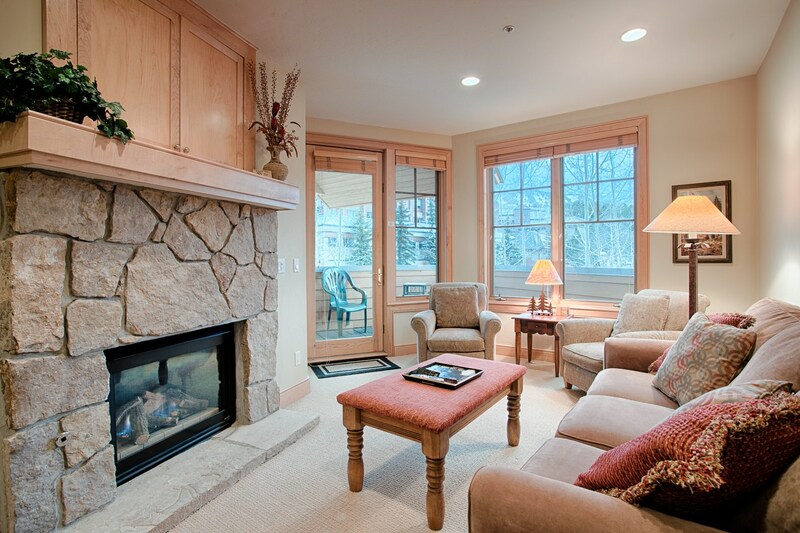 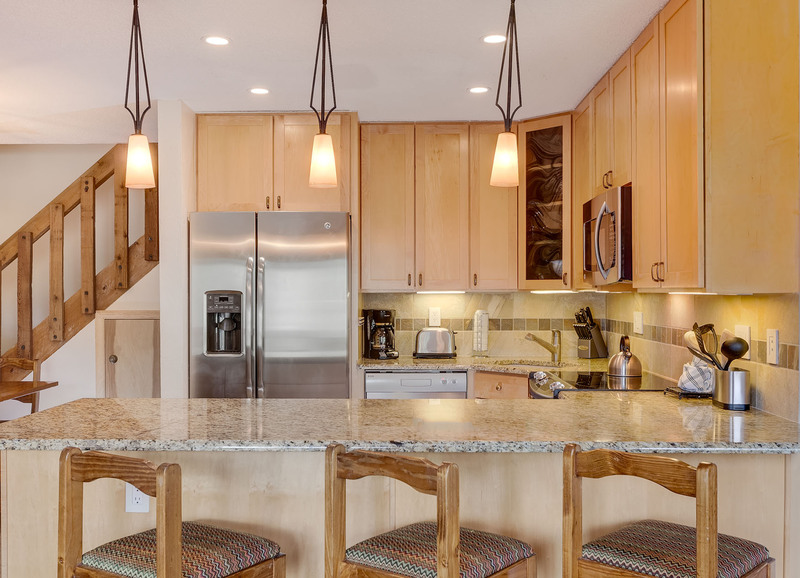 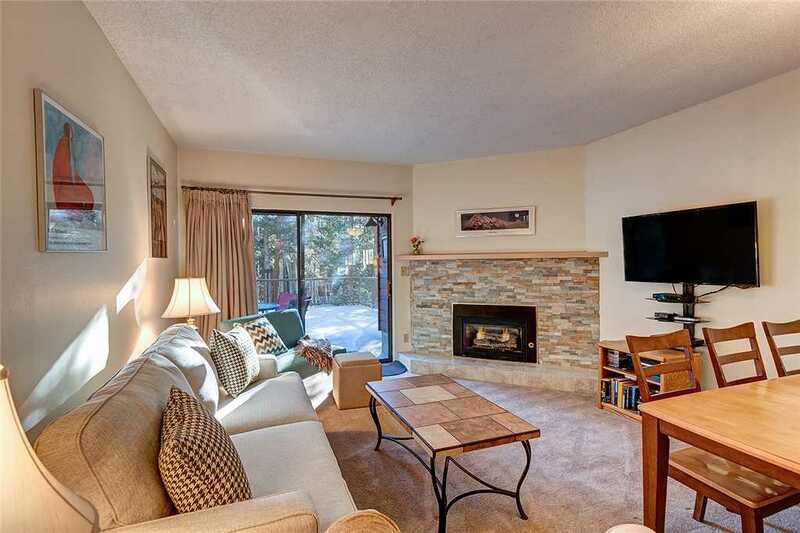 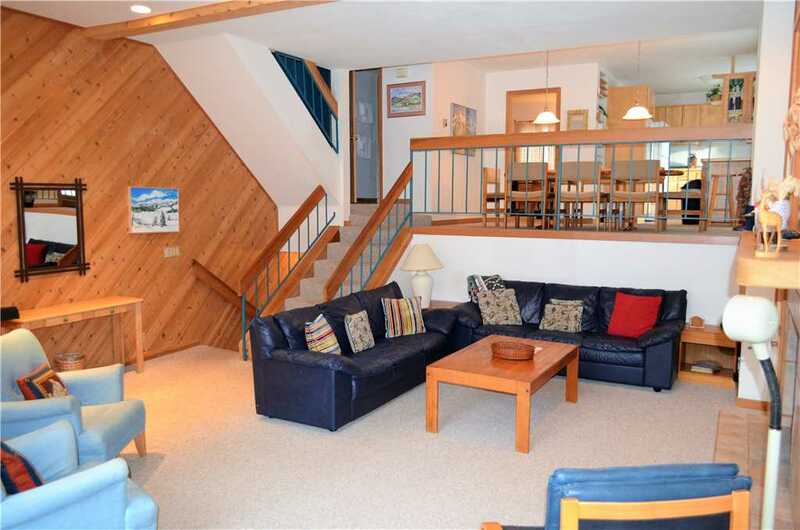 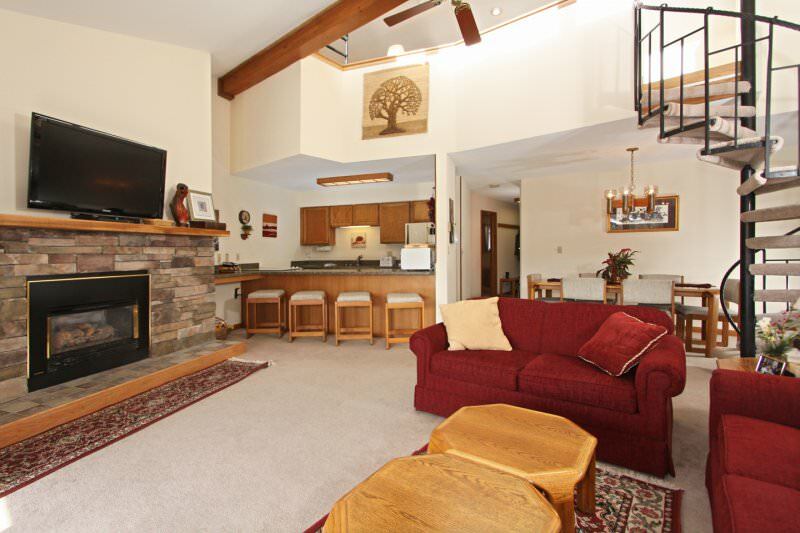 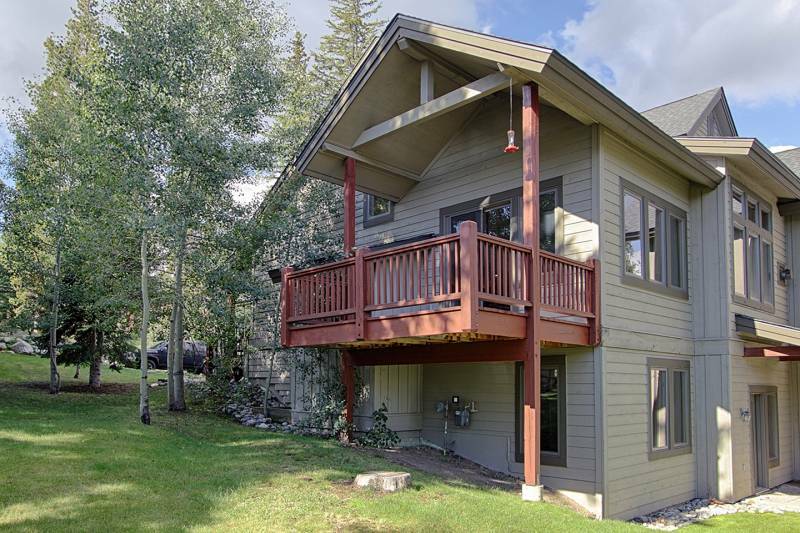 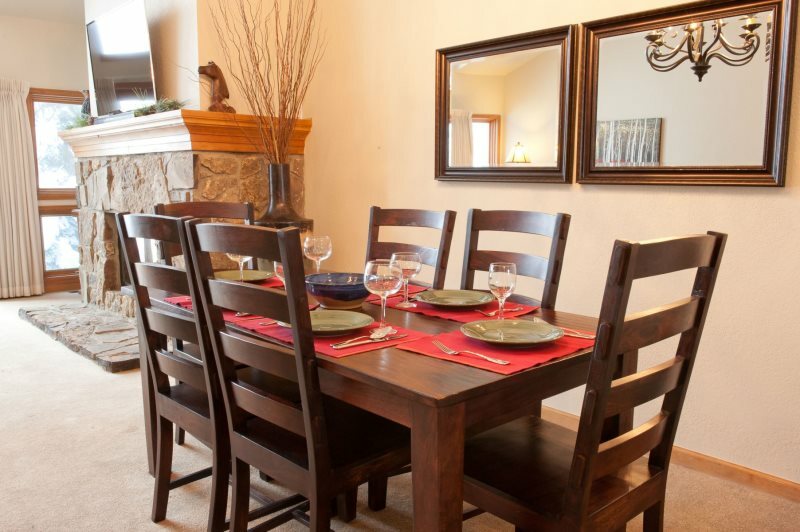 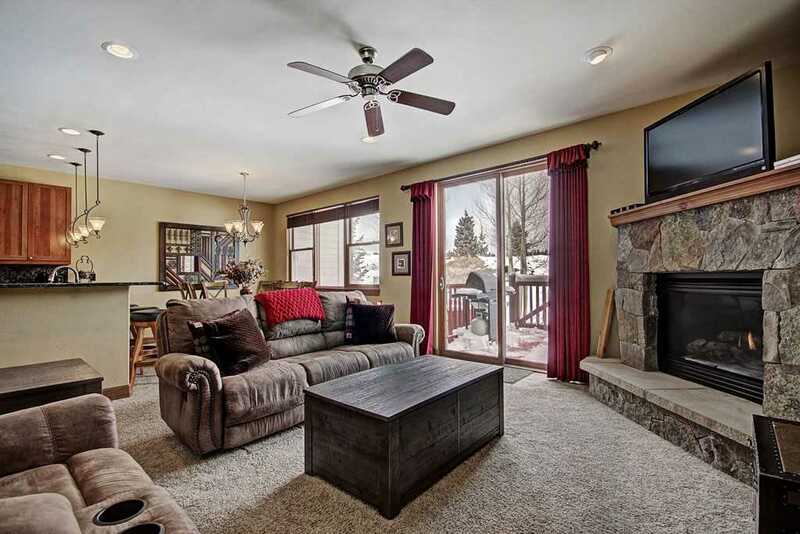 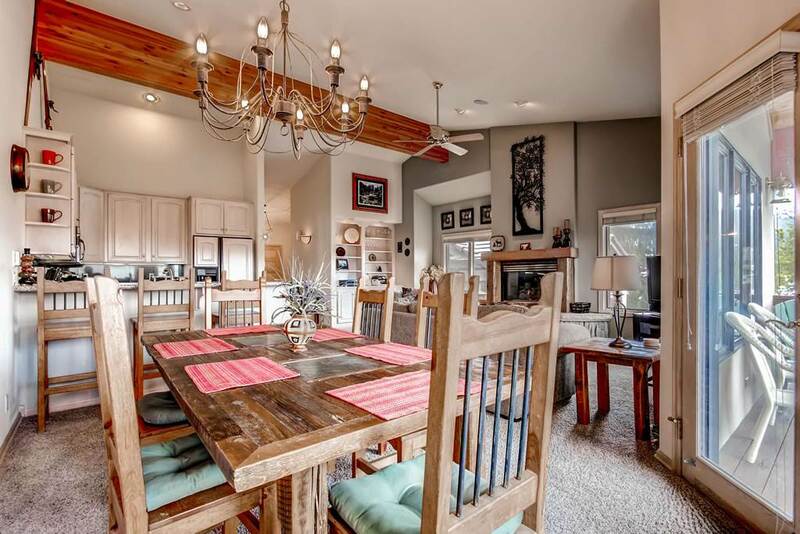 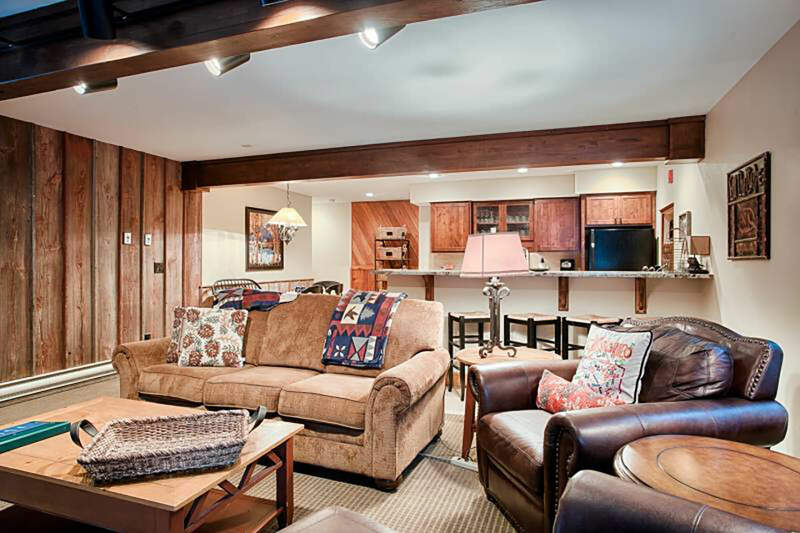 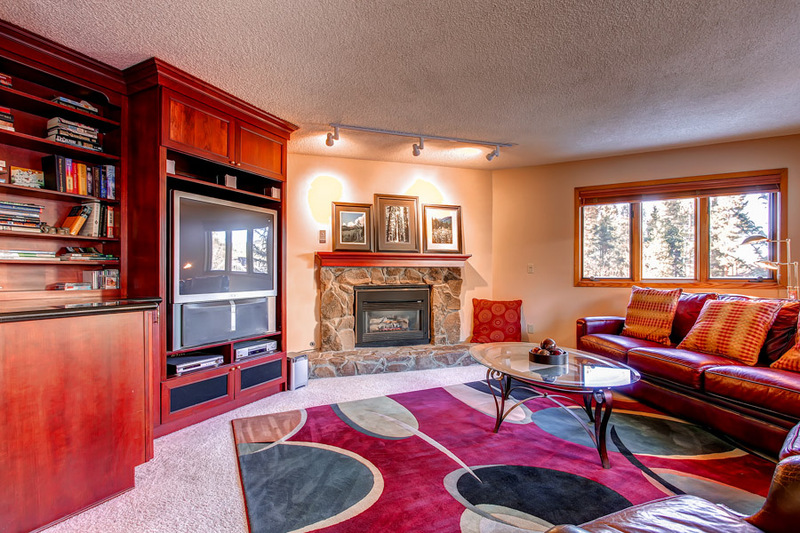 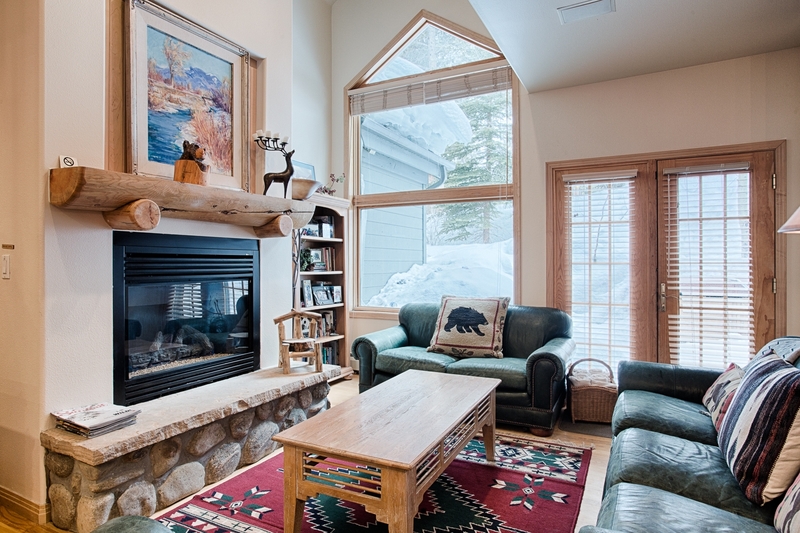 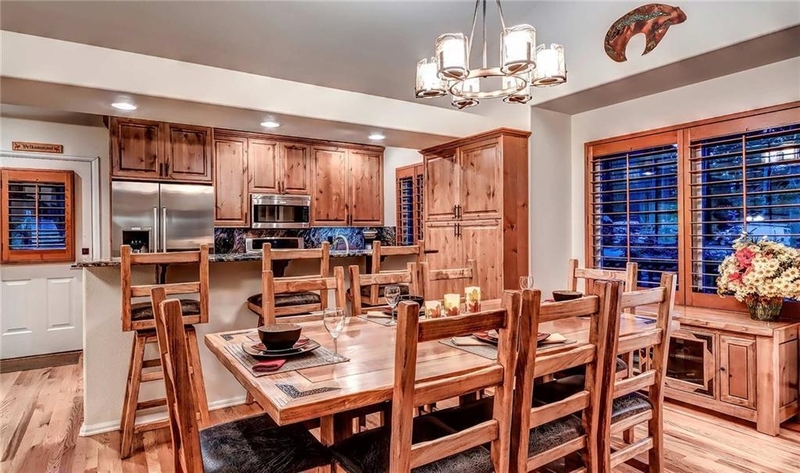 Set in the perfect Breckenridge location, this Cedars townhome has it all. 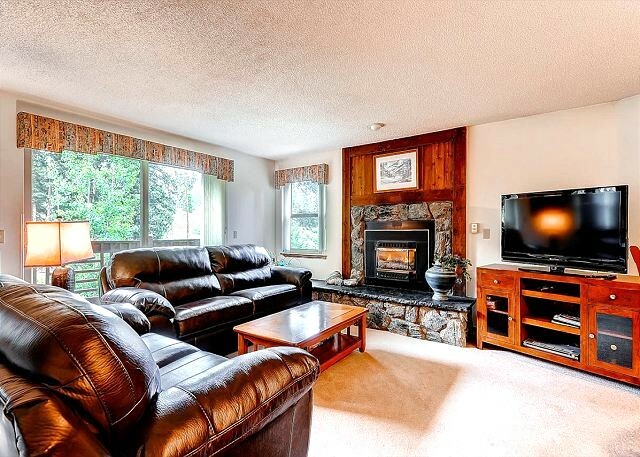 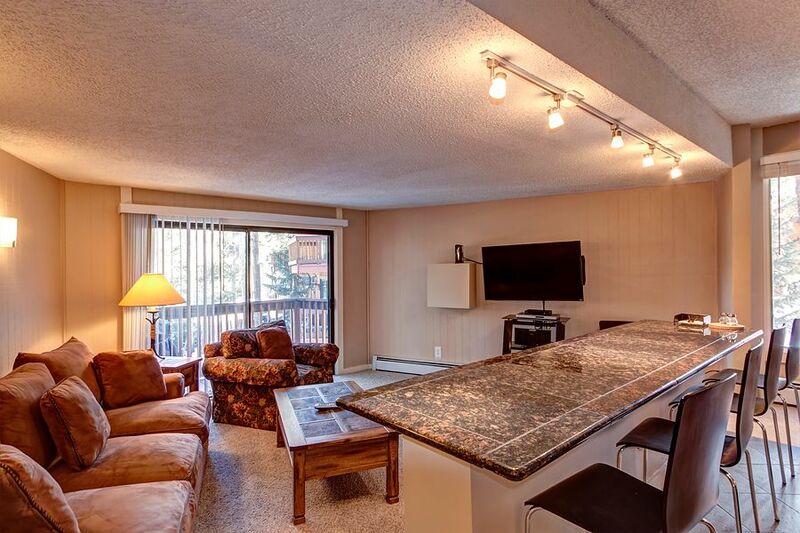 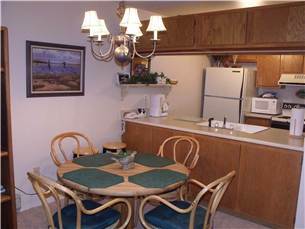 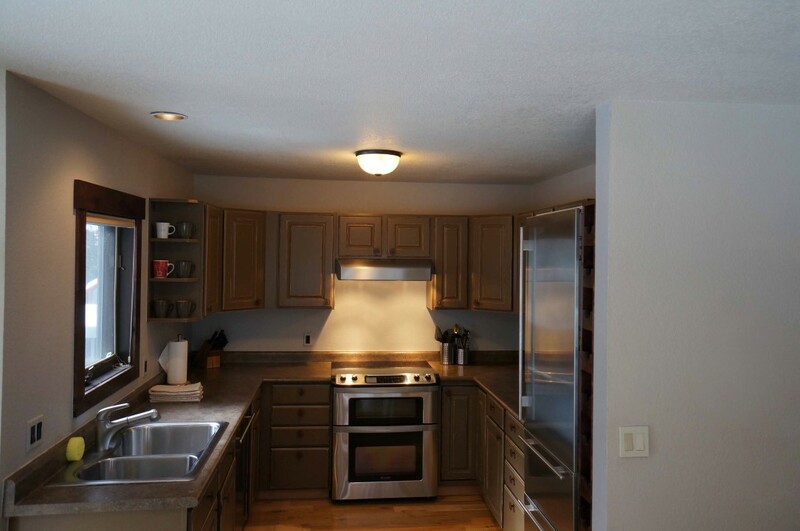 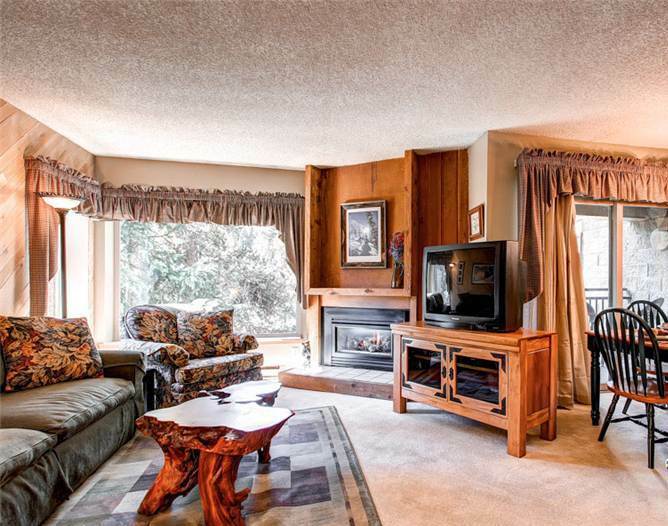 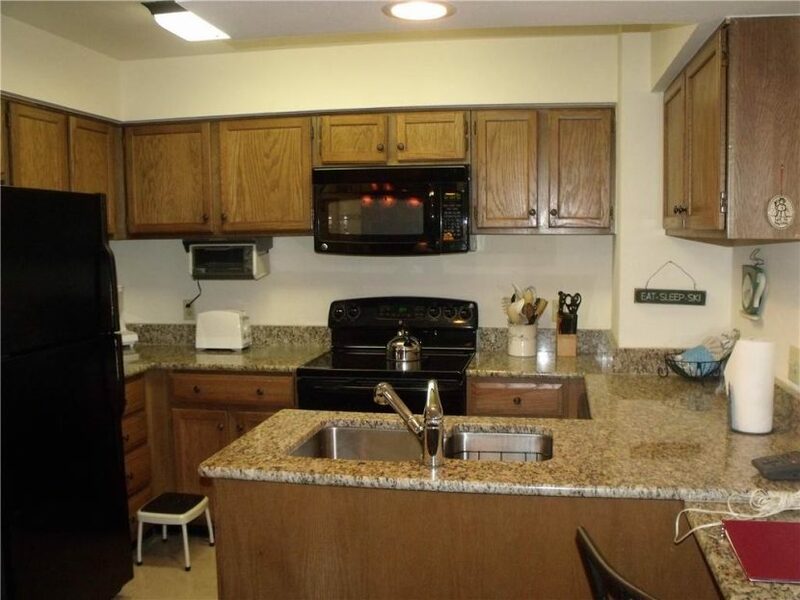 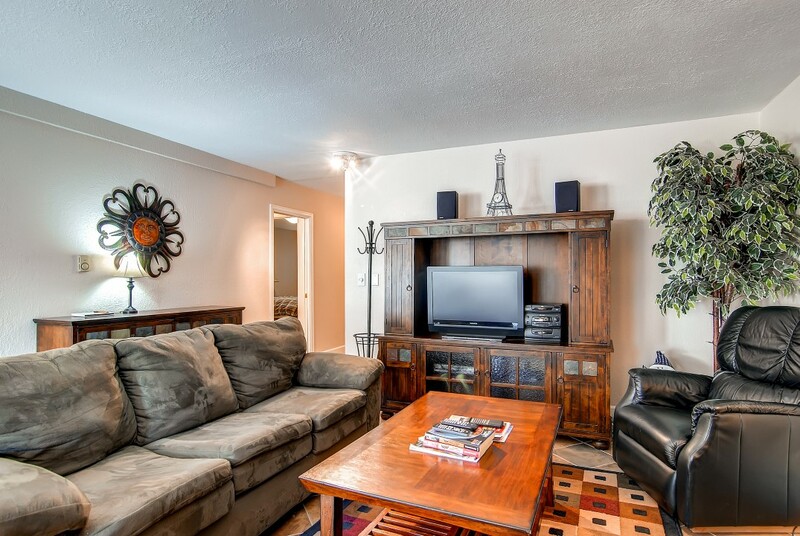 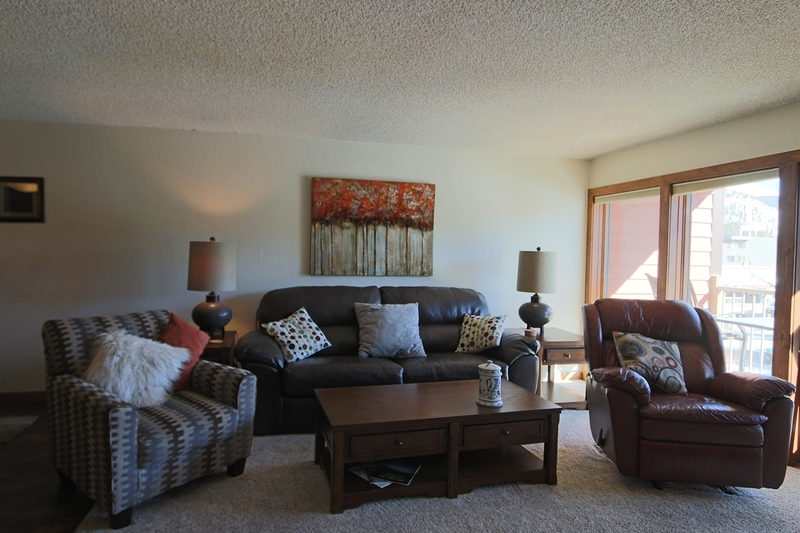 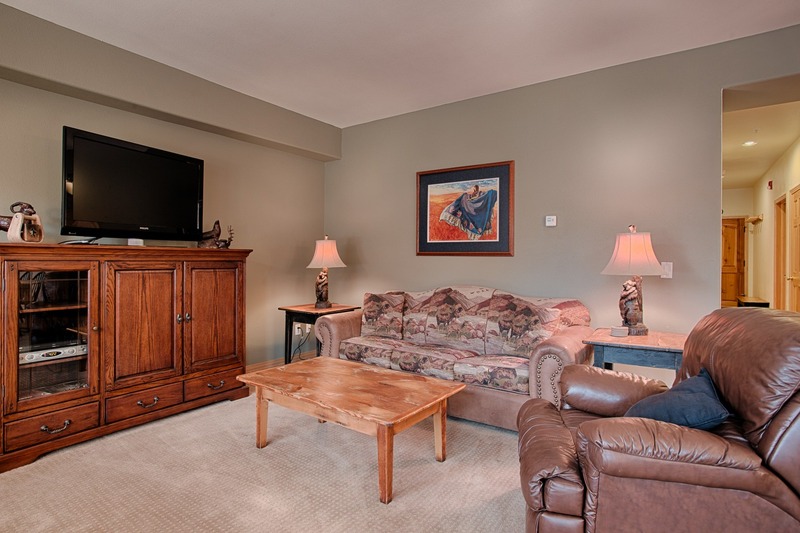 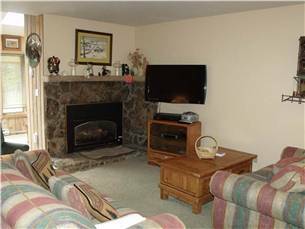 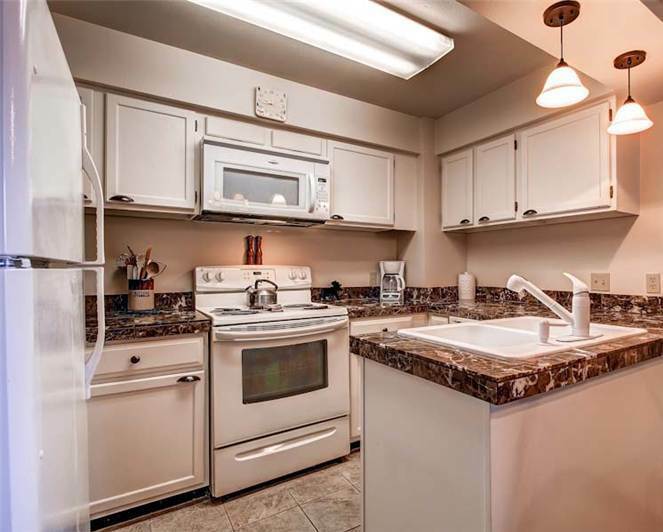 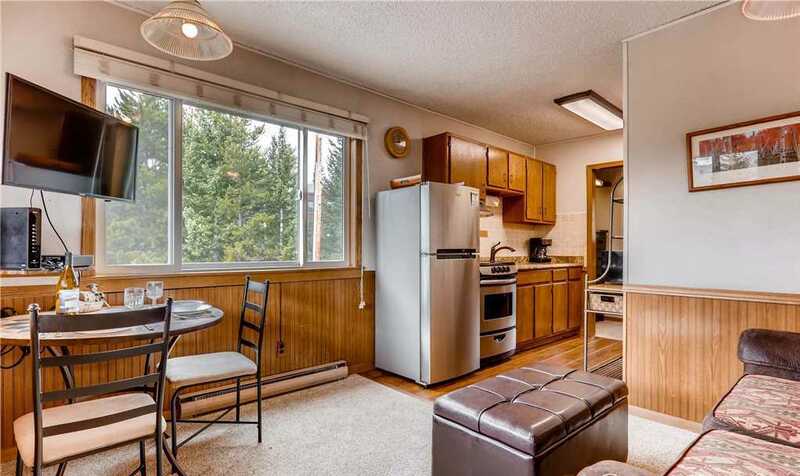 This spacious 3 bedroom / 3 bathroom end unit will surely not disappoint! 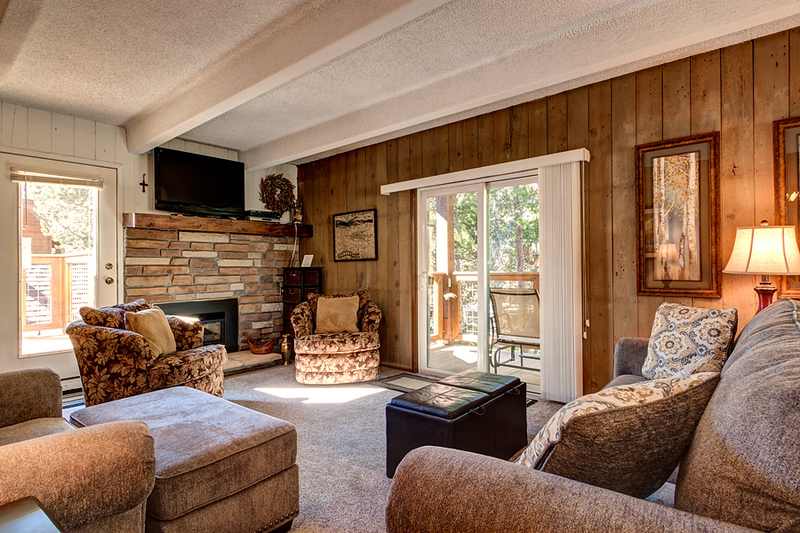 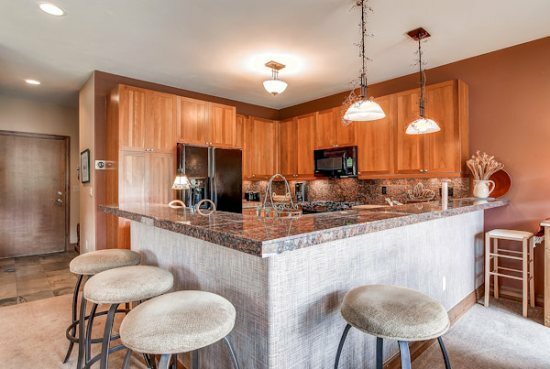 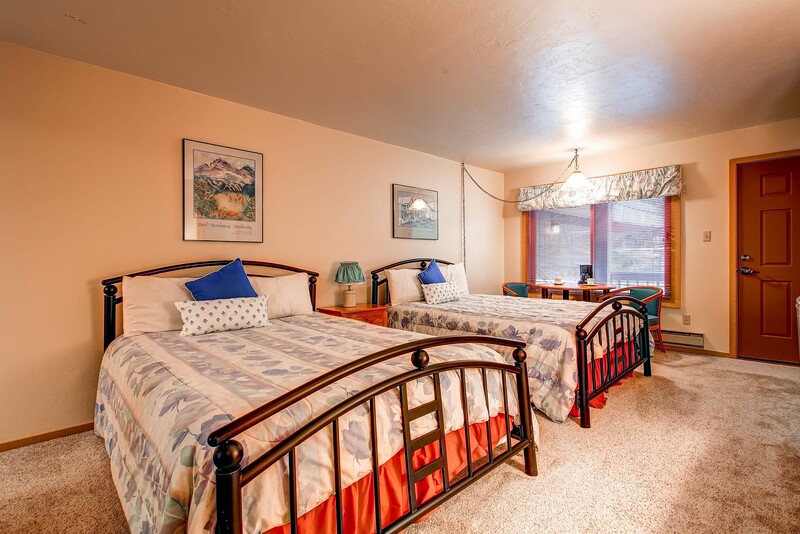 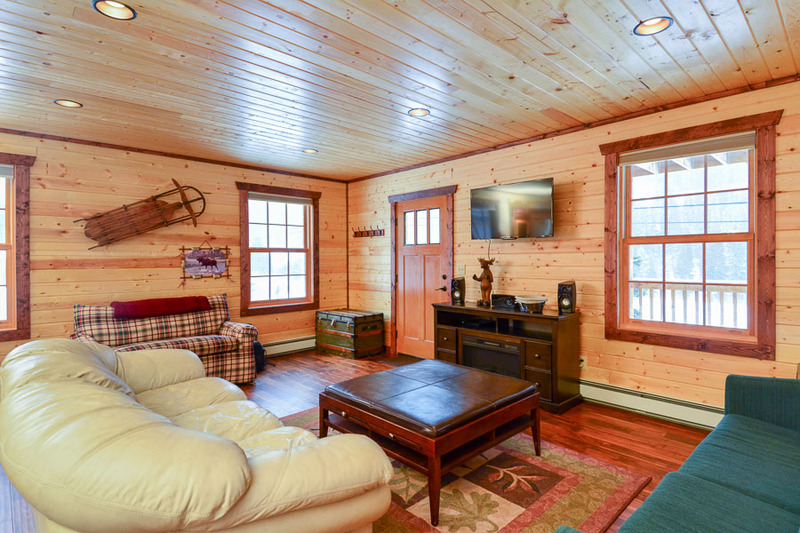 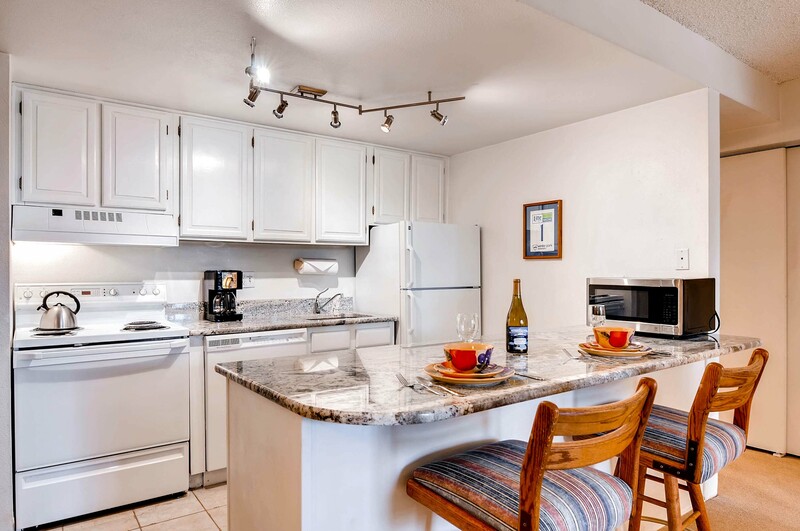 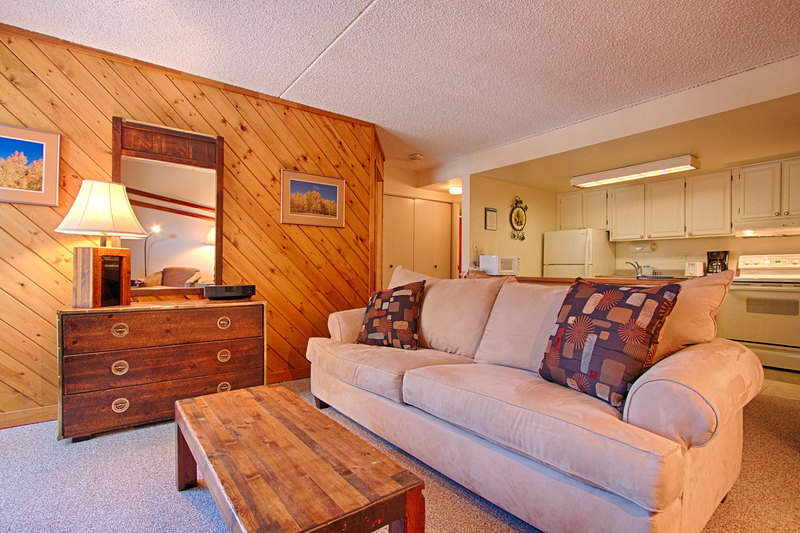 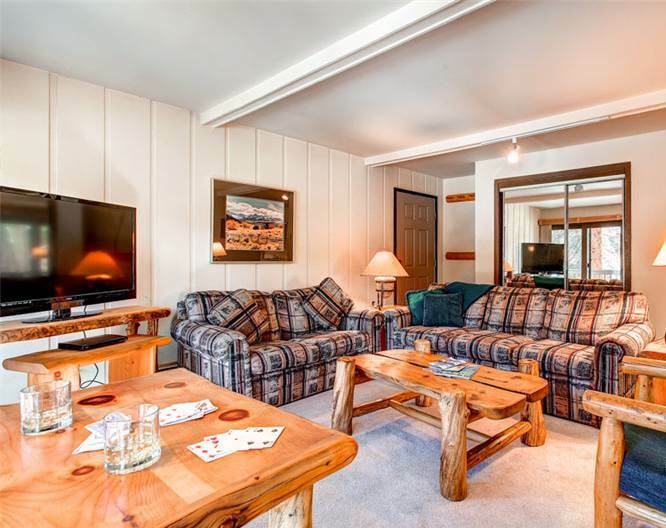 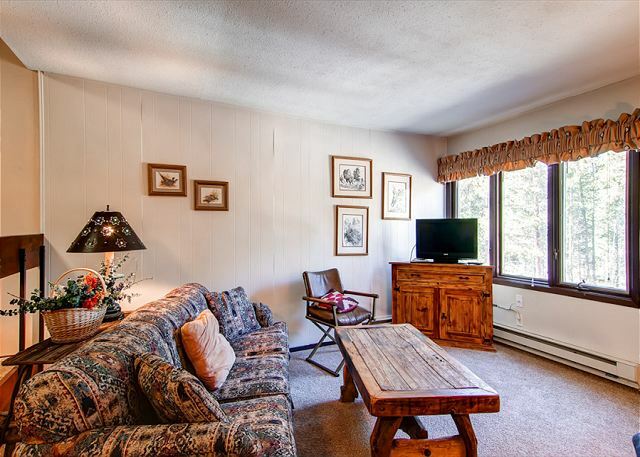 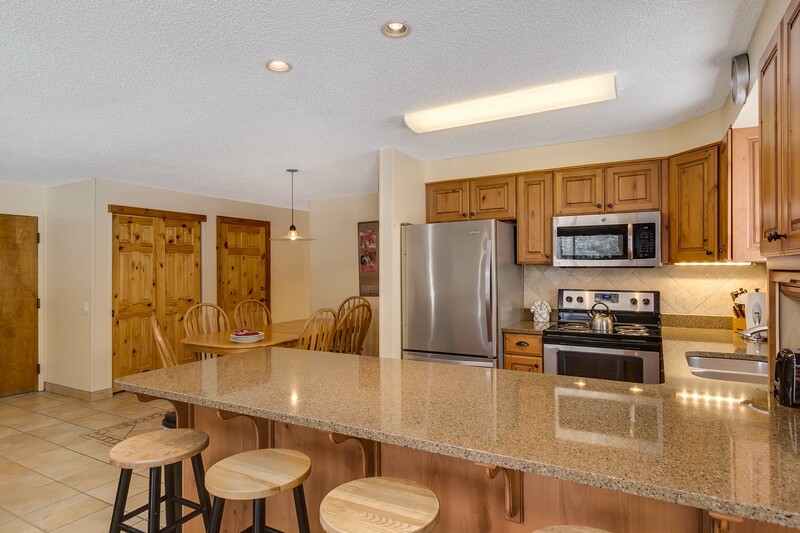 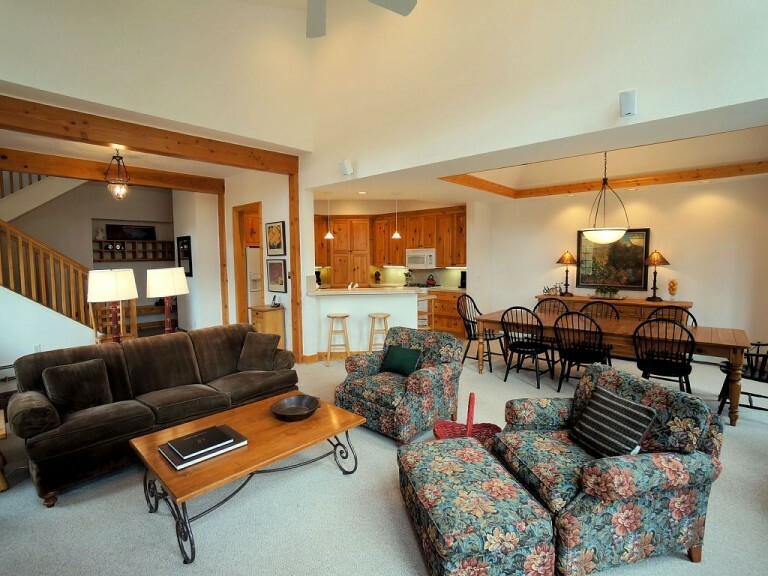 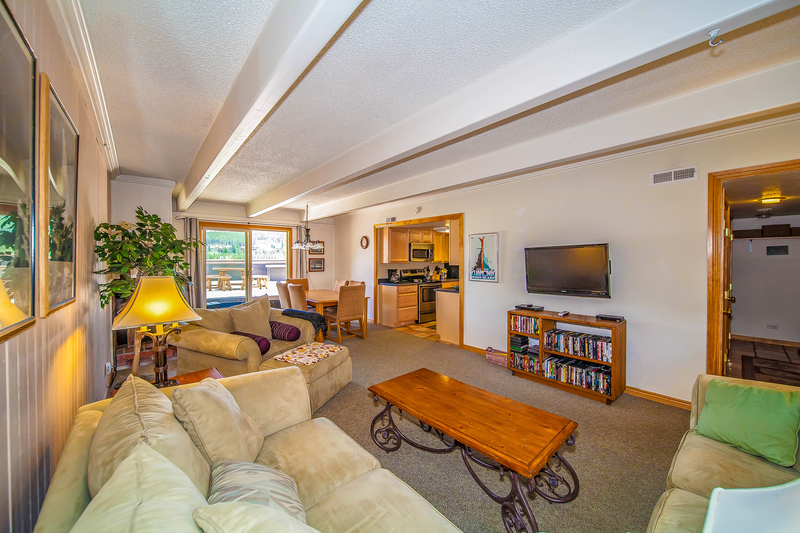 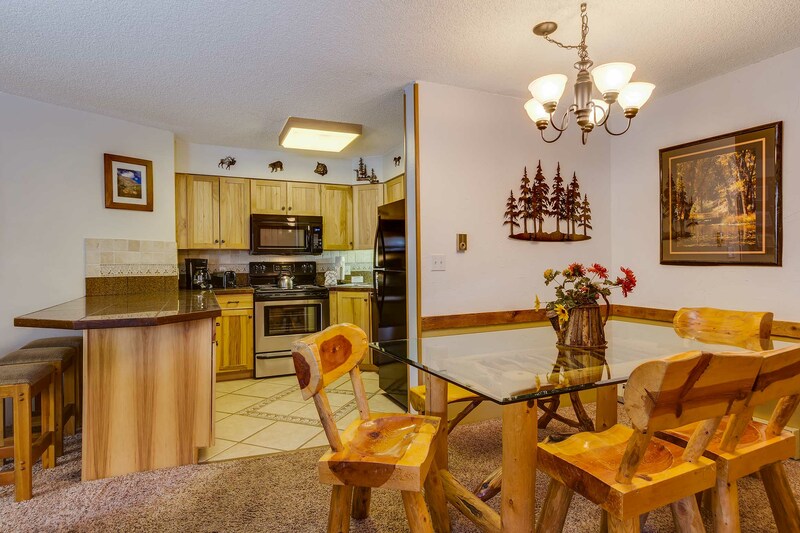 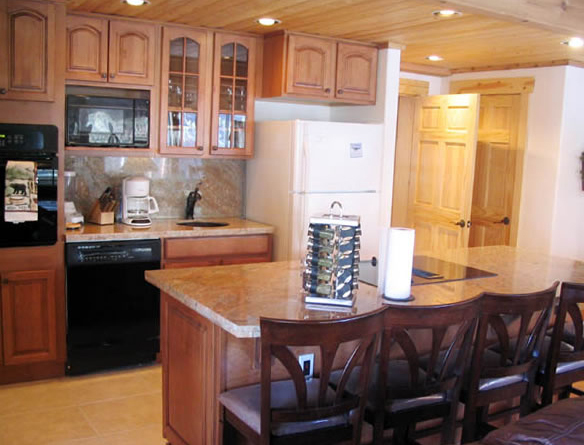 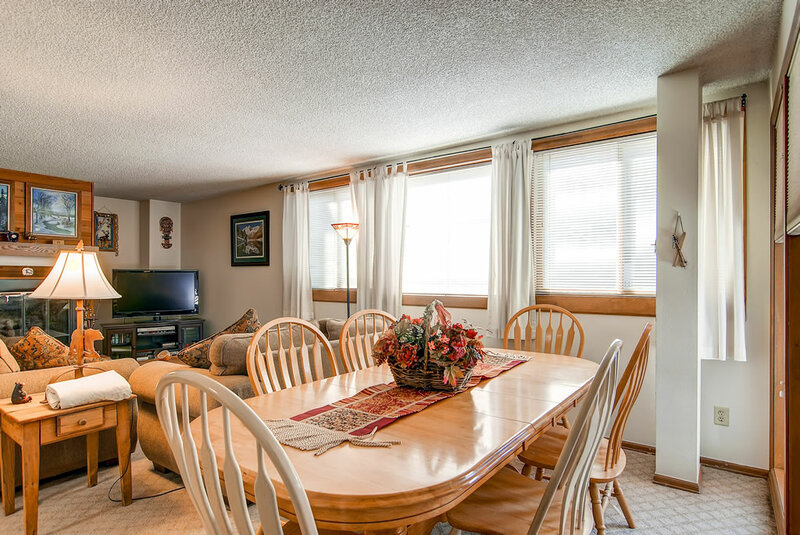 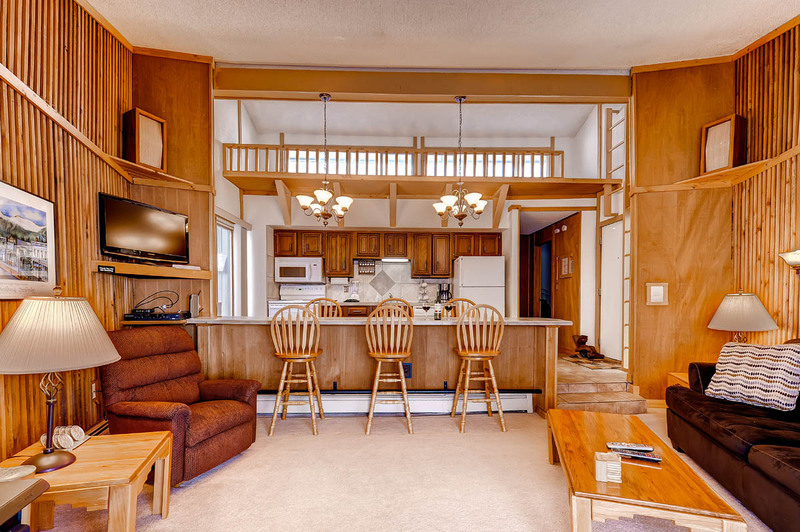 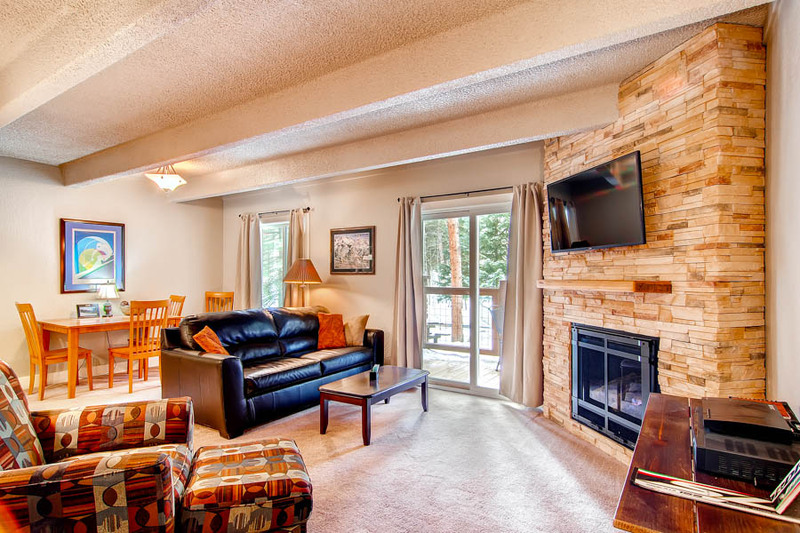 Not only will you find the amenities you need for a fantastic vacation but you will love the bright and airy interior with brand new hardwood floors and furnishings, vaulted ceilings, and tasteful décor. 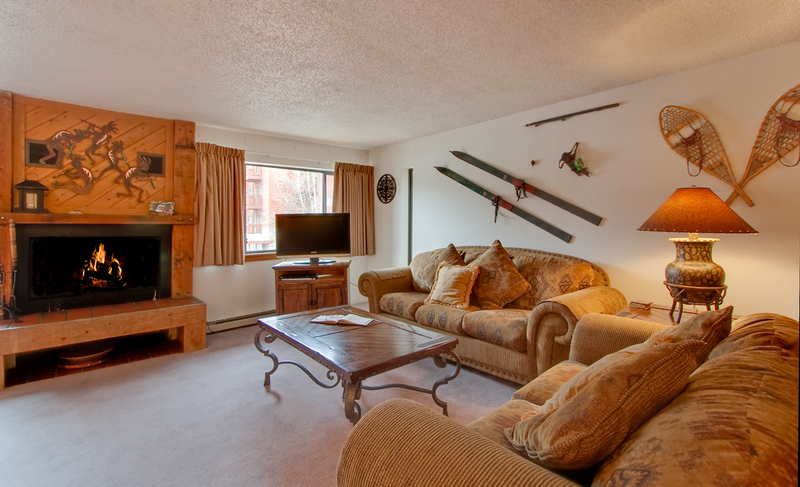 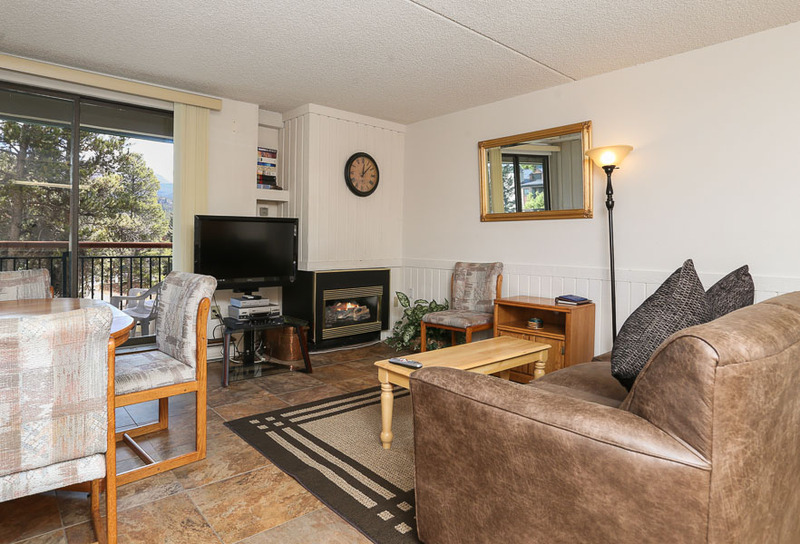 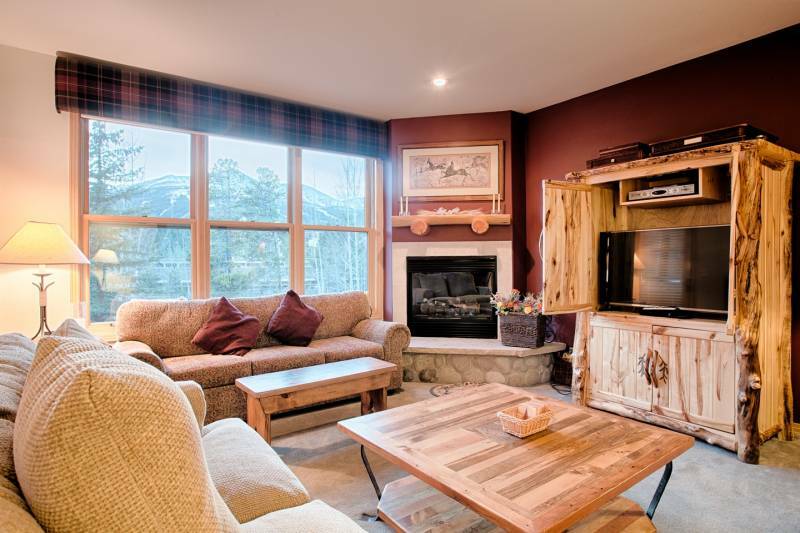 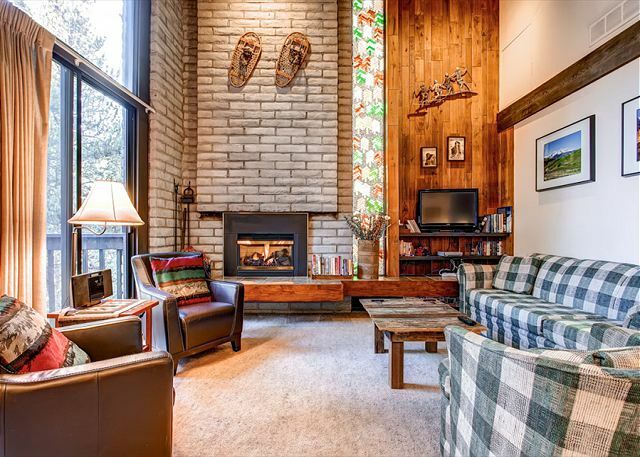 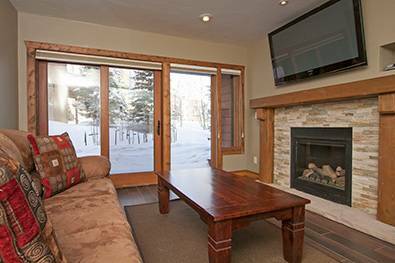 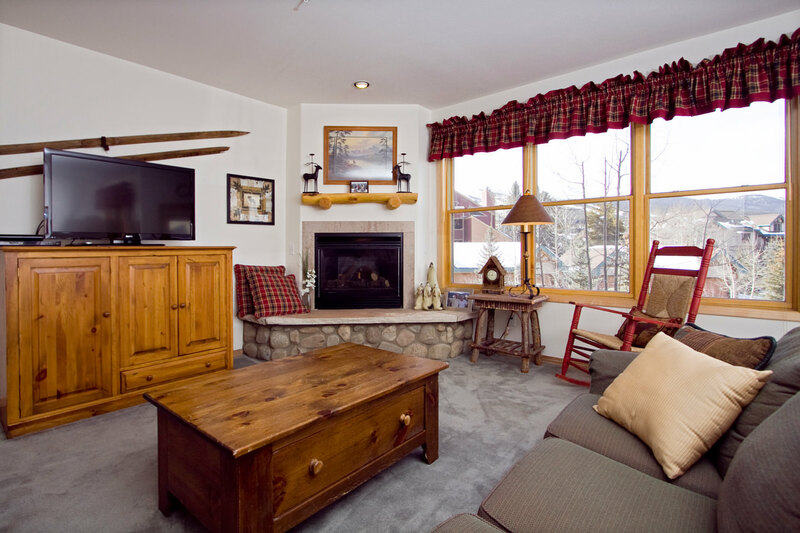 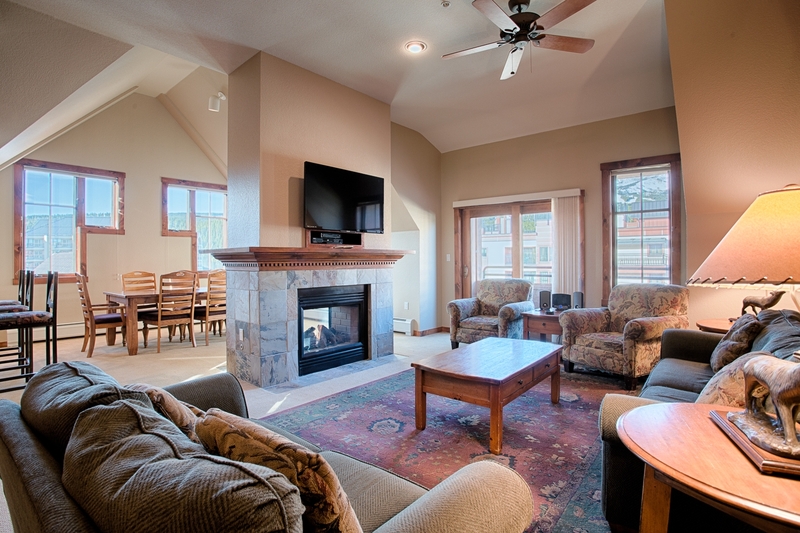 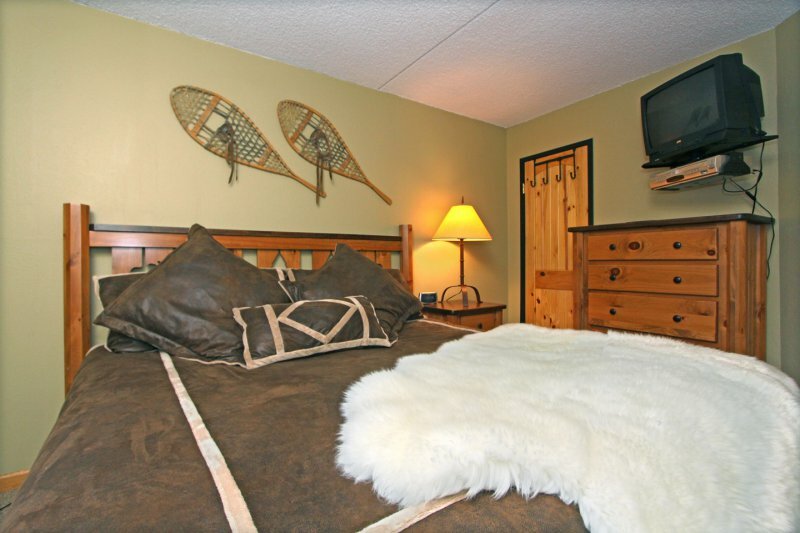 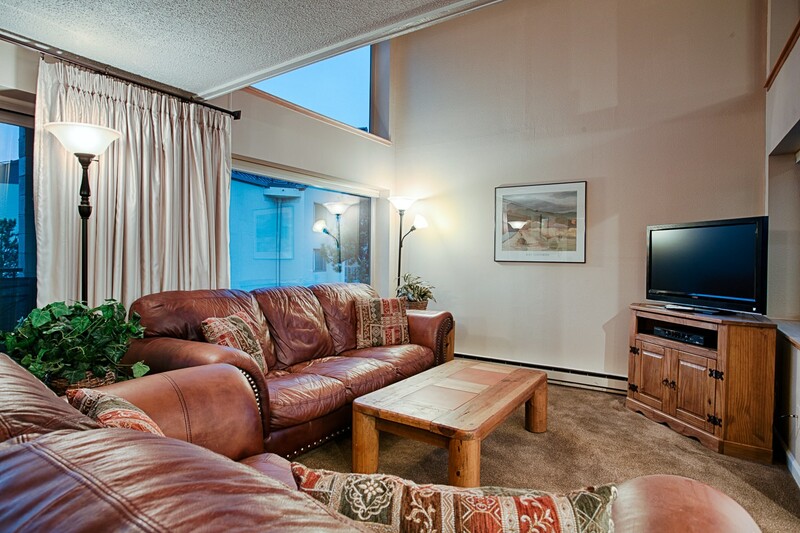 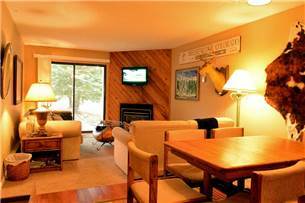 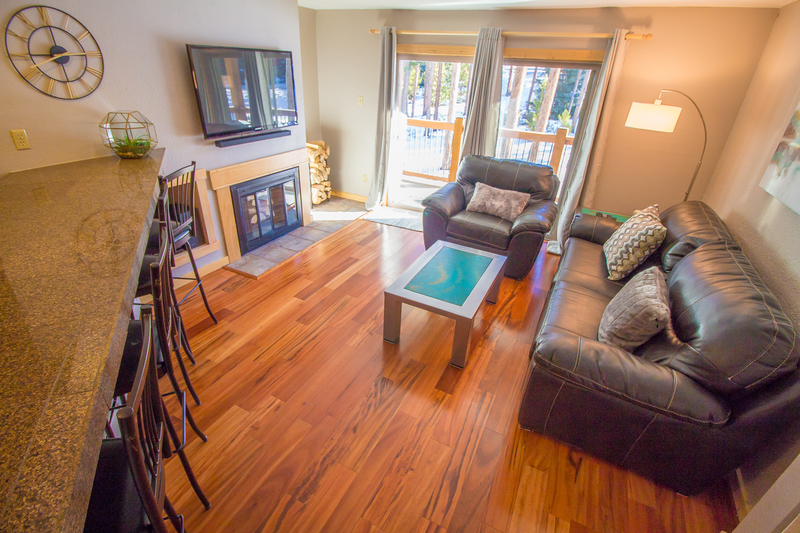 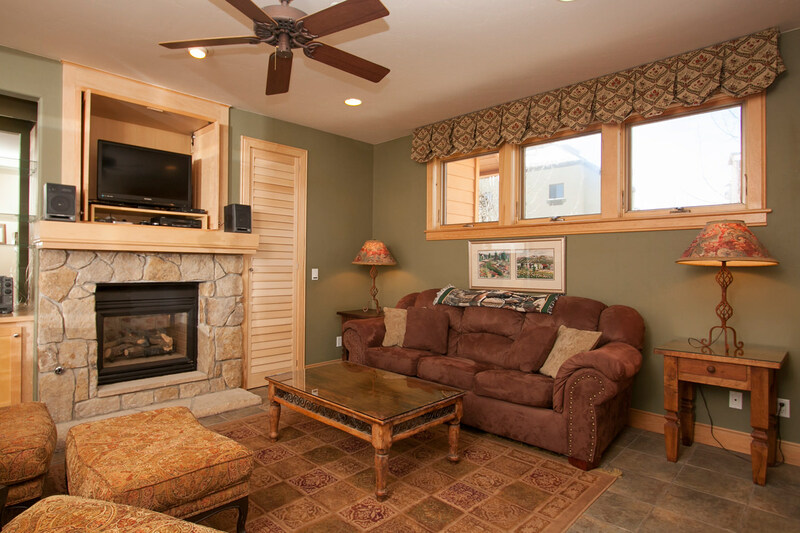 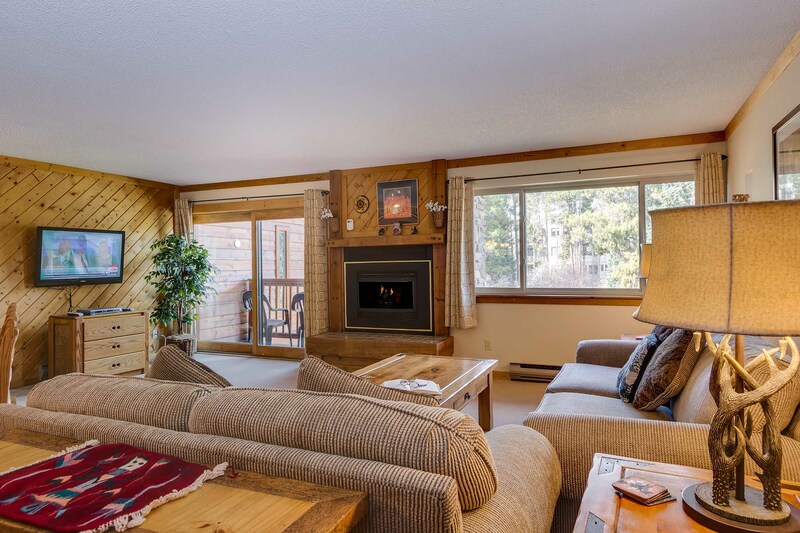 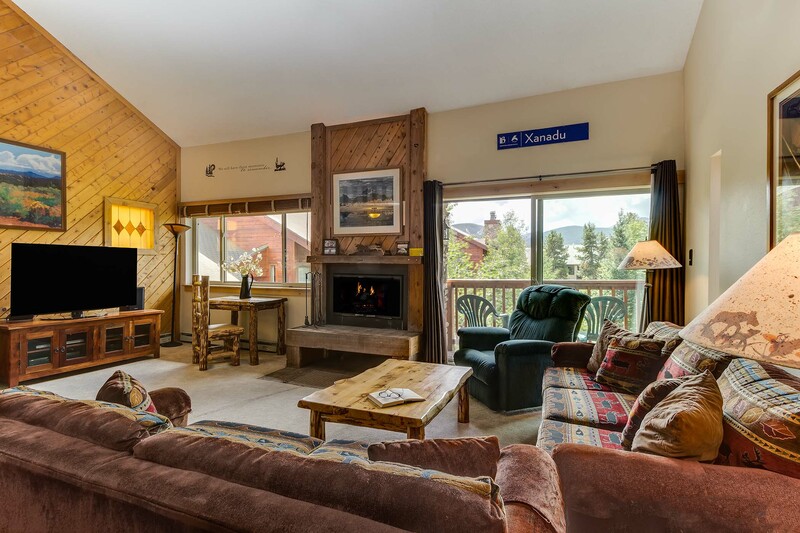 Whether you enjoy a nice soak after a great day of skiing, relaxing with a drink in front of the fire or on your patio facing the spacious courtyard, the options are yours. 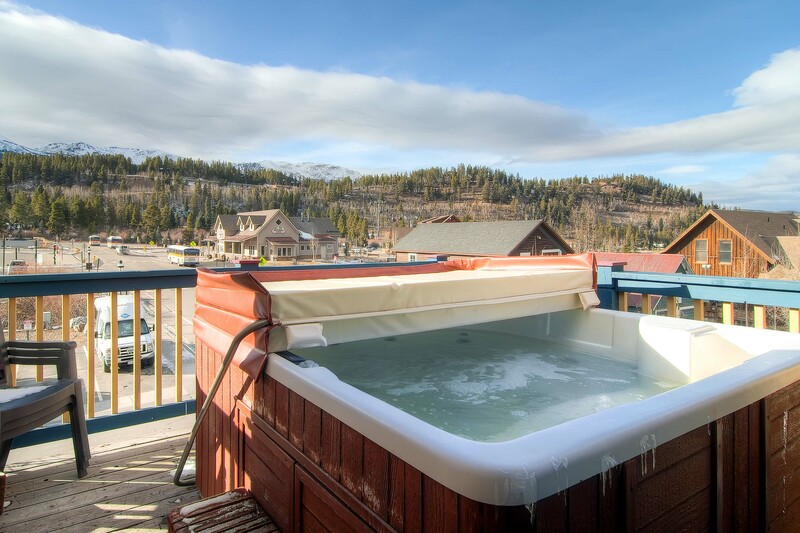 You have a choice of a private glassed-in, indoor hot tub or you can socialize at the Upper Village hot tubs and pool (off-site). 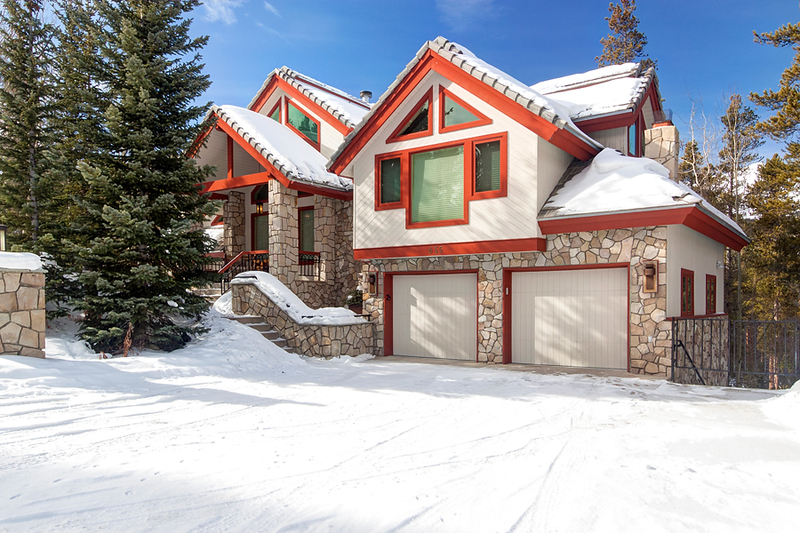 The heated garage has space for 2 cars, ski and snowboard racks, and a brand new electric boot dryer. 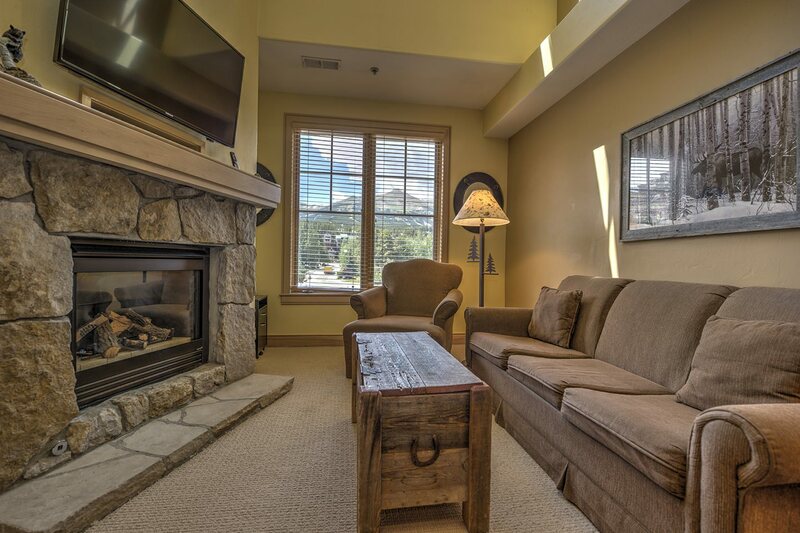 Come in for lunch, grill a burger, and head back to the slopes with warm and dry boots! 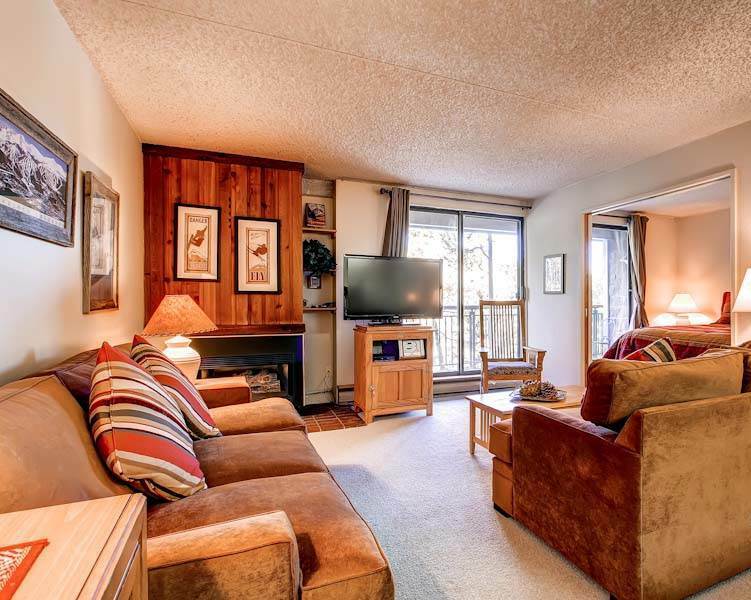 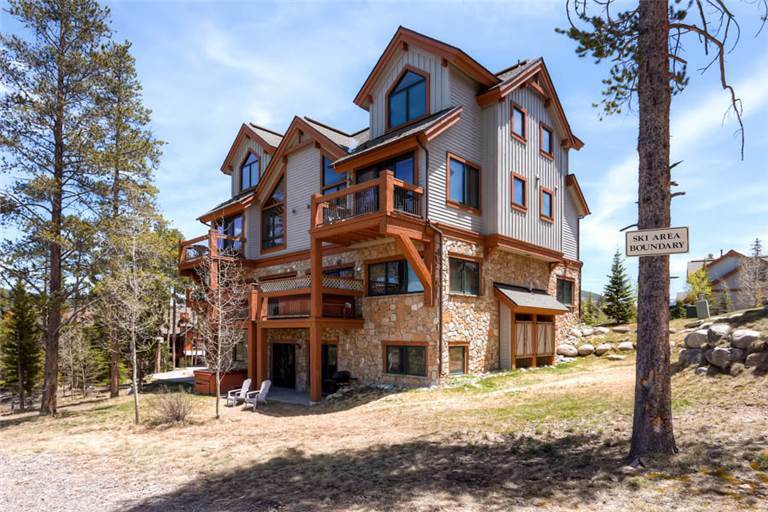 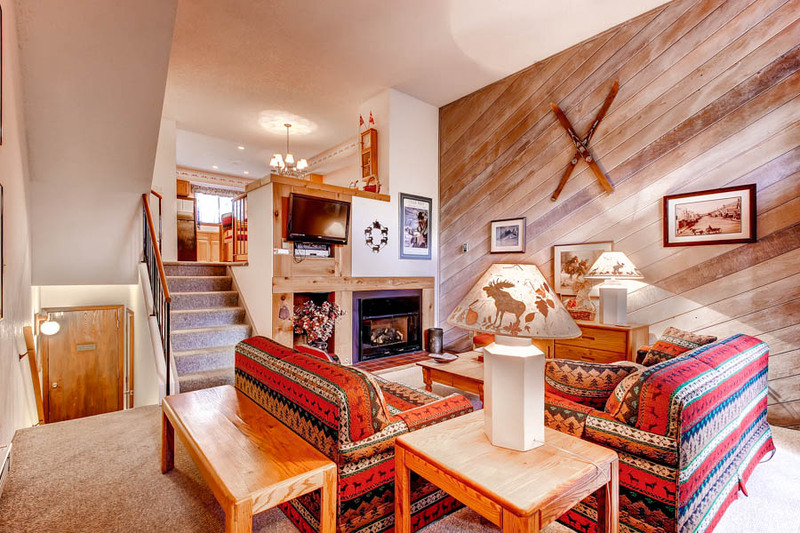 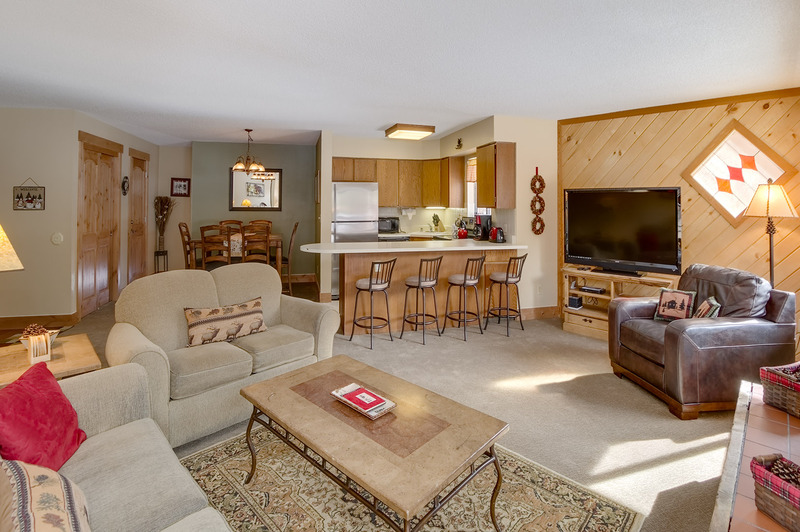 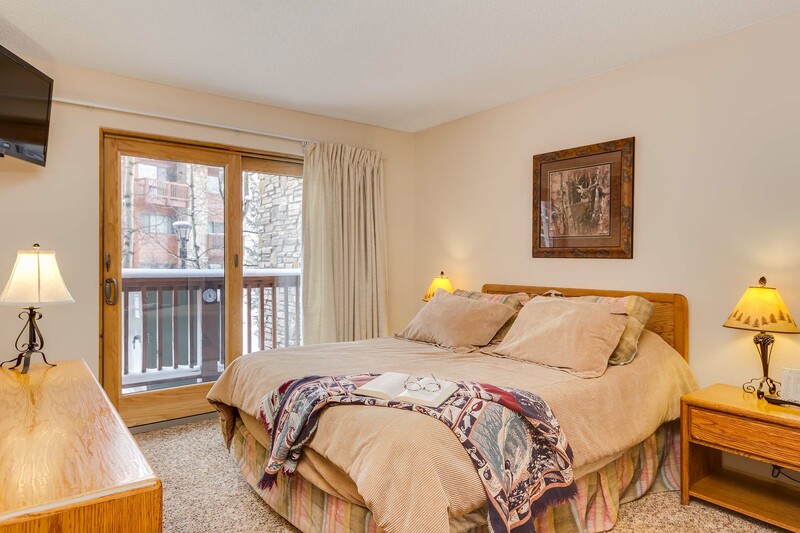 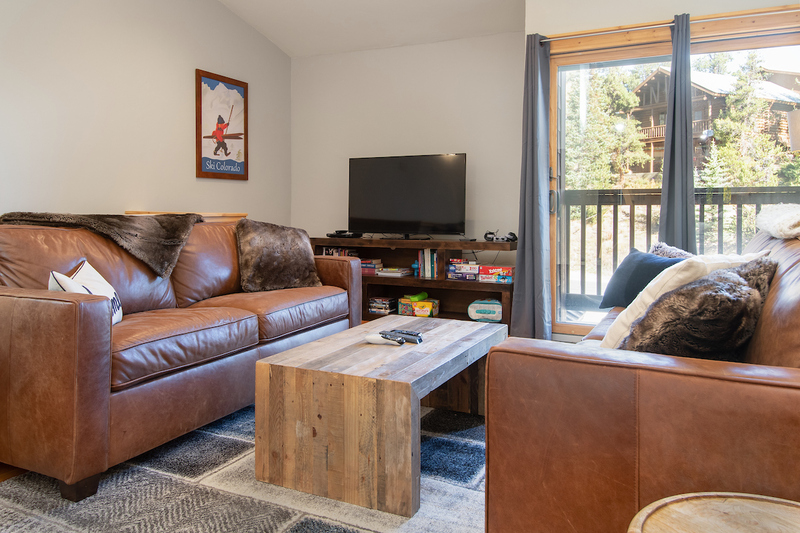 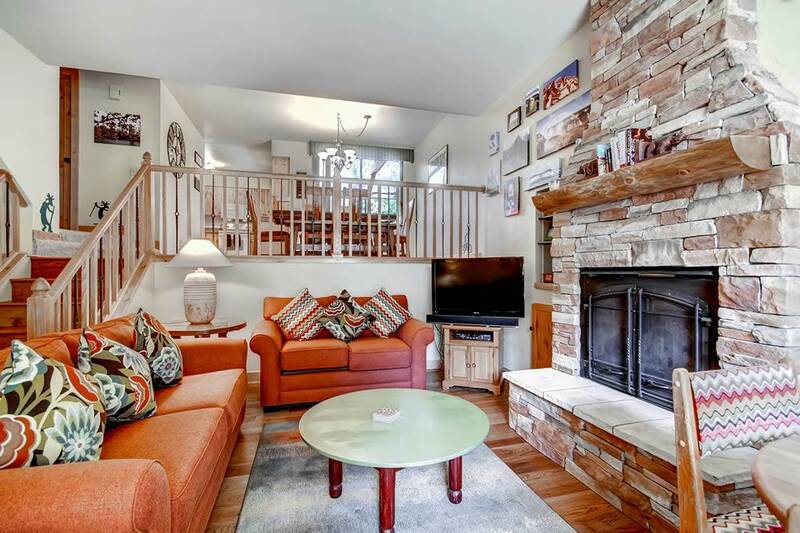 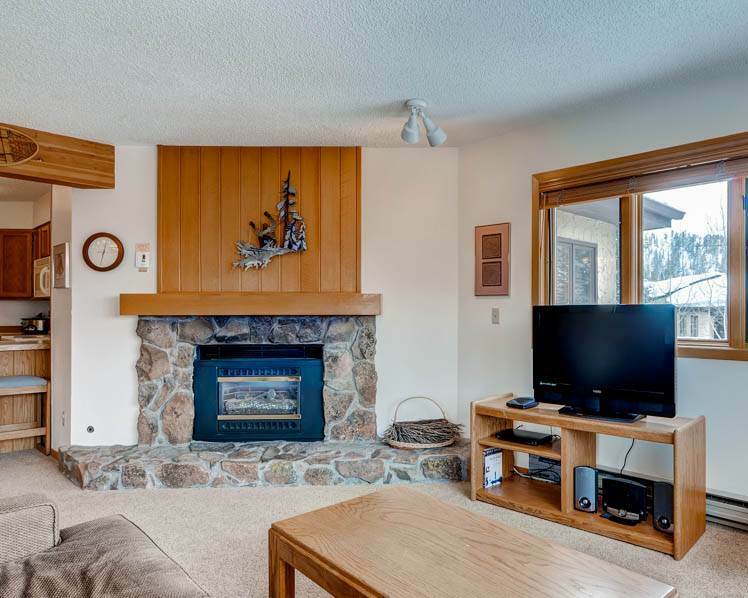 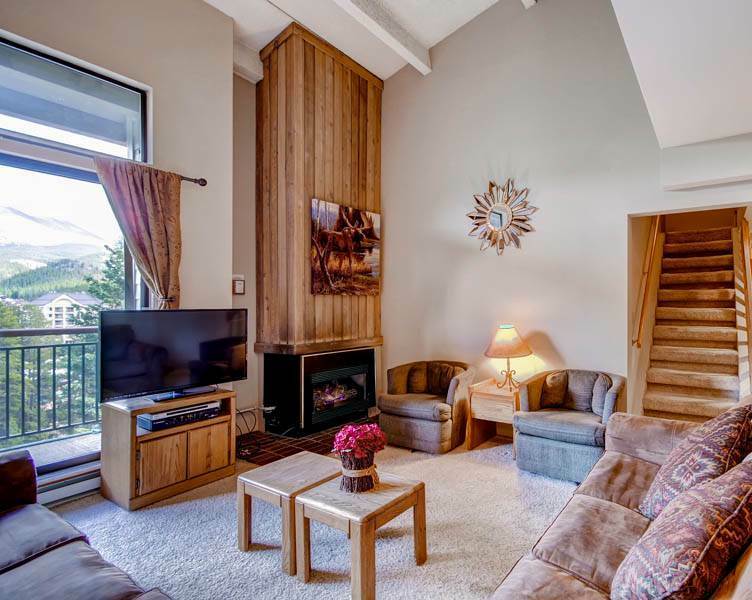 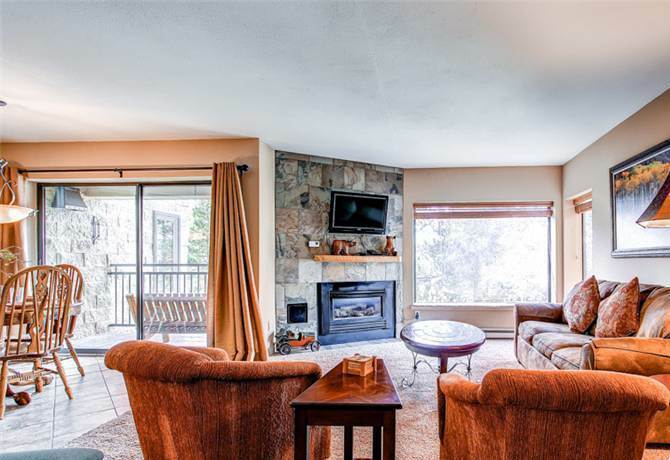 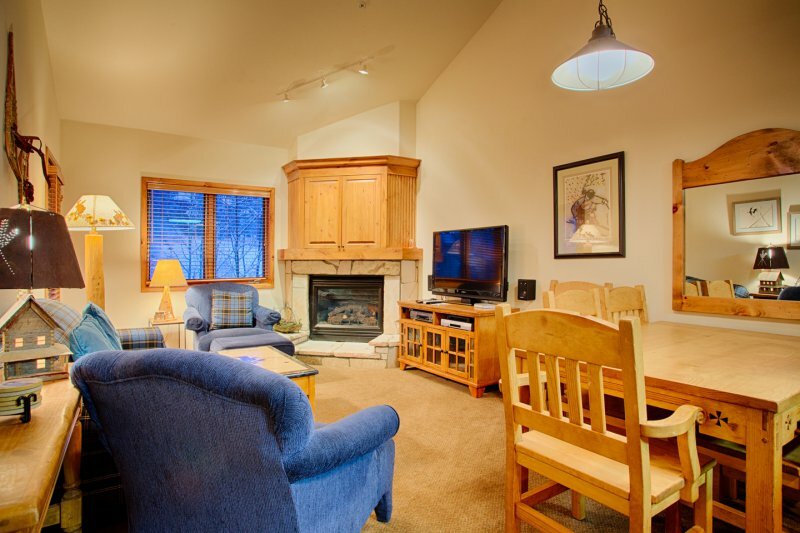 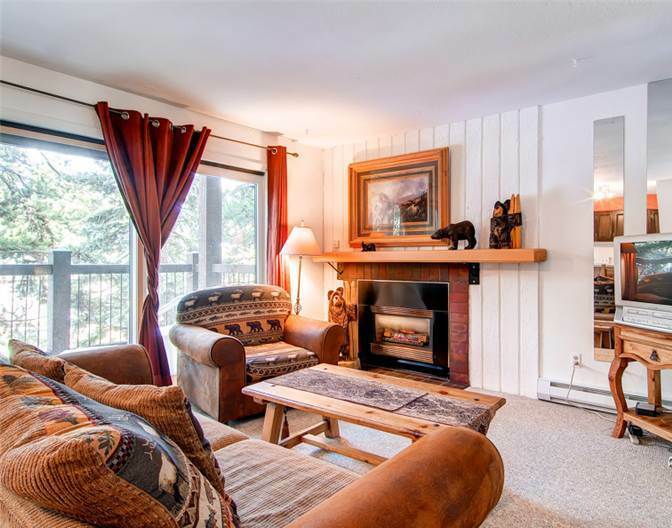 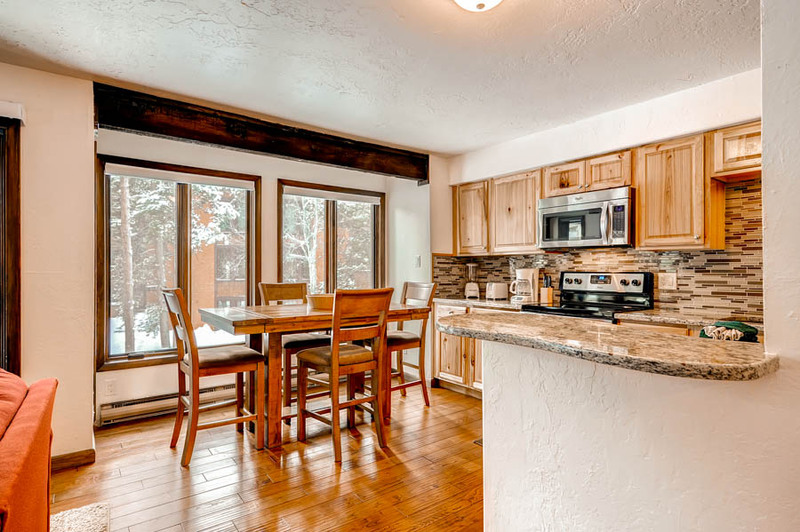 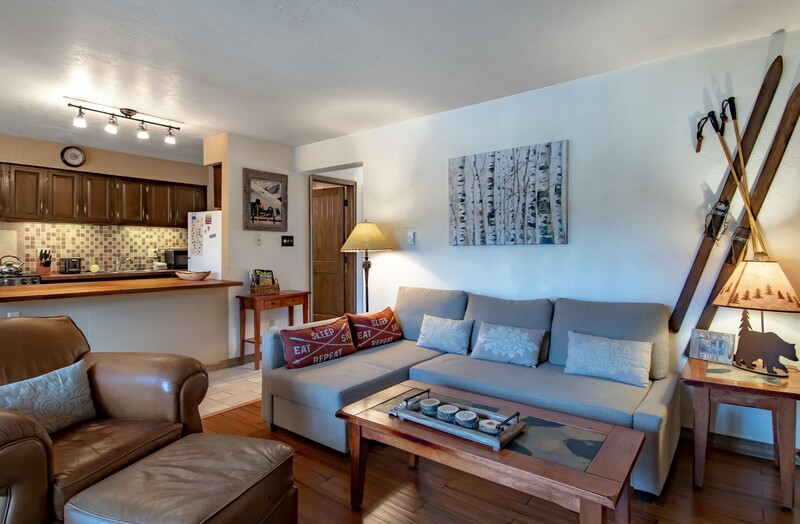 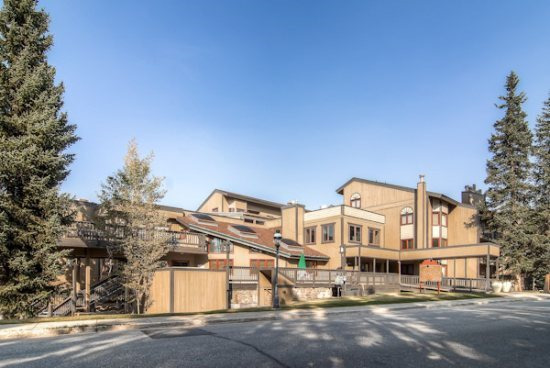 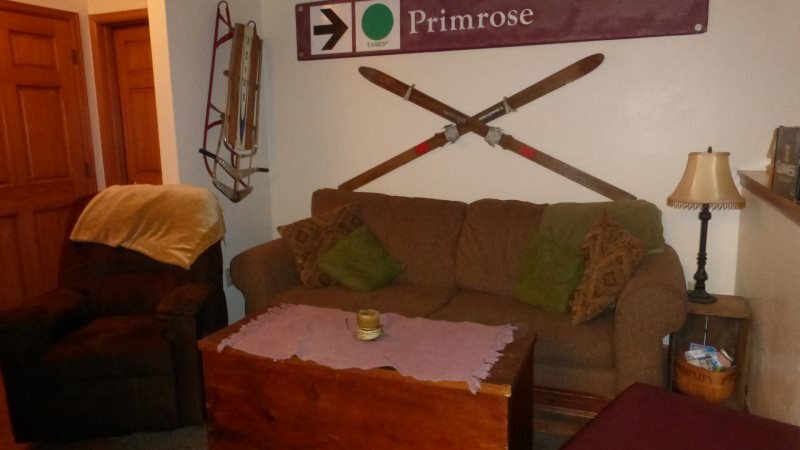 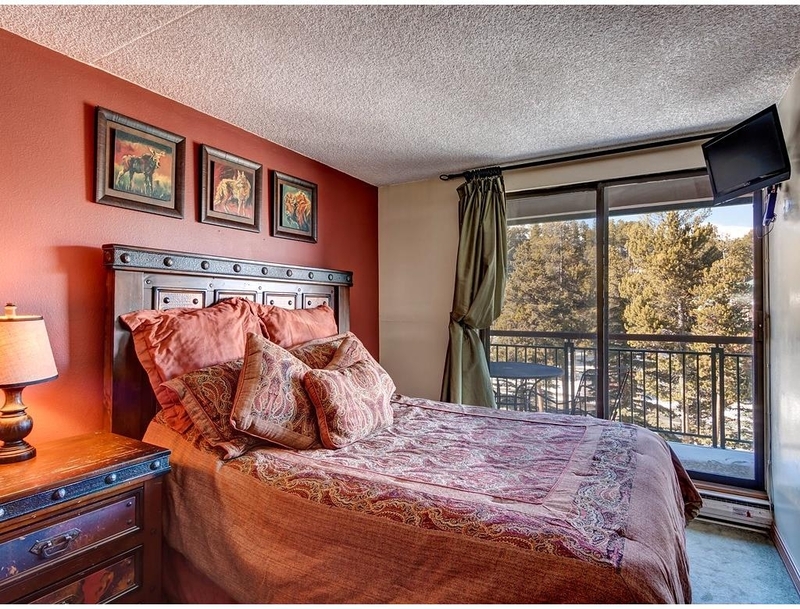 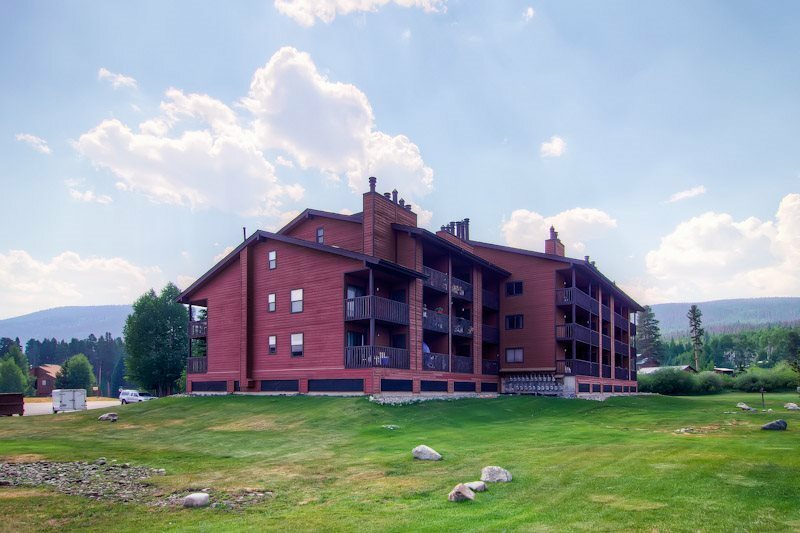 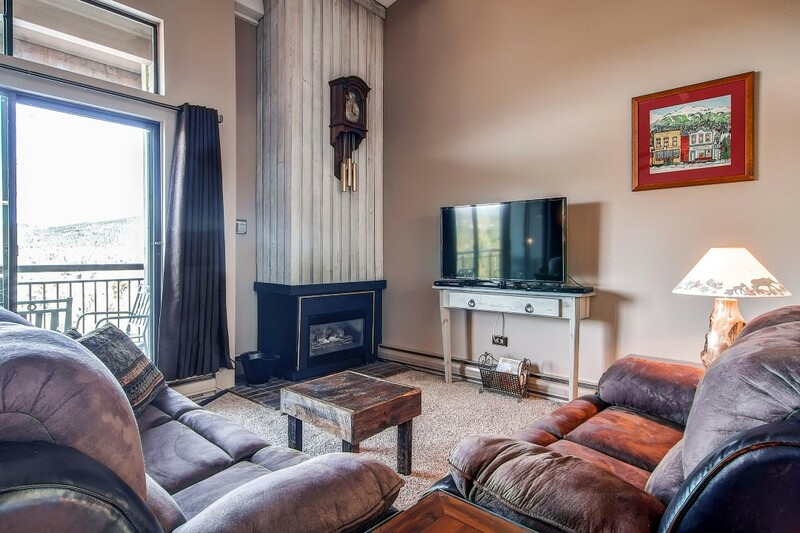 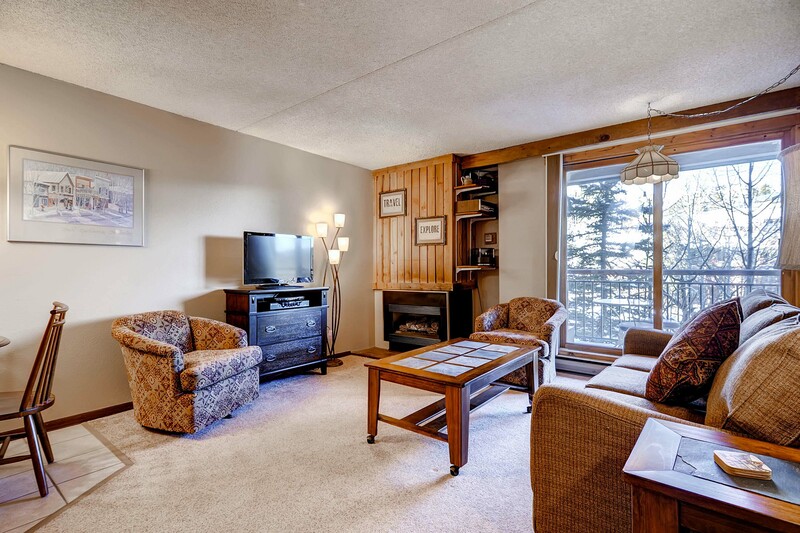 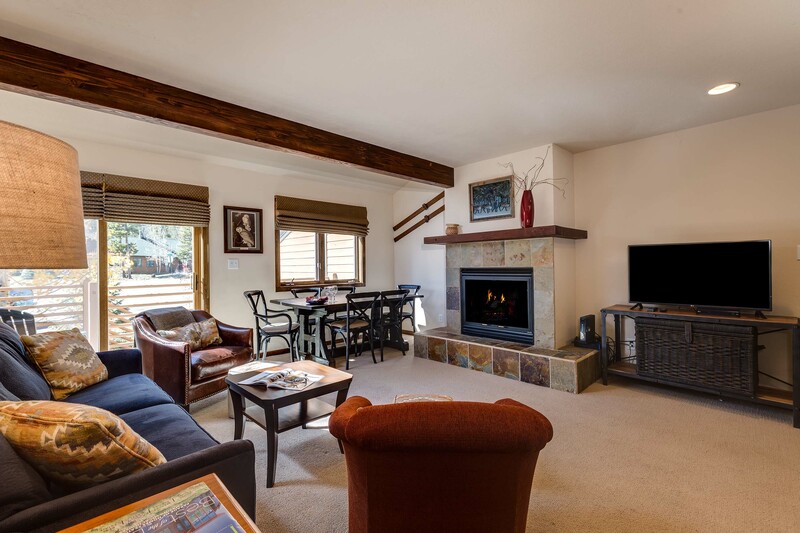 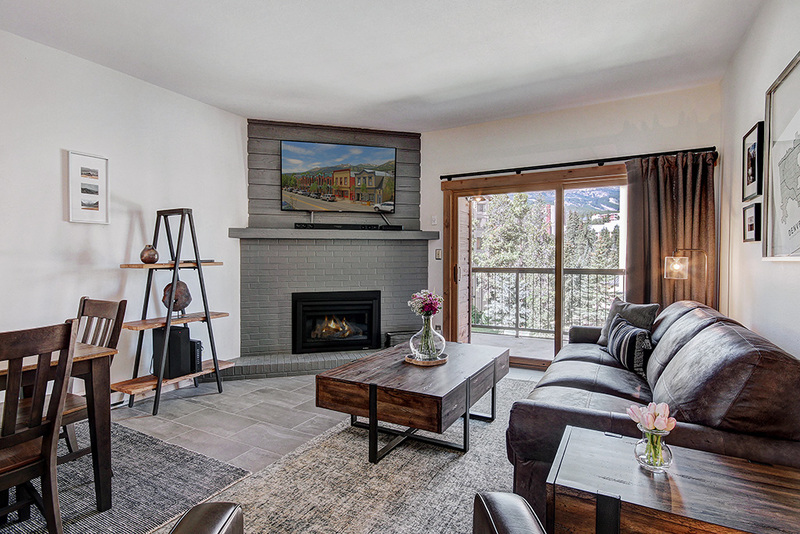 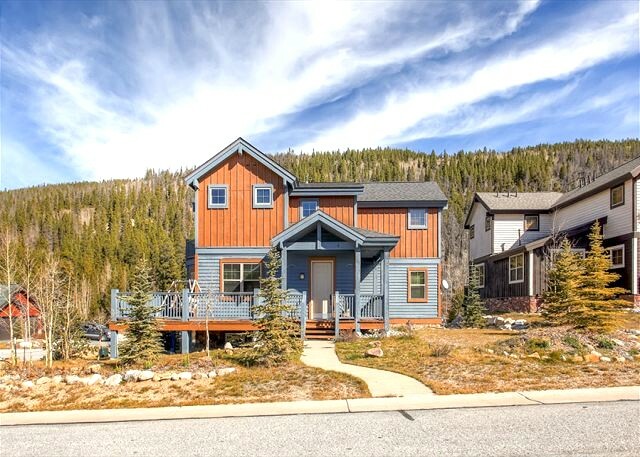 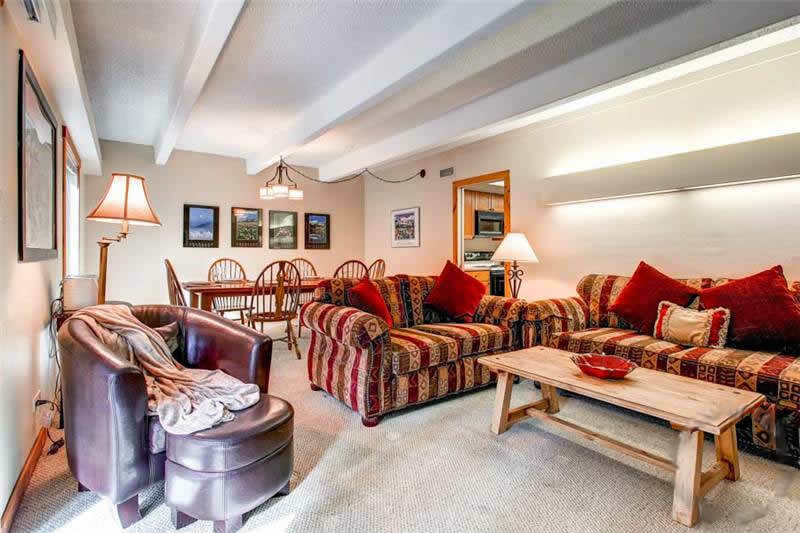 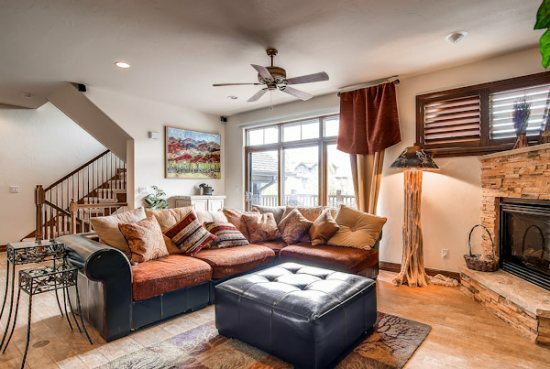 LOCATION – This Cedars townhome offers one of the best slope side settings in Breckenridge and is within steps of the Quicksilver Lift at the base of Peak 9. 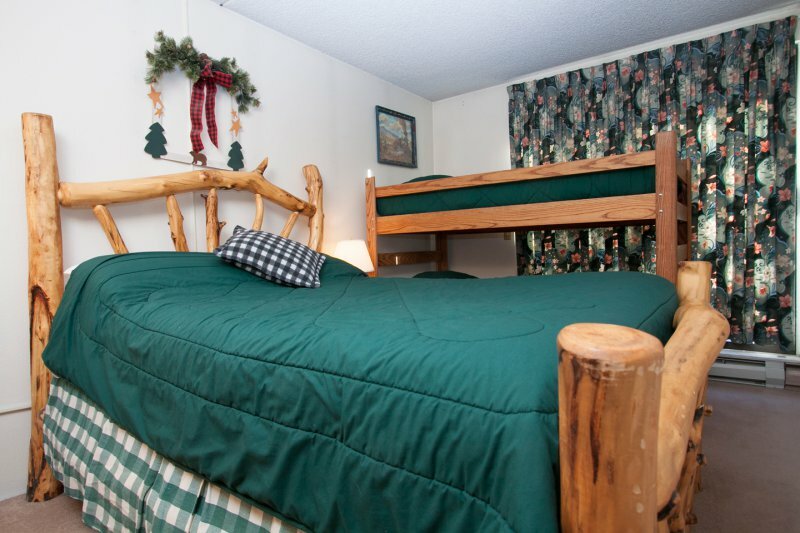 Families with children will be especially delighted that ski school is located so close. 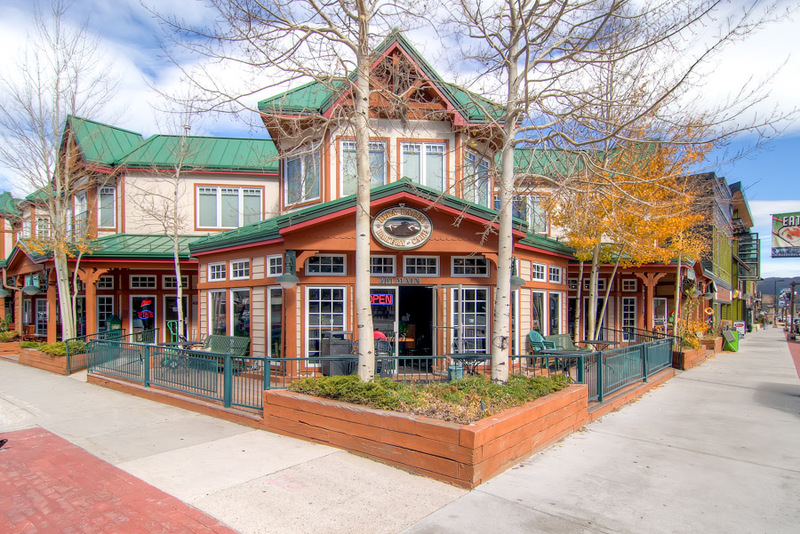 Not only is Cedars in the perfect mountain location but it is also within walking distance to Main Street where you will enjoy dining, shopping and nightlife. 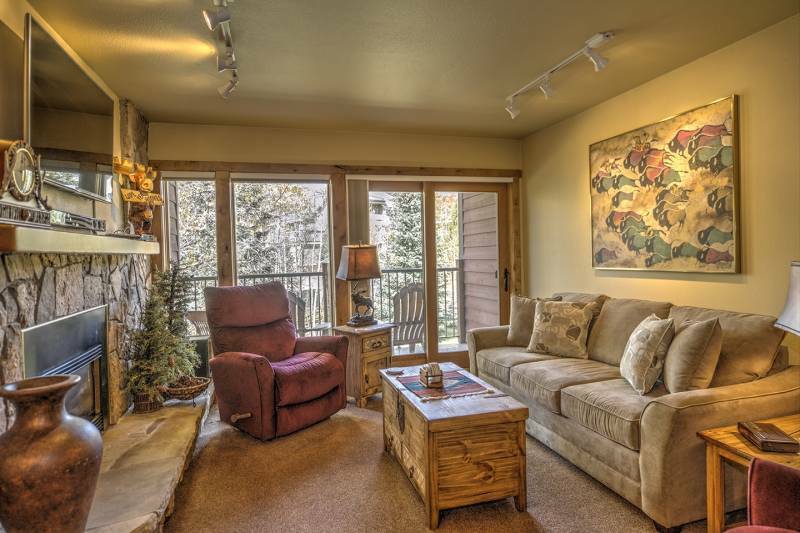 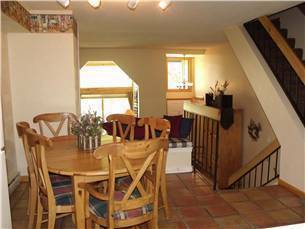 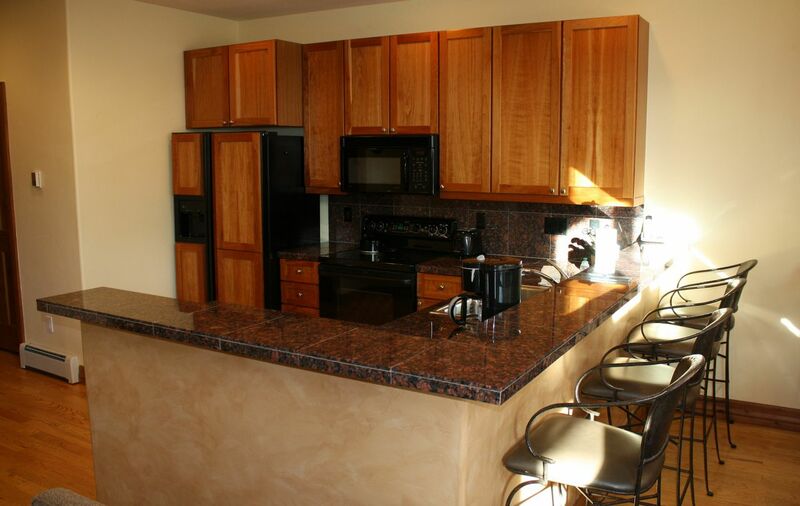 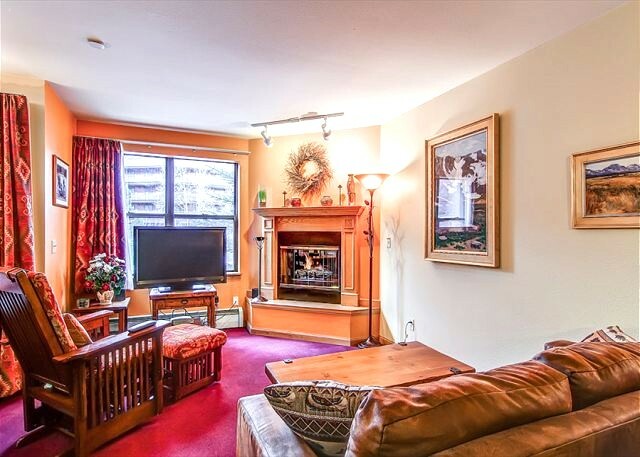 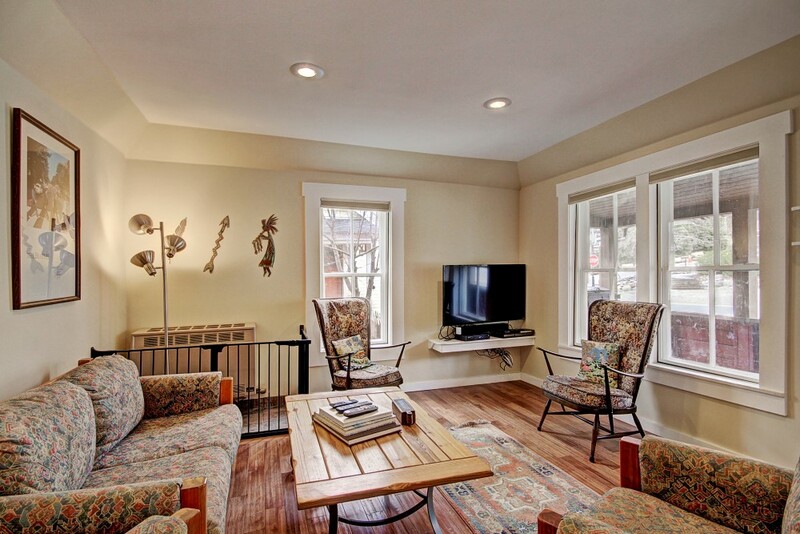 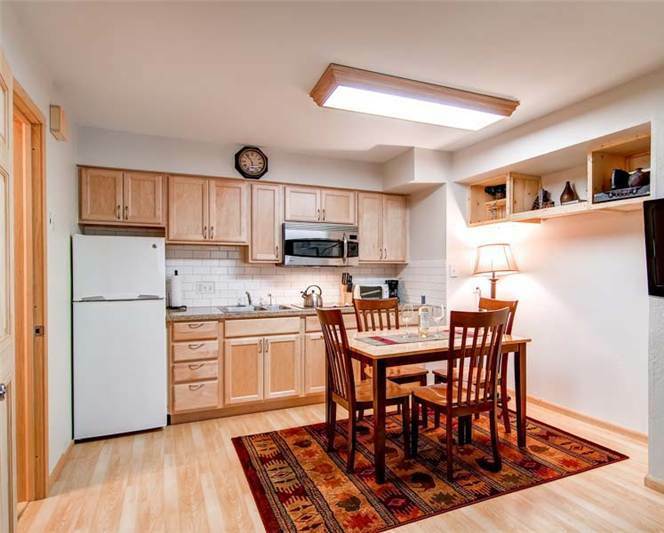 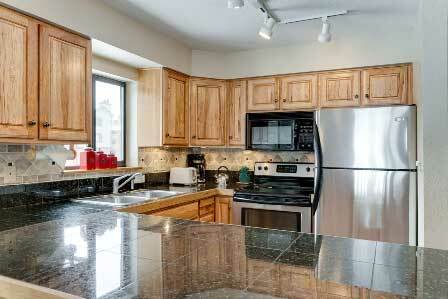 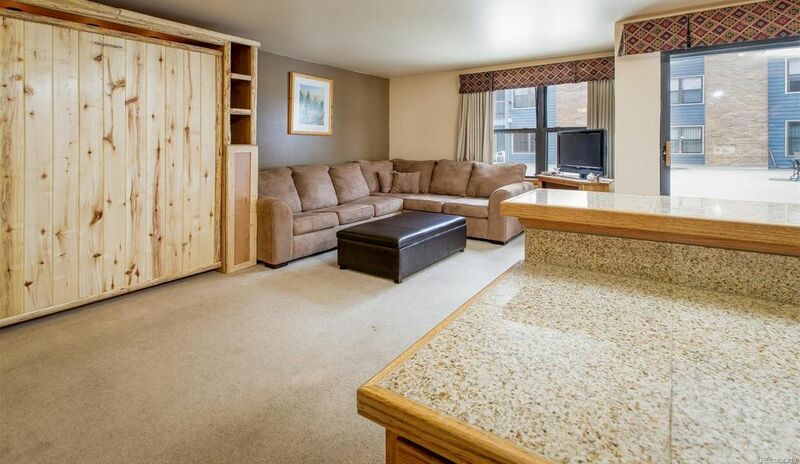 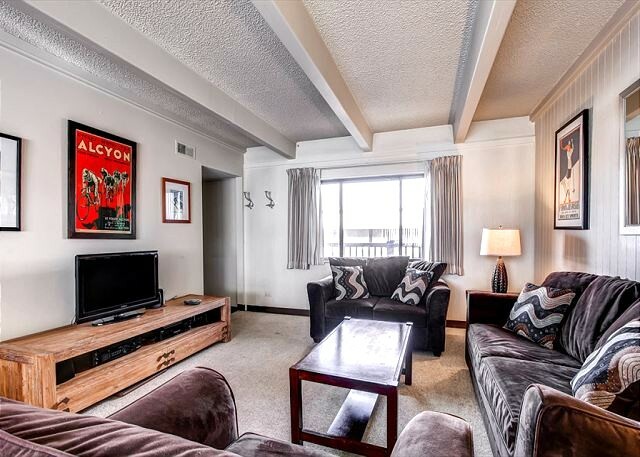 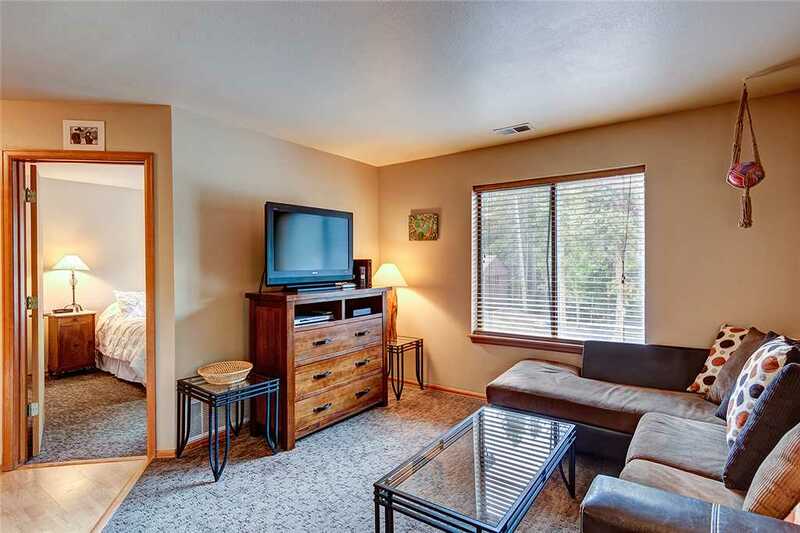 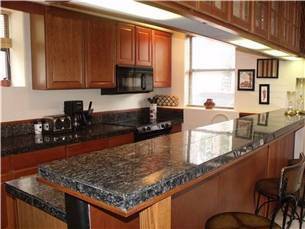 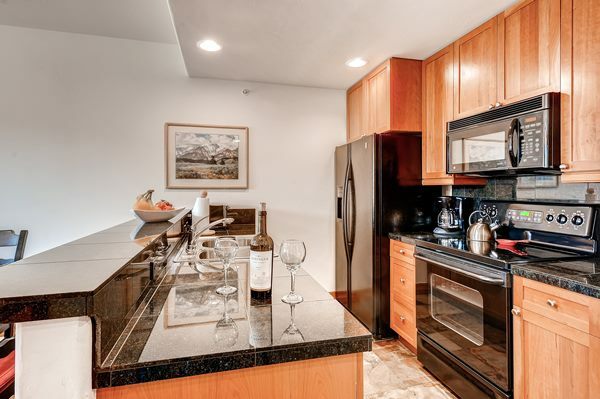 With the combination of both slope and downtown access, this unit is in the perfect location! 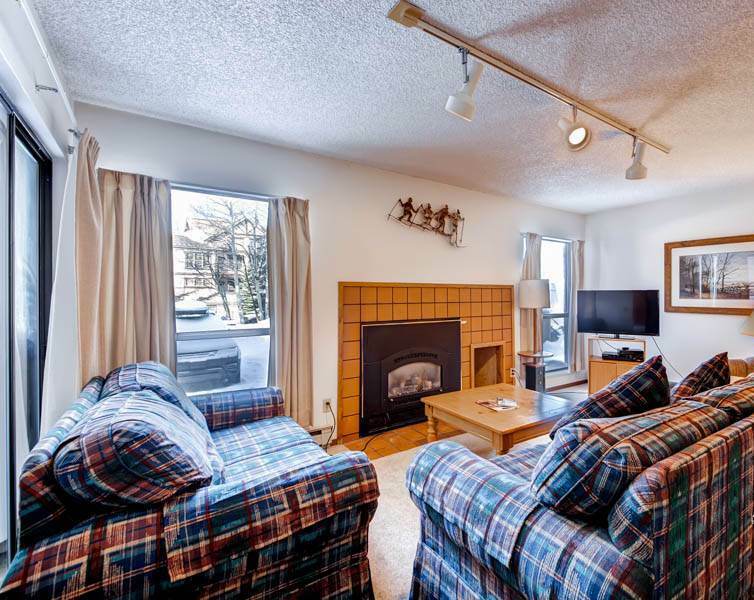 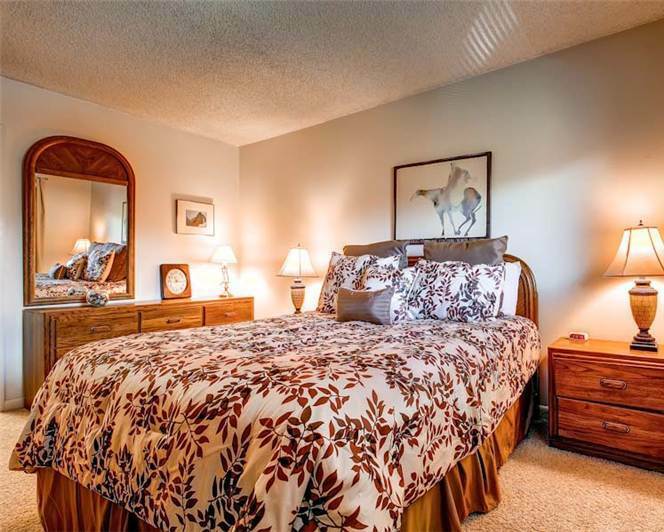 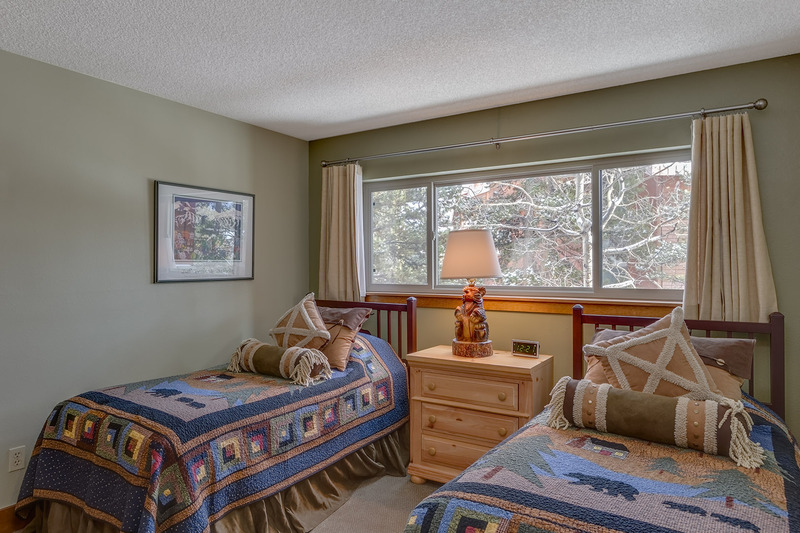 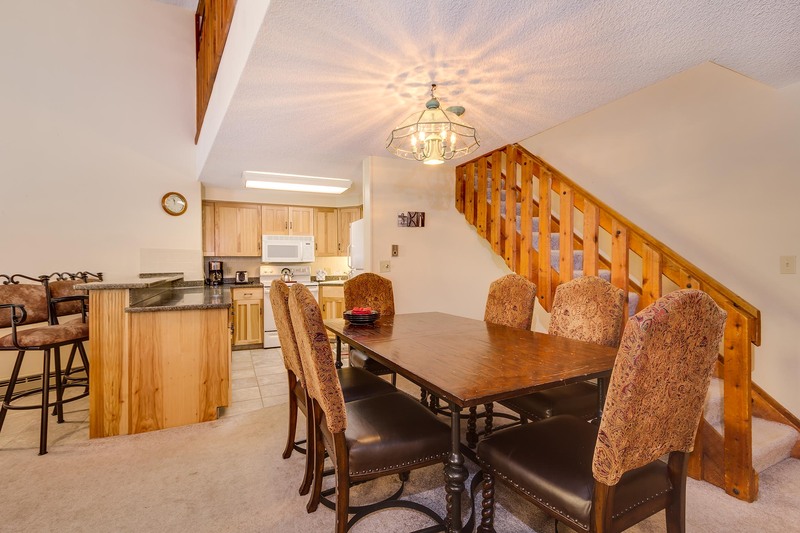 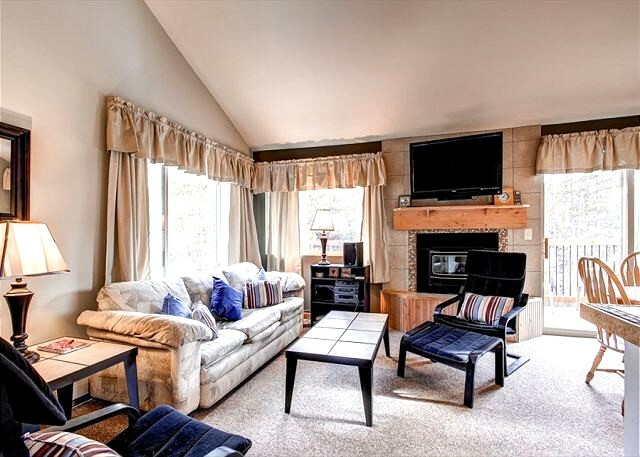 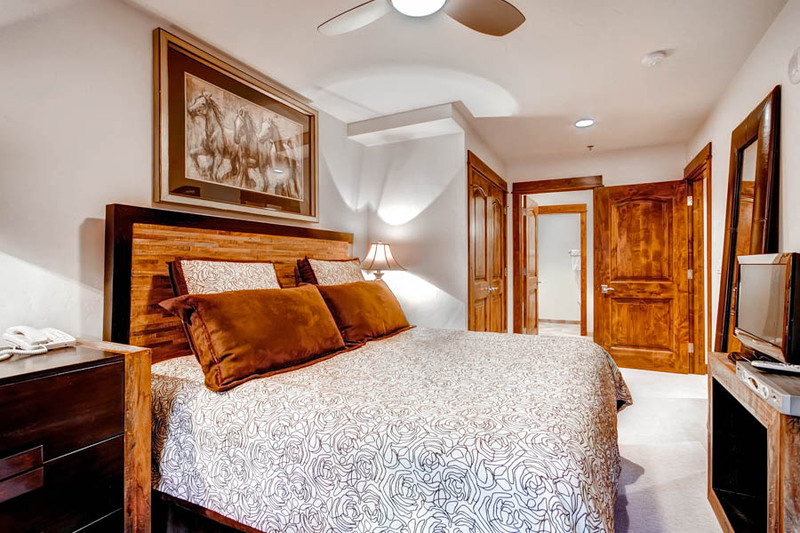 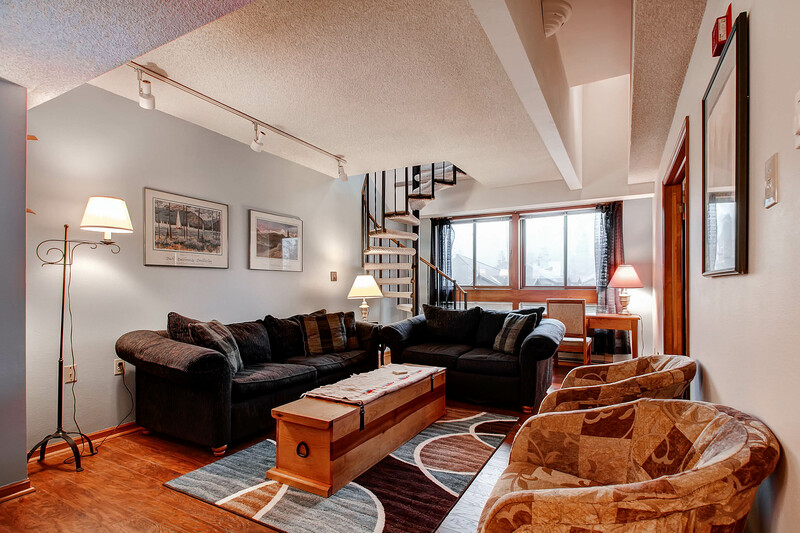 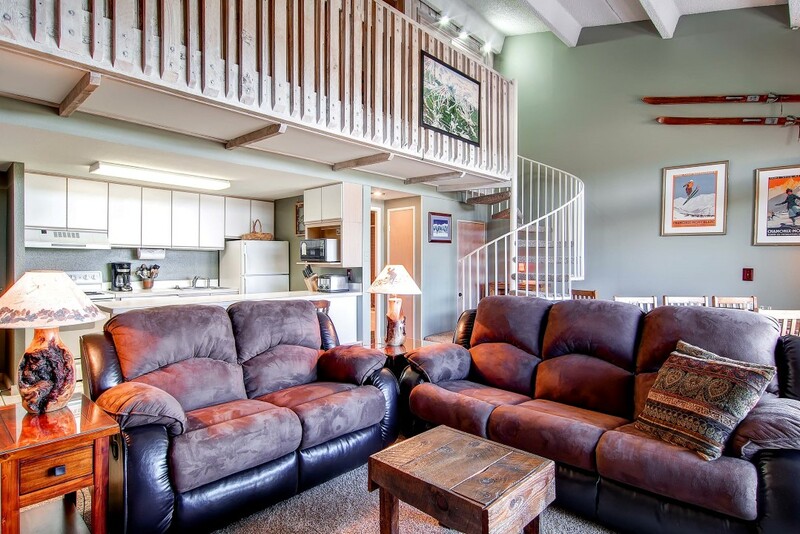 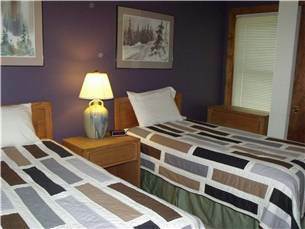 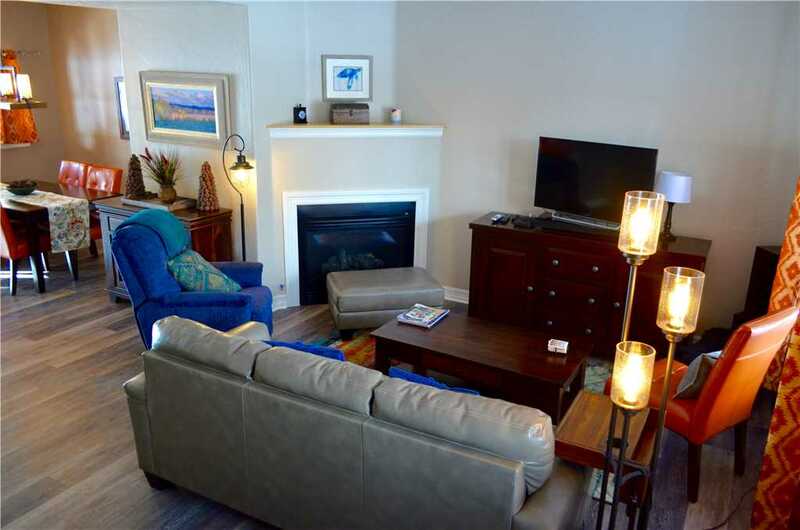 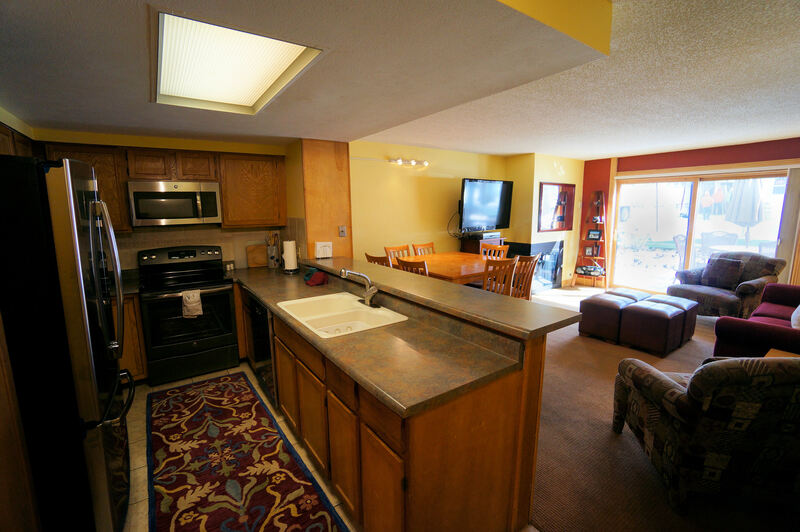 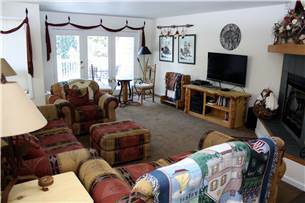 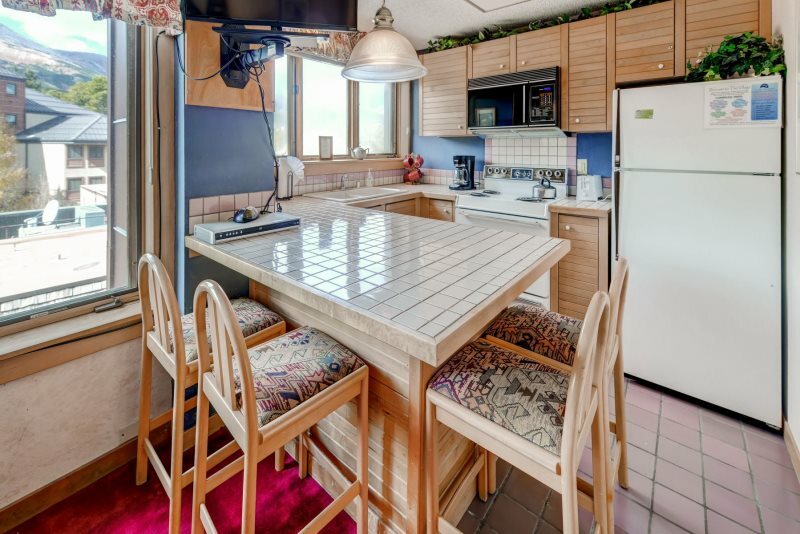 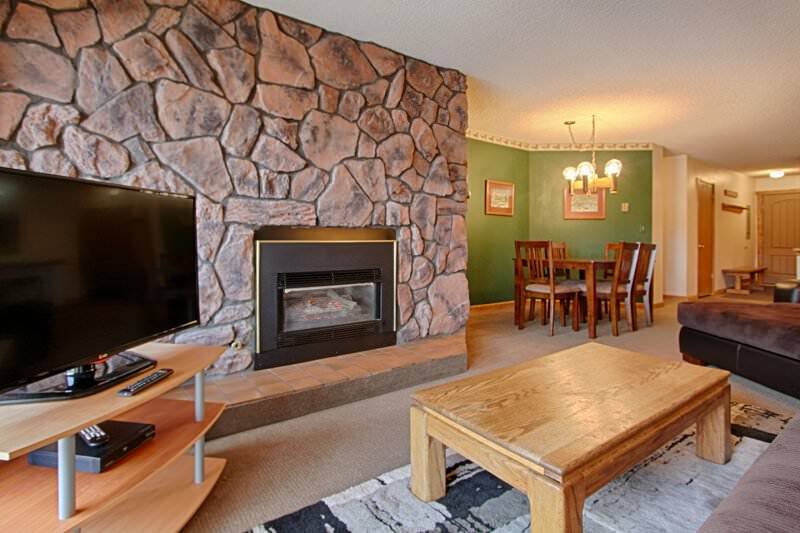 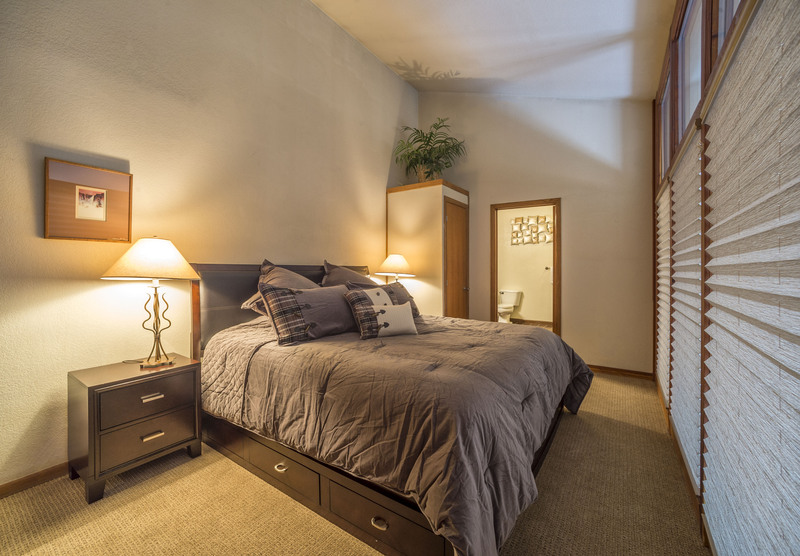 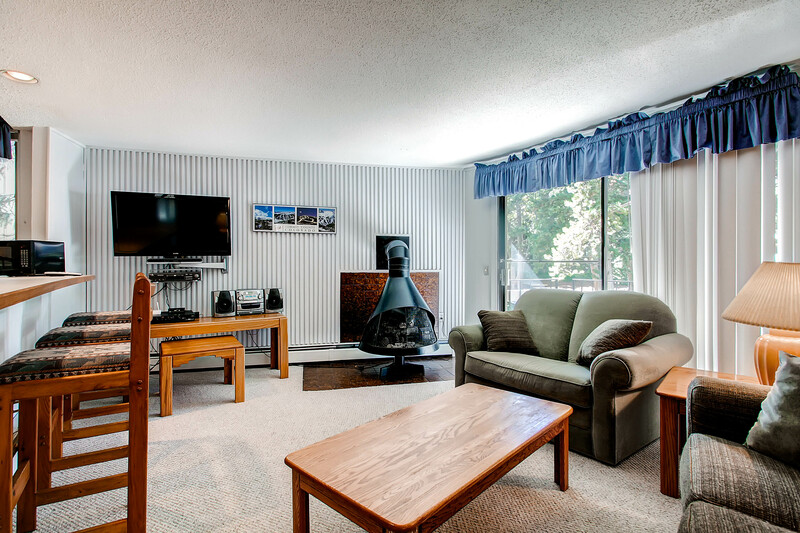 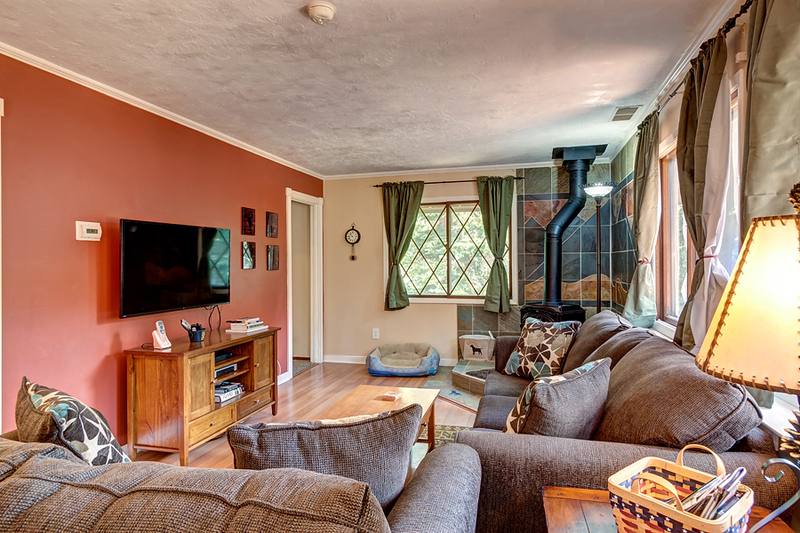 AMENITIES – This multi-level townhome offers plenty of space for your group (sleeps up to 9) to spread out including a master king suite with private bath, a queen bedroom and a twin over queen bunk bedroom with second full bath on same floor. 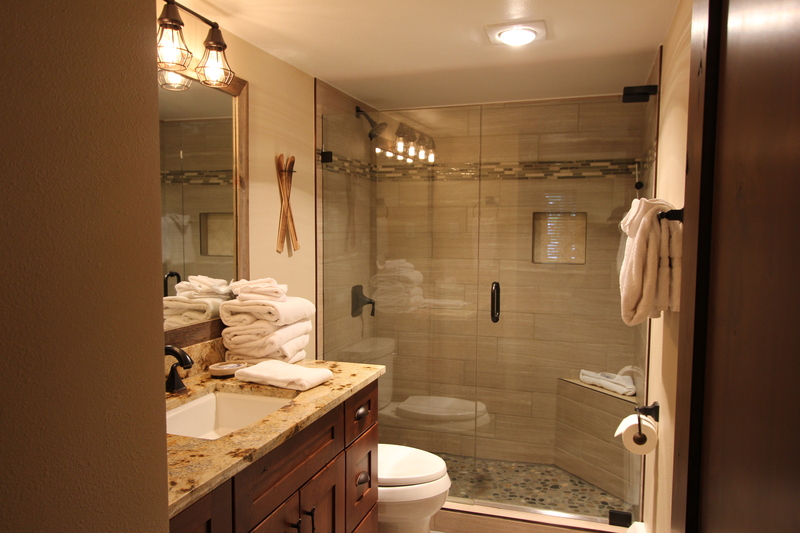 There is a third full bath on main floor. 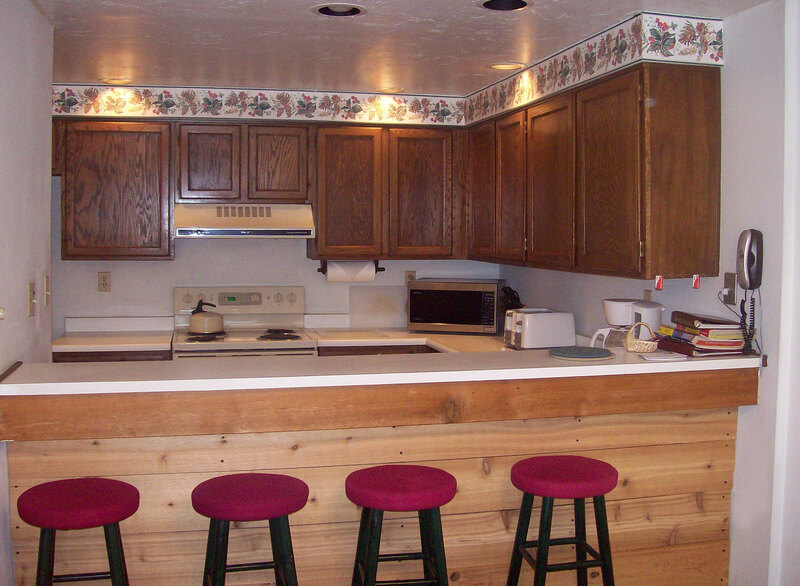 As an end unit, it is quiet and spacious. 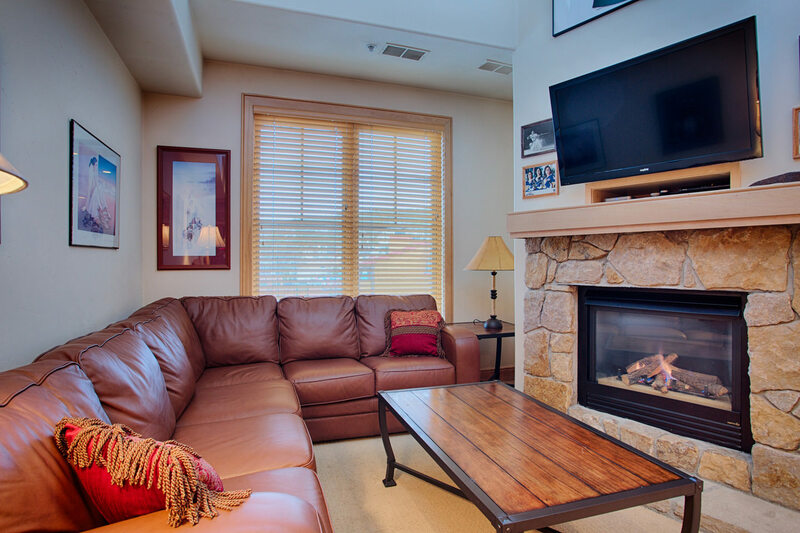 The comfortable living area is the perfect place to cozy up in front of the fire on new furniture (including additional sleeping option on queen sofa bed) while watching a movie or listening to music on upgraded sound system. 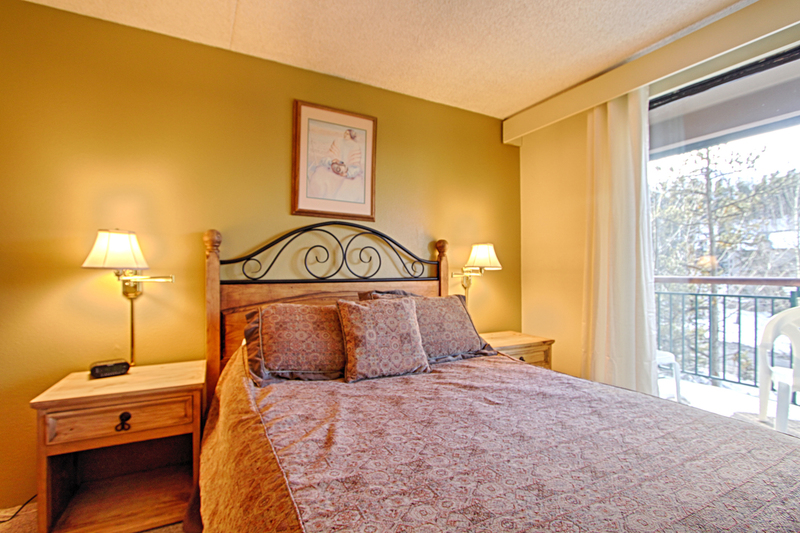 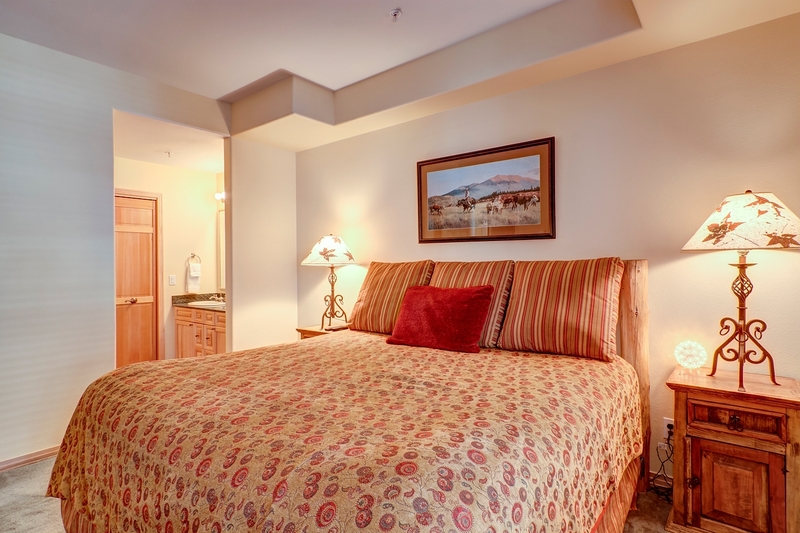 Every bedroom has a flat screen TV with cable and there is free Wi-Fi available throughout. 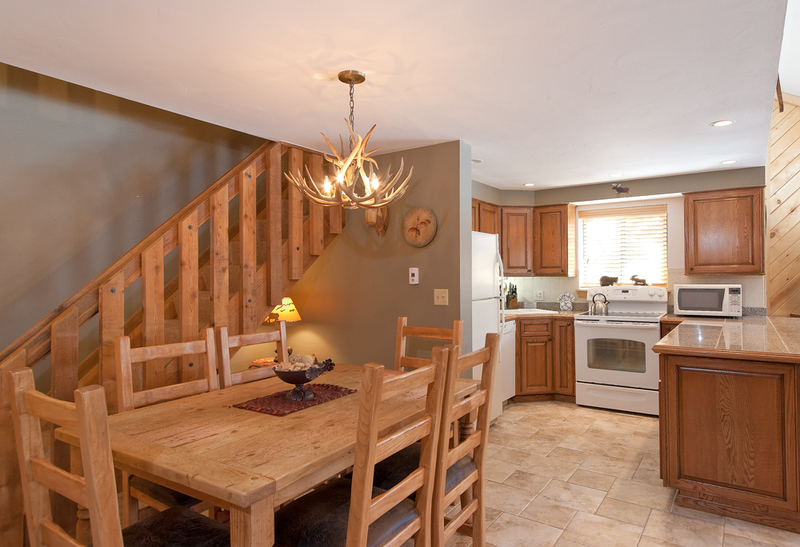 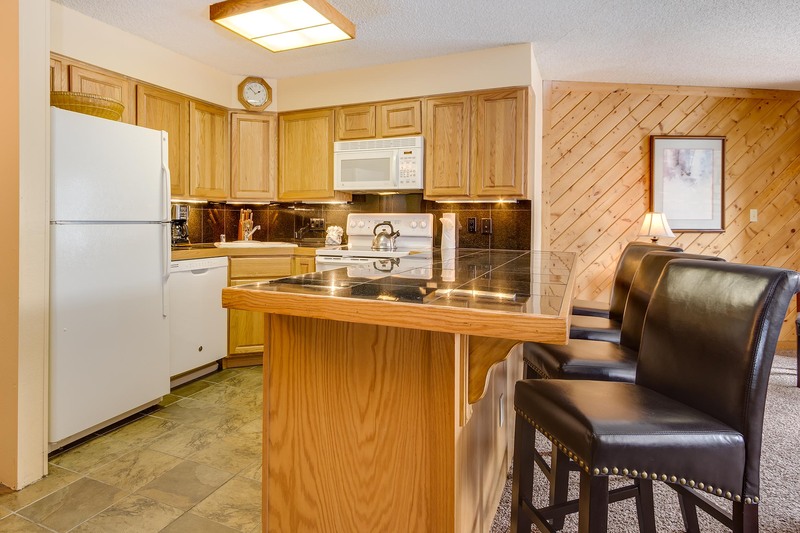 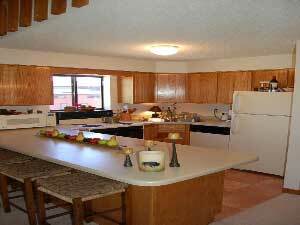 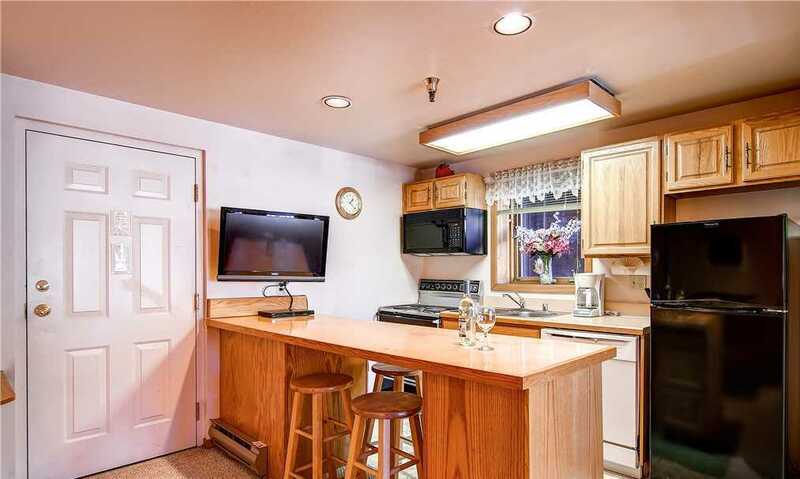 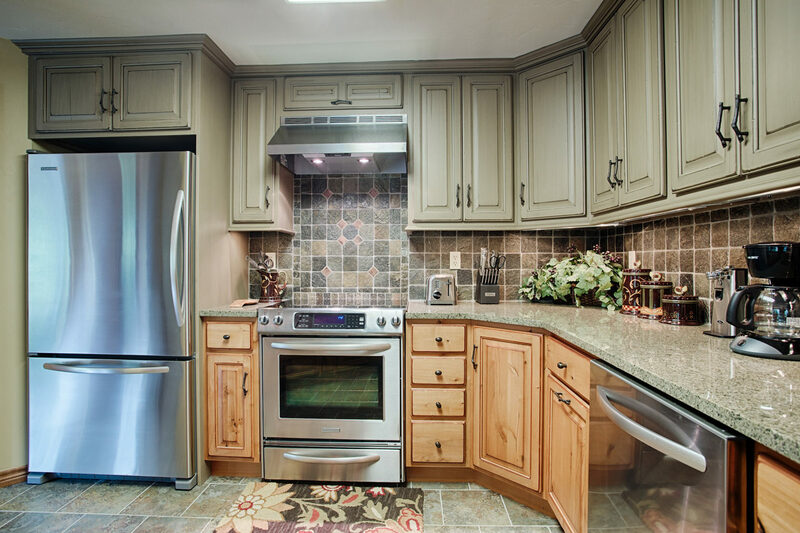 The washer and dryer located in kitchen allows you to spend a week or more here and never want to leave. 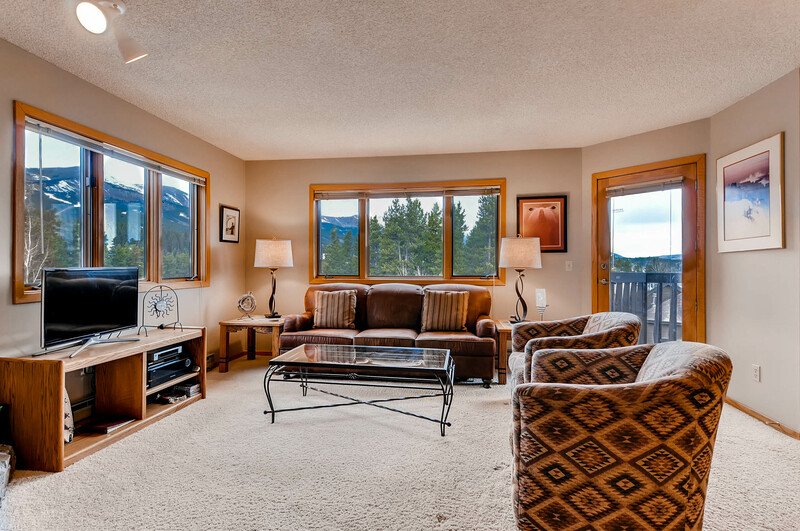 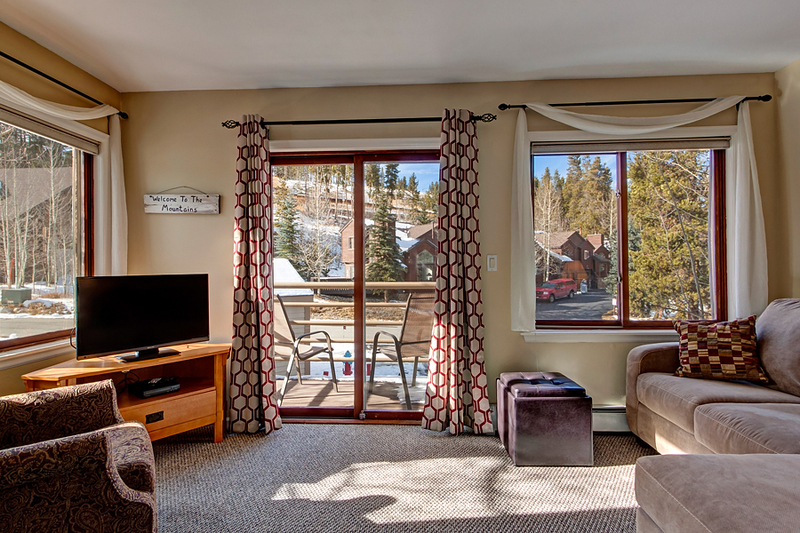 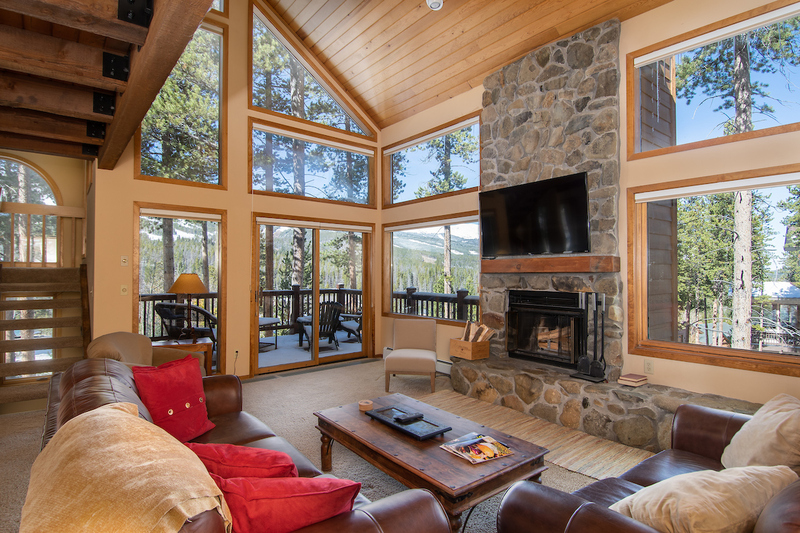 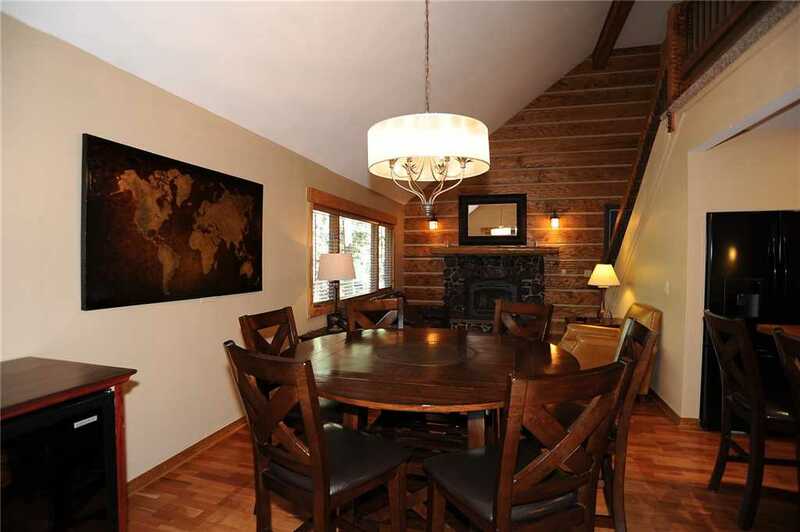 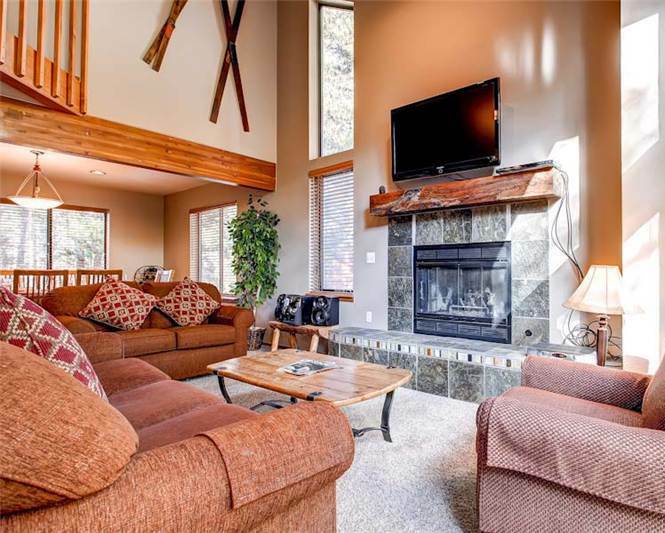 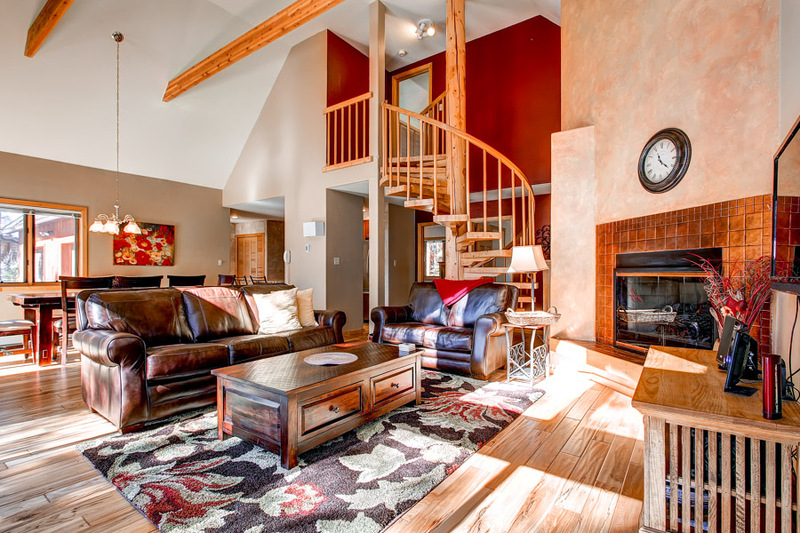 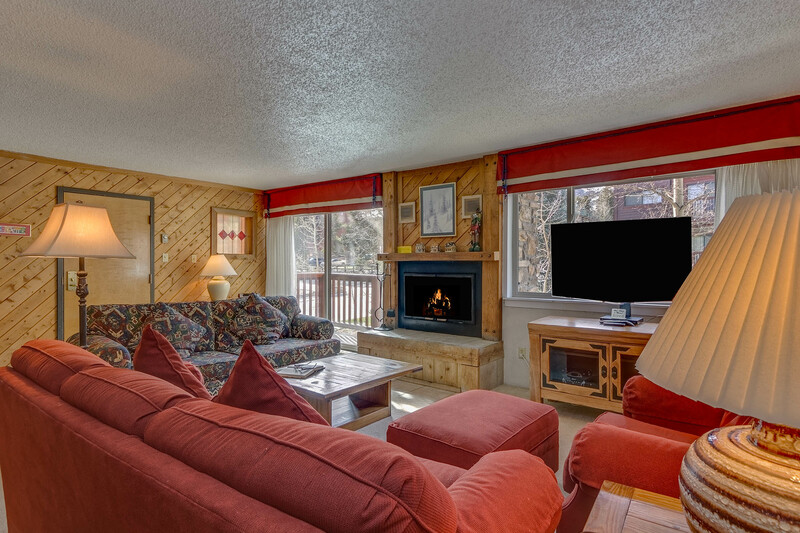 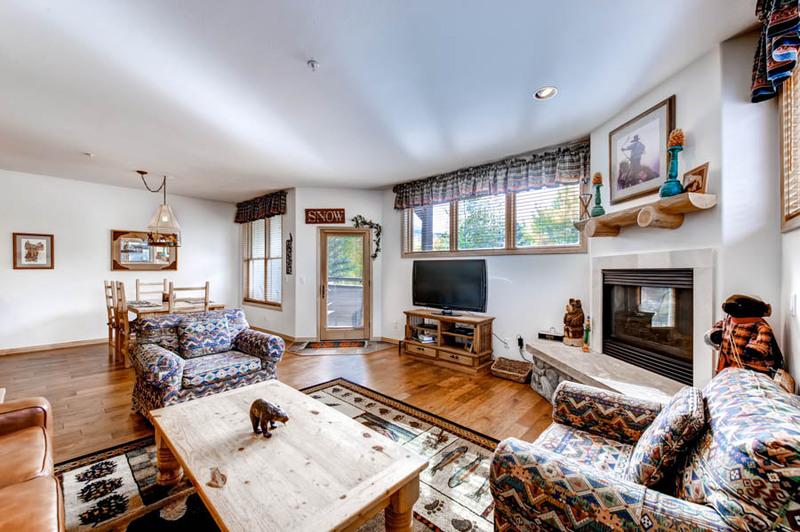 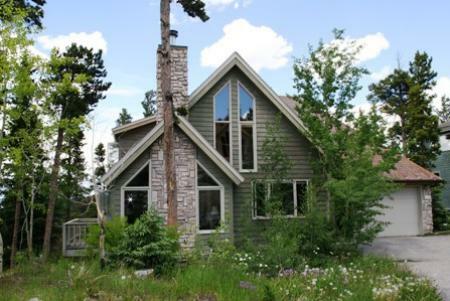 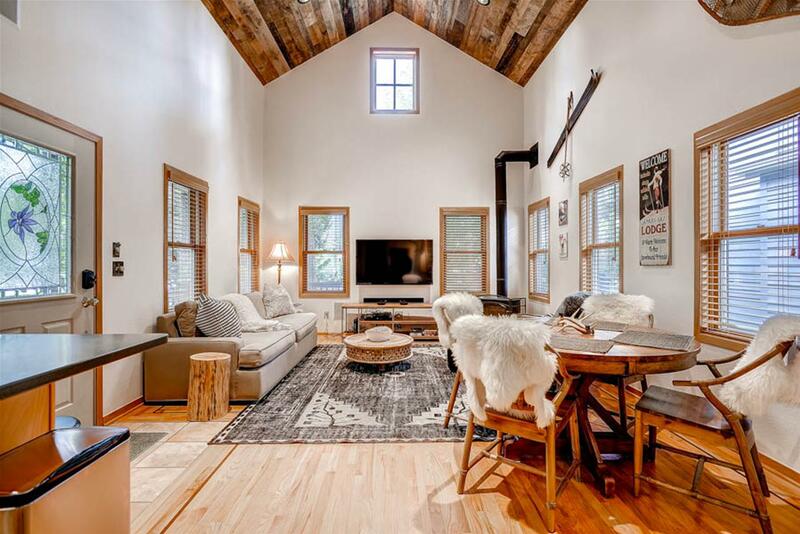 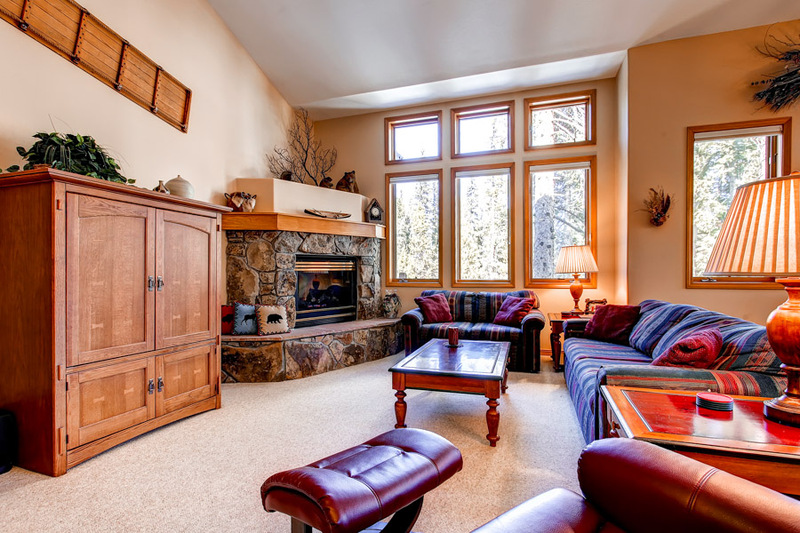 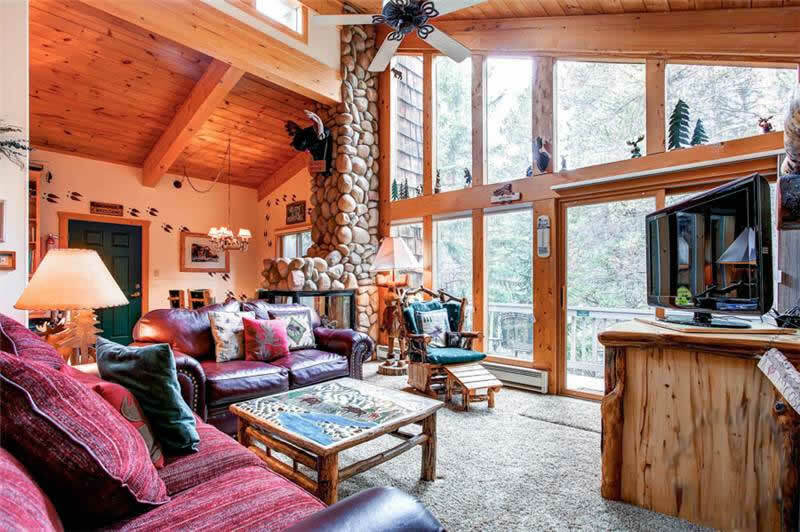 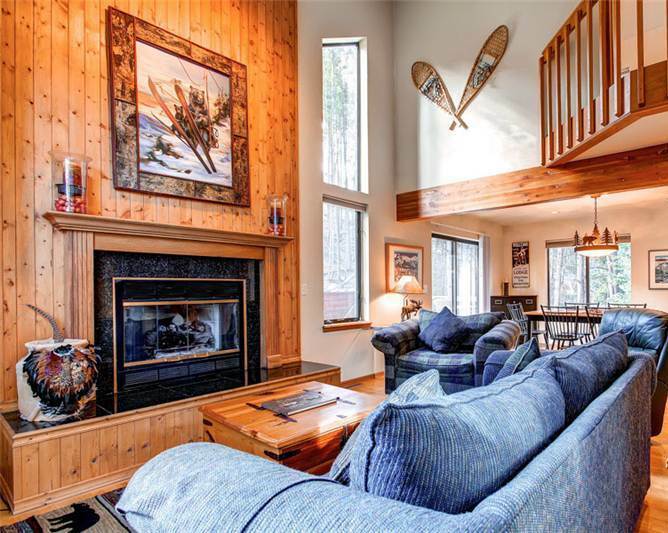 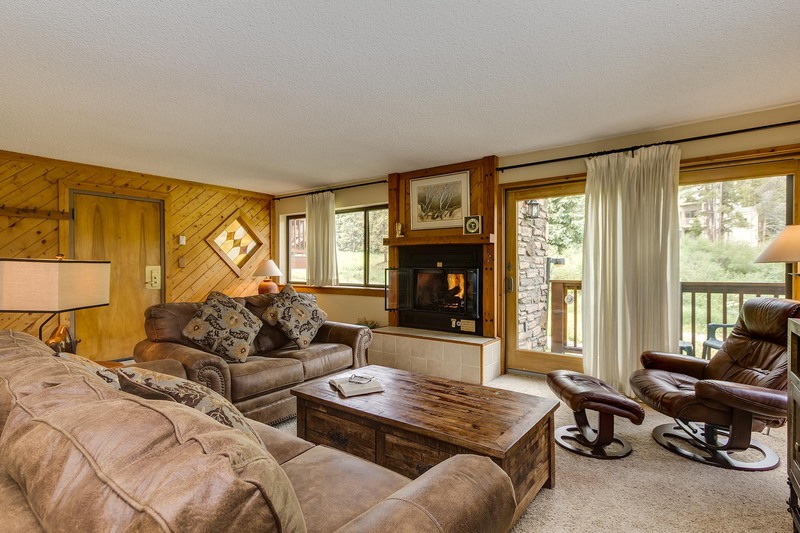 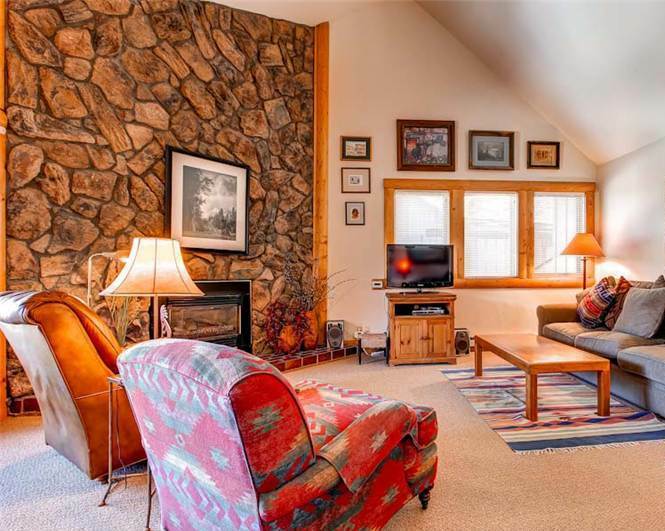 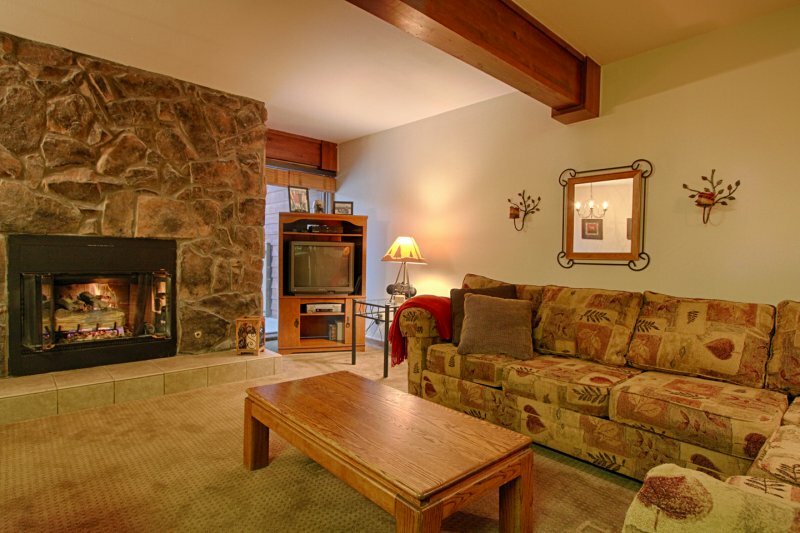 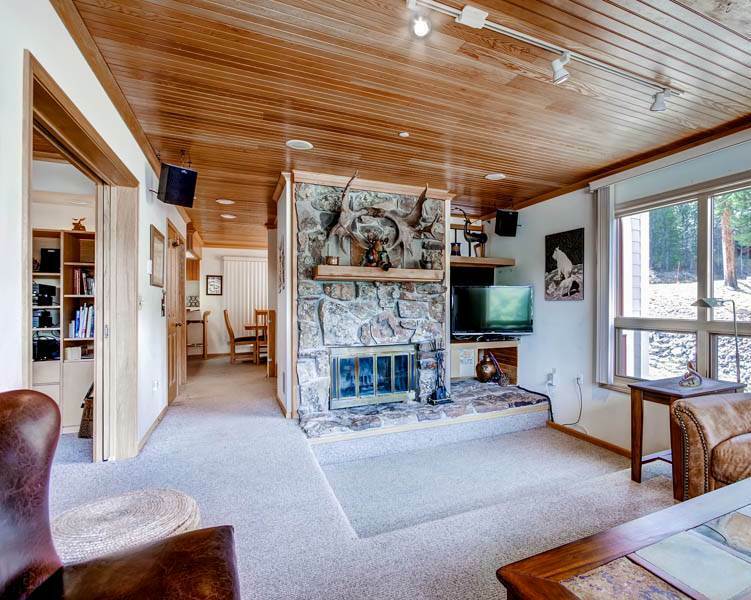 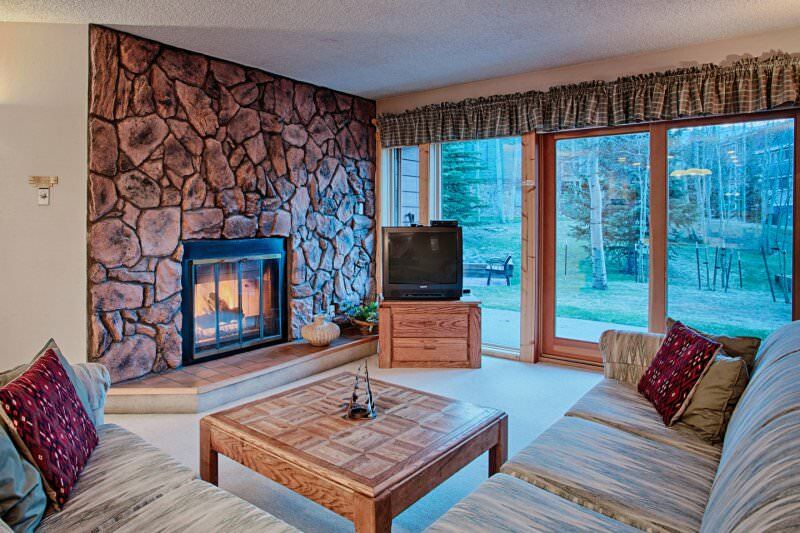 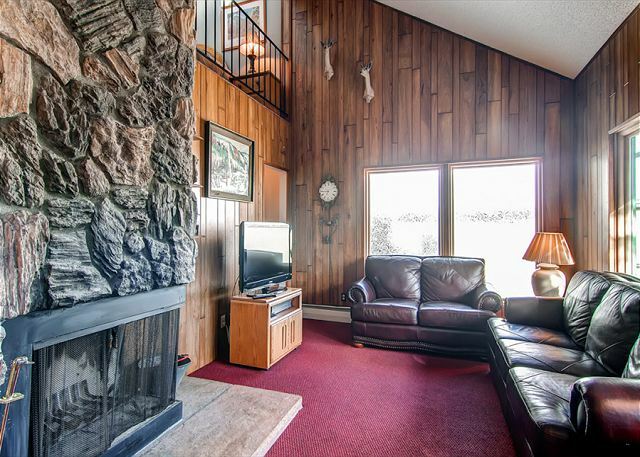 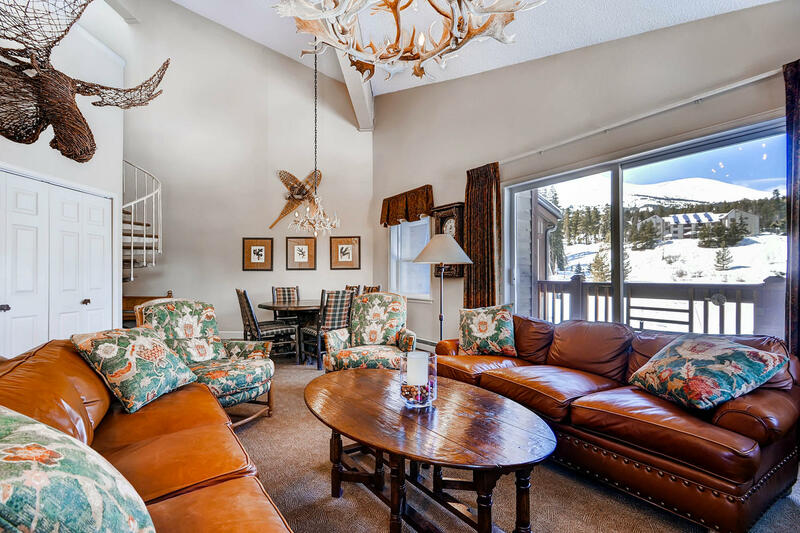 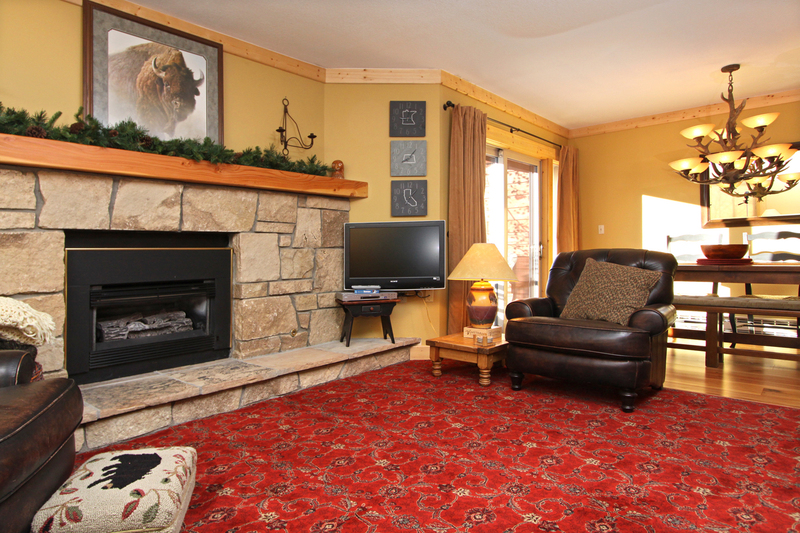 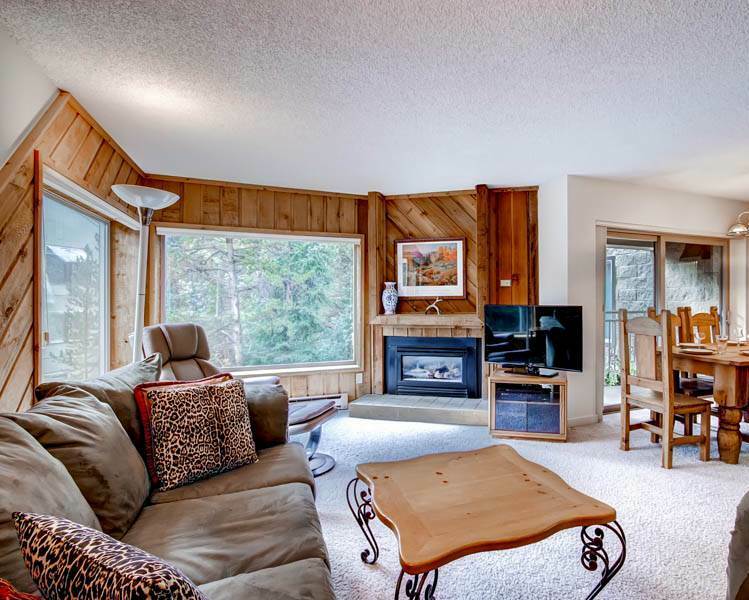 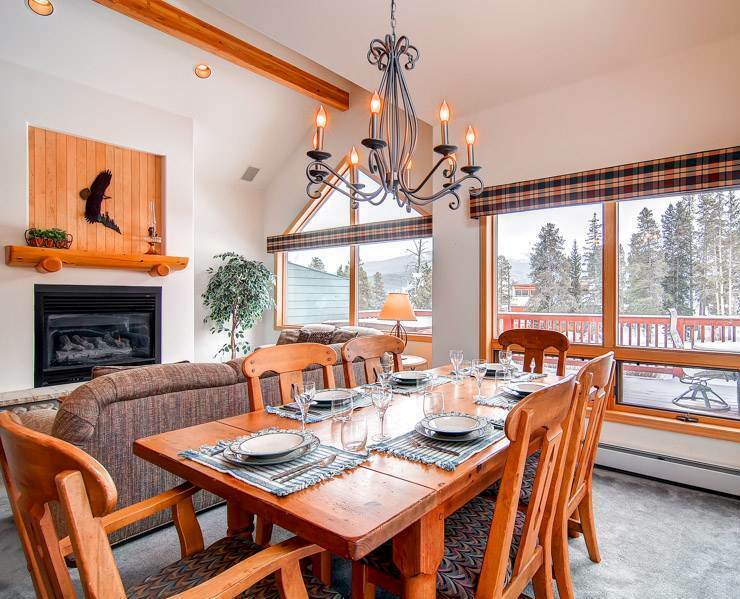 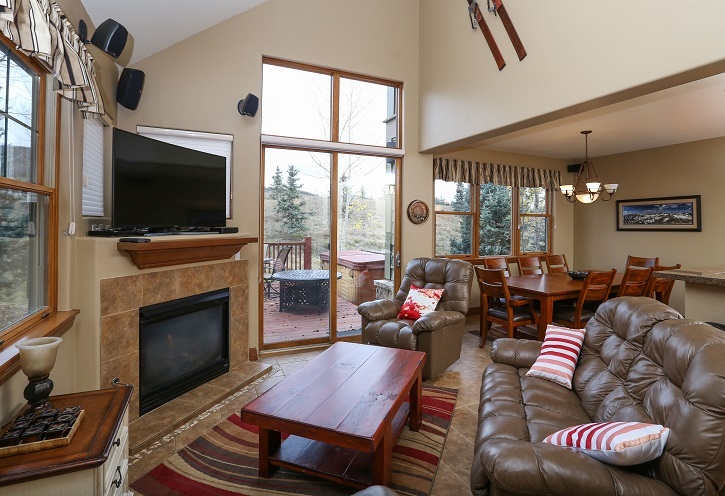 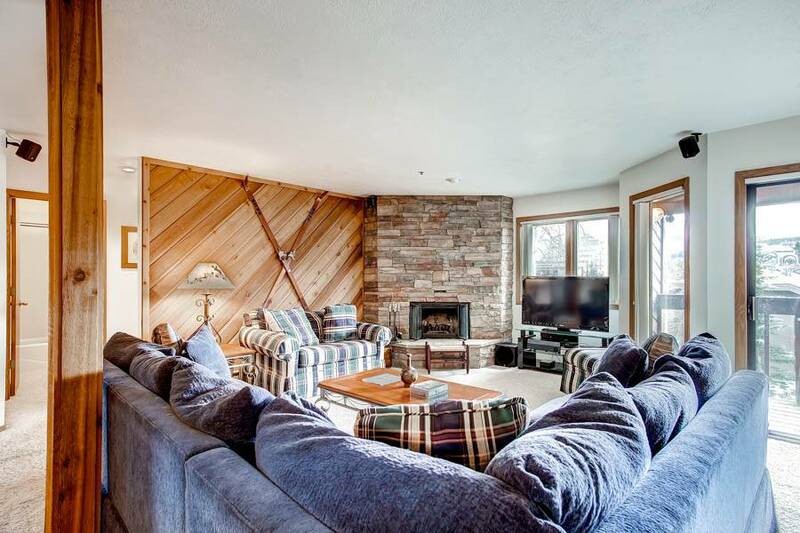 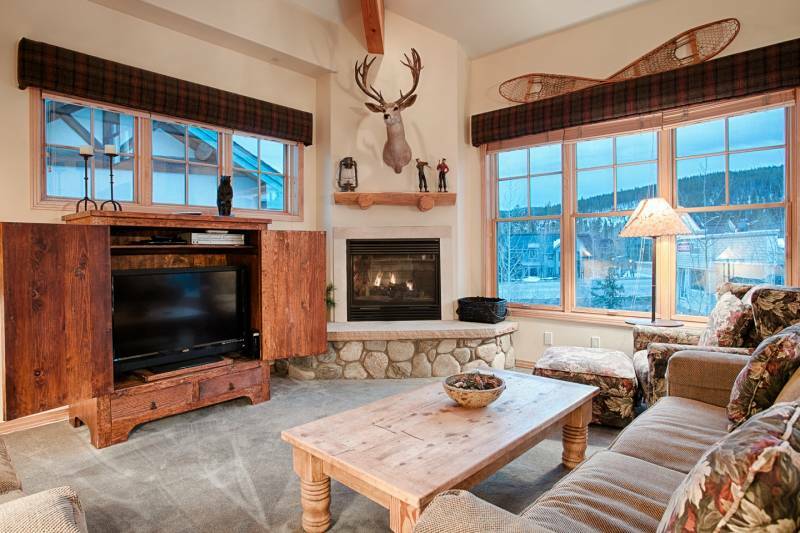 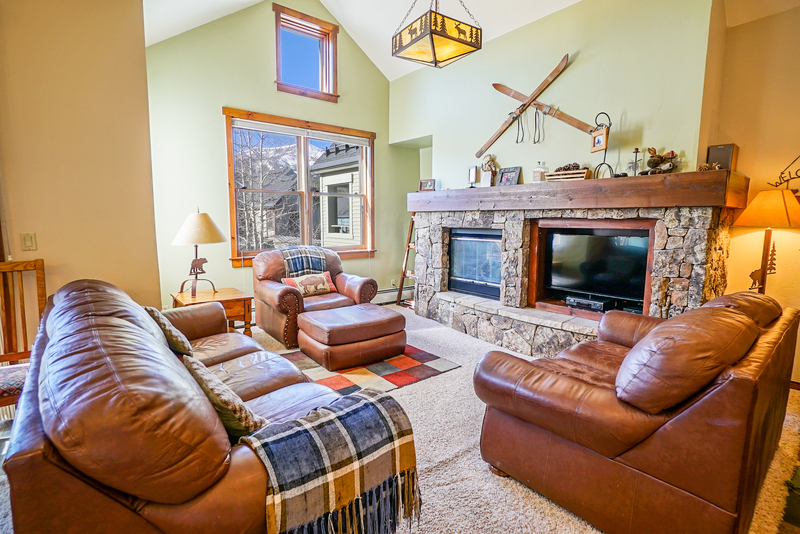 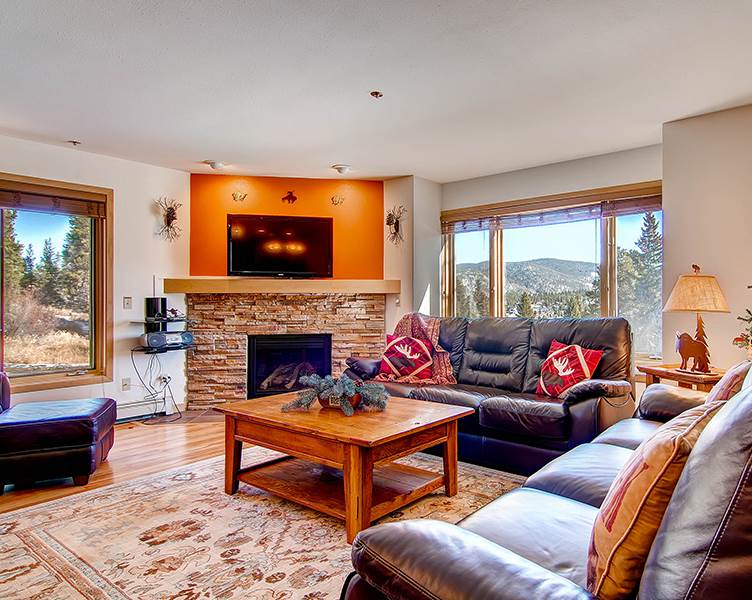 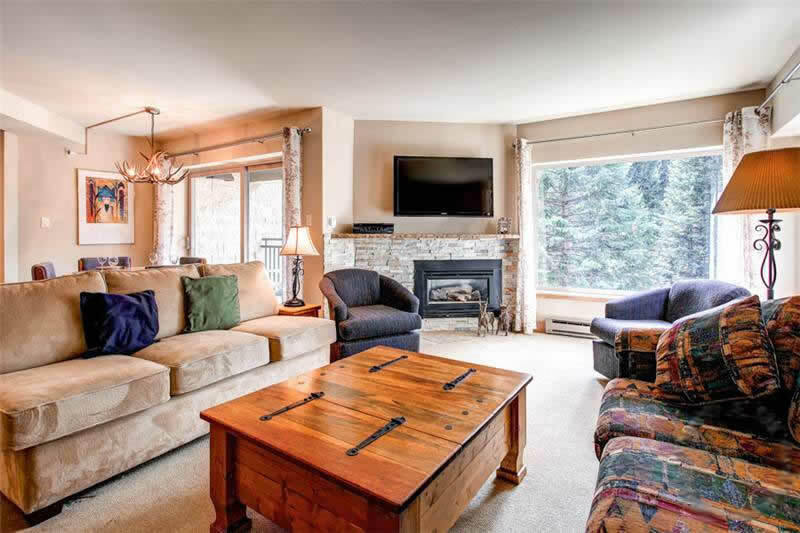 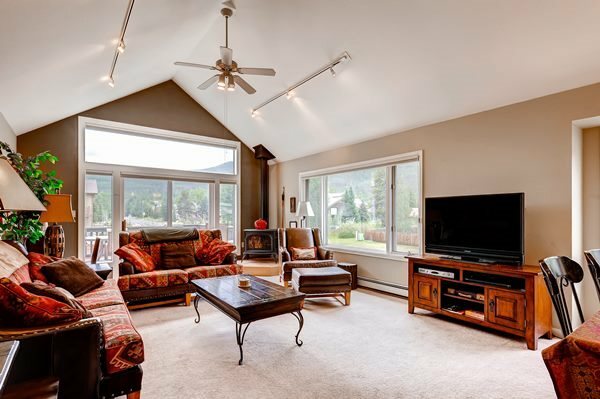 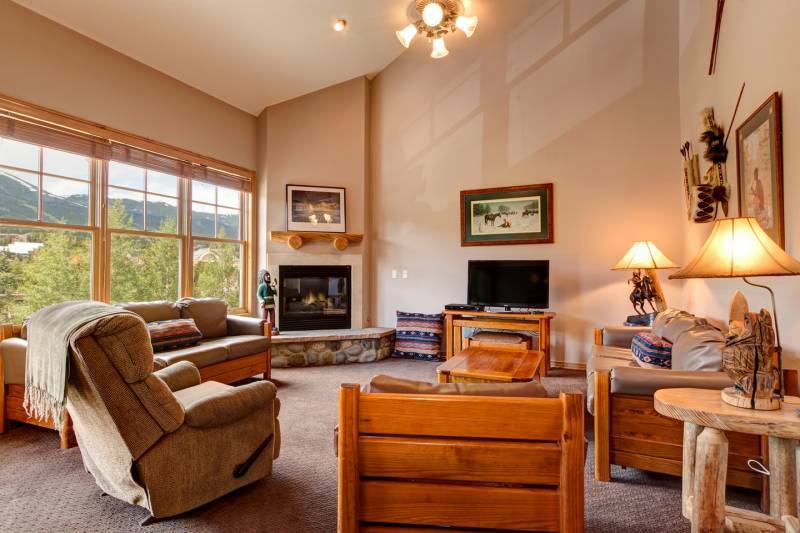 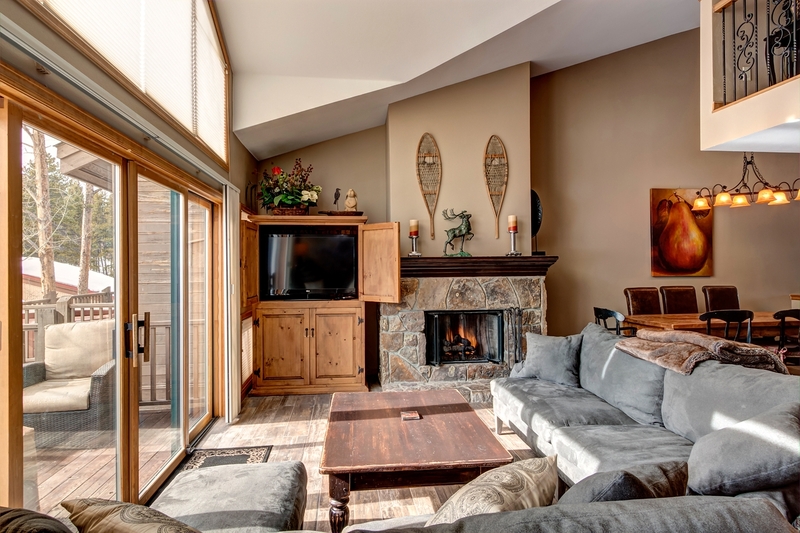 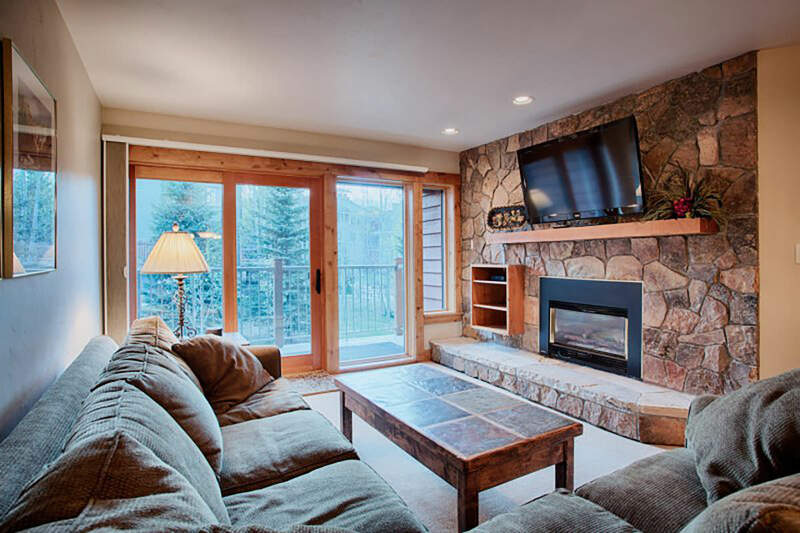 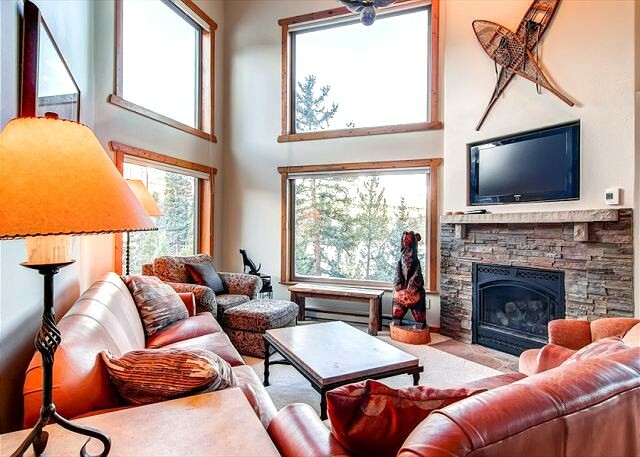 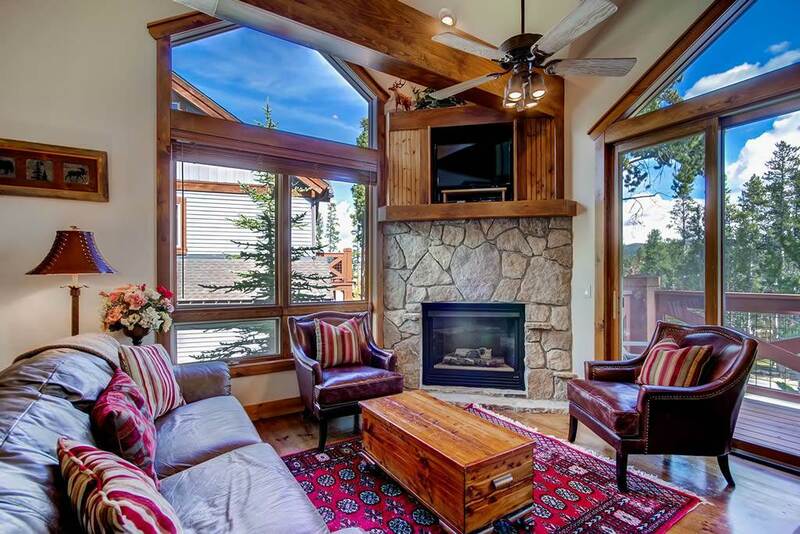 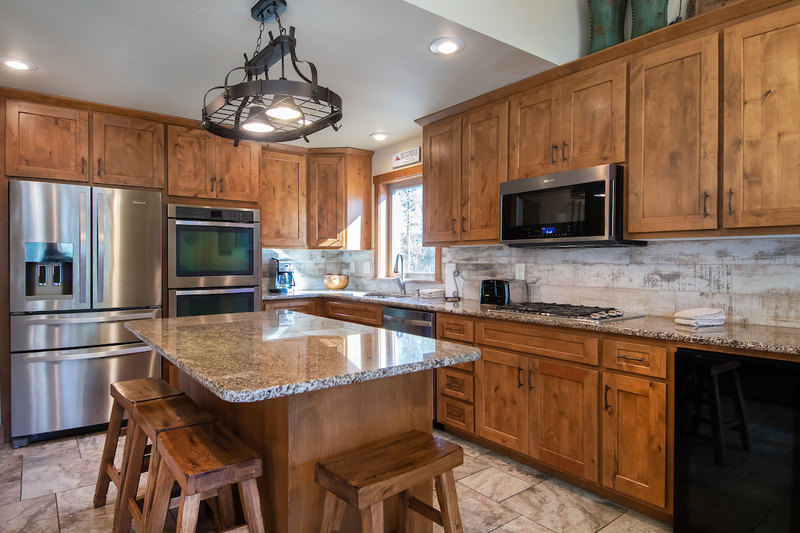 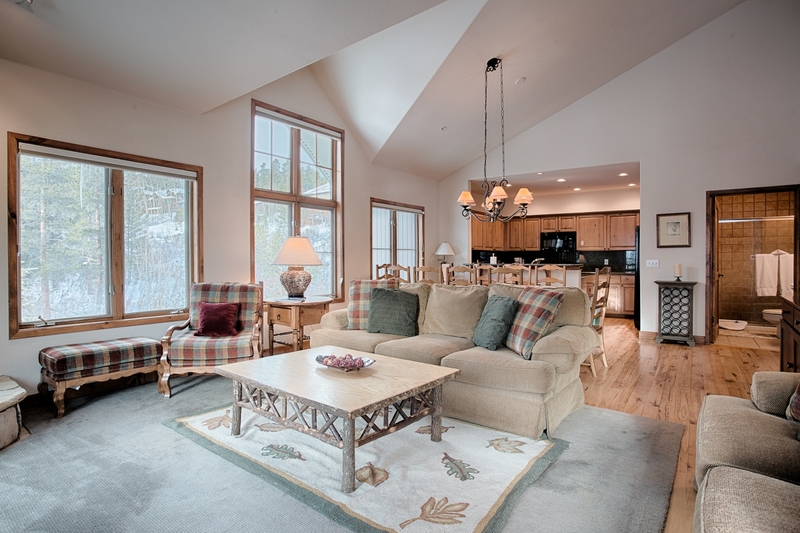 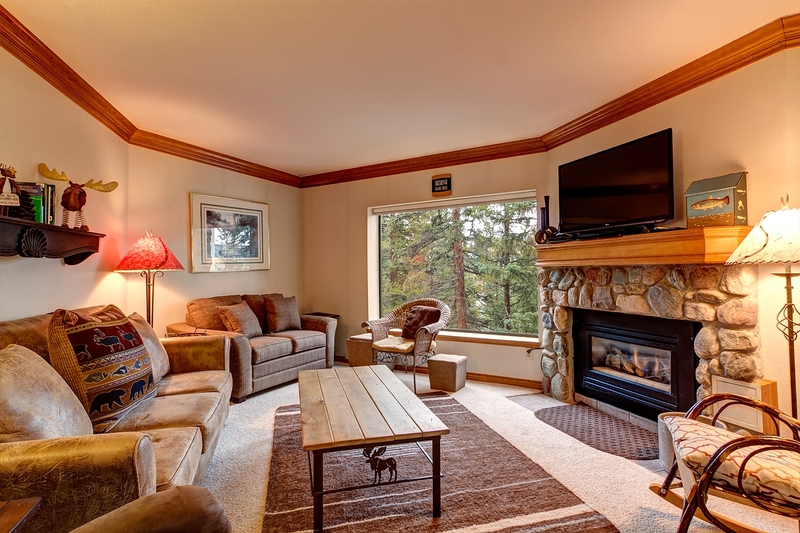 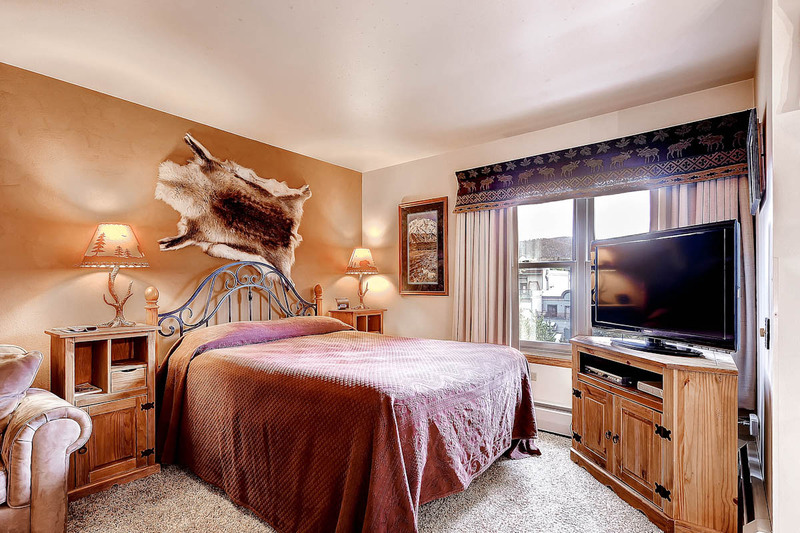 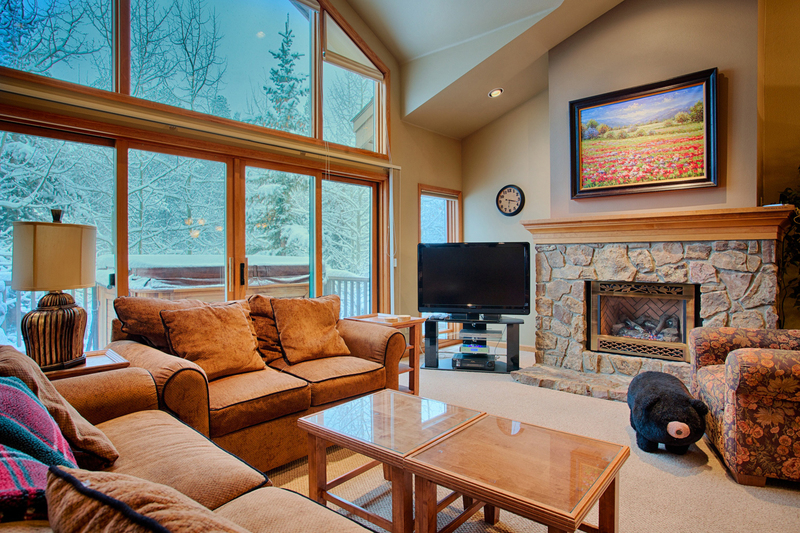 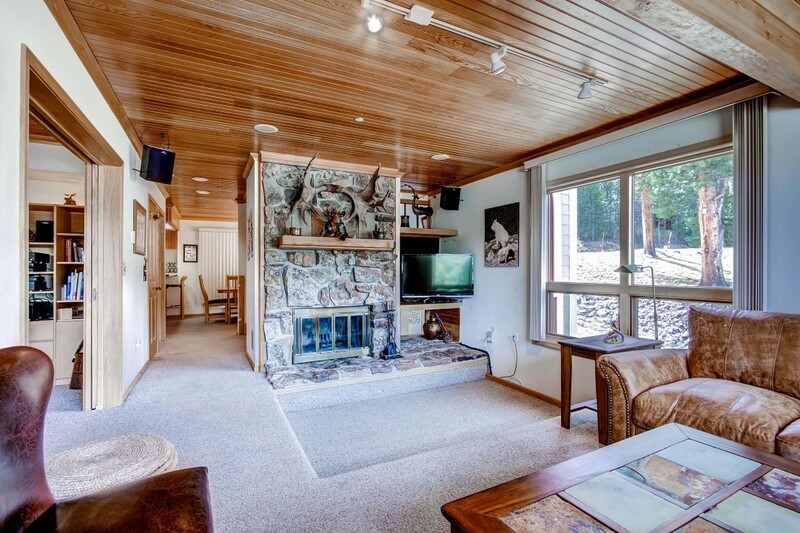 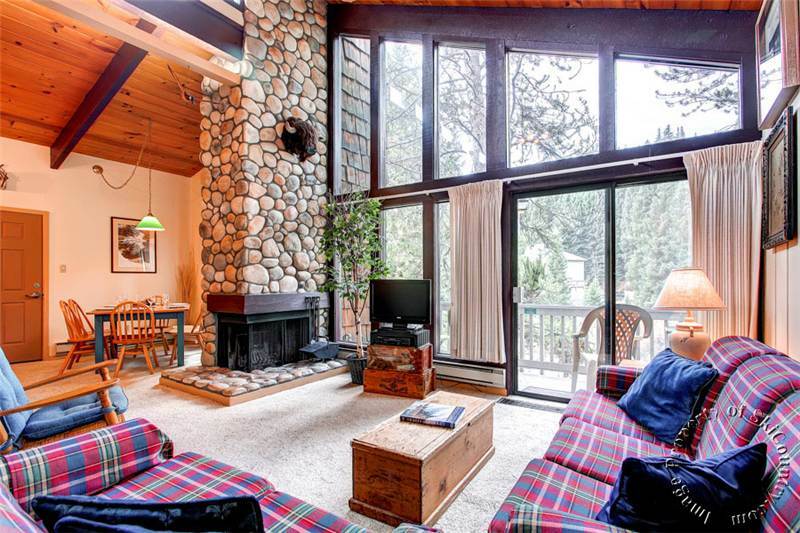 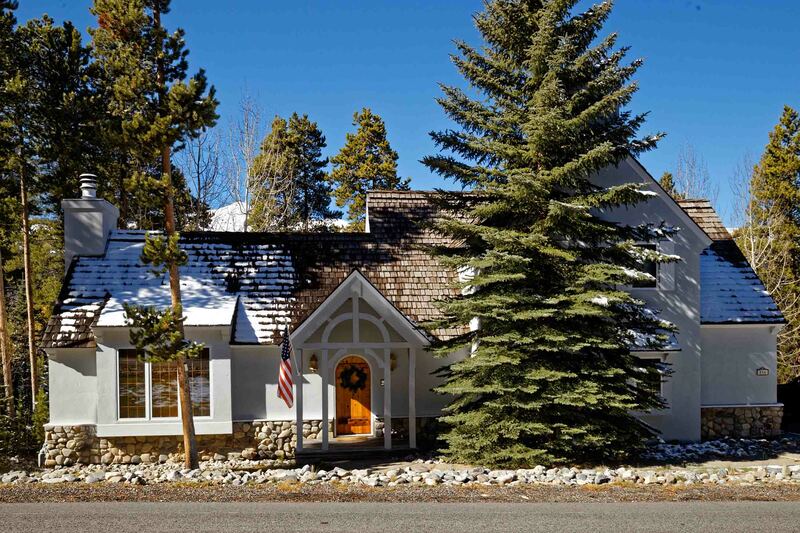 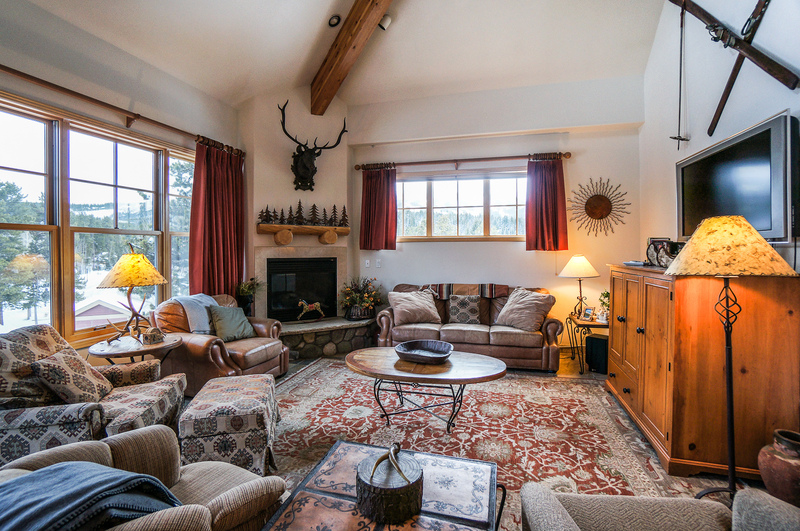 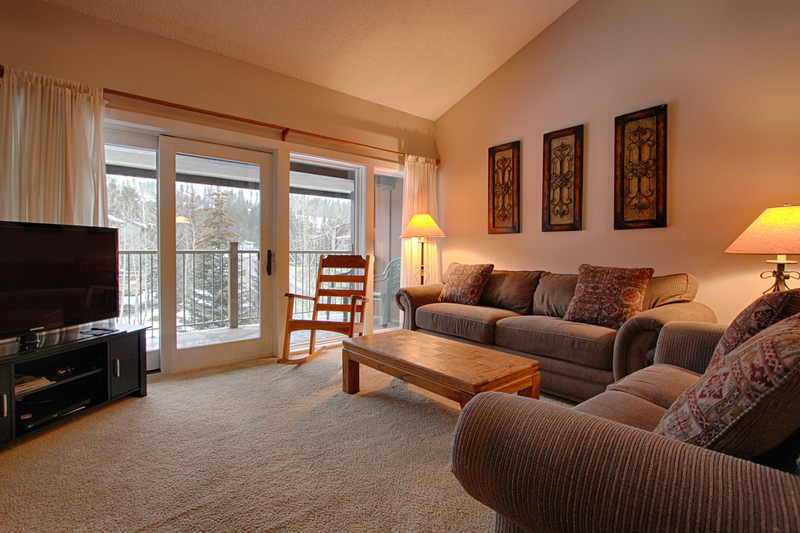 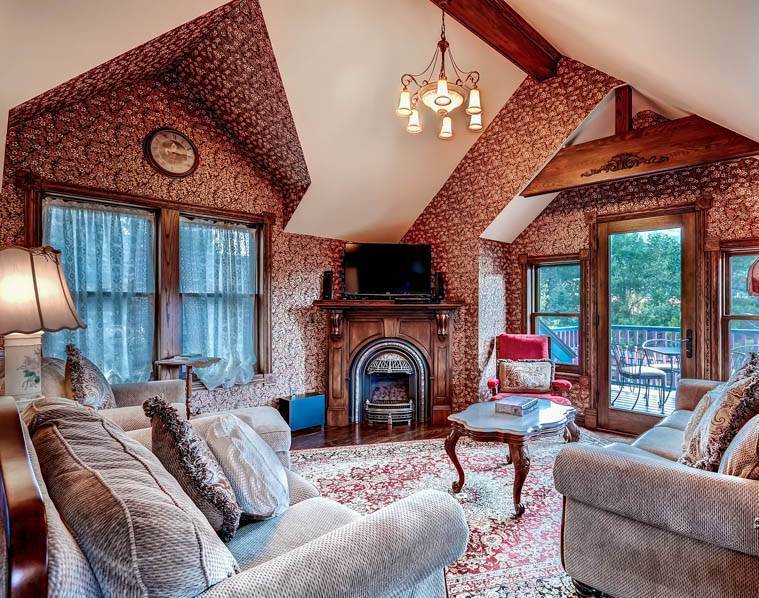 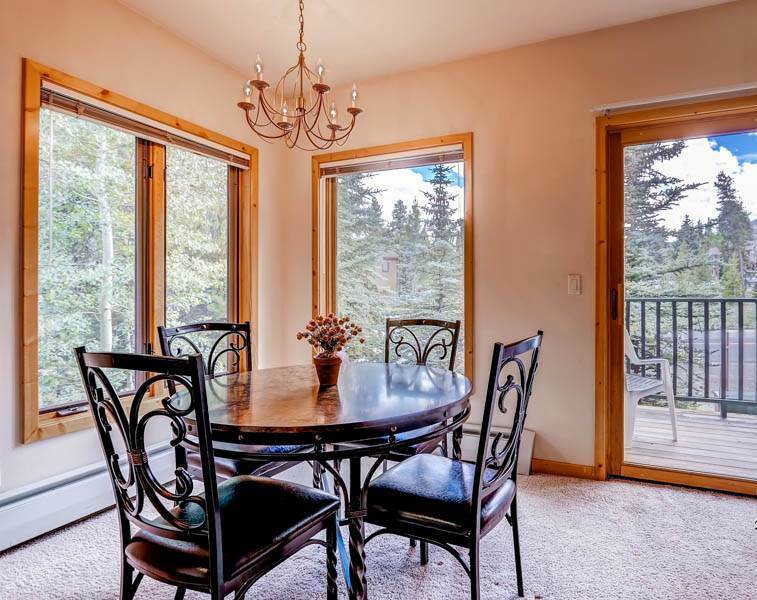 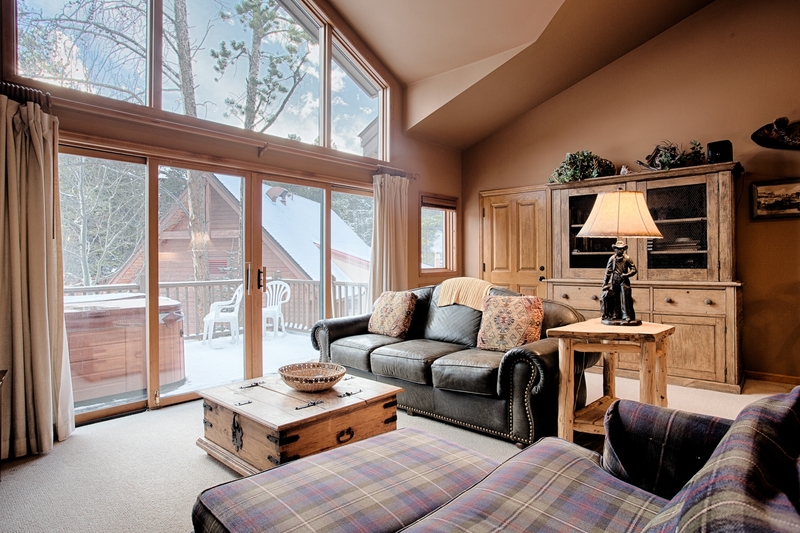 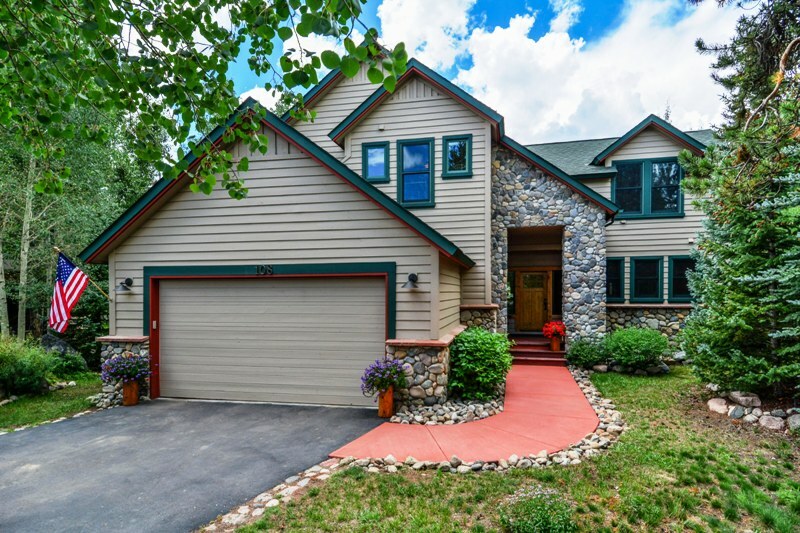 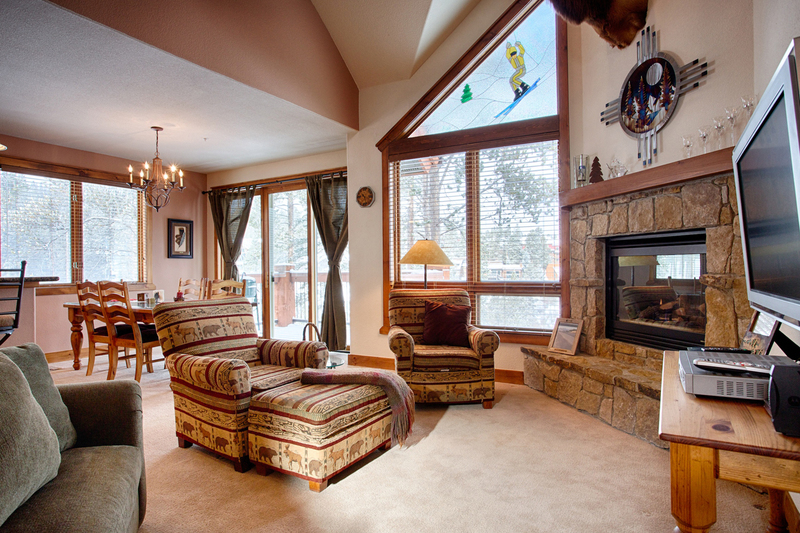 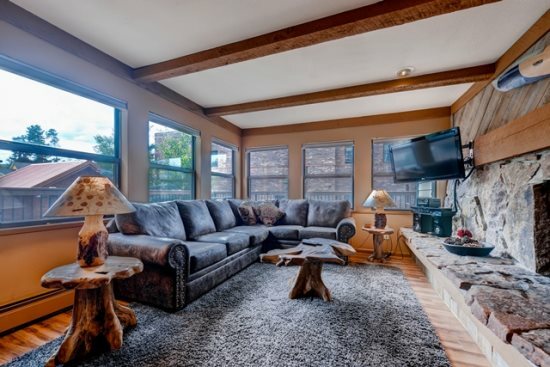 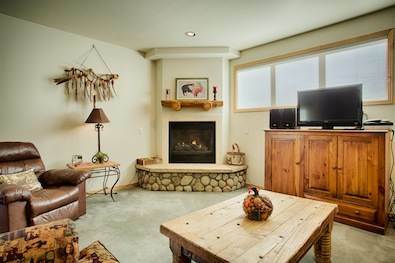 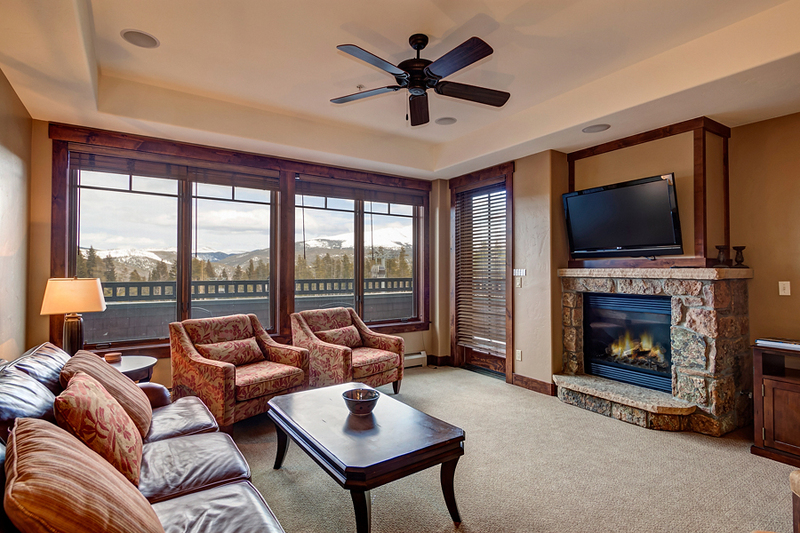 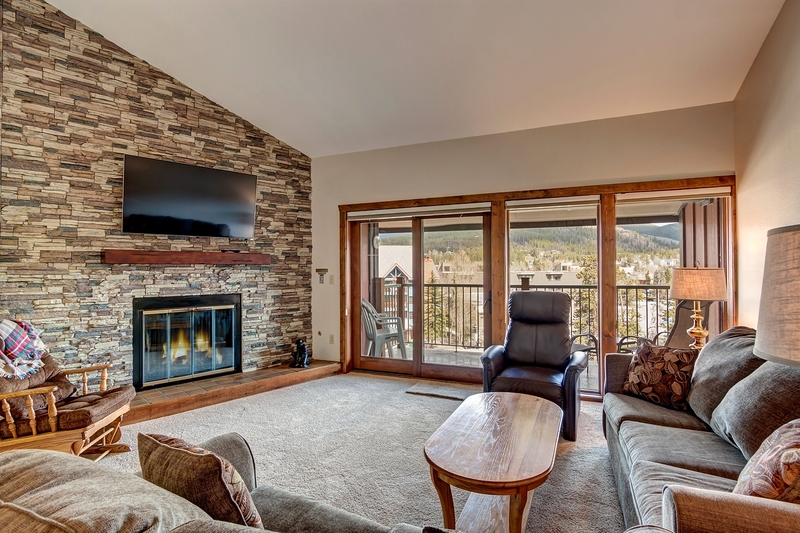 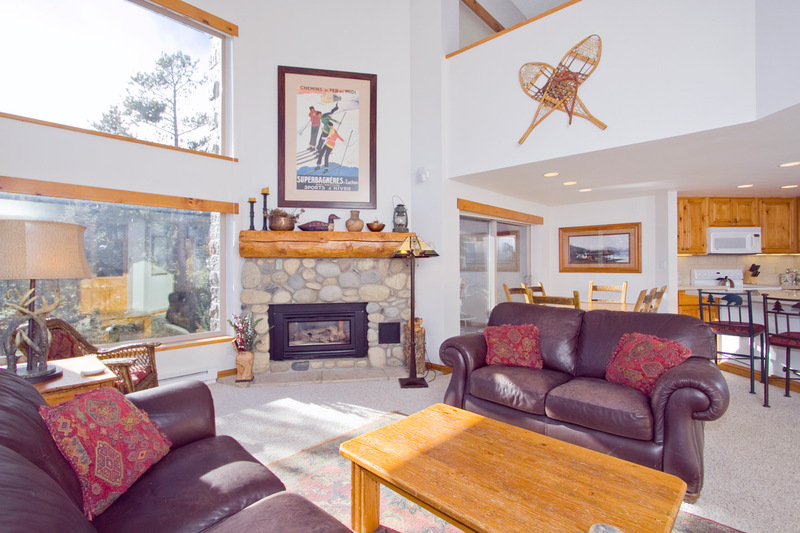 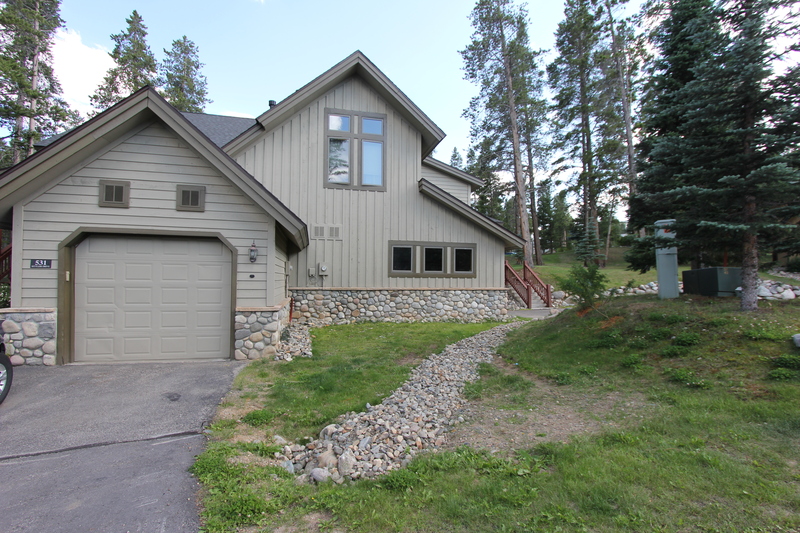 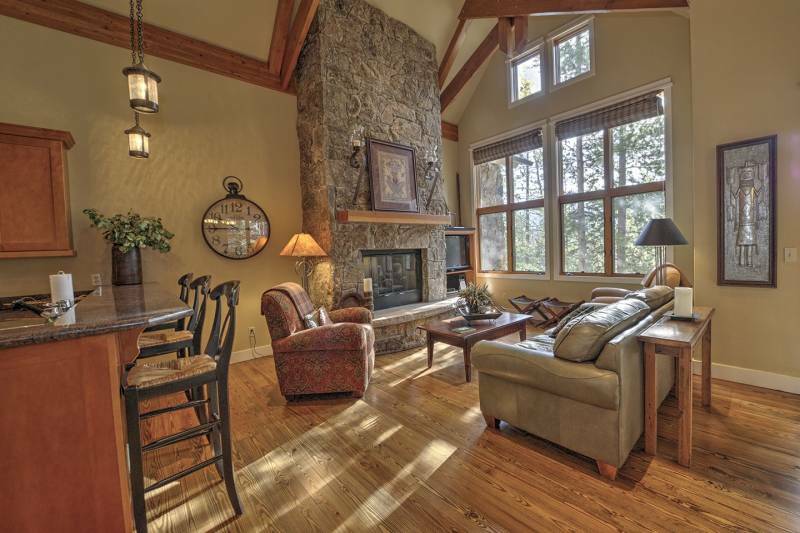 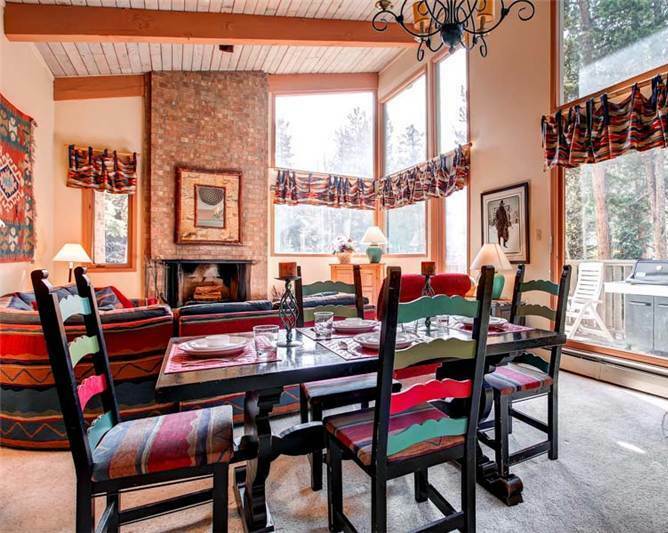 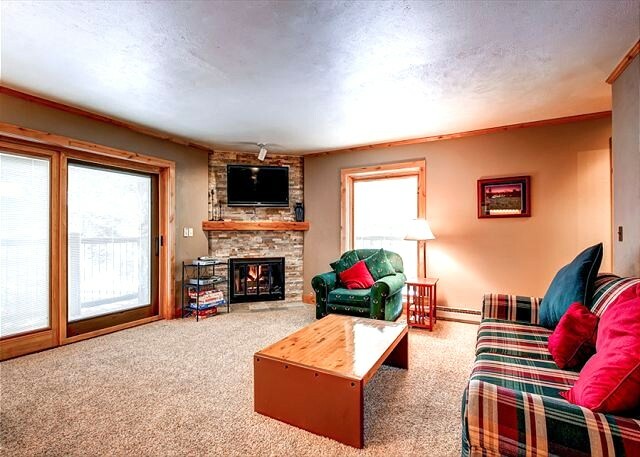 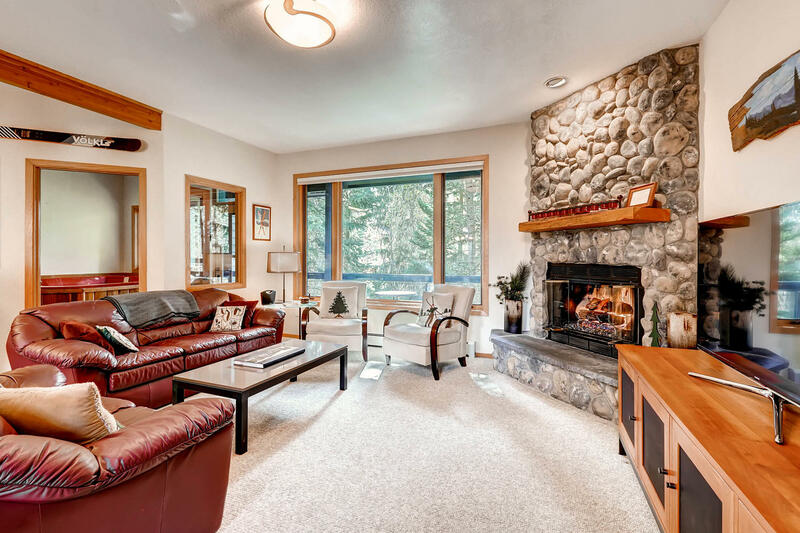 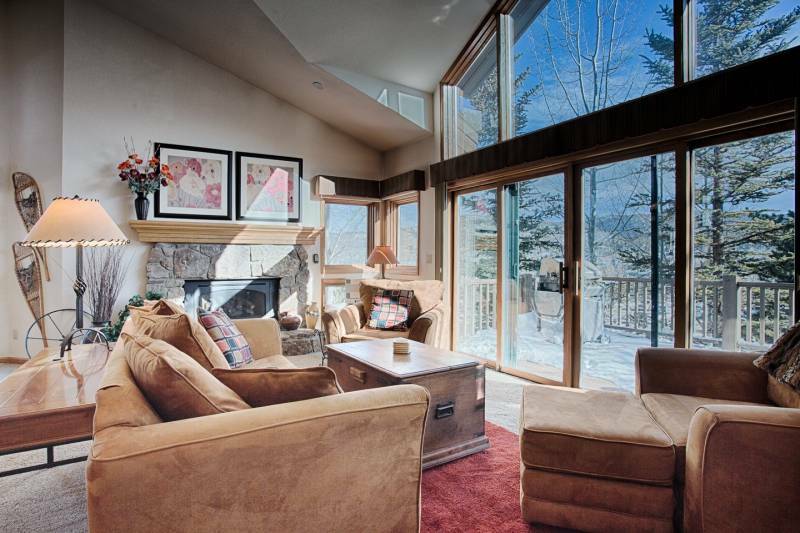 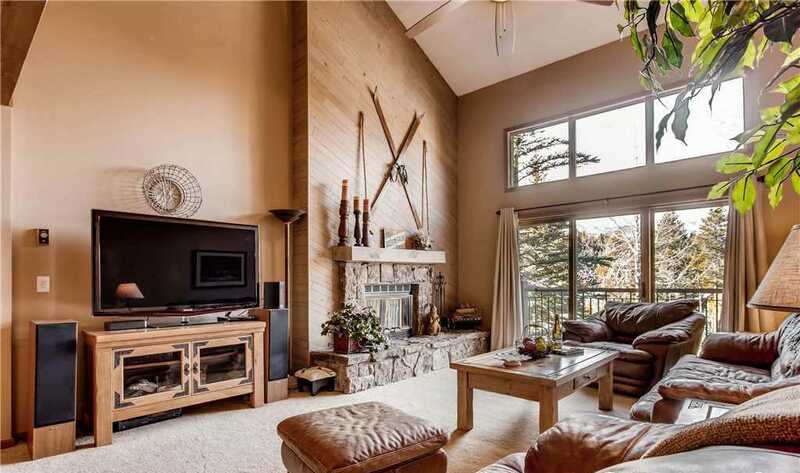 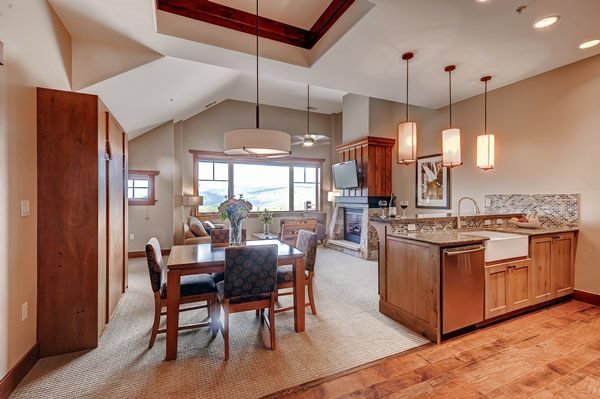 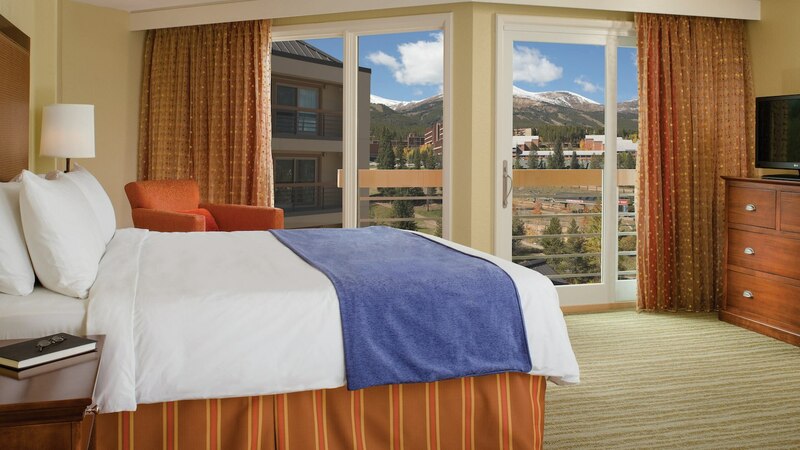 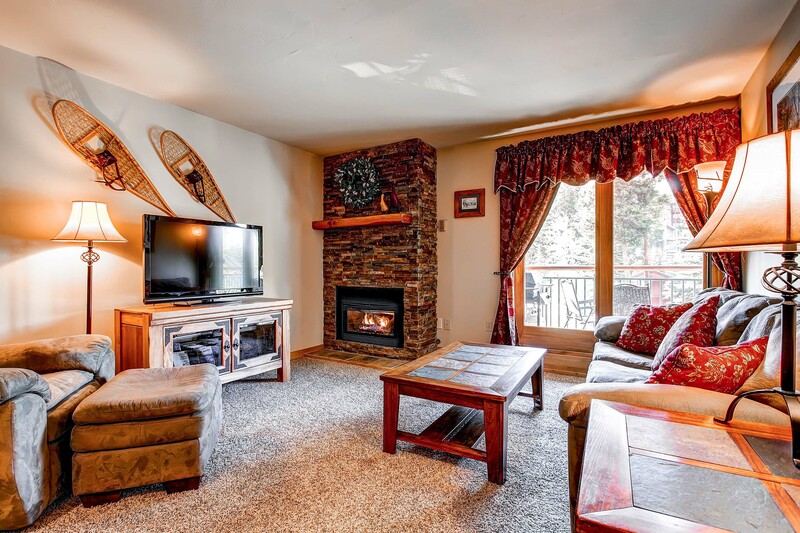 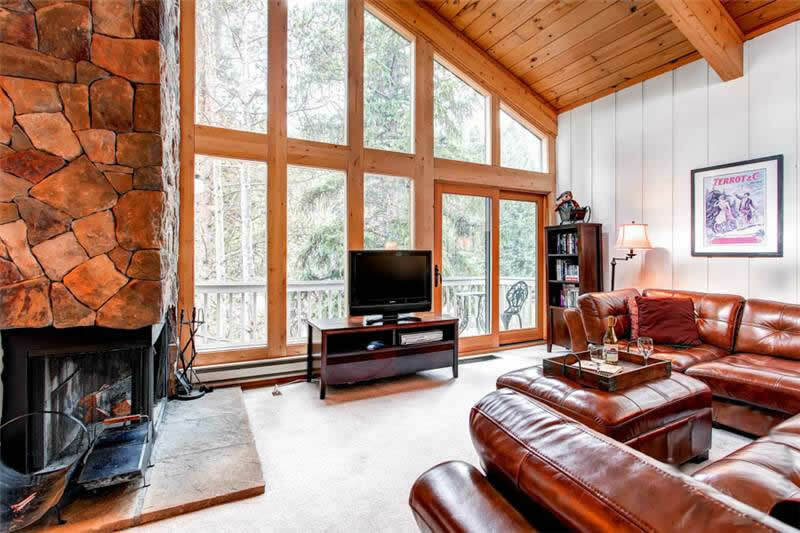 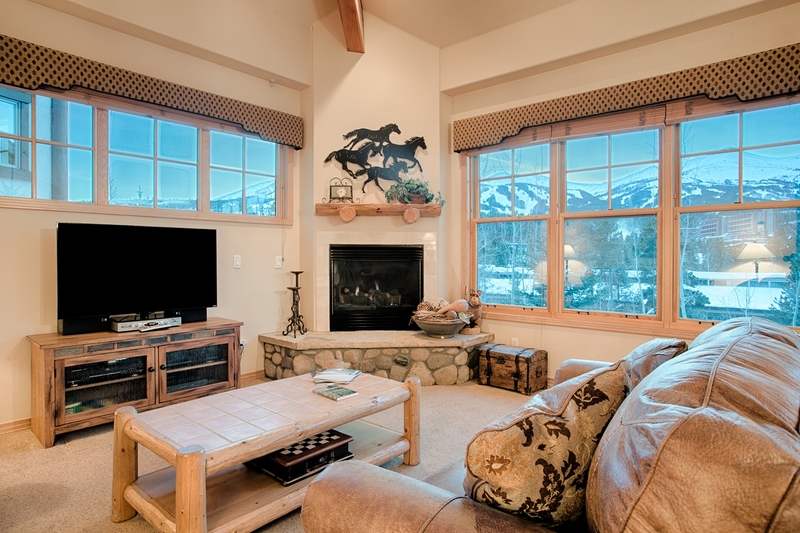 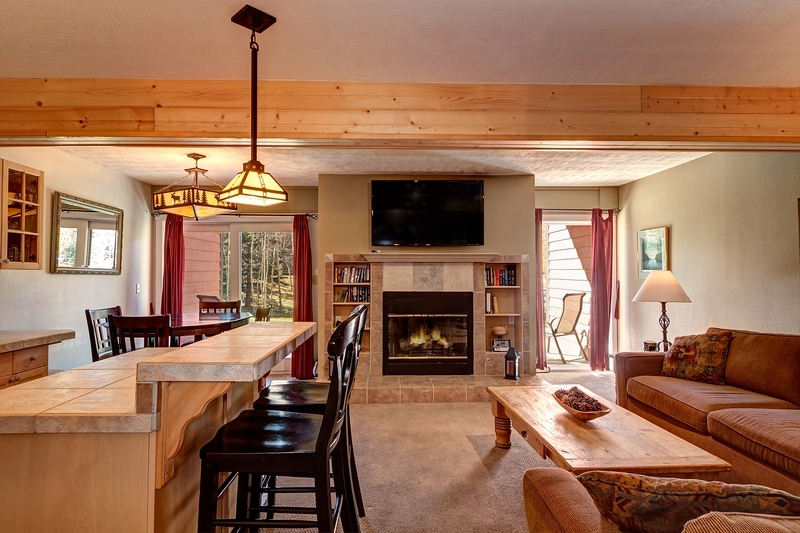 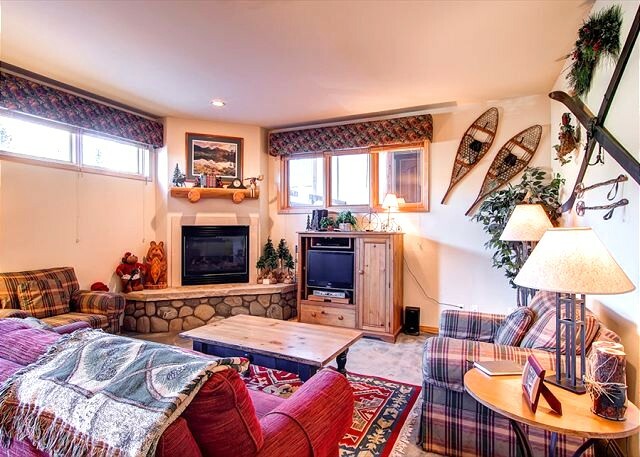 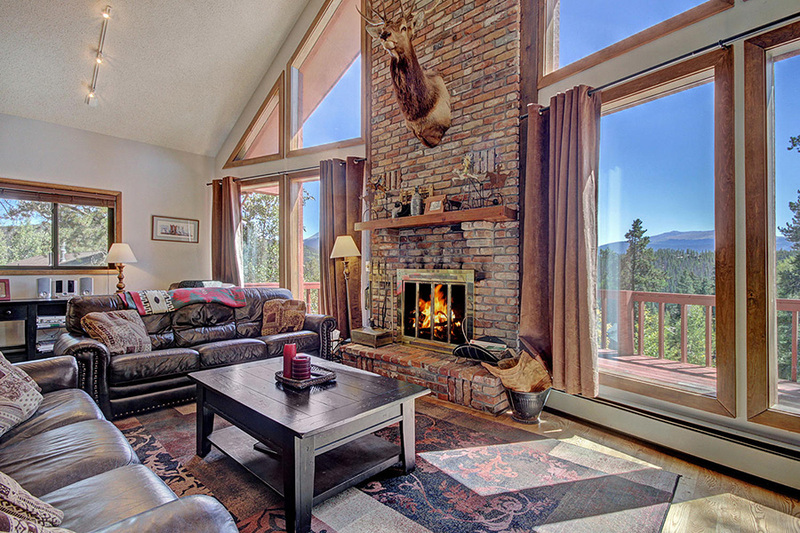 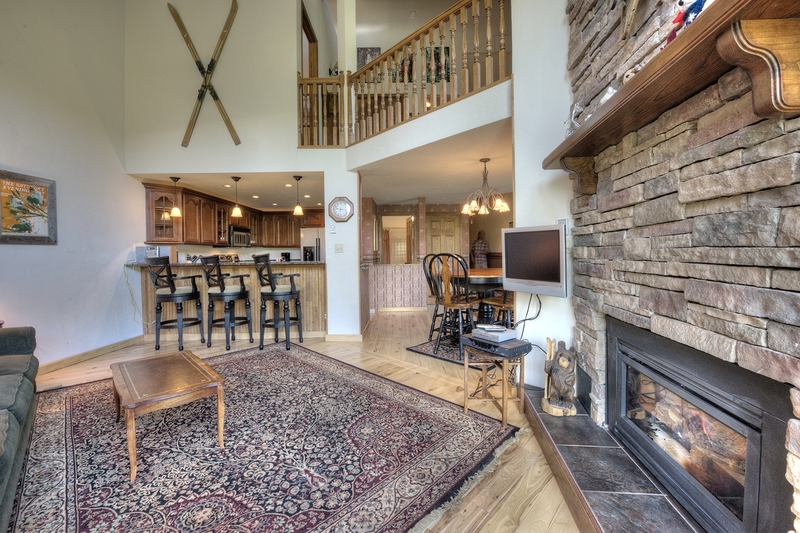 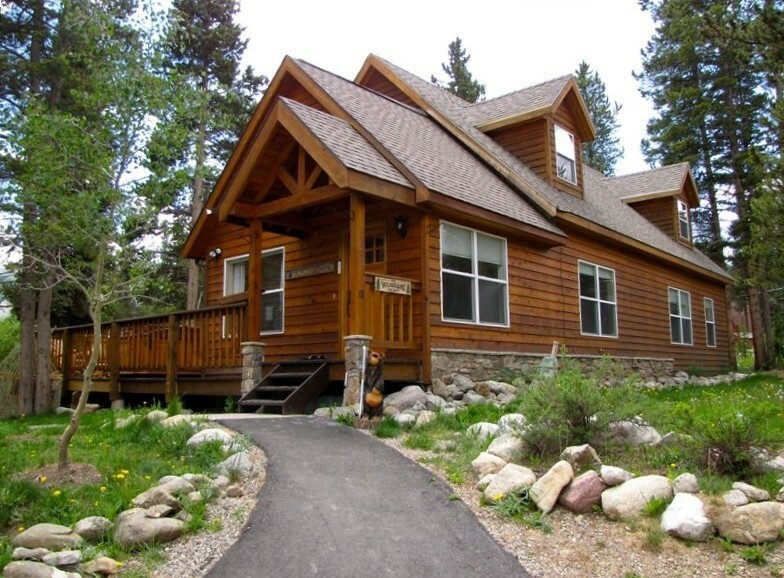 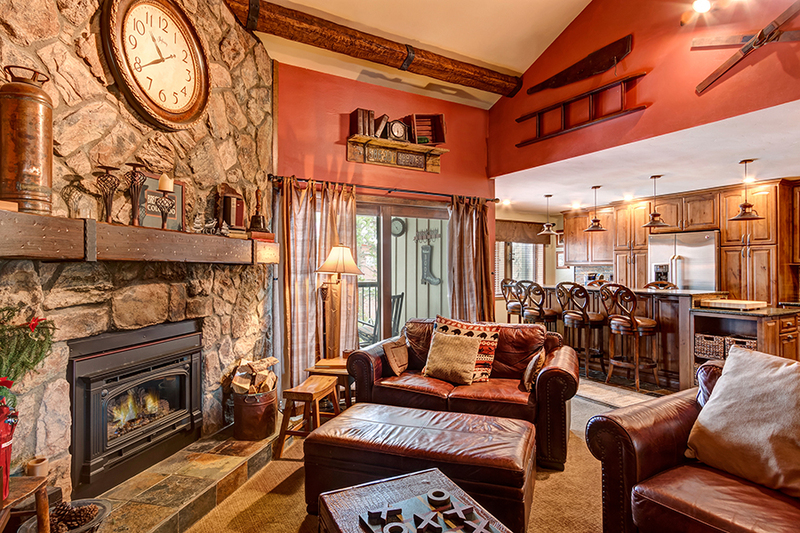 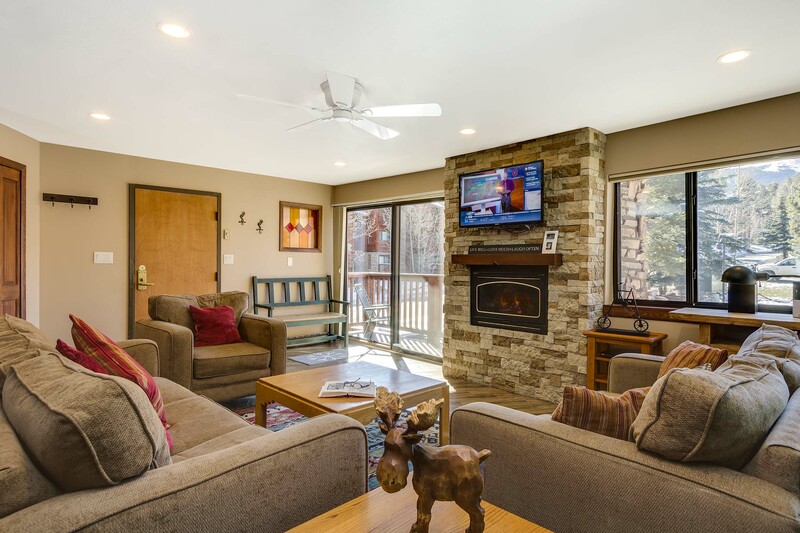 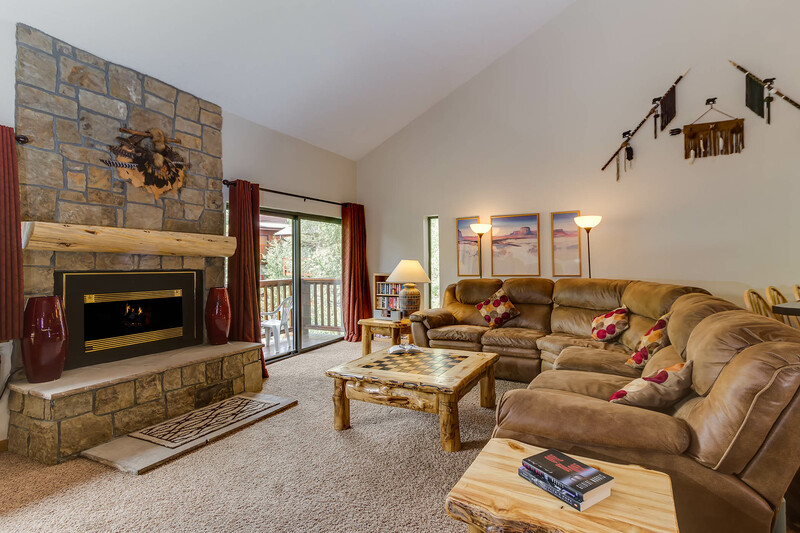 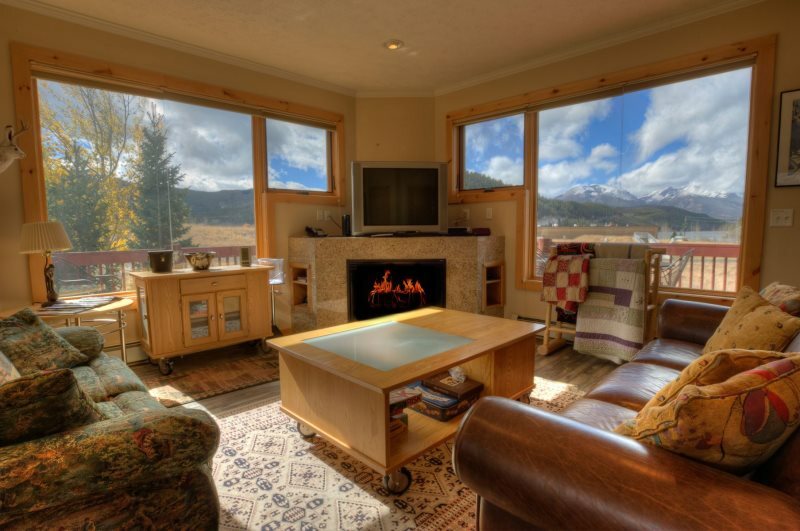 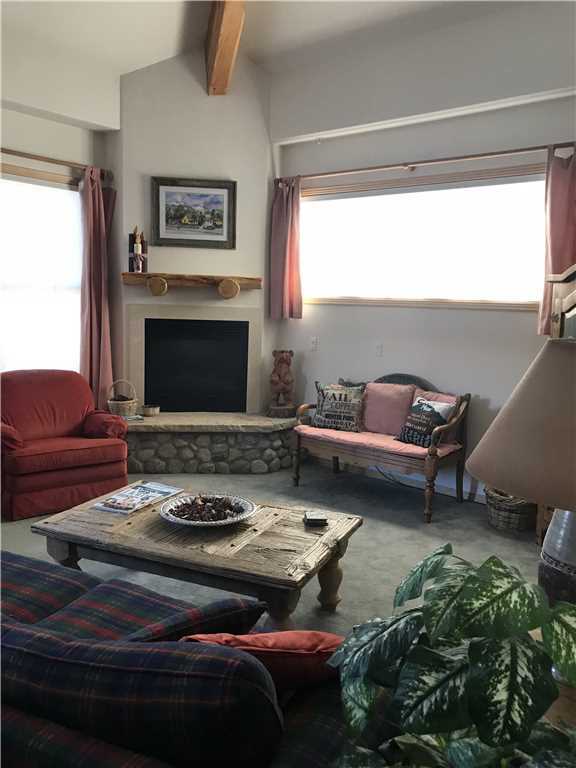 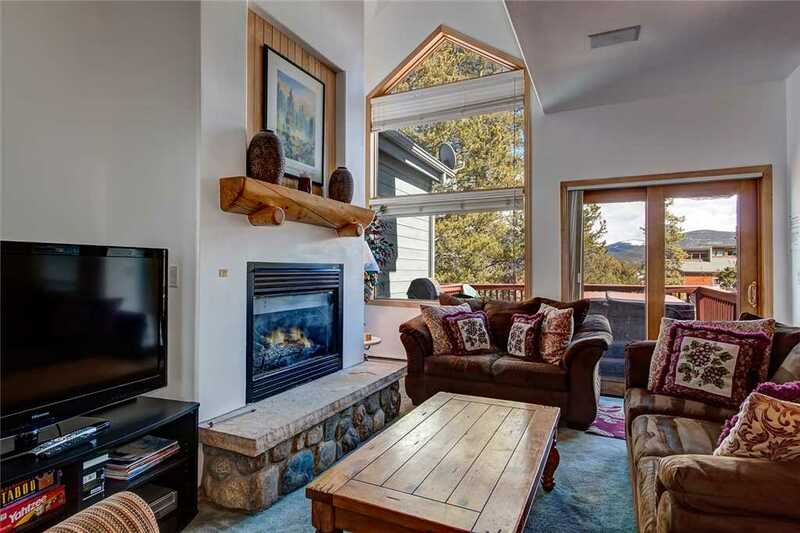 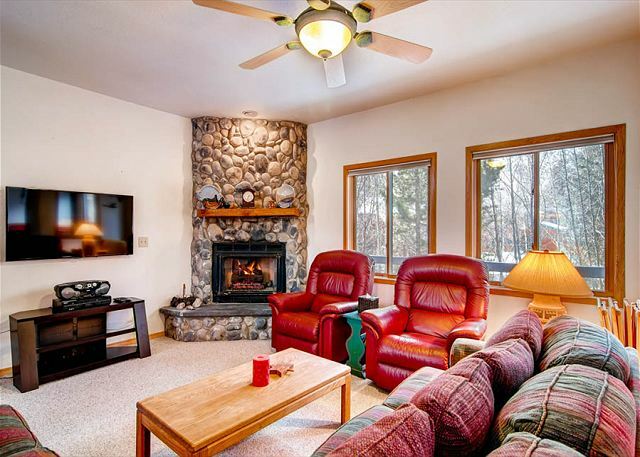 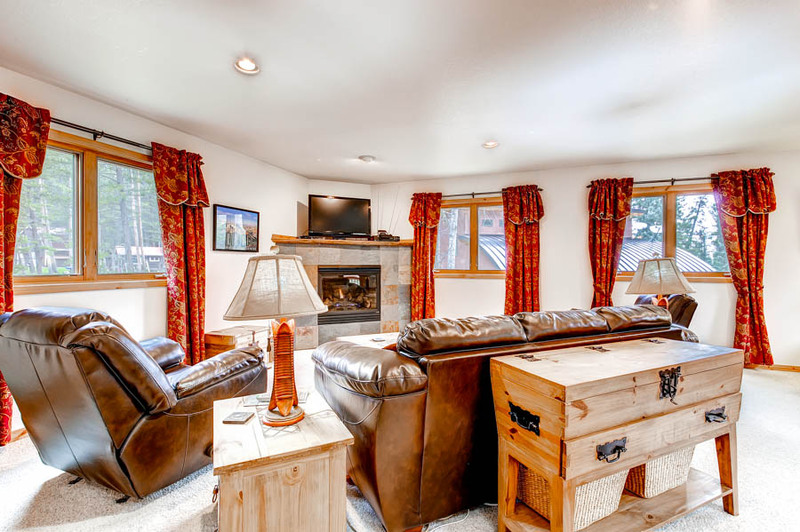 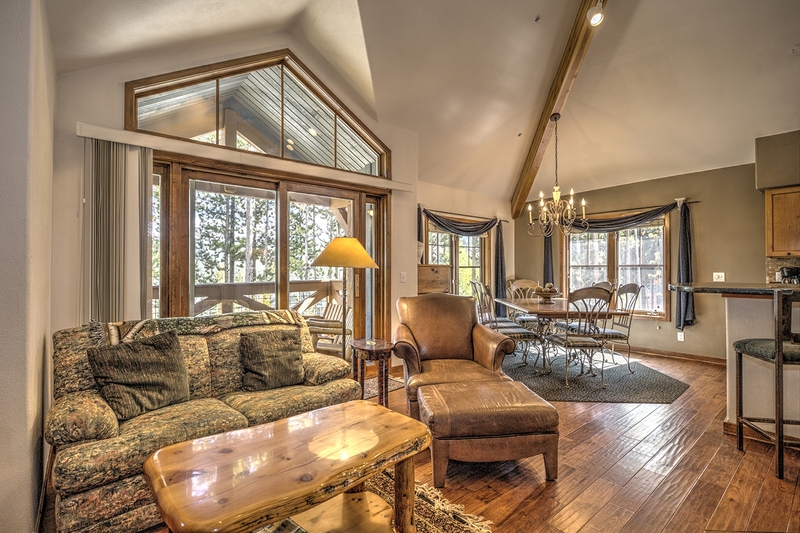 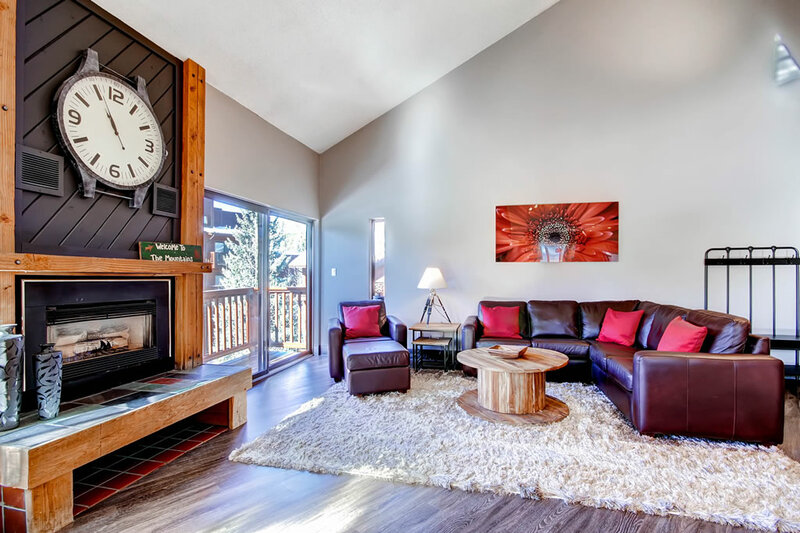 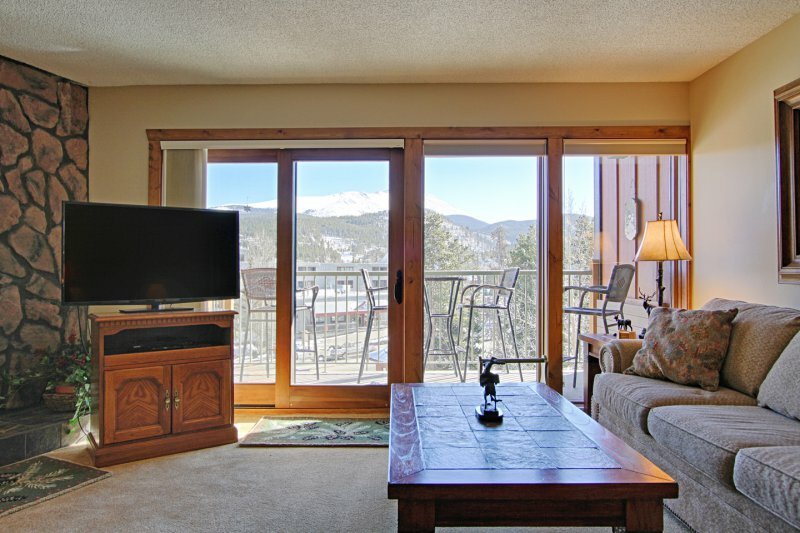 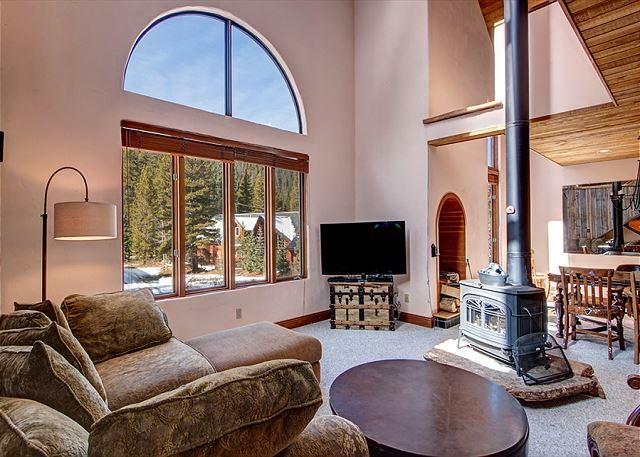 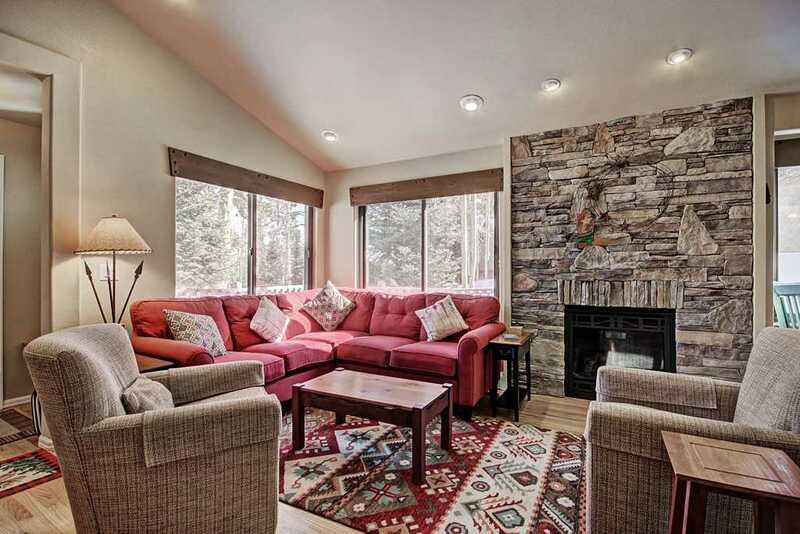 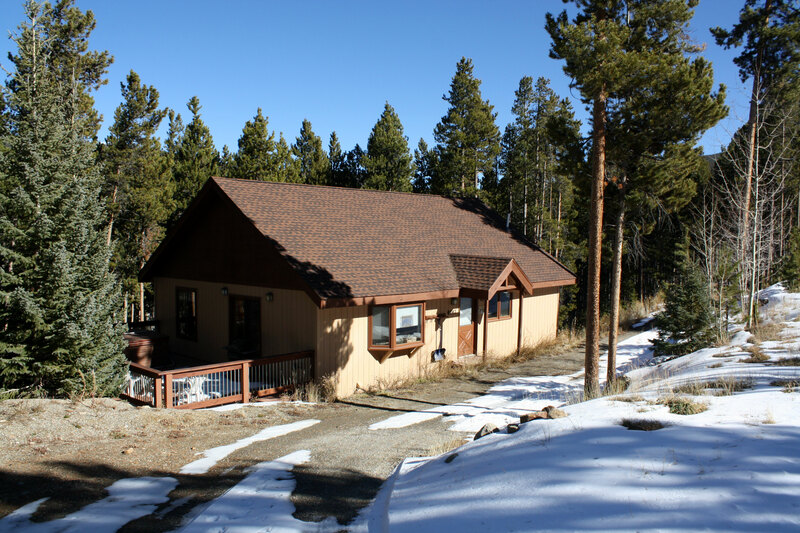 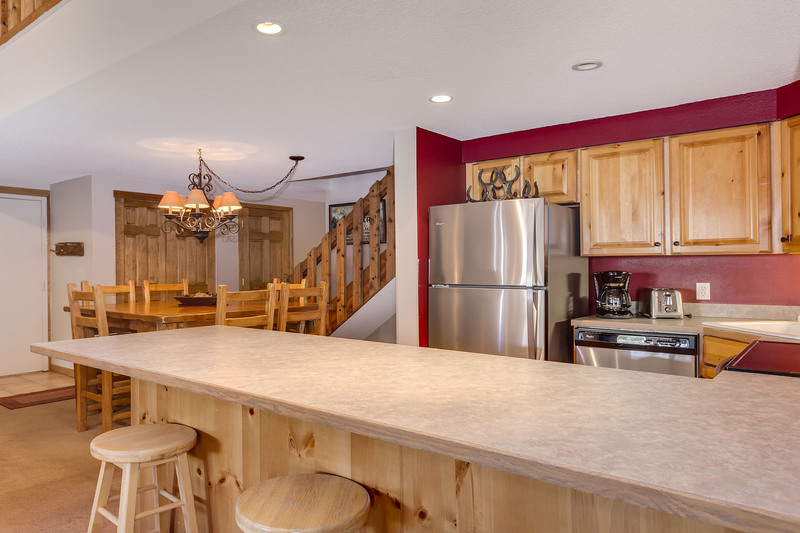 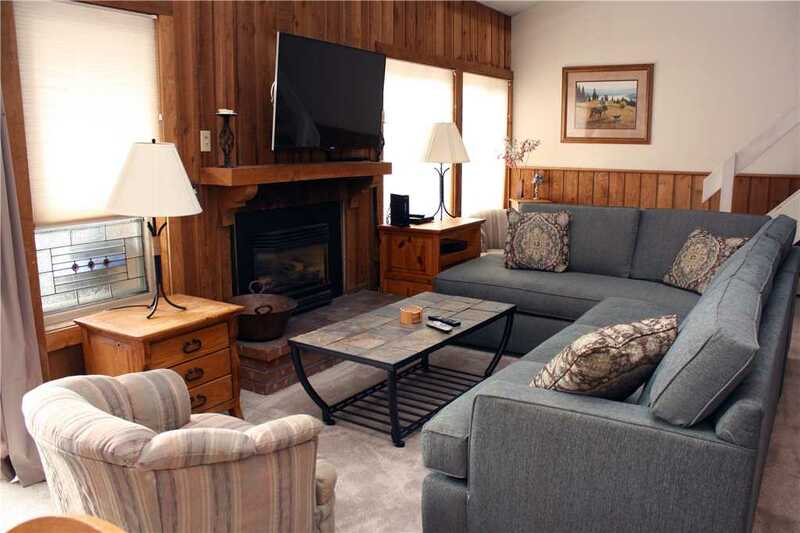 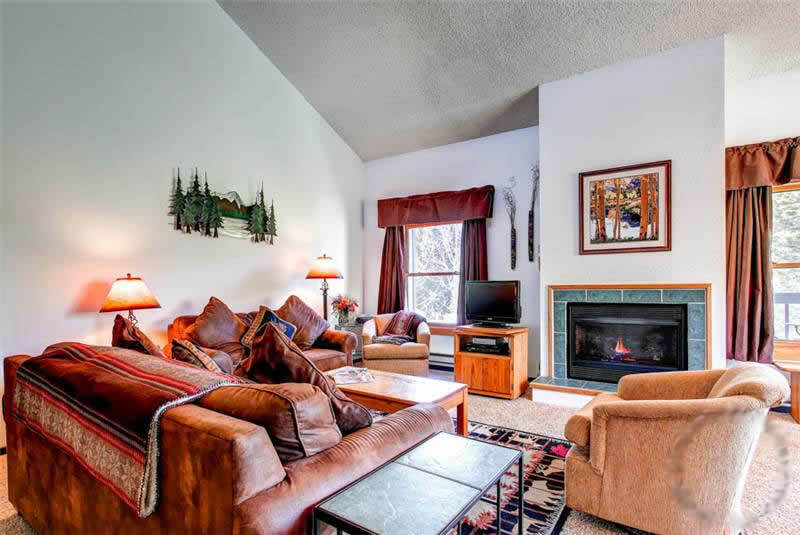 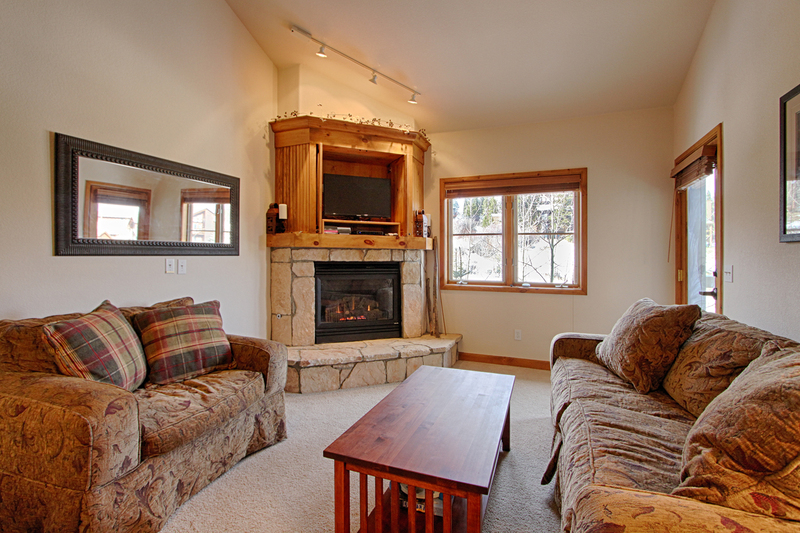 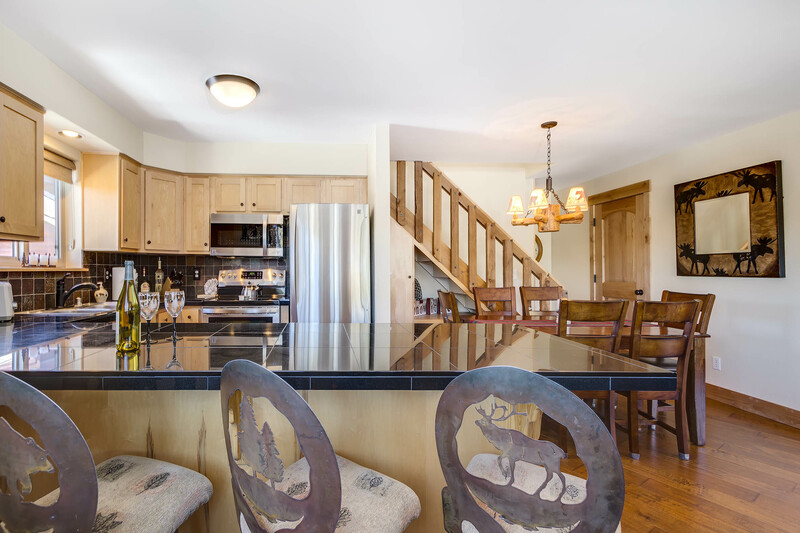 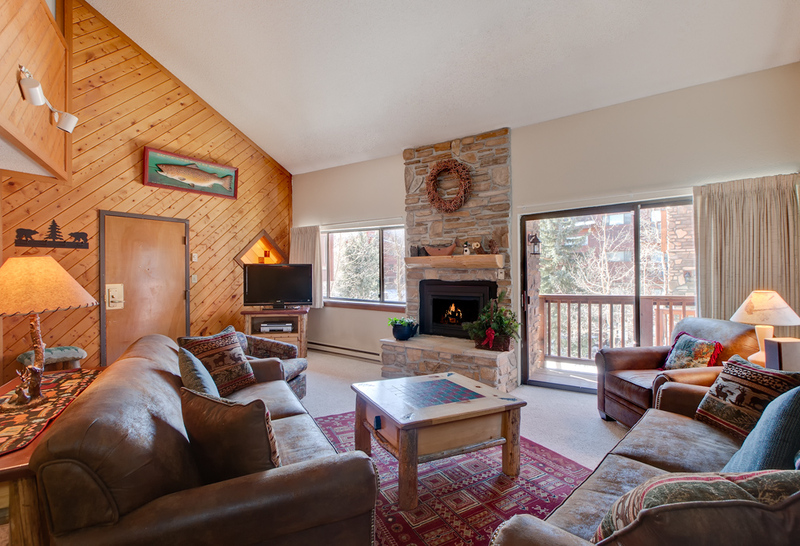 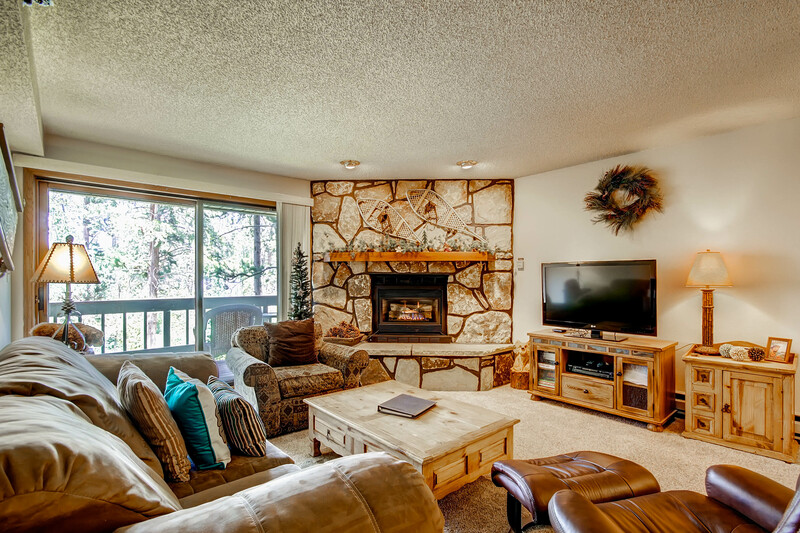 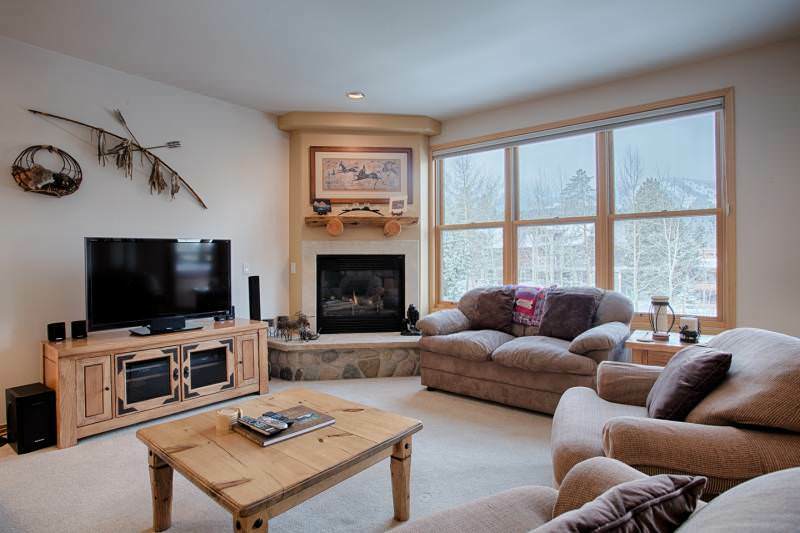 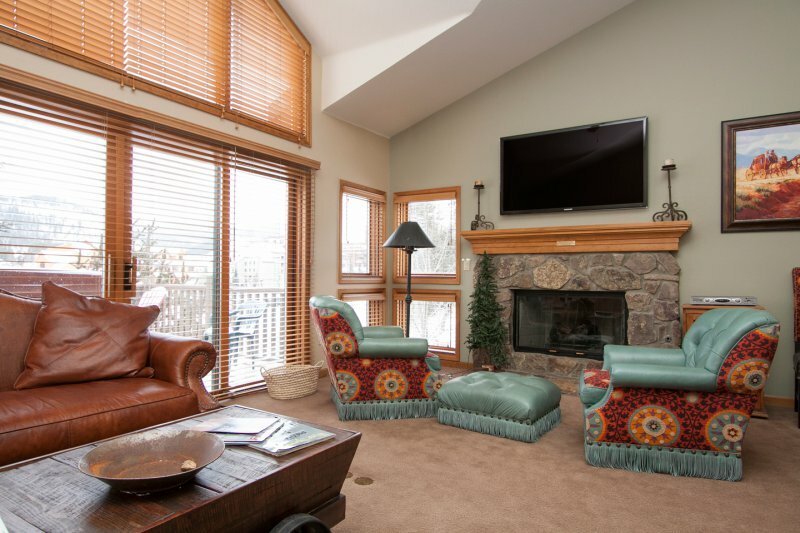 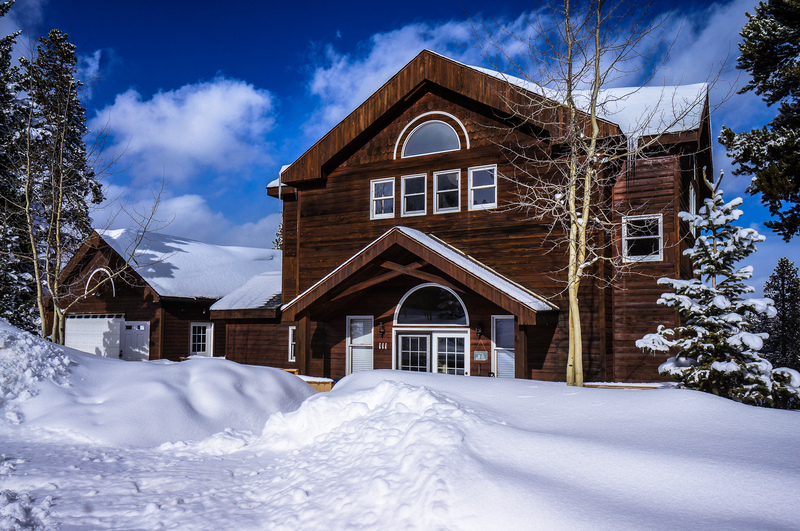 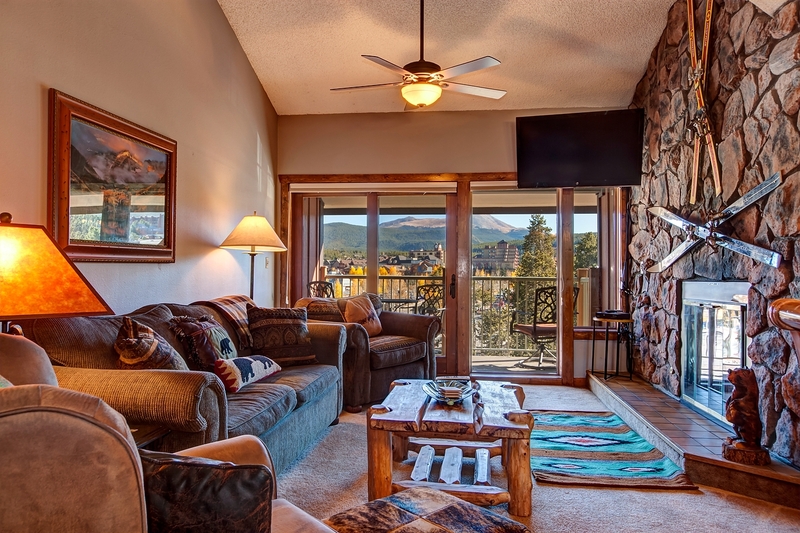 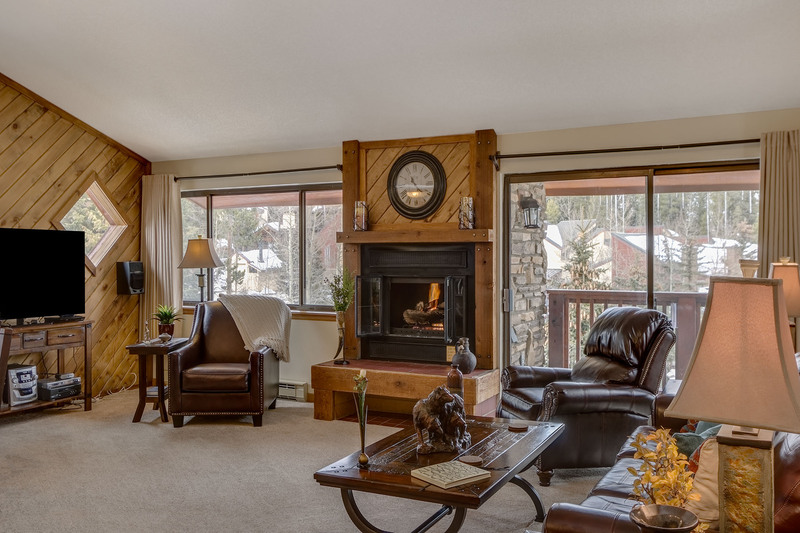 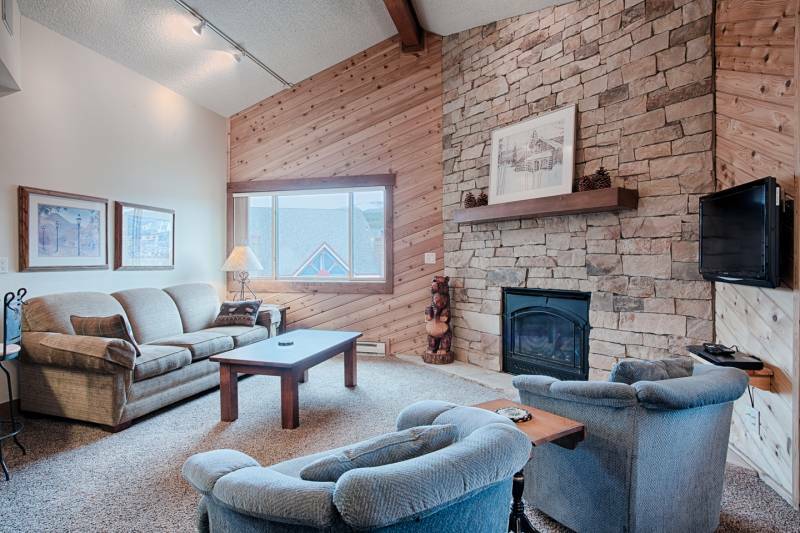 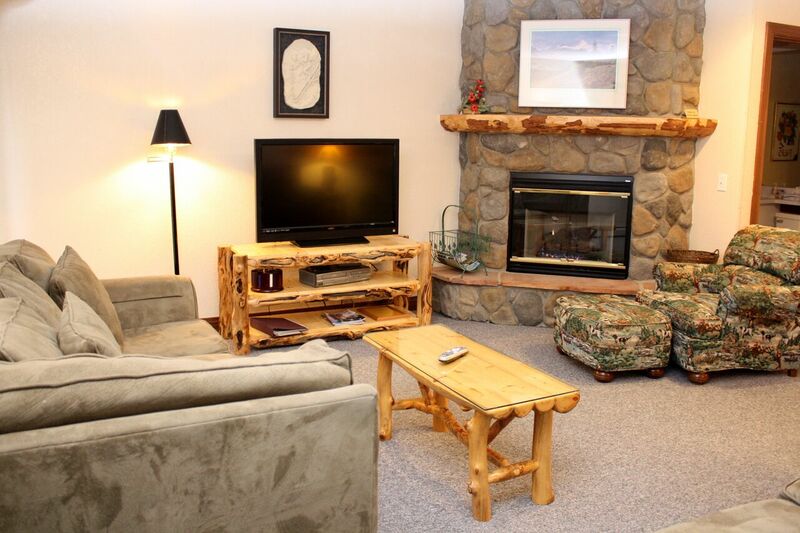 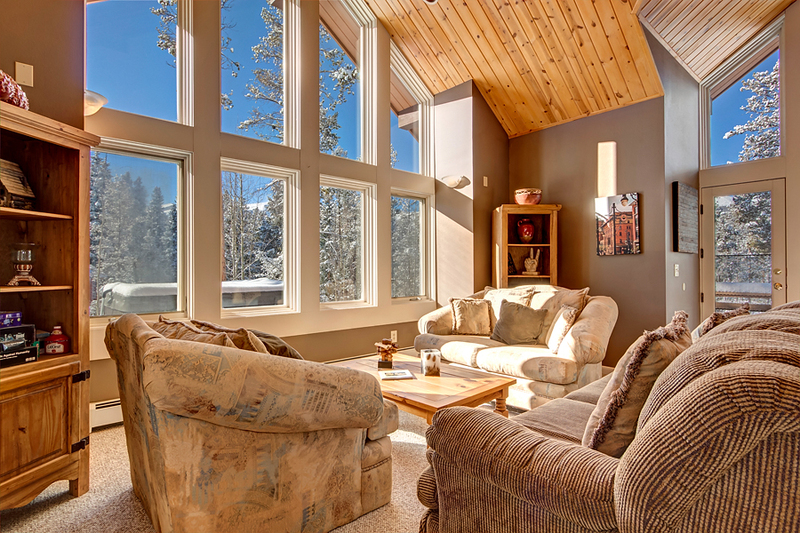 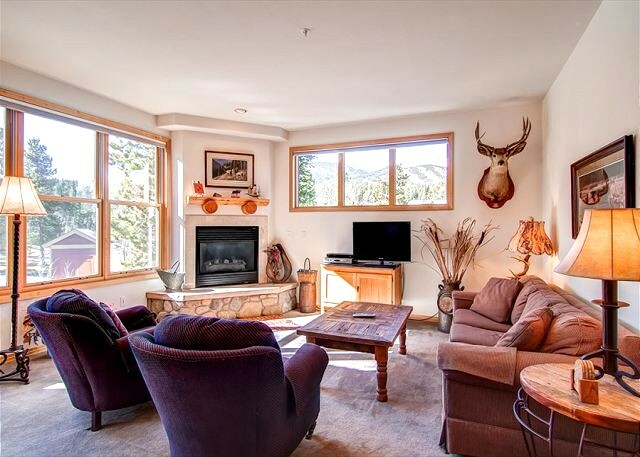 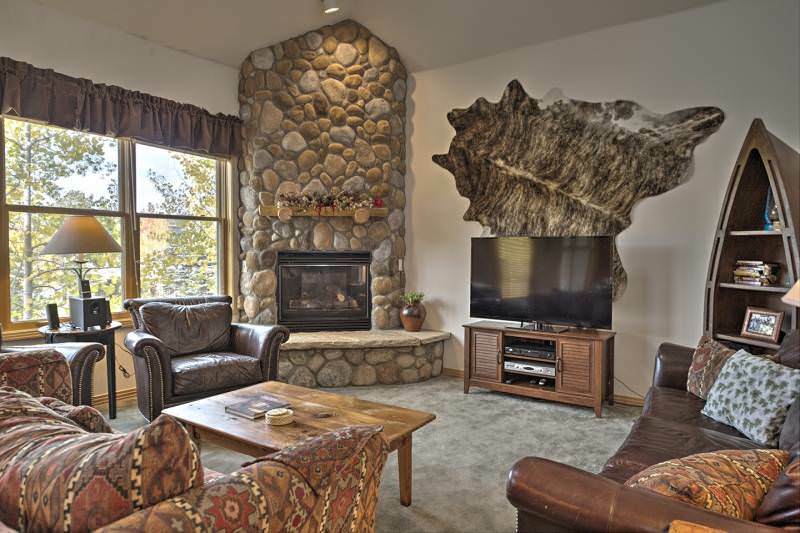 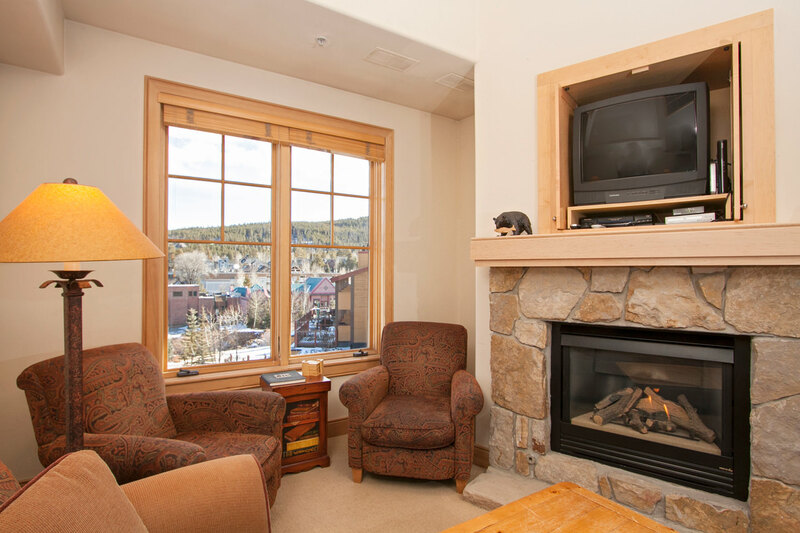 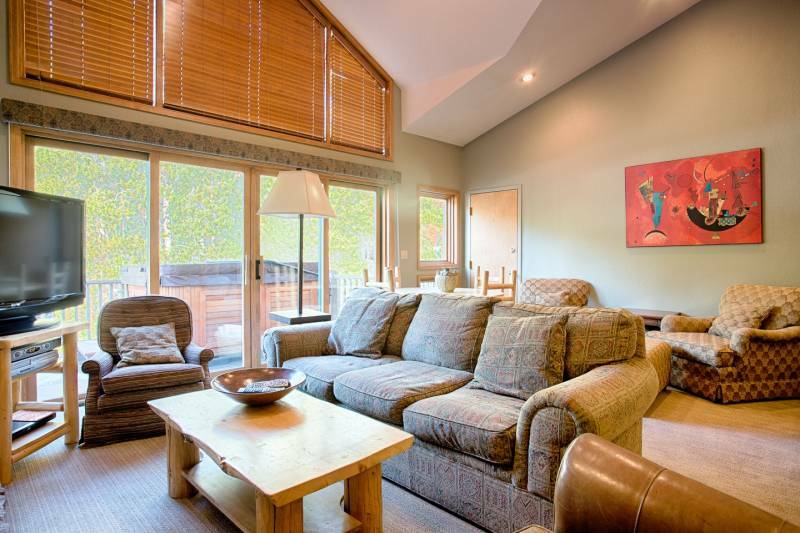 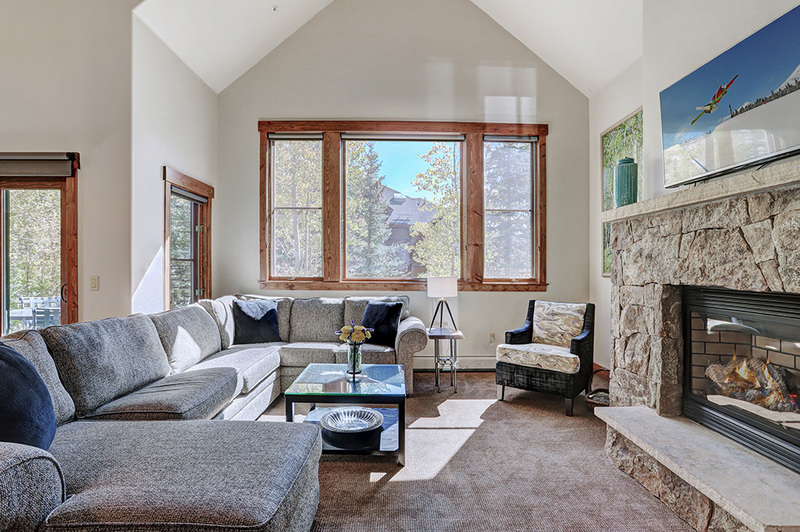 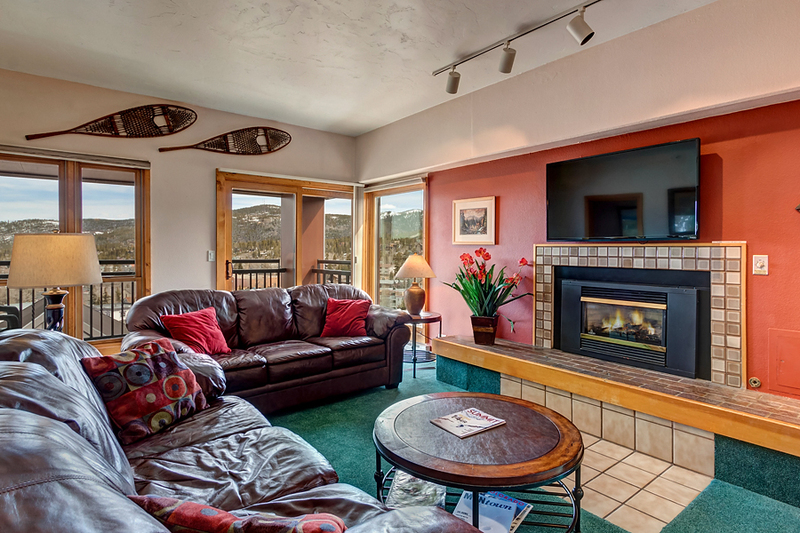 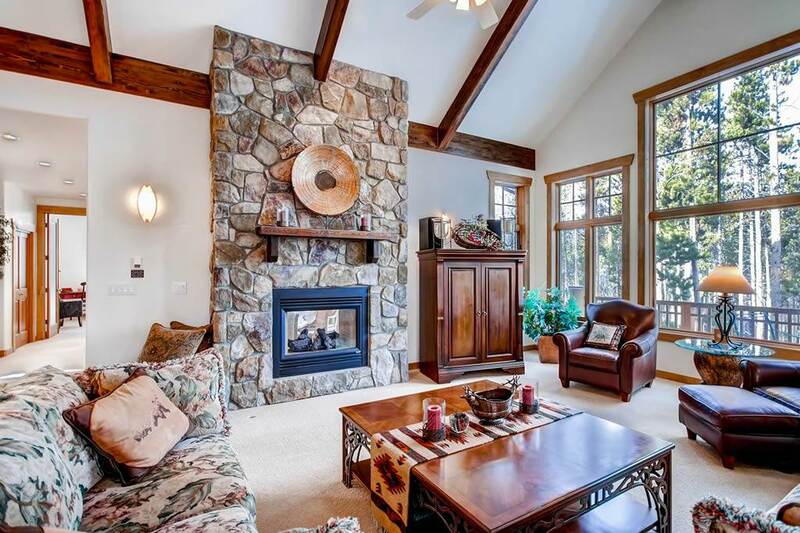 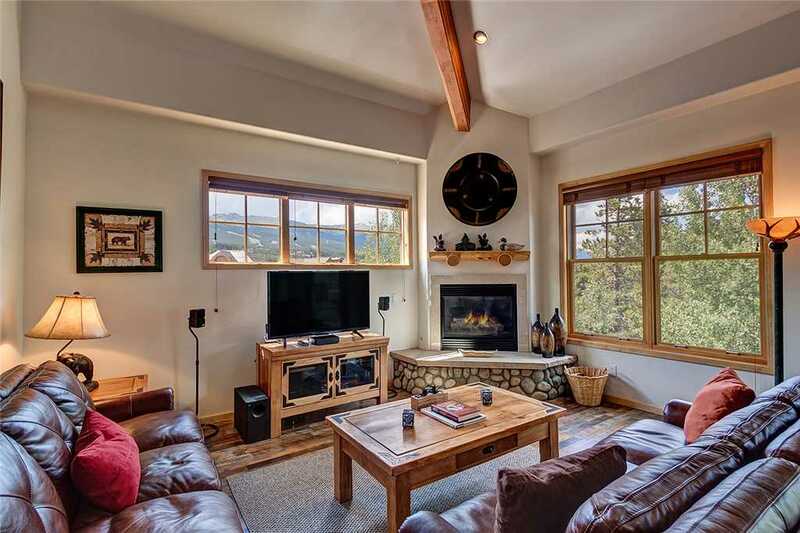 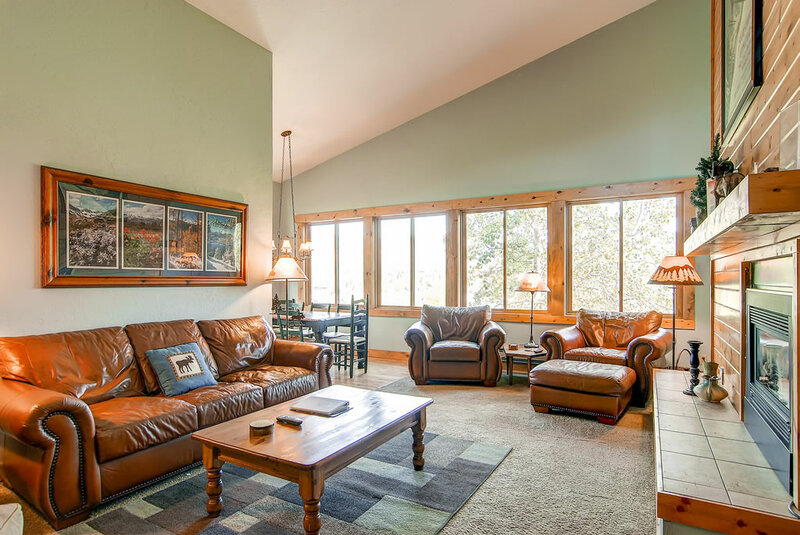 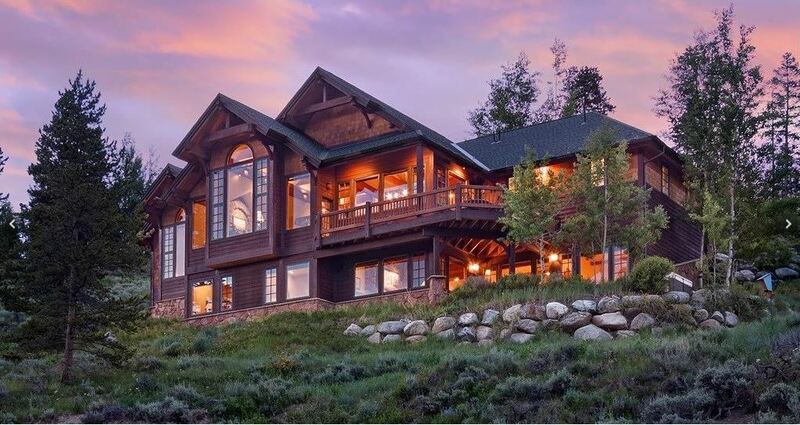 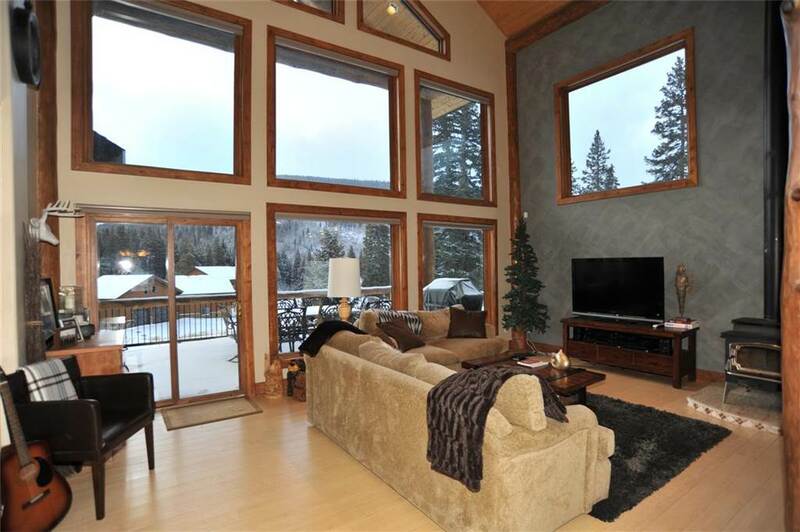 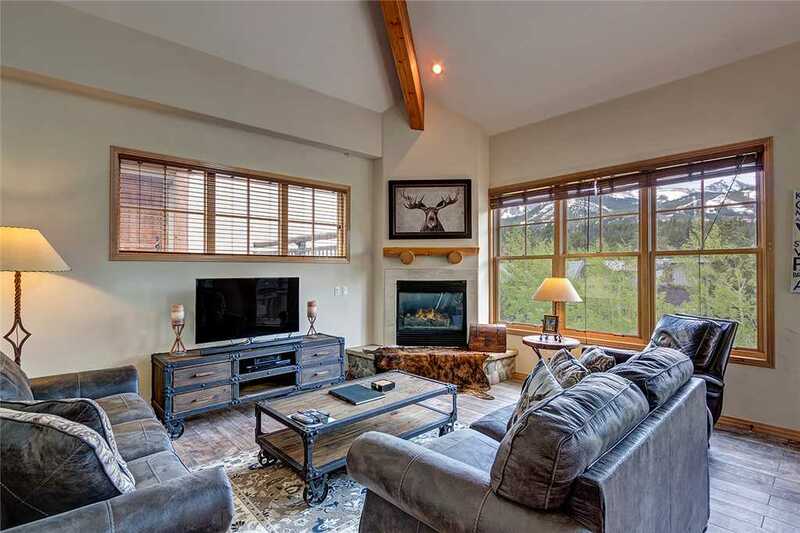 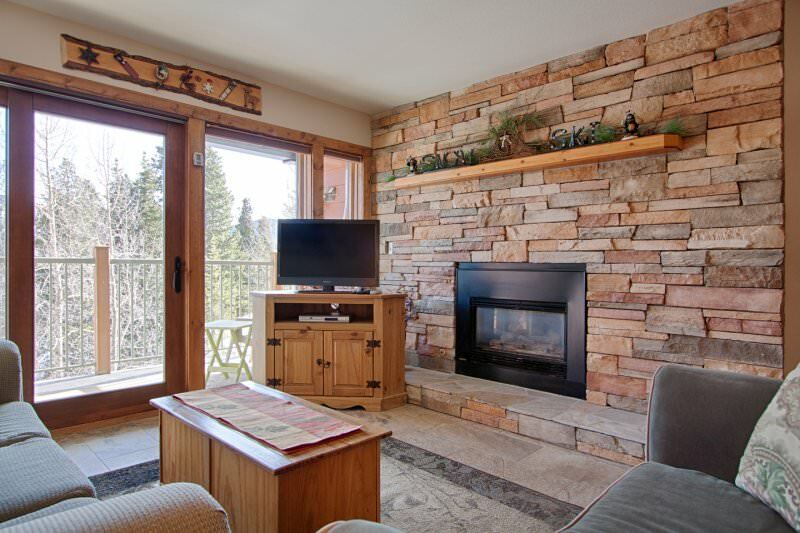 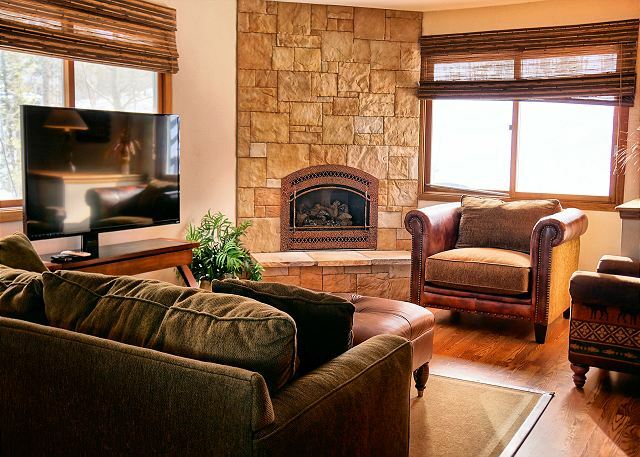 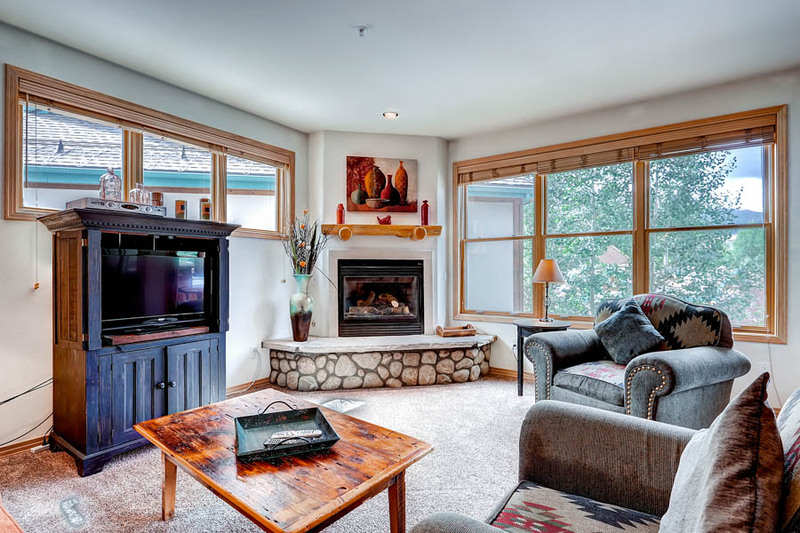 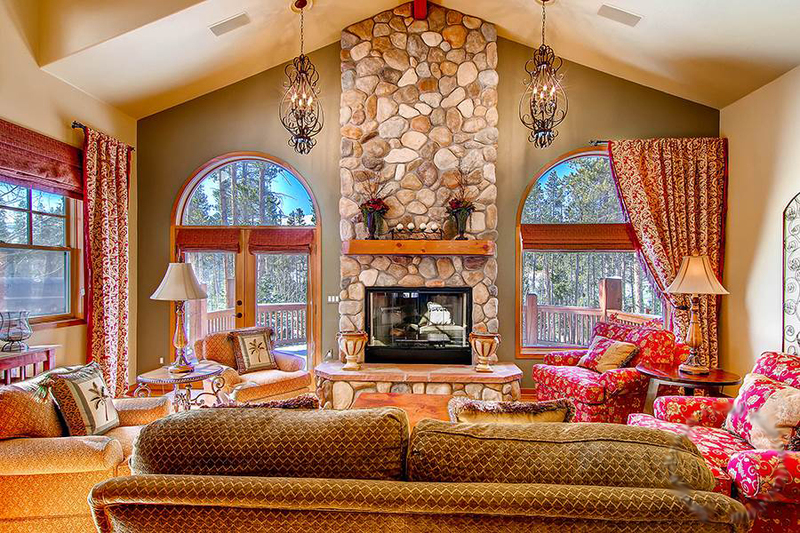 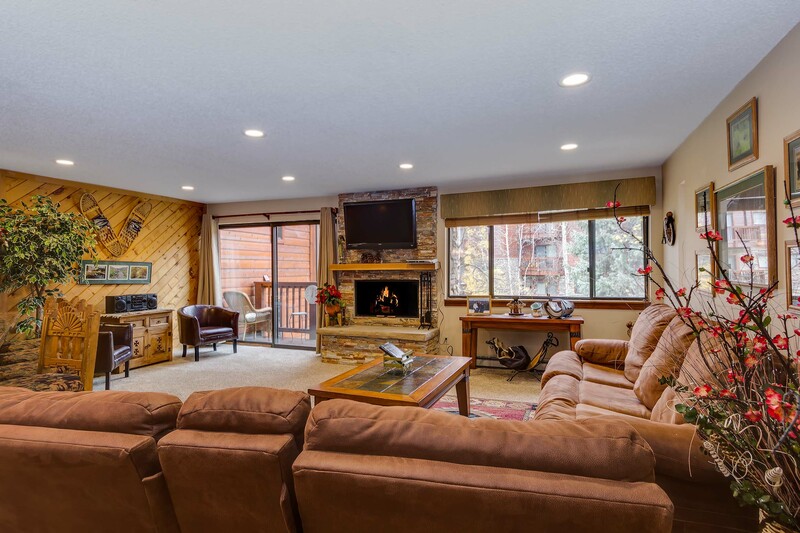 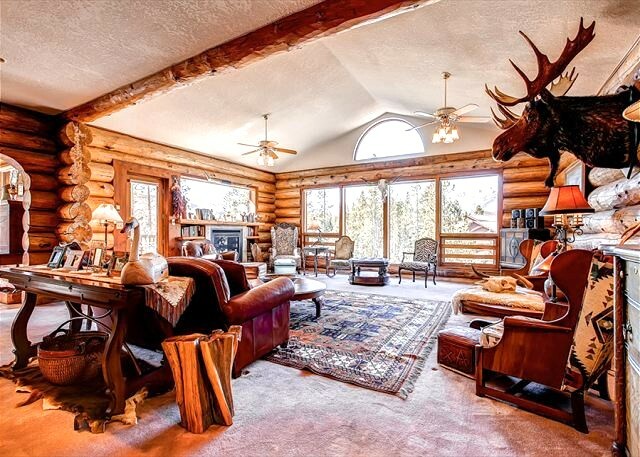 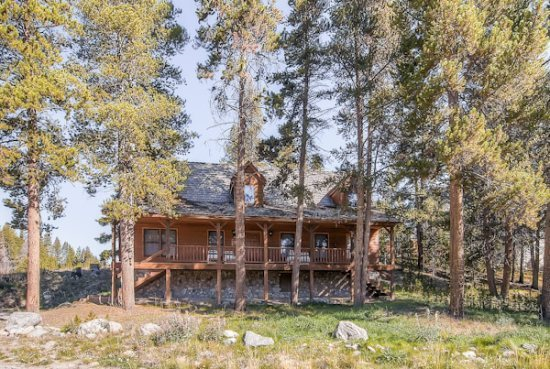 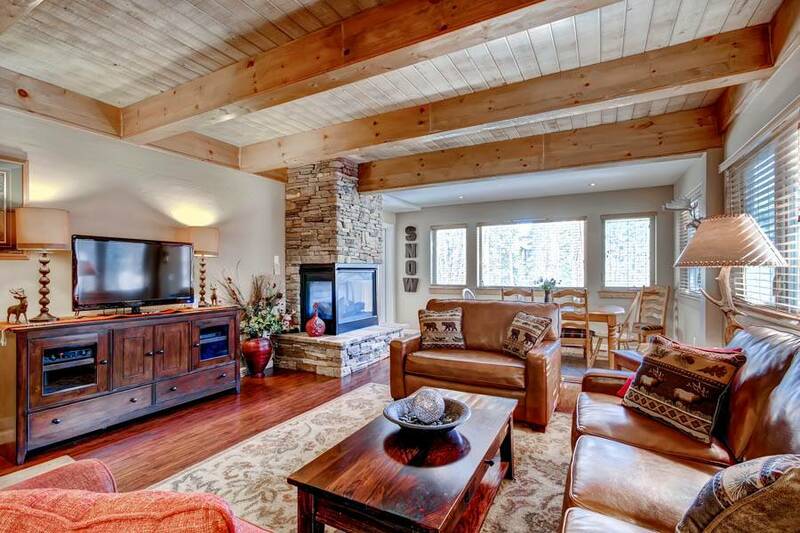 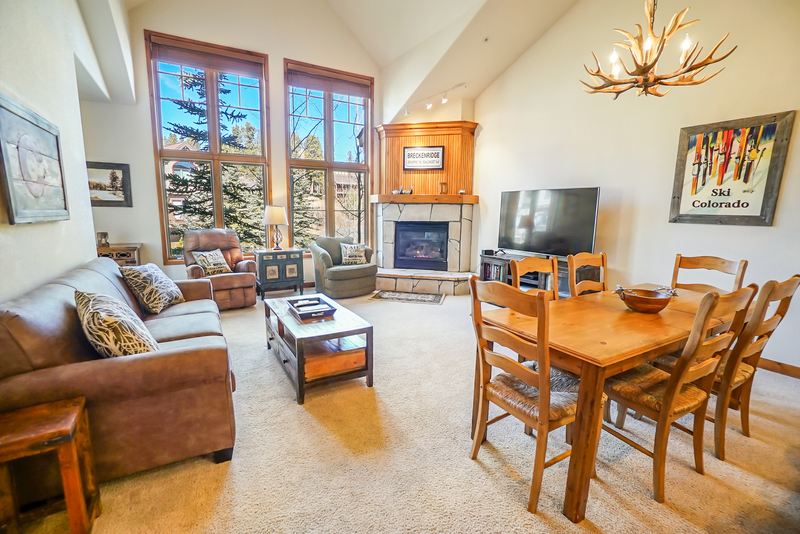 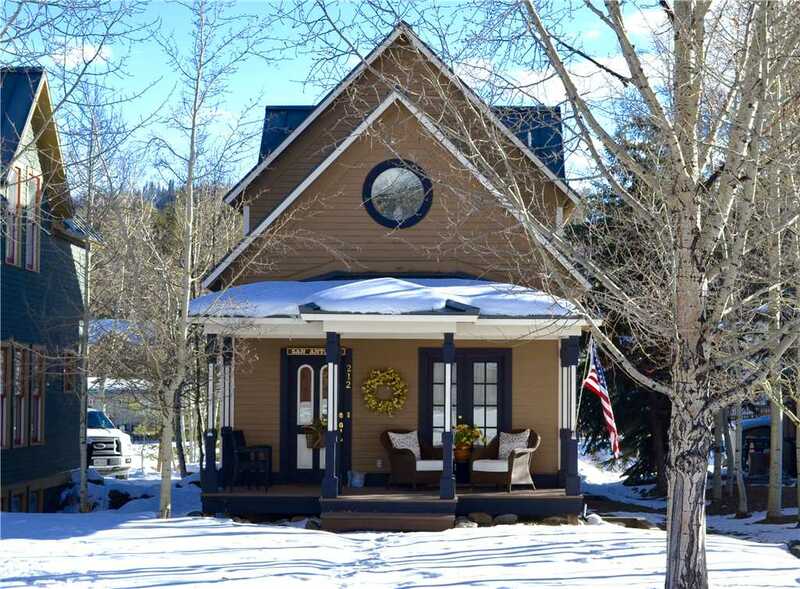 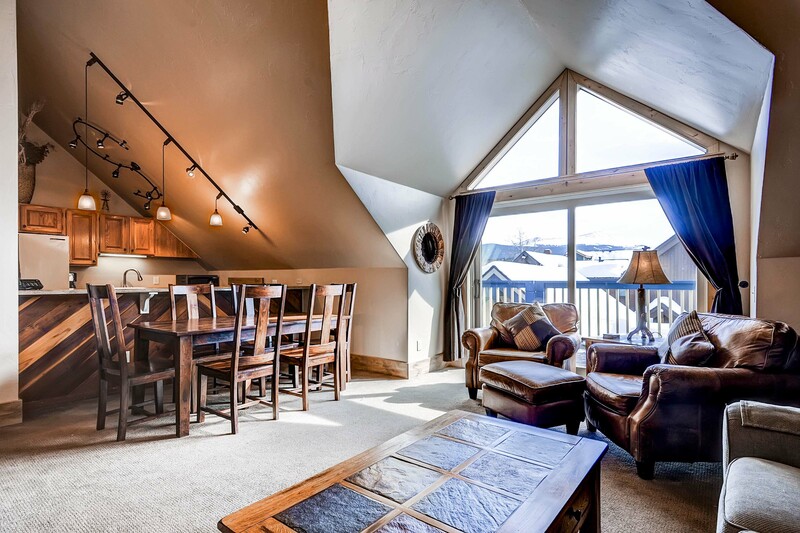 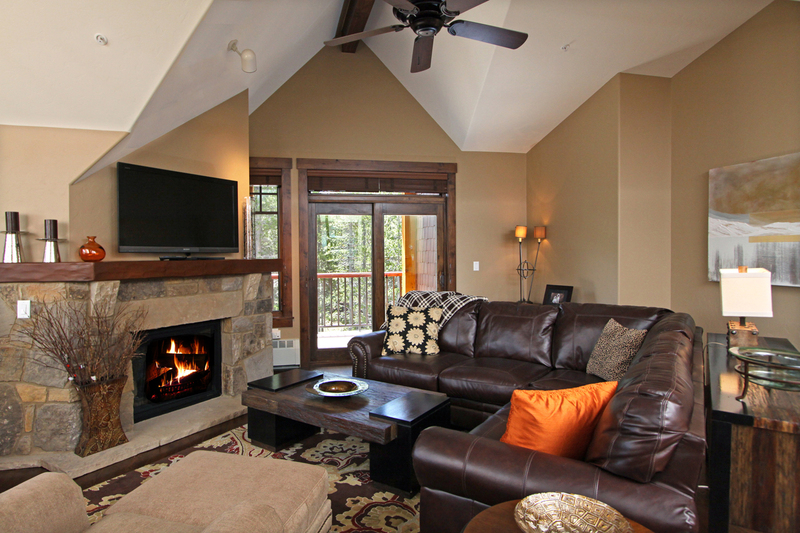 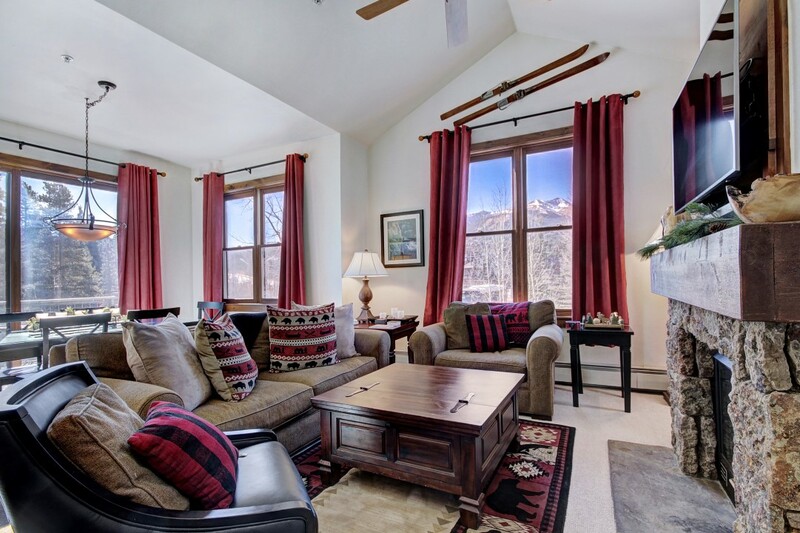 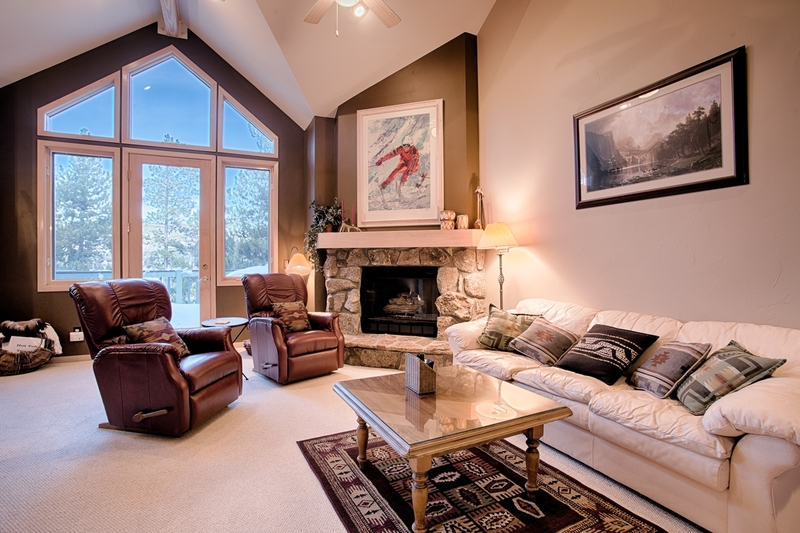 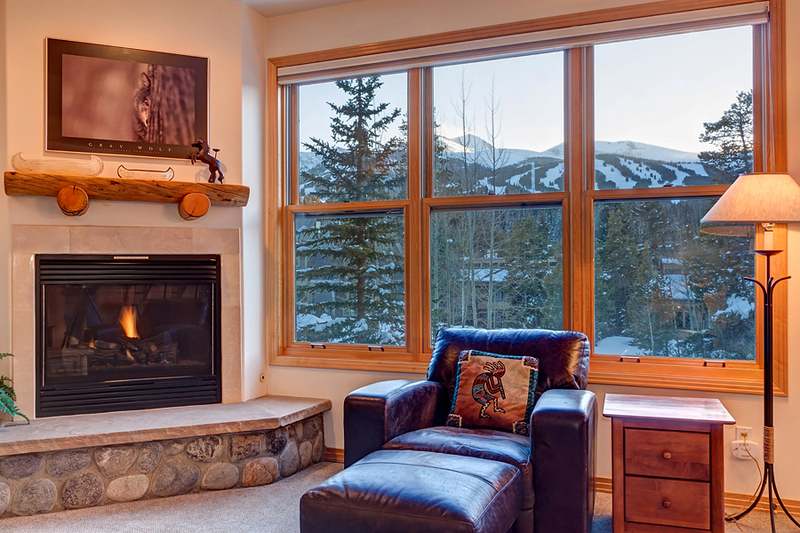 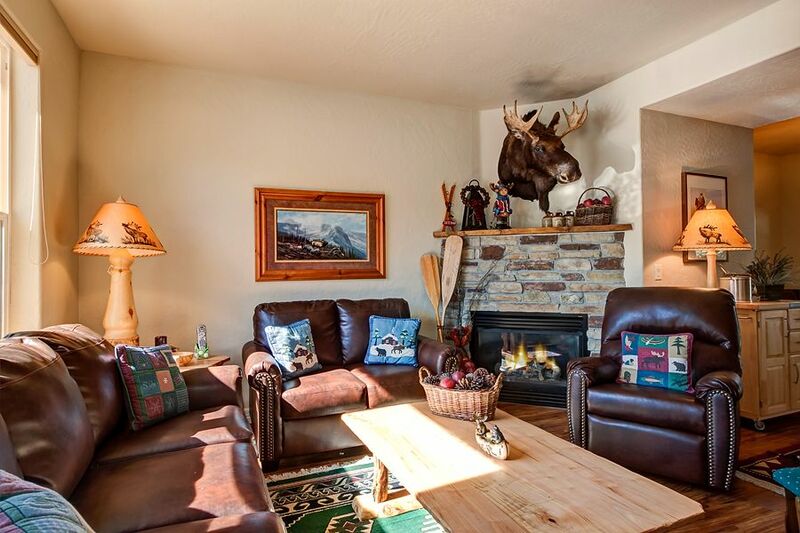 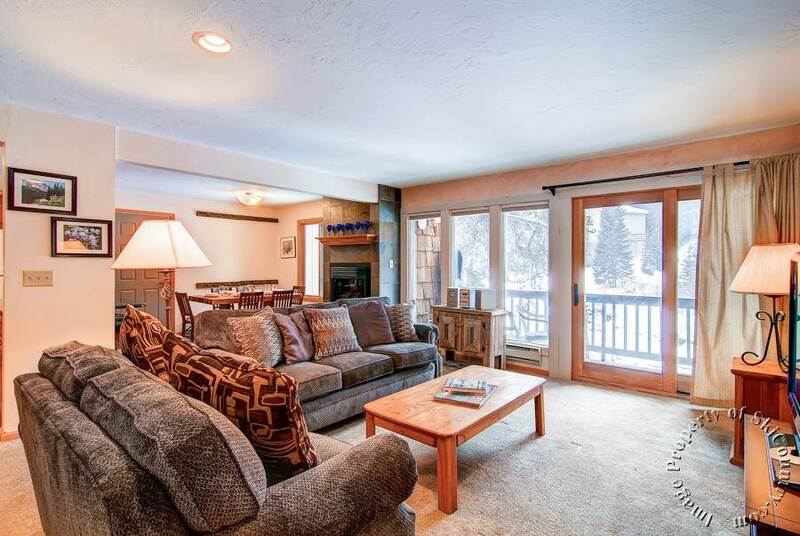 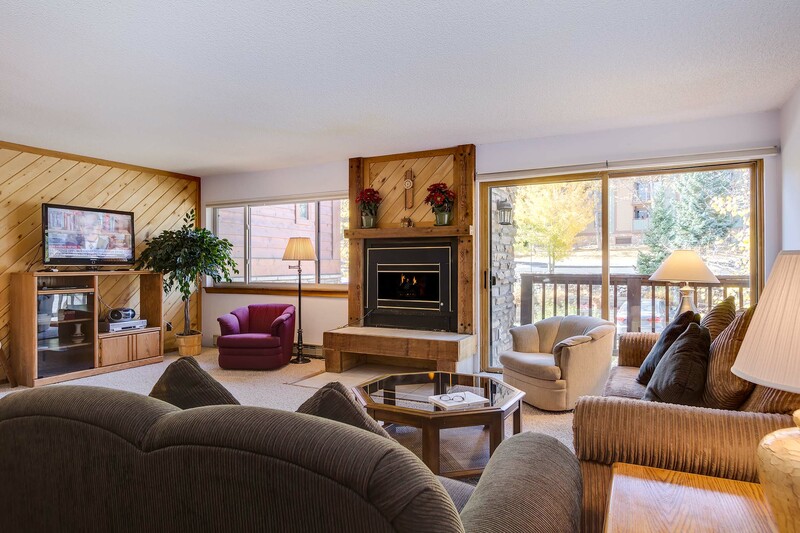 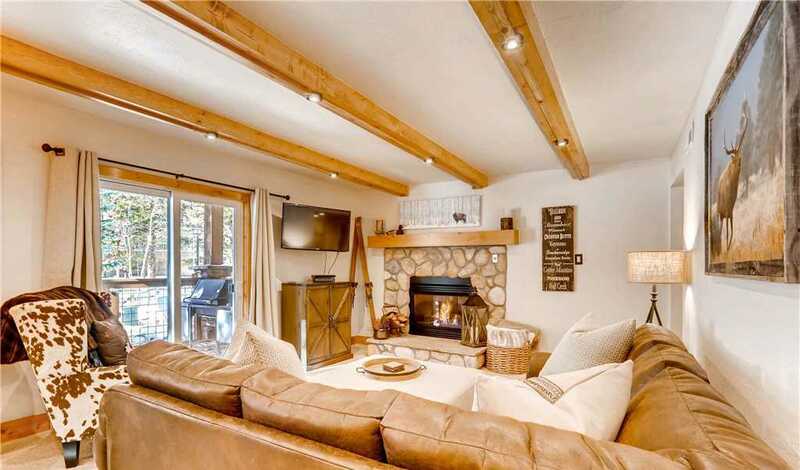 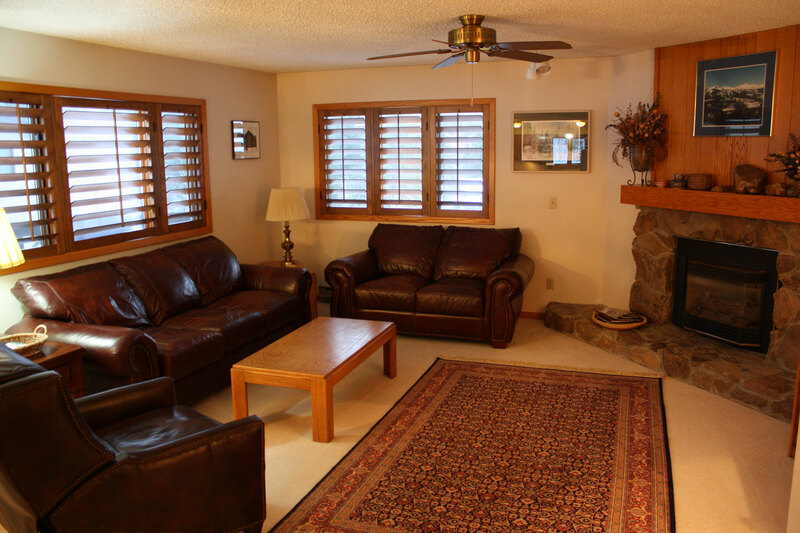 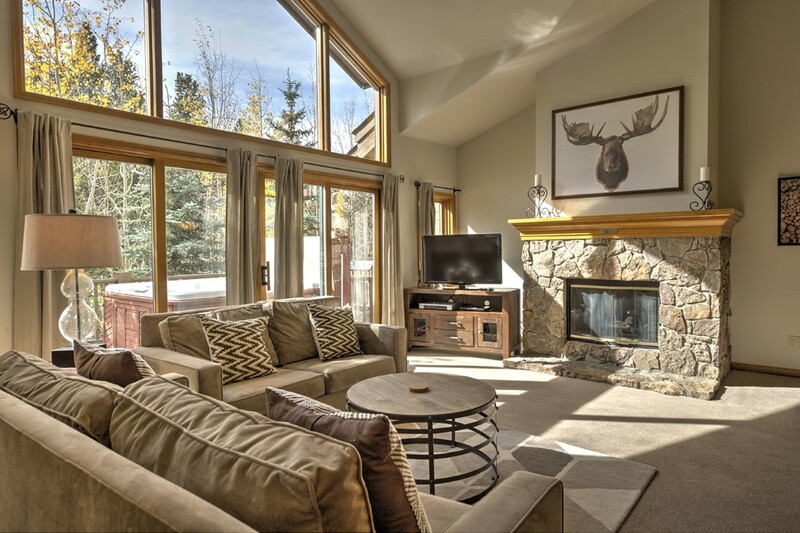 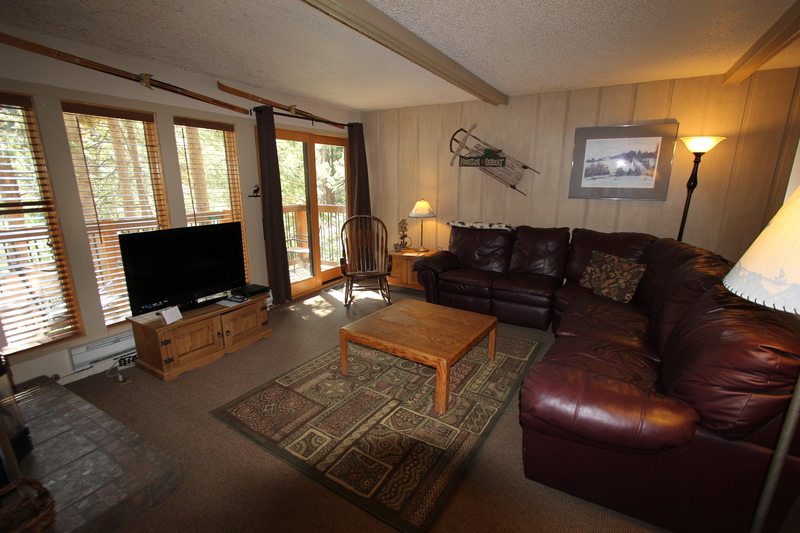 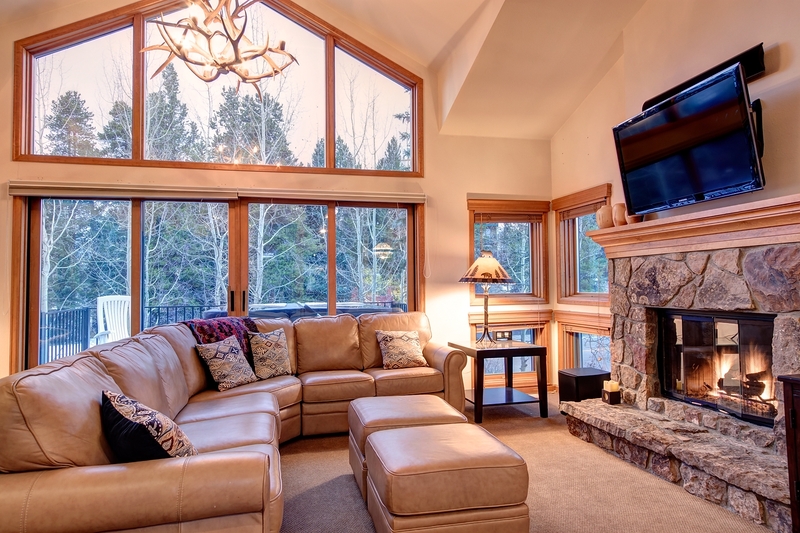 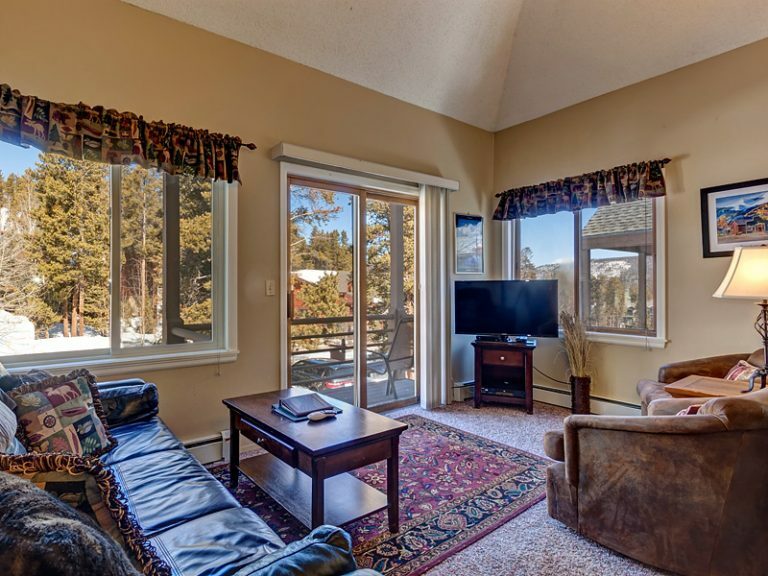 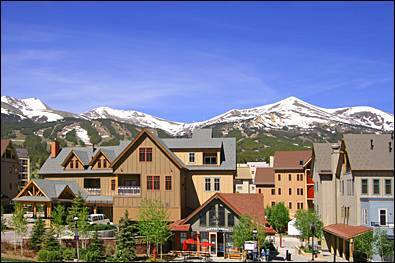 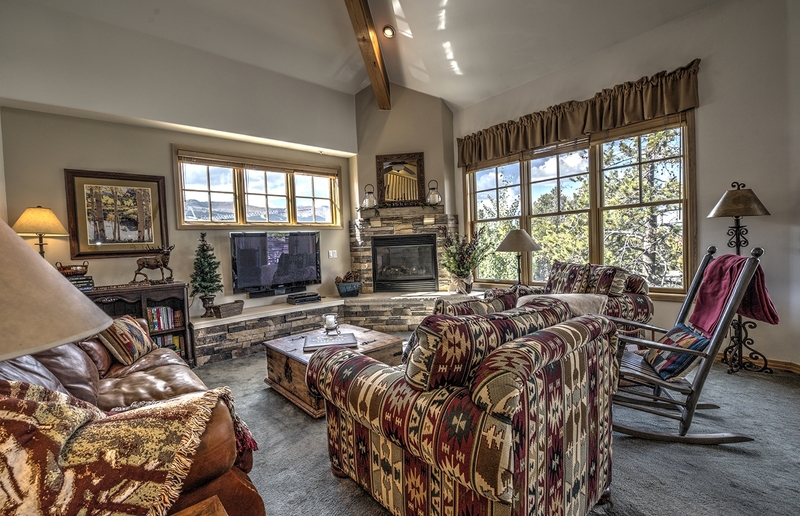 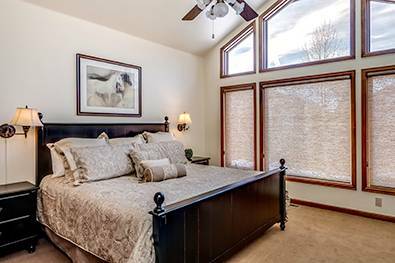 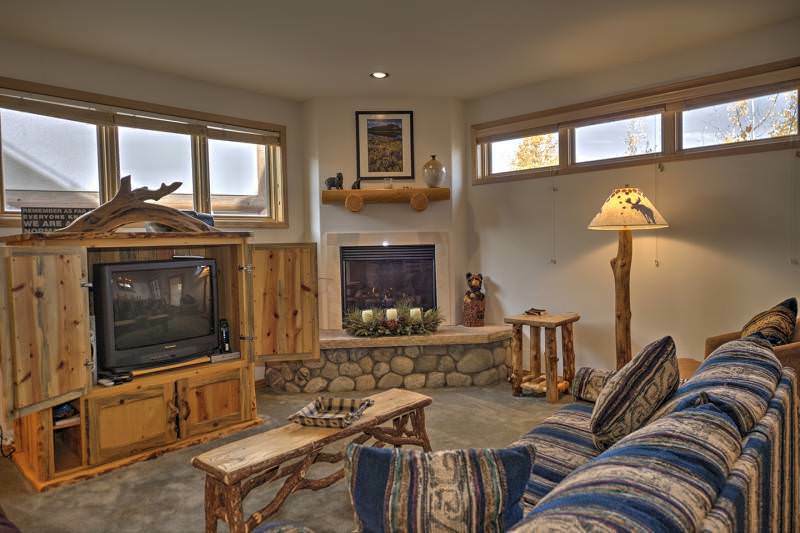 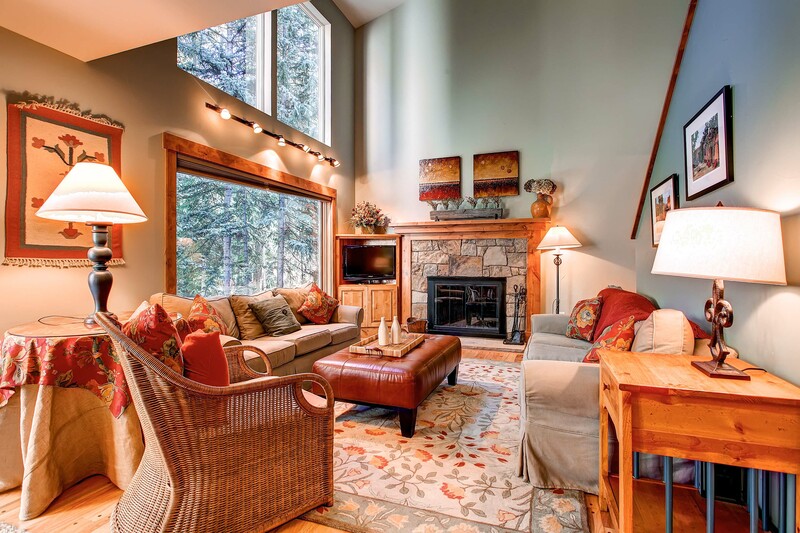 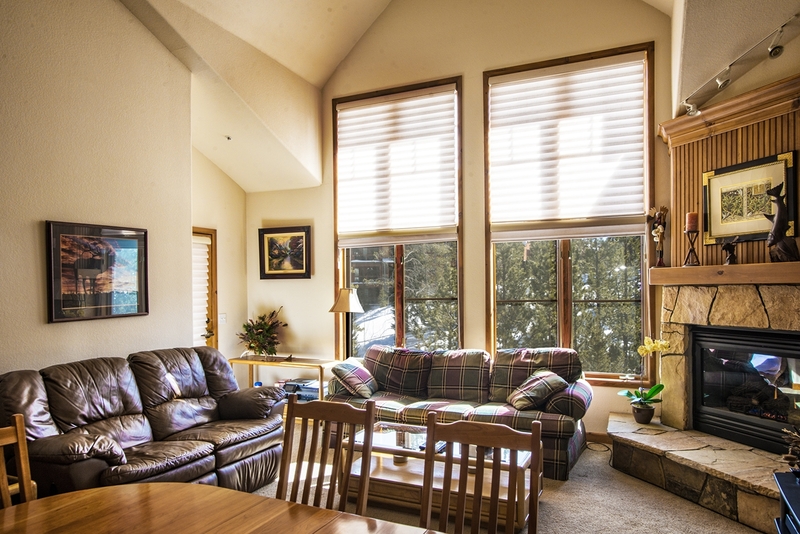 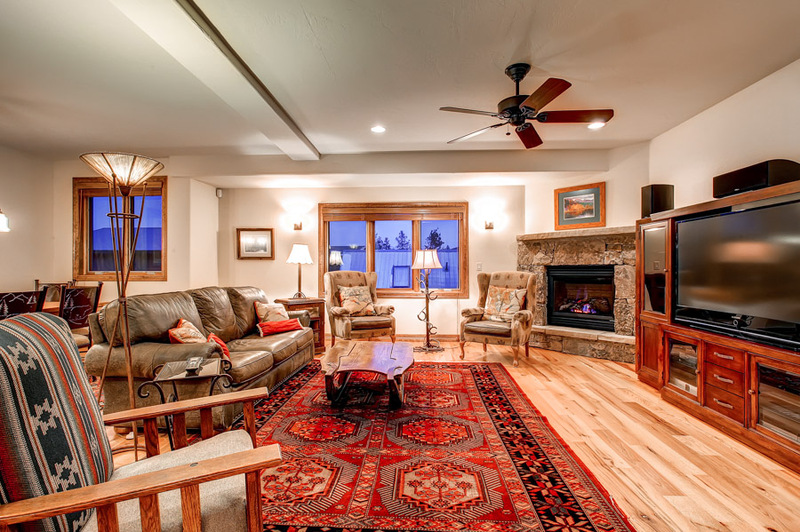 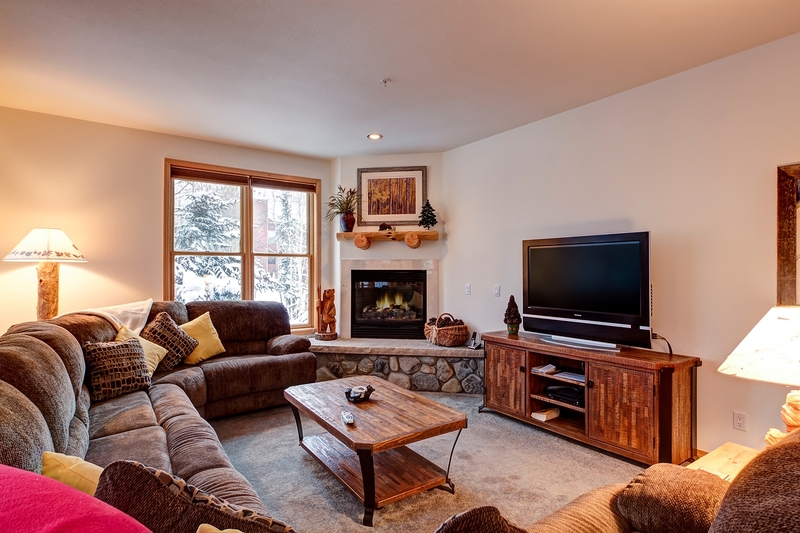 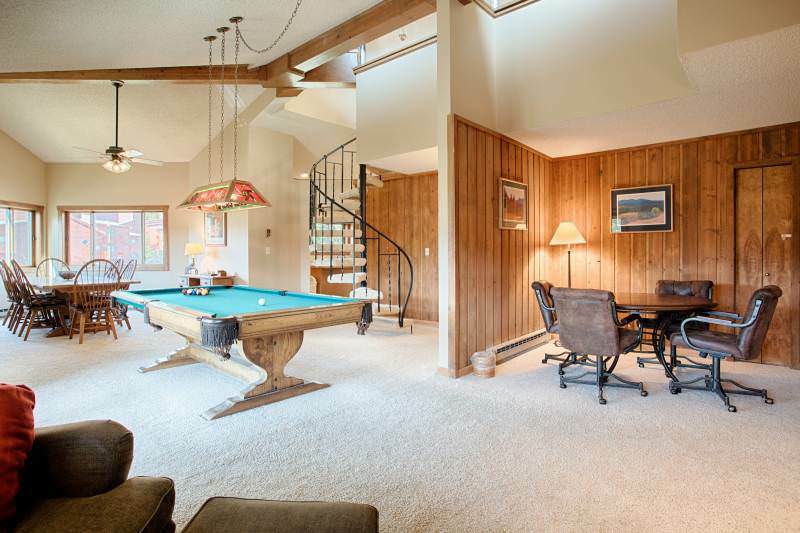 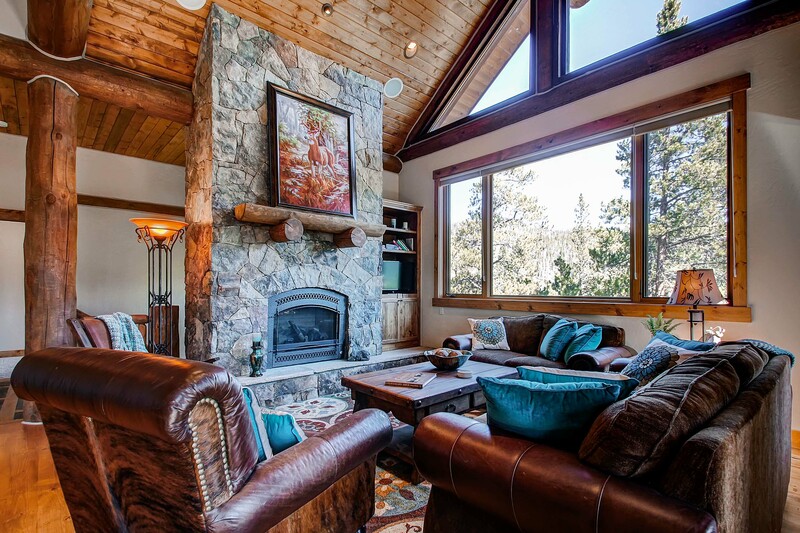 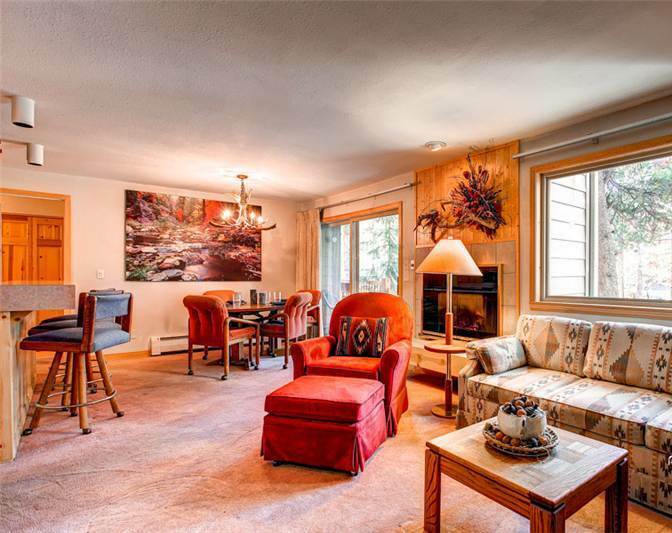 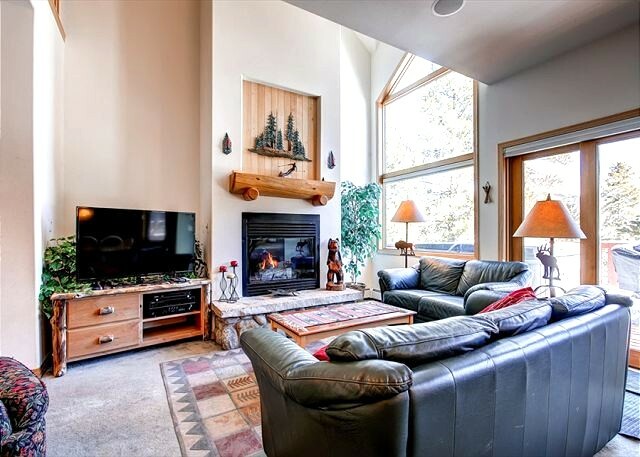 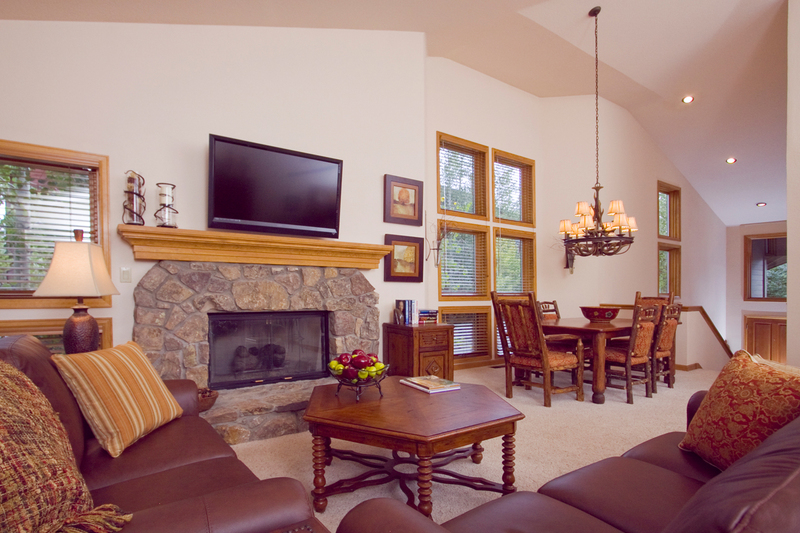 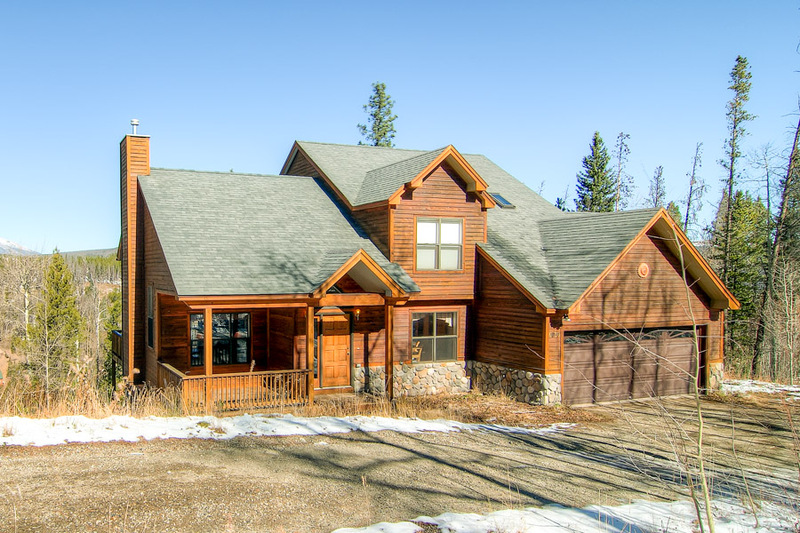 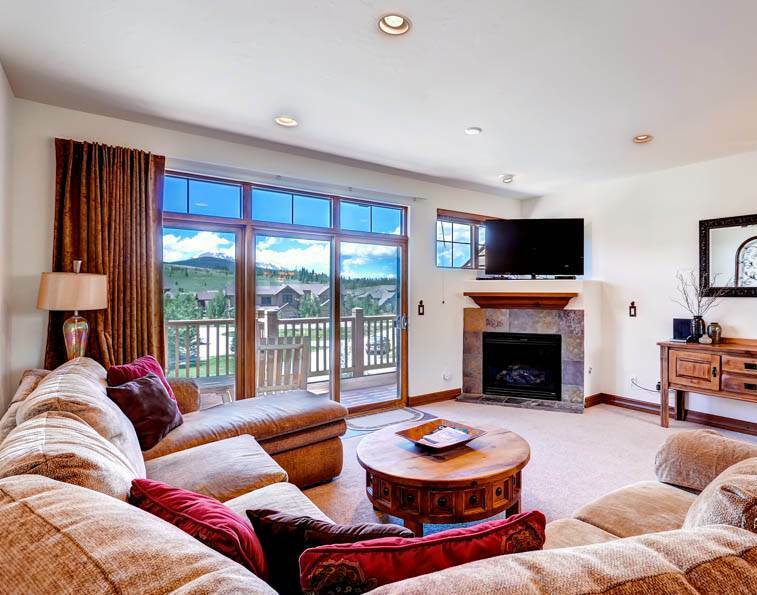 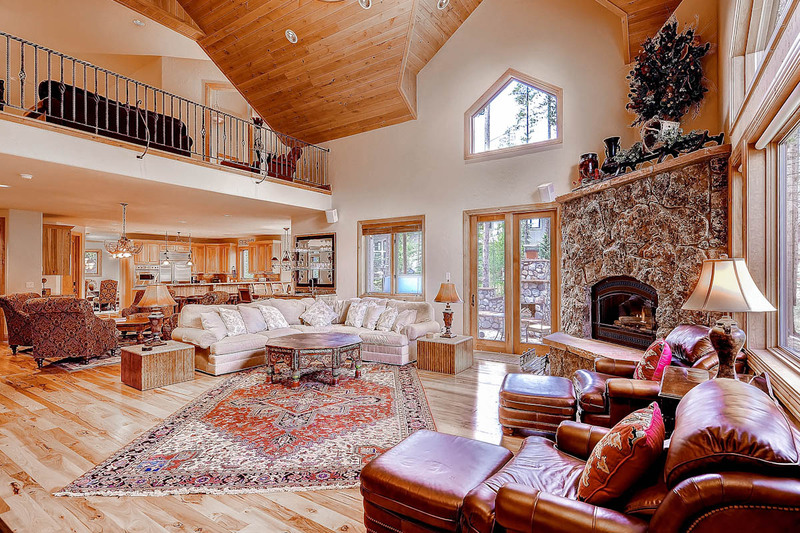 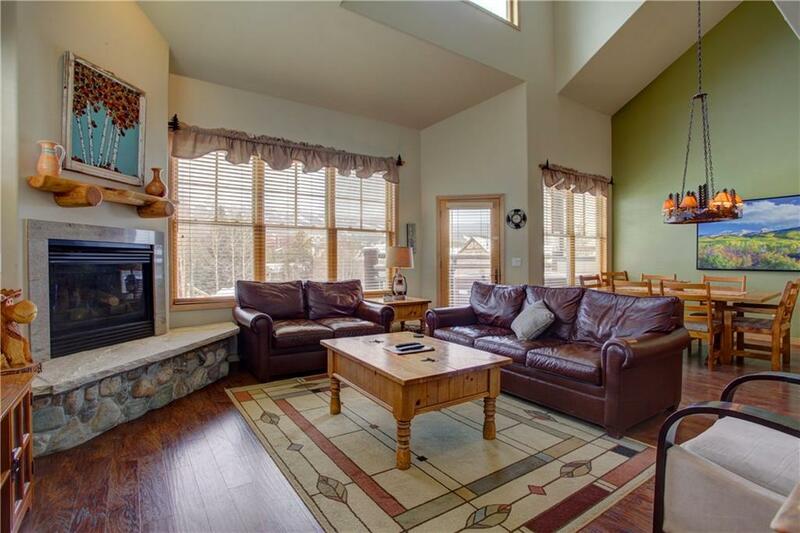 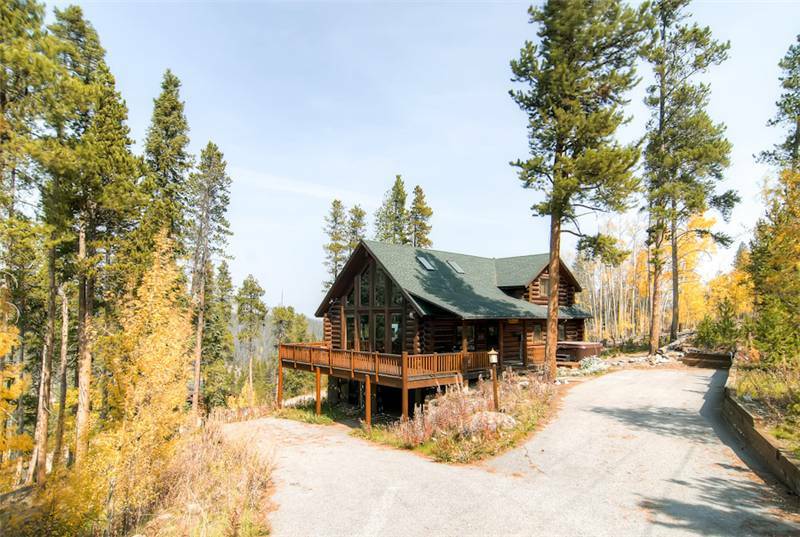 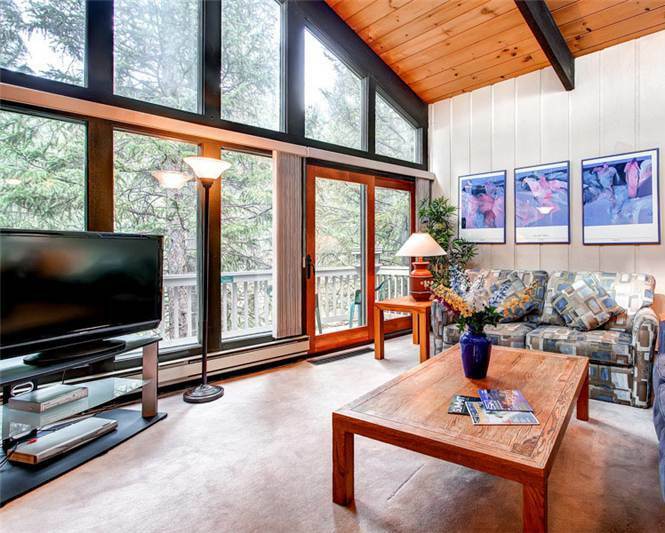 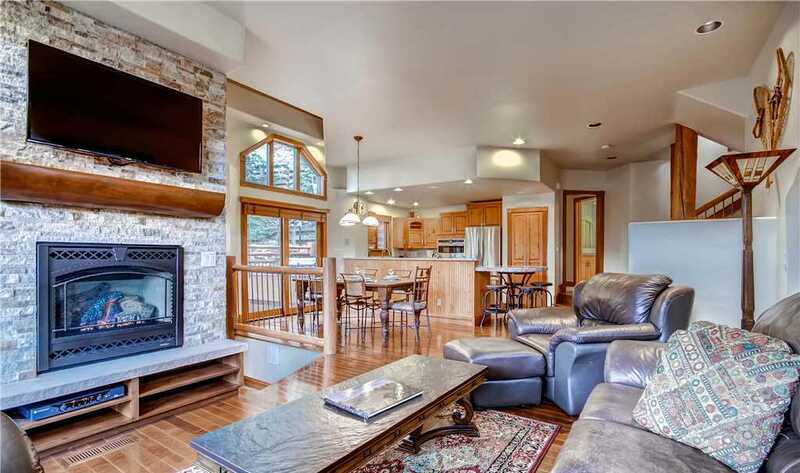 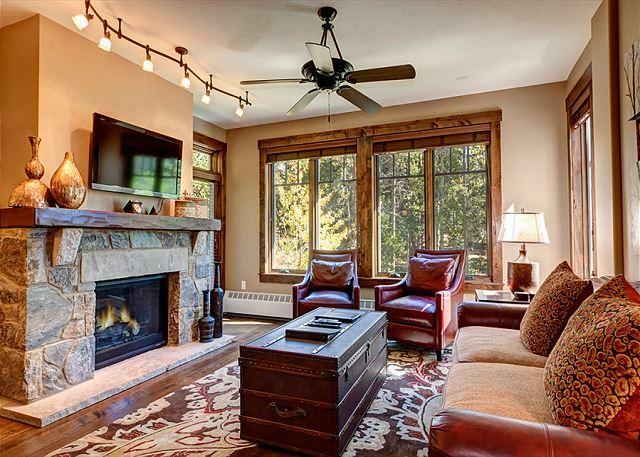 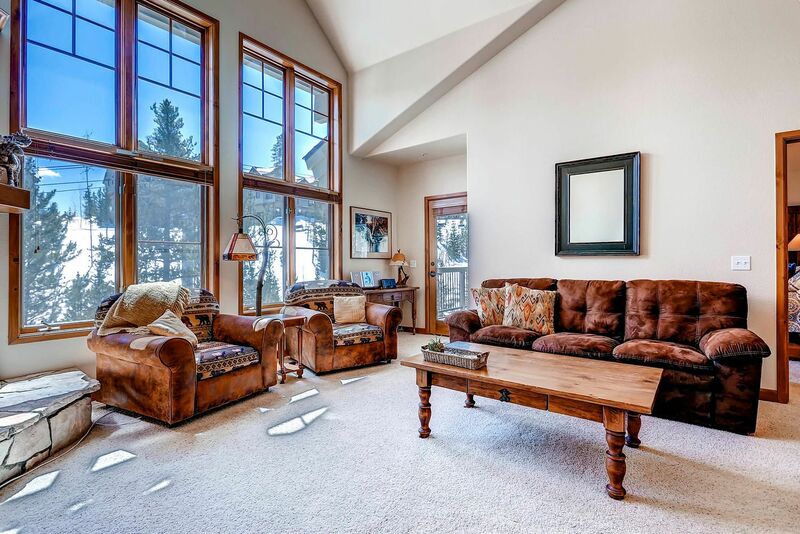 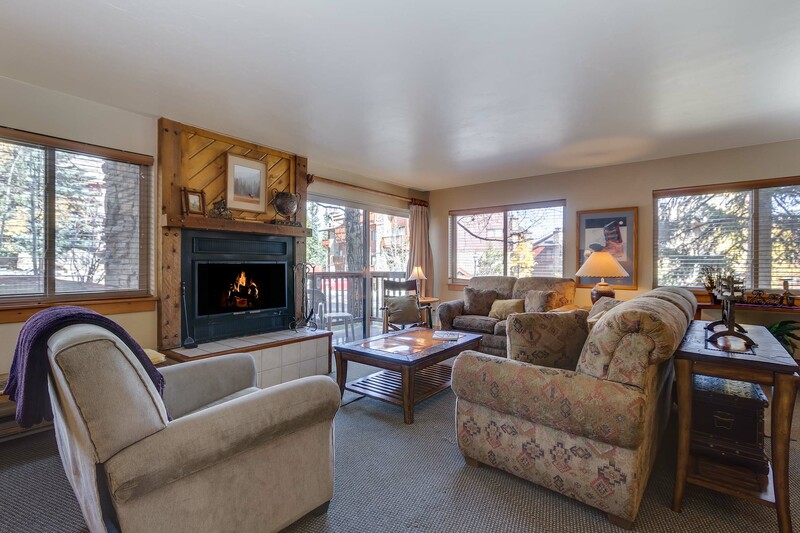 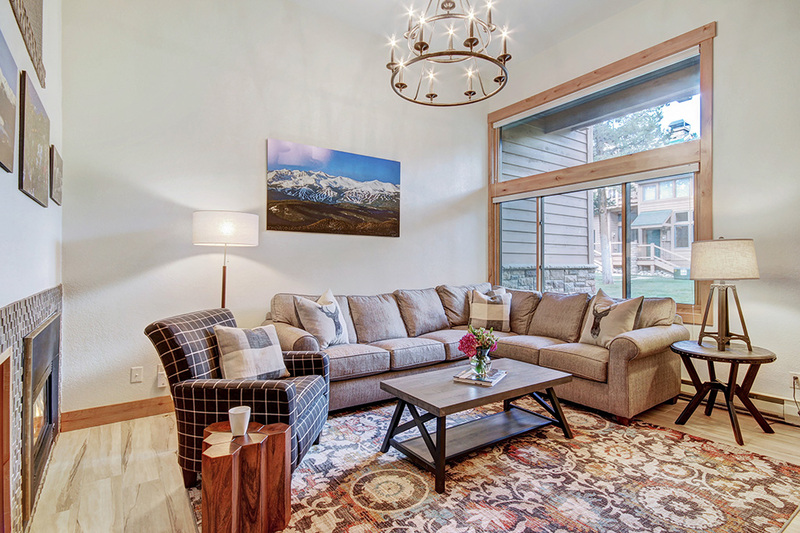 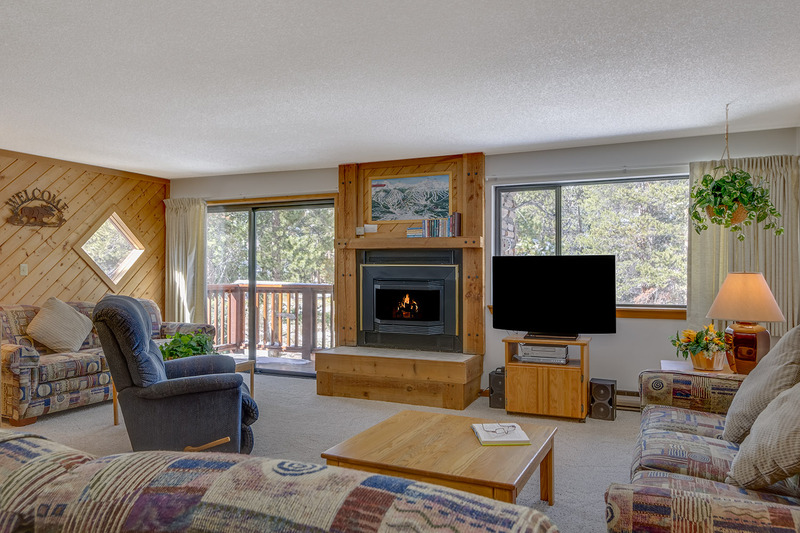 This property is in the ideal location to be enjoyed year-round – Breckenridge Mountain and Summit County have a lot to offer during all four seasons! 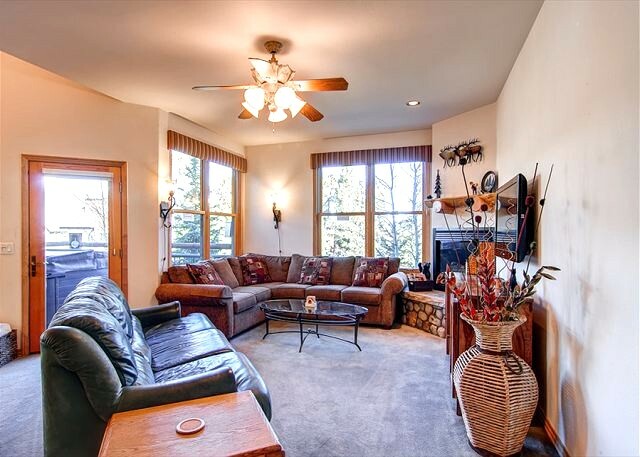 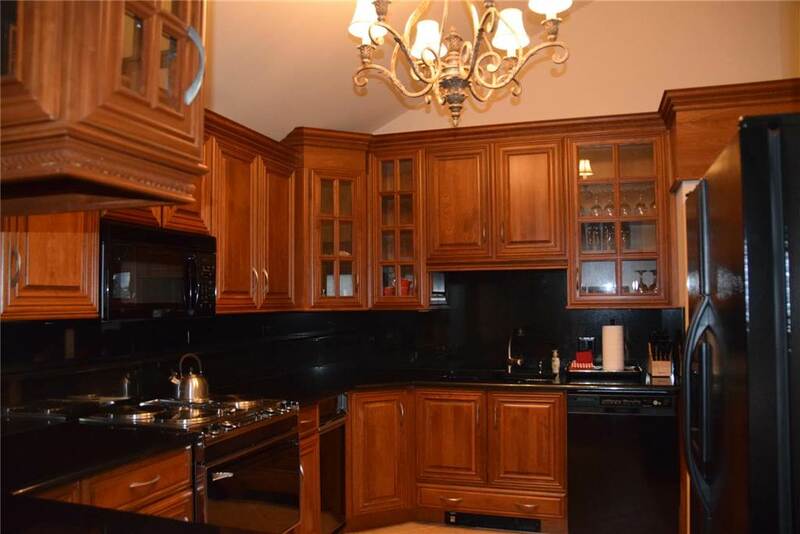 • 3 Bedrooms / 3 Baths (Full) / 1,728 s.f. 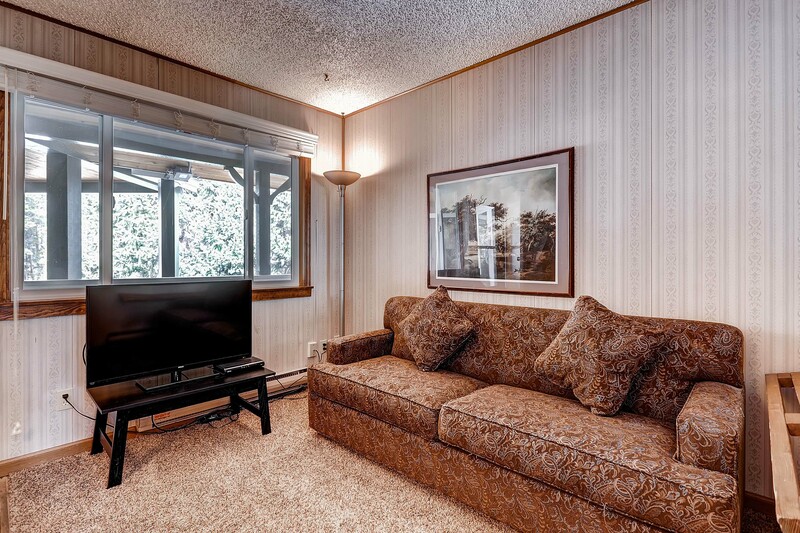 • Shuttle – 0.1 to shuttle on Village Rd.